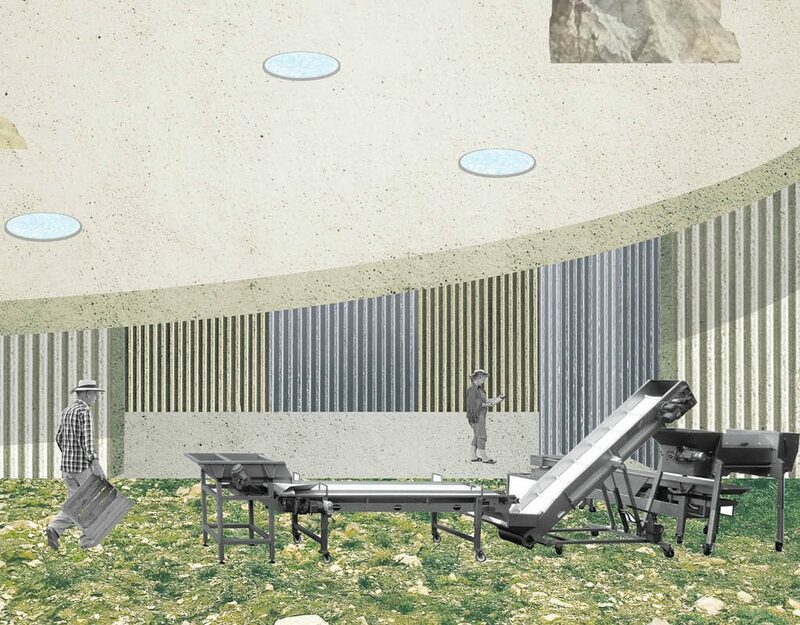 OFFICE has won the private competition for the construction of an olive oil mill on the Trebbio estate in Tuscany, IT. 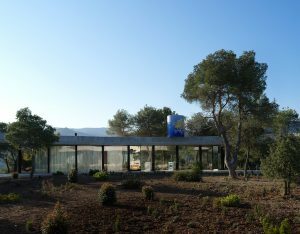 Responding to the aim to produce olive oil of excellent and organic quality, the project strives to provide a small-scale yet highly performing and state-of-art olive oil mill. 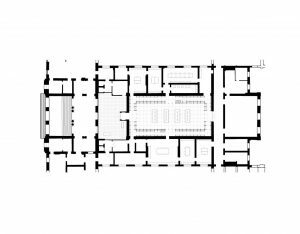 The site is a UNESCO heritage site, because of the ‘Villa del Trebbio’, the first of the Medici residences outside of Florence, and possibly the first renaissance villa in the world. In this context, a spartan industrial building stands modestly in the middle of the olive groves as a simple square, where all it spaces act perfectly to each step taken in the process to produce the best organic olive oil. 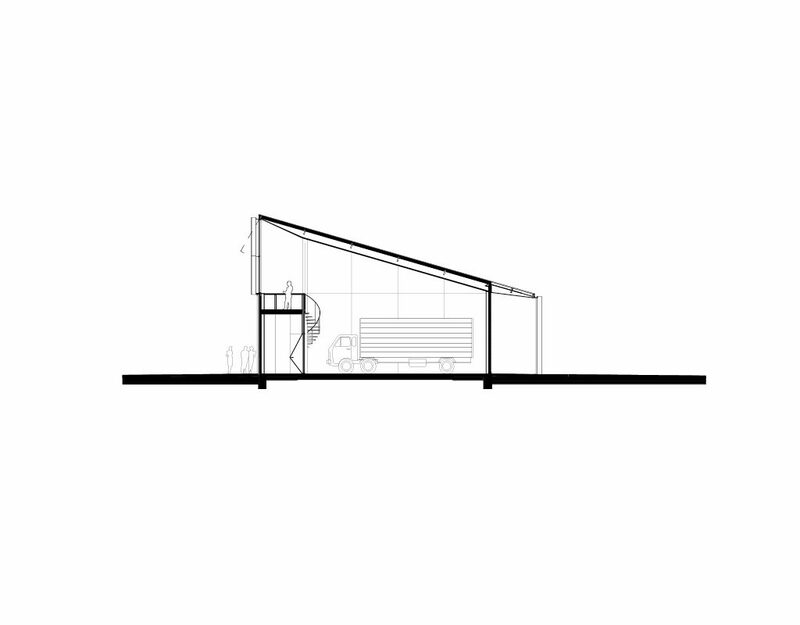 Machinery for production stand freely in the heigh ceiling space, a light weight mezzanine structure gives space to smaller office spaces and bottling rooms, while on top guest are invited for a tasting of the excellent olive oil produced. 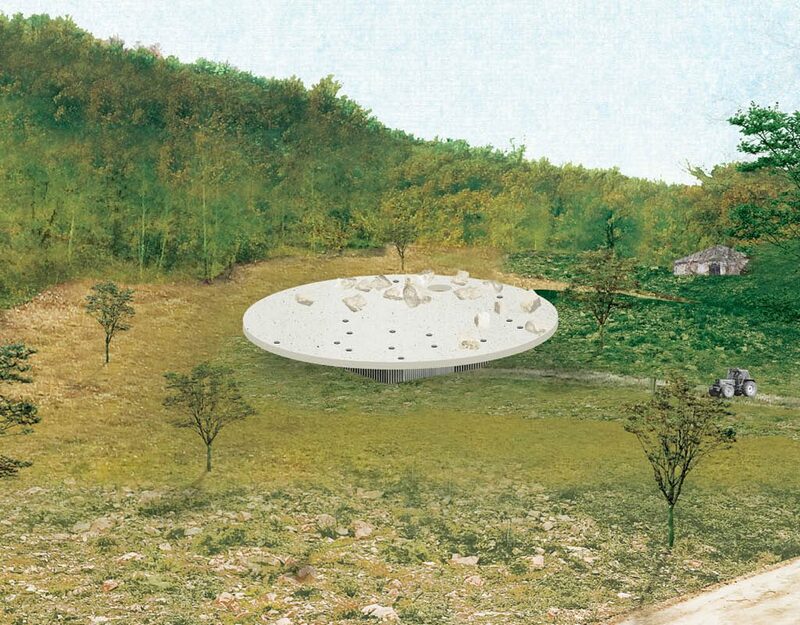 An inclined, circular roof, scattered with rocks extracted from the surrounding fields lays on the efficient square building. 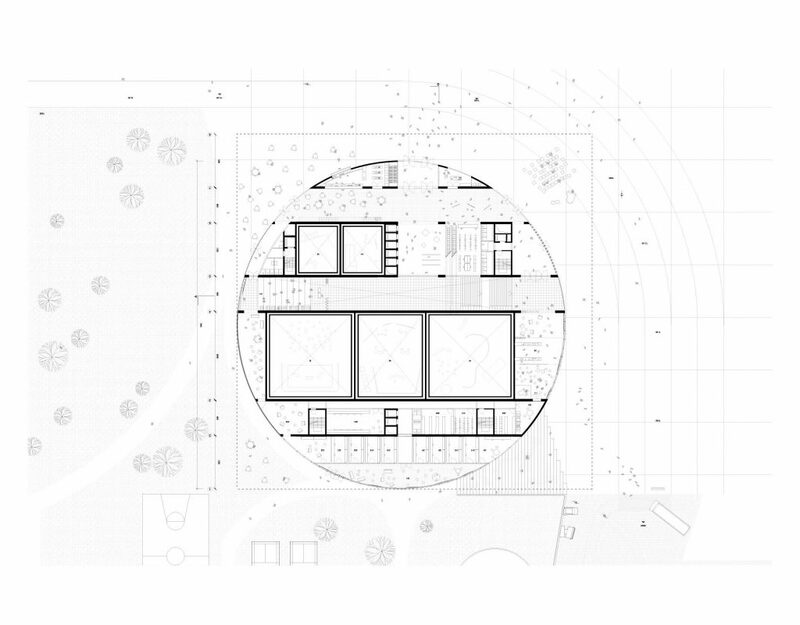 Floating parallel to the topography of the landscape, this circular form becomes the main facade of the building, and provides as a contemporary addition in a unique yet fragile surrounding of heritage nature and architecture. 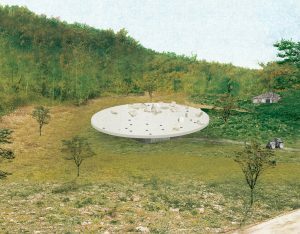 Eventually, the guests are invited on top of this circular roof, allowing them to enjoy the view of the heritage site while experiencing the taste of the oil created from the resources of the very land. 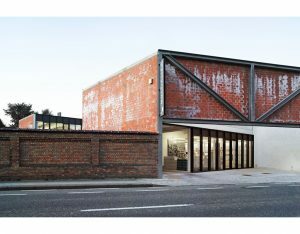 Being located on a seismic active zone, the Portland based contemporary art centre ‘Yale Union’ is faces the need to provide a so-called ‘seismic update’ to their current infrastructure, a complex of historic brick buildings built in the early 1900’s. 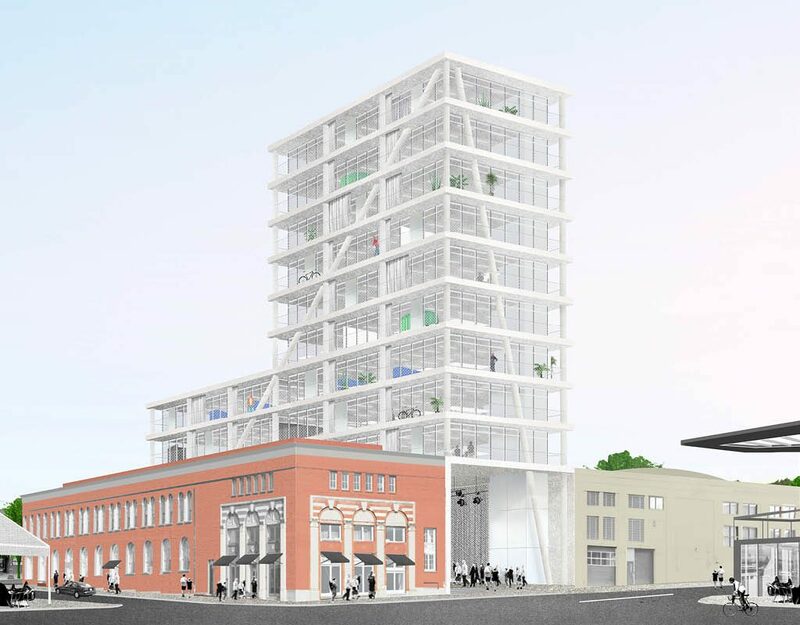 Instead of undergoing a major structural renovation and jeopardizing the spatial qualities of these existing buildings, the project takes a bold counter-act, proposing to demolish the building with least historical value and replacing it with a new tower. This new tower, containing a series of flexible rentable spaces as apartments, offices and artist studios, will provide both structural and financial support to the renovation of the existing complex. 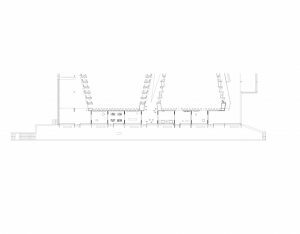 While this addition will give a new identity to Yale Union, their old brick gallery spaces are kept with the same quality, with minimum intervention of reinforcing the floor units with new concrete slabs. 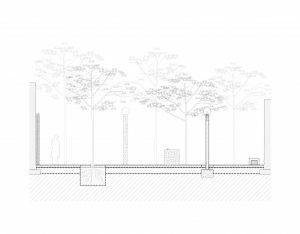 Under the tower, a large outdoor space opens towards the street anew, defining a new public interface for the complex: a room for Yale Union. 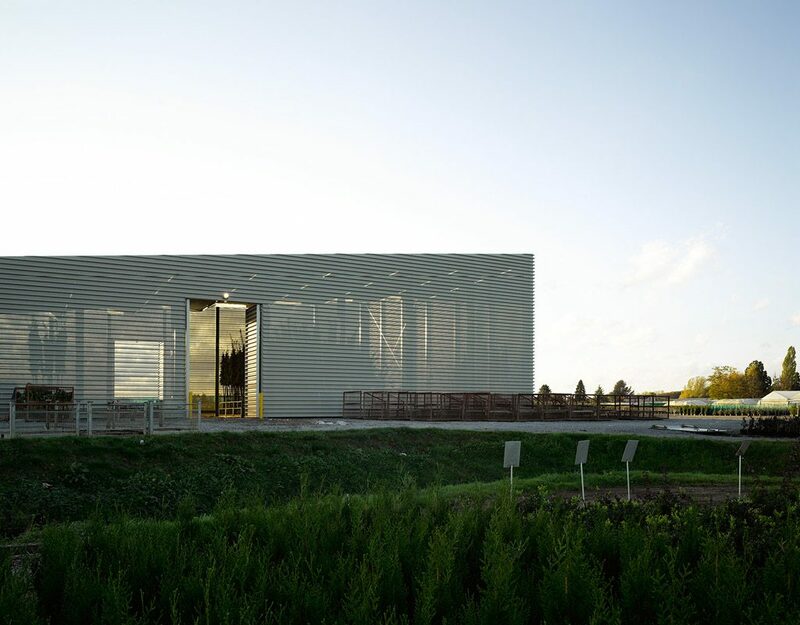 The Citroën showroom and workshop form an urban island which dominates the north of the ring road adjacent to the canal in Brussels (BE). 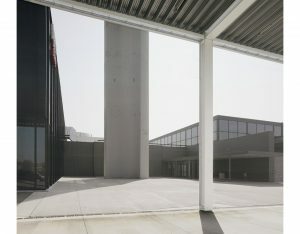 The building’s presence has been silent over the last few decades, a latent symbol of a declining automobile industry. 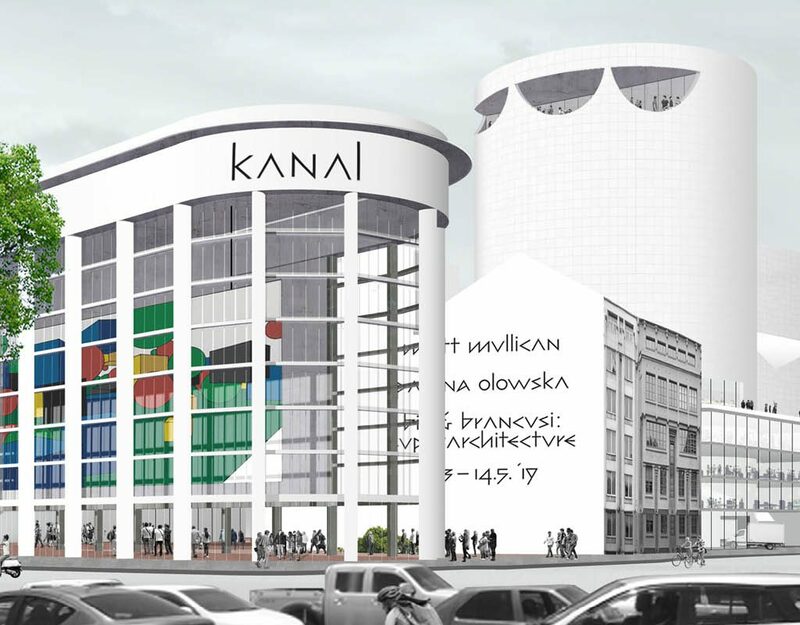 Today, the project “Kanal Pompidou” intends to resuscitate its importance and give it back its status of “city in the city”, as it was intended by André Citroën in the 30s. 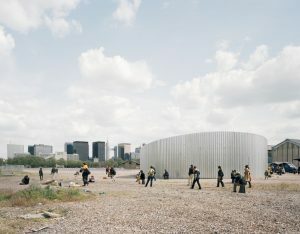 Located north of the city’s pentagon and along the canal in the midst of urban retransformation, the project should act as a catalyst for an intensification of Brussels’ cultural life and an urban center for a changing neighborhood. 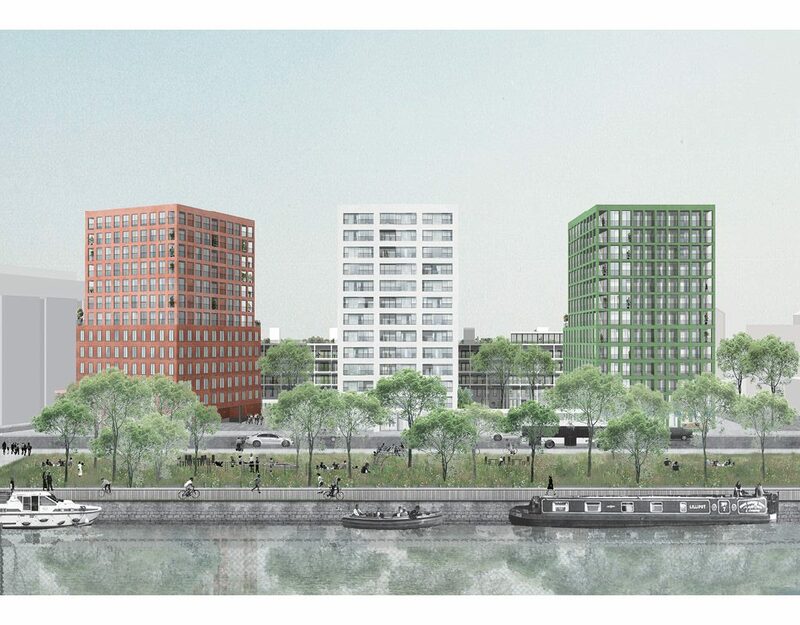 This ambition requires a specific urban and constructive approach. 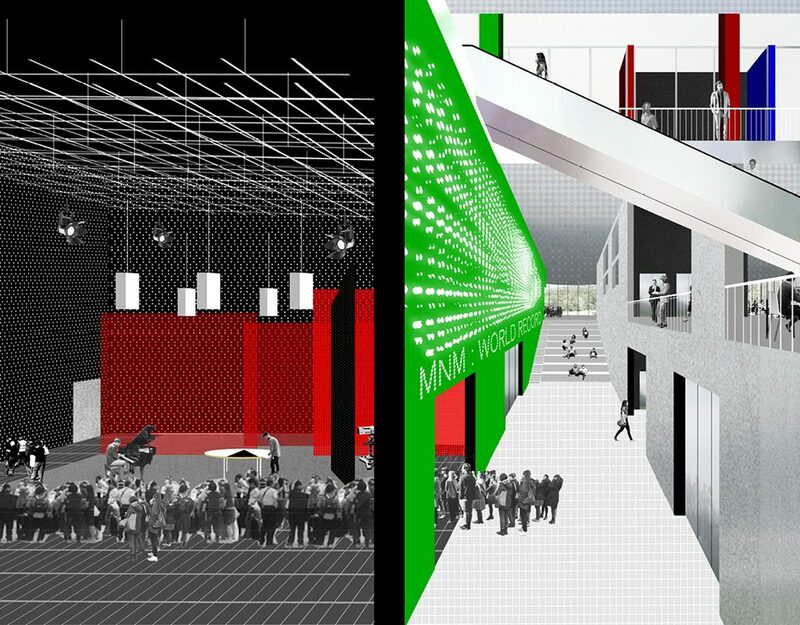 How can a museum become an open public space while duly fulfilling its main function as a space dedicated to art? 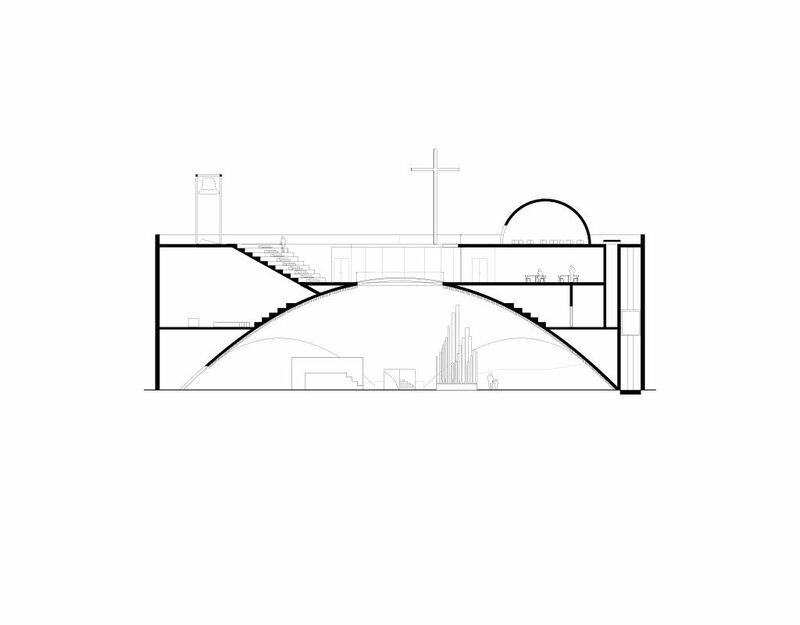 How to integrate the magnificent and very precarious existing structure, intensify its splendor and its intrinsic qualities, without compromising its architecture? 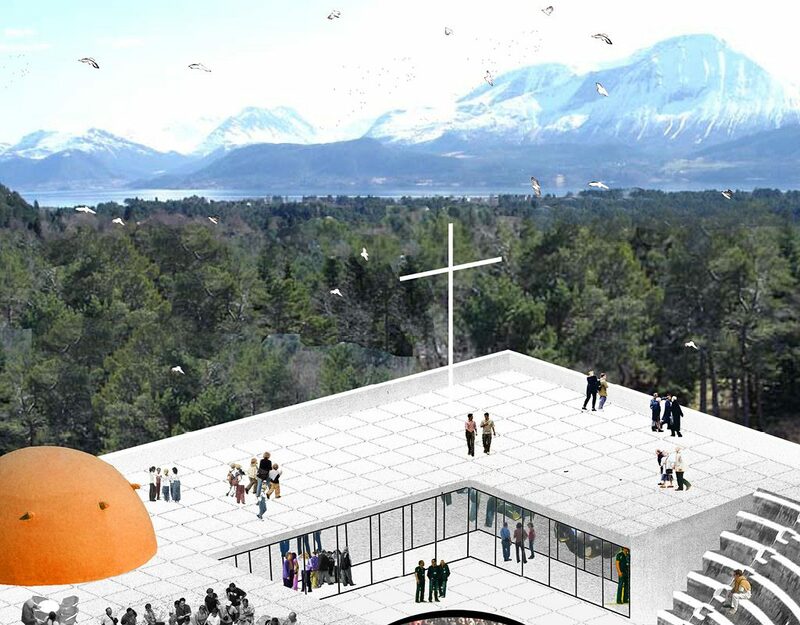 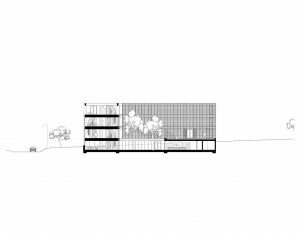 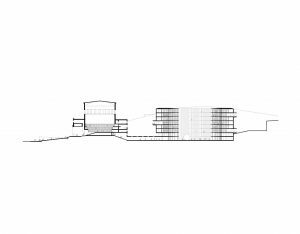 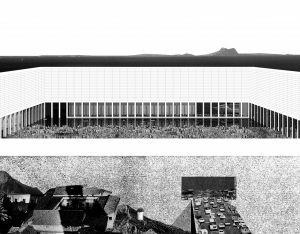 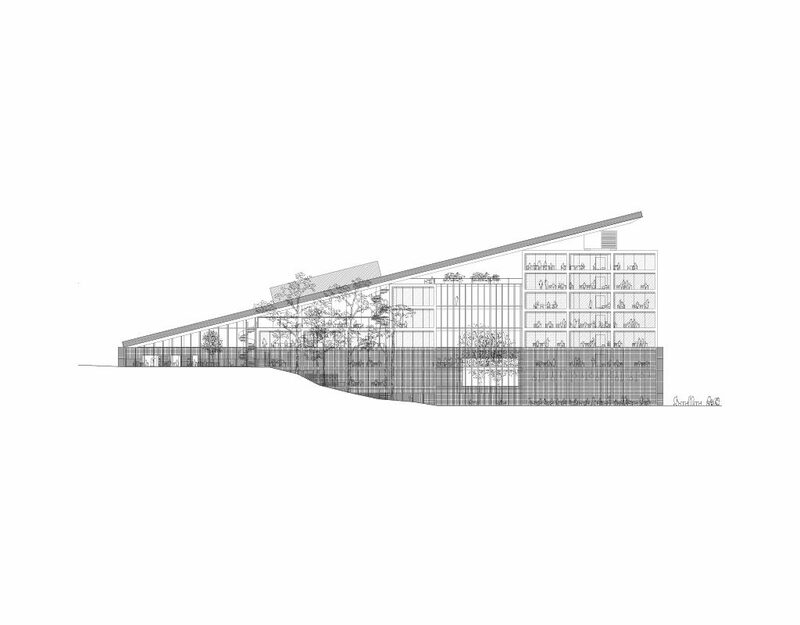 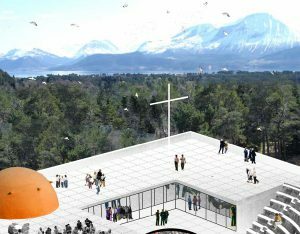 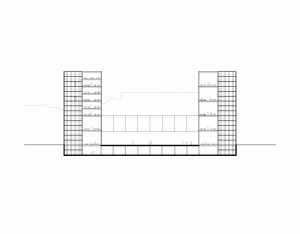 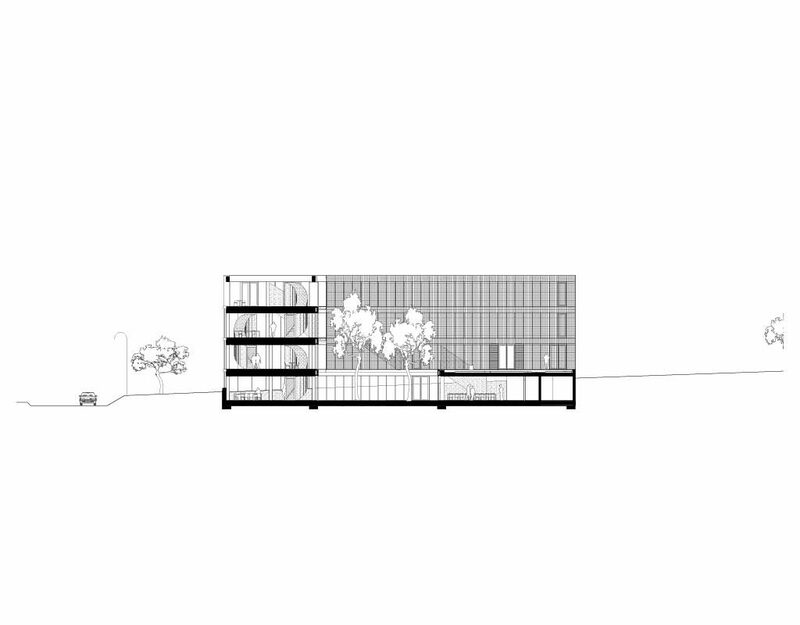 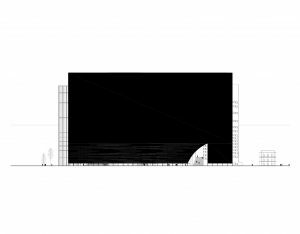 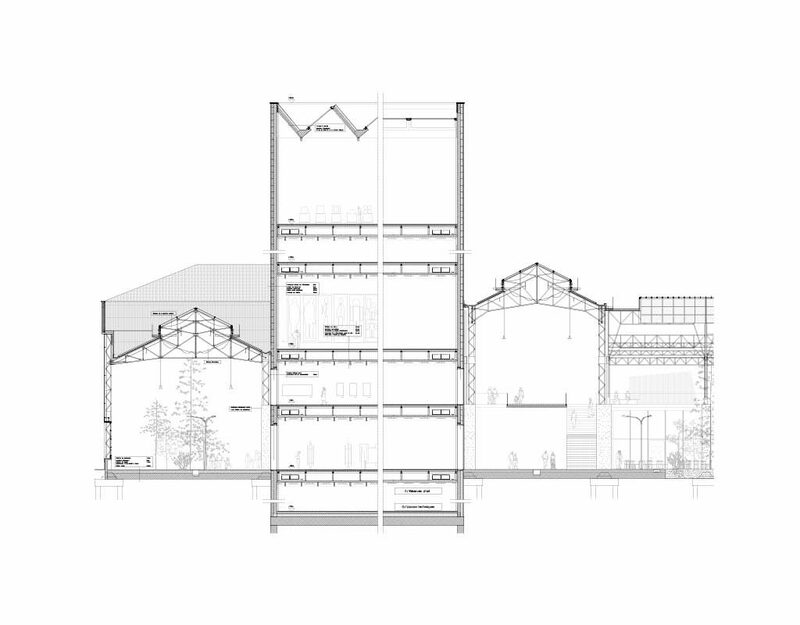 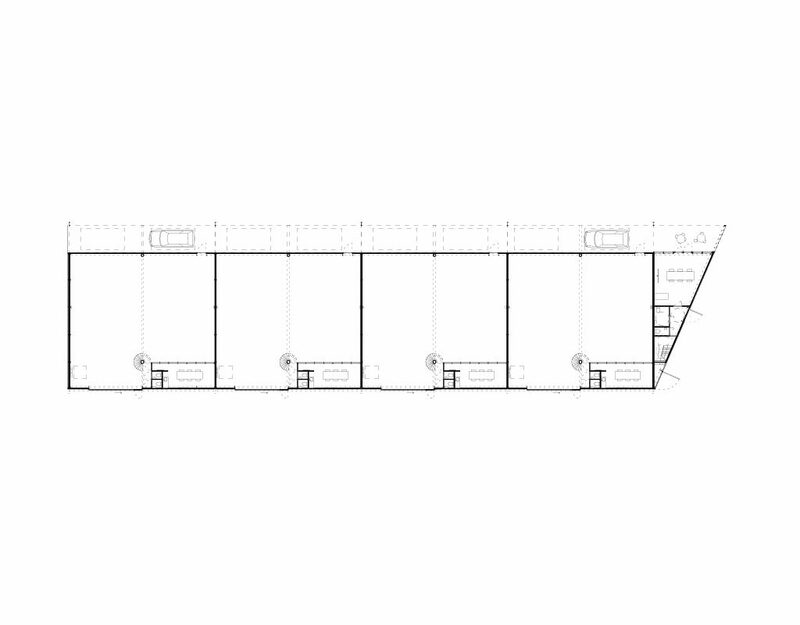 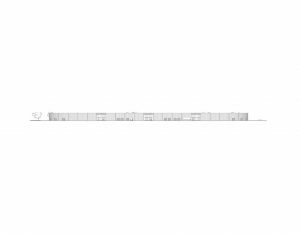 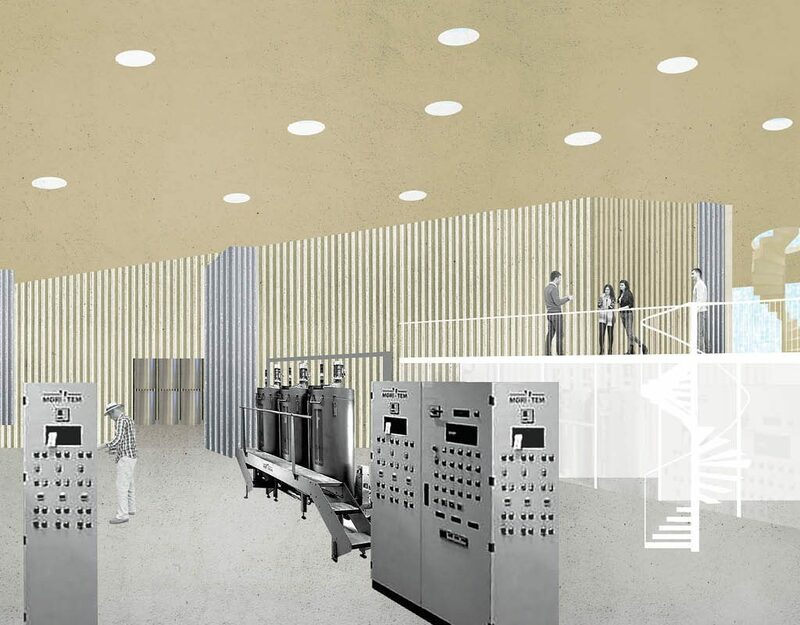 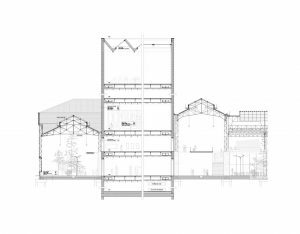 OFFICE’s proposal, in collaboration with Christ & Gantenbein, answers this by inserting two new pertinent volumes — one a stacked series of galleries, the other a silo as a container of the archives and library — in the existing complex. 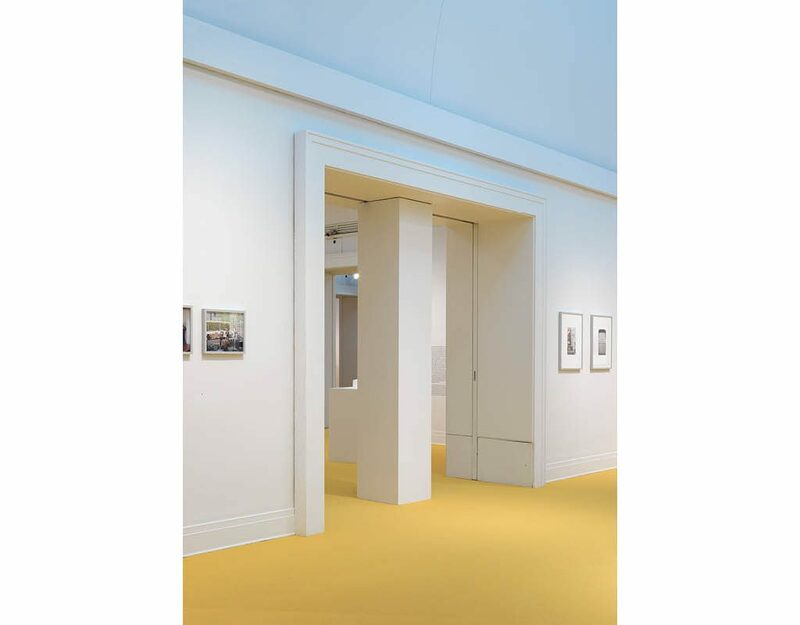 The halls – the former workshop –are freed from technical and practical burdens that would have been imposed upon them if they had accommodated the museum. 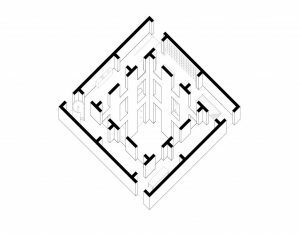 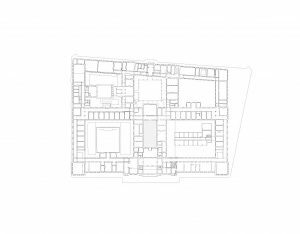 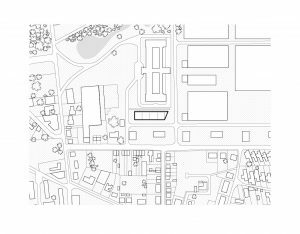 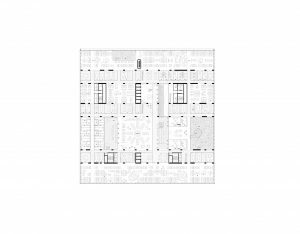 This radical intervention transforms the complex to an urban ensemble composed of different volumes with clear typological characteristics, and the surrounding halls as their common matrix. The halls are stripped of the additional constructions which have been added during the lifetime of the building, and returned to their original, ultra-light state. 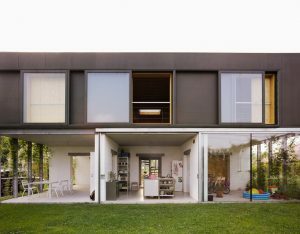 A minimal upgrade of its envelope creates a tempered outside climate. 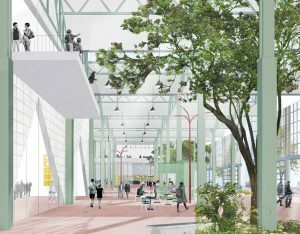 The addition of various trees and urban furniture makes for a public space that holds the middle between a market hall and a greenhouse. 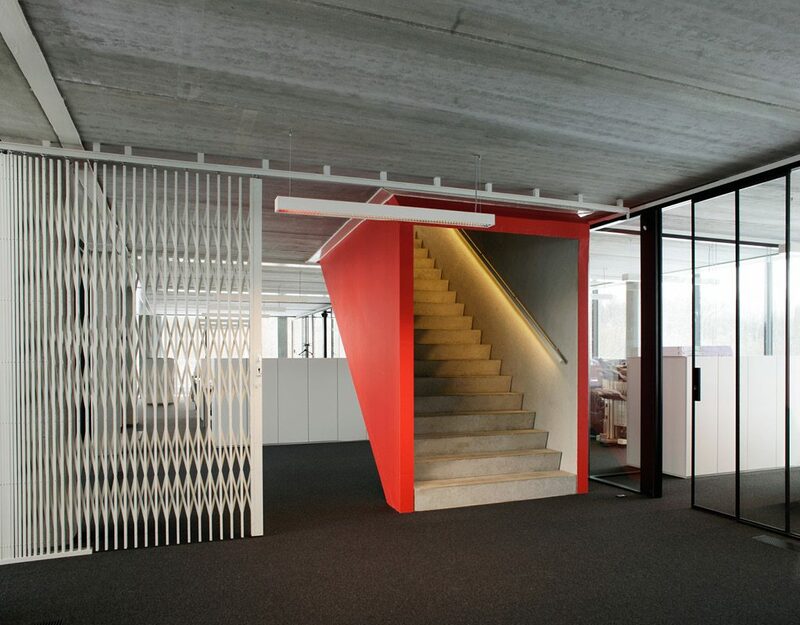 A mezzanine level provides an overview, organizes access to the various functions, and allows for smaller, boxed functions to be installed under its surface. 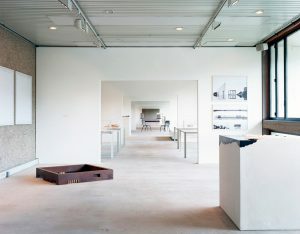 Competition, 2nd place. 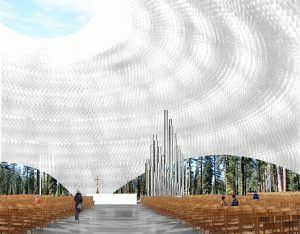 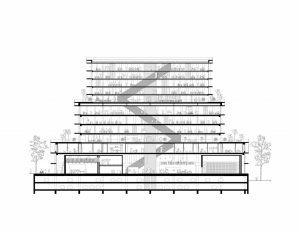 In collaboration with Christ & Gantenbein, Richard Venlet, Jan De Moffarts Architecten, Bureau Bas Smets, Bollinger + Grohmann Ingenieure, Arup, muller van severen, Kritis & Kritis, eld. 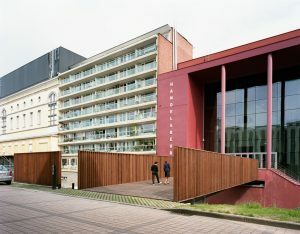 This building, situated at the very entrance of the new Mediapark in Brussels, is to house various entities related to media and broadcasting. 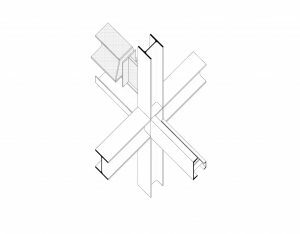 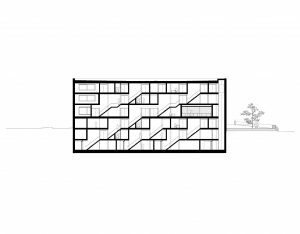 Instead of one large building which accommodates all of these entities, Maison Media Huis proposes to stack three buildings, each of which are planned pragmatically in relation to the program it holds, on top of each other. 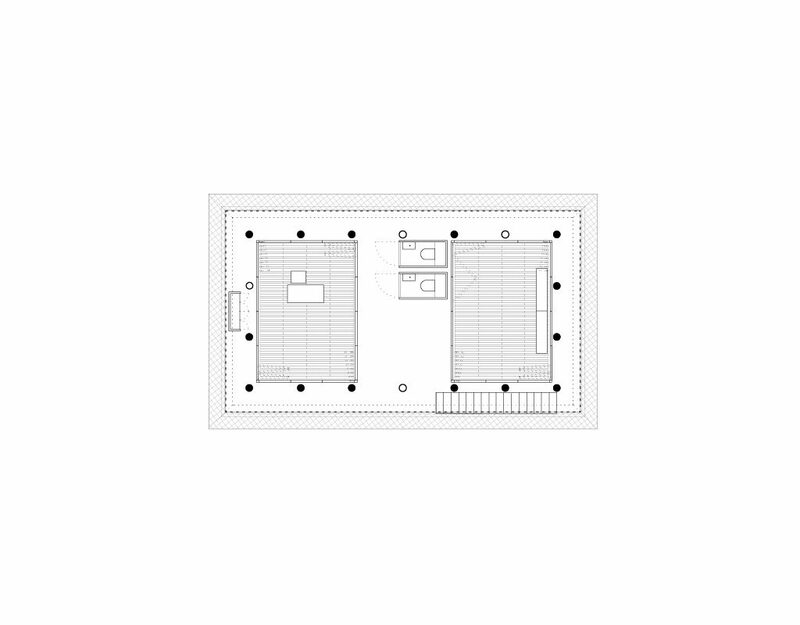 While a large box supports broadcast production on the bottom, the scale of the building decreases on the top, providing media offices and rentable work spaces respectively. 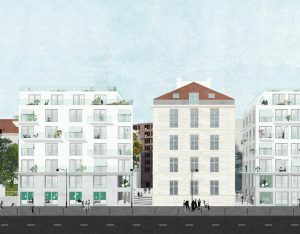 From afar, this pyramid formation of the assembly of these buildings makes a specific figure that becomes immediately recognizable, while the roof-top of each building becomes a new ground-floor for the next, providing greenery, panoramic view, a pleasant workspace for production along with a clear address point for each building. 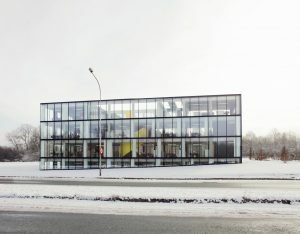 Its slender volume allows maximum energy in light into the interior environment, and techniques are fed through the logic of columns provided on the perimeter of the buildings. 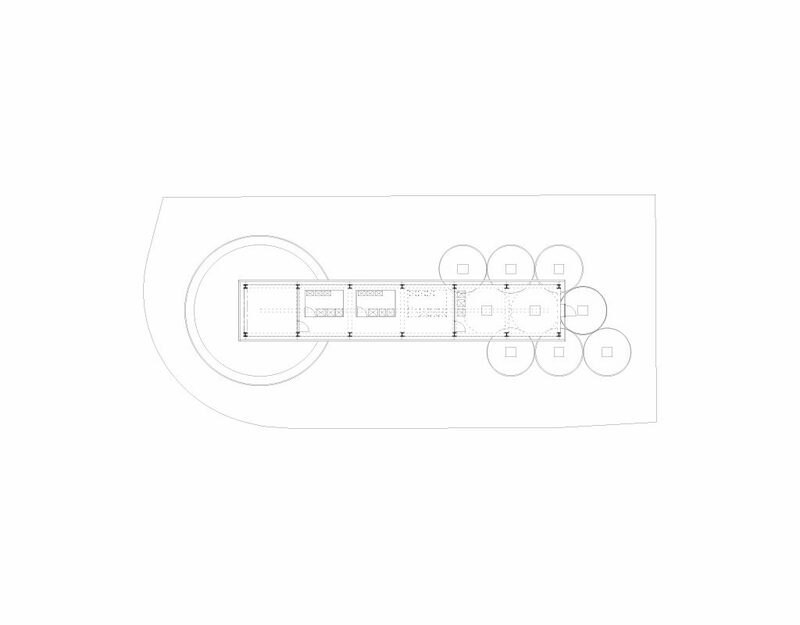 And as such, the ensemble leaves its space to maximum flexibility in a plug&play modus, leaving the necessary space to react to the ever-changing future of media in contemporary times. 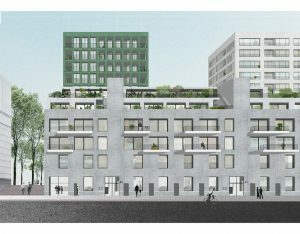 The new Tim Van Laere Gallery in Antwerp (BE) will occupy a central position on the New South district, a project by developer Triple Living. 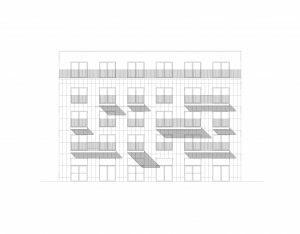 As a concatenation of rooms, the building ‘shows’ its structure in its silhouette. 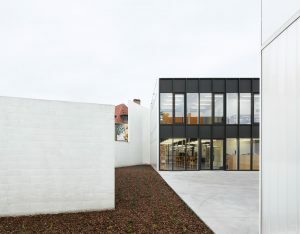 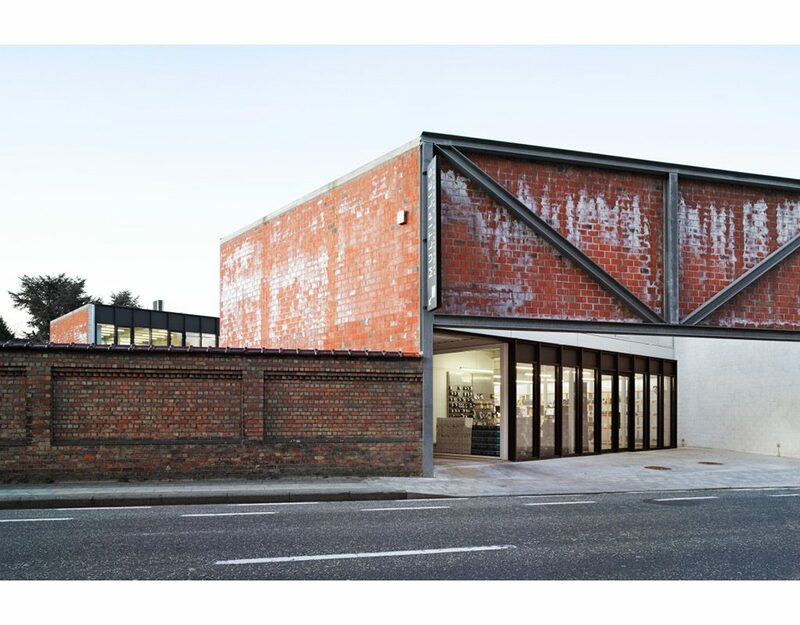 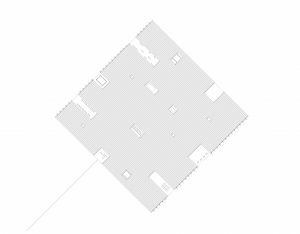 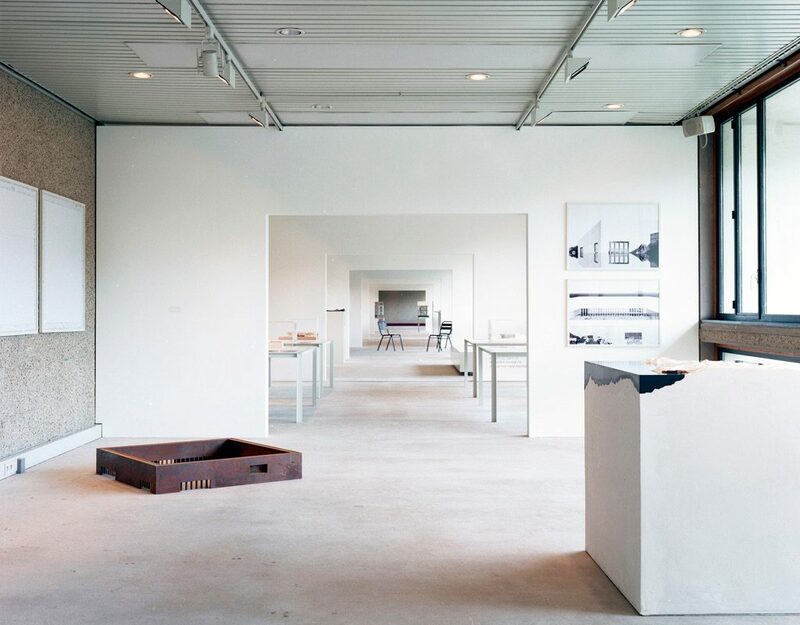 A storage space, offices, a white cube, a chapel and a patio follow each other, as pure types of buildings where art can be experienced in different ways. 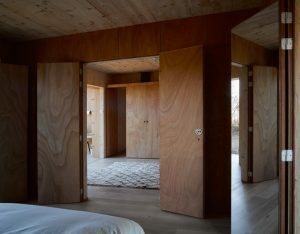 The rooms are constructed as simple in-situ concrete boxes, isolated on the inside and lit by roof light. 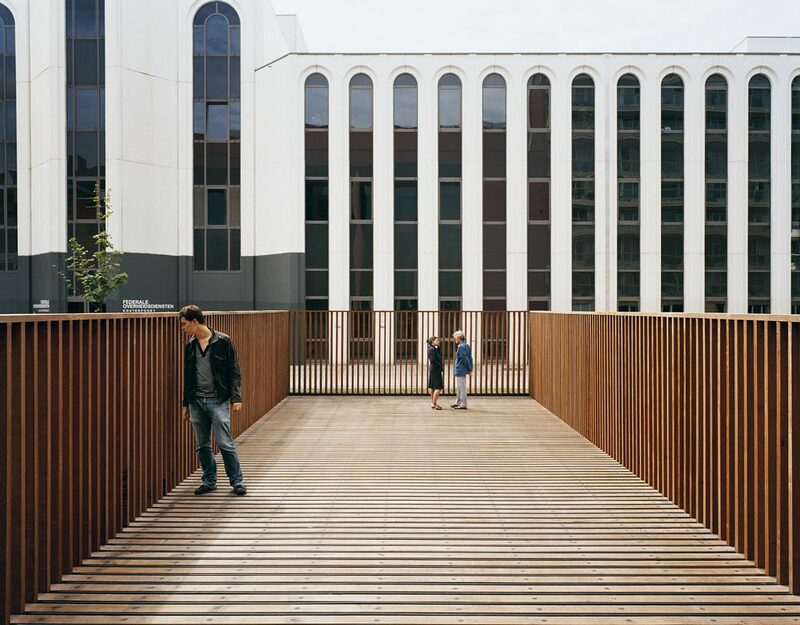 As an explicitly urban building, it is ambiguous and direct, with its gates directly on the street. The building makes a statement for both its immediate surroundings and inside; art is a central focal point and is immediately visible and accessible to everyone. 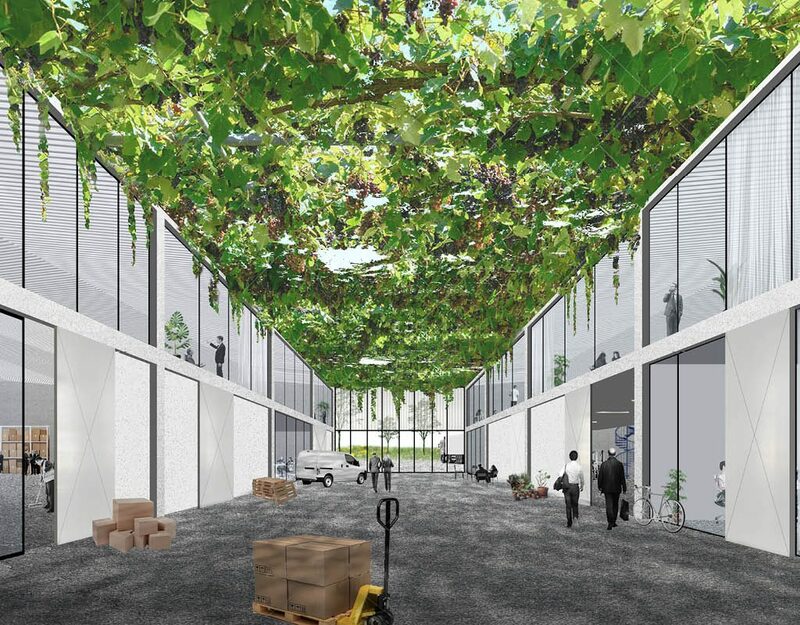 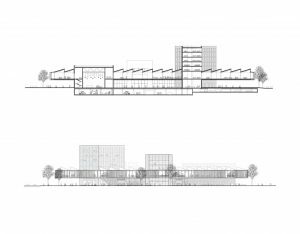 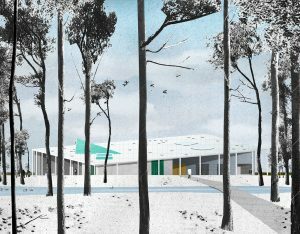 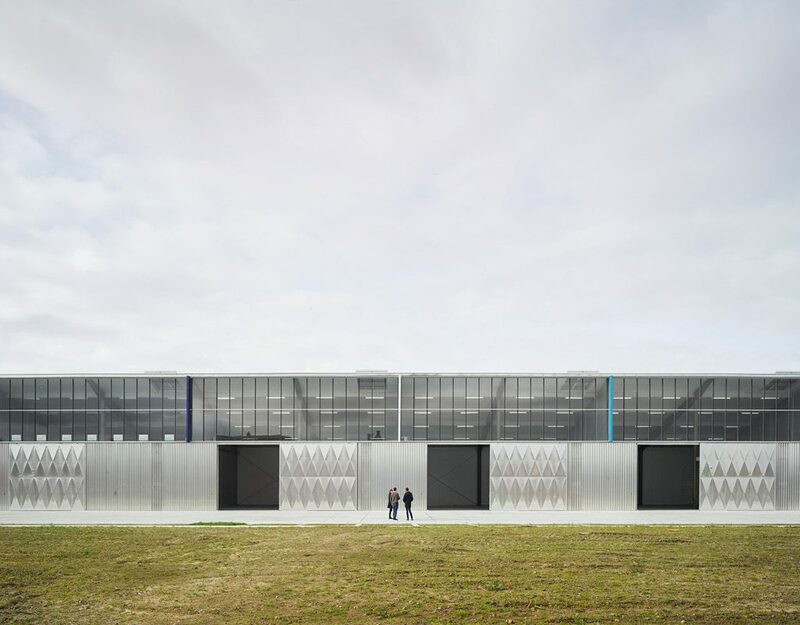 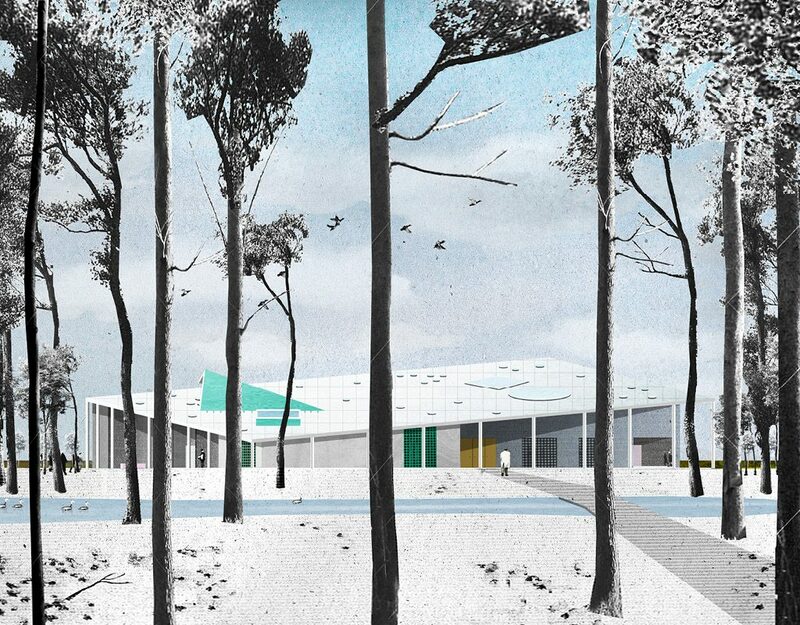 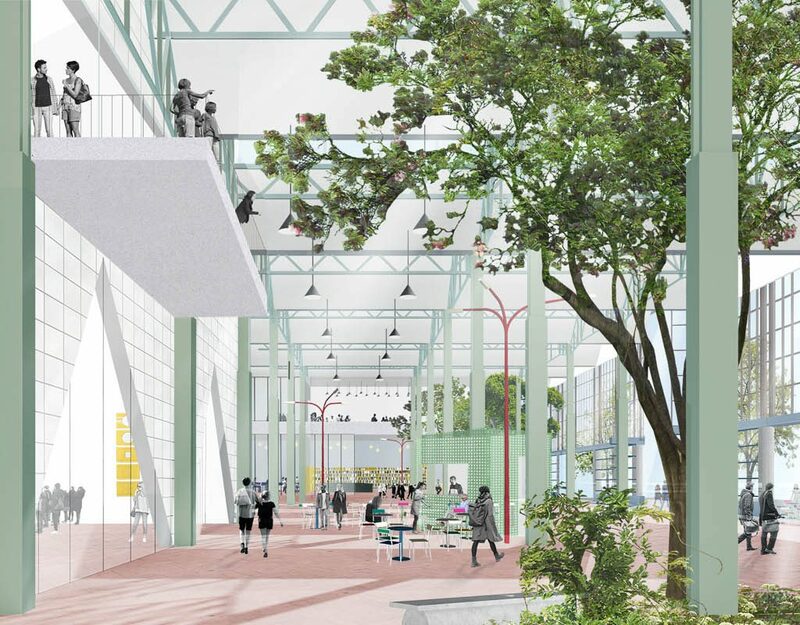 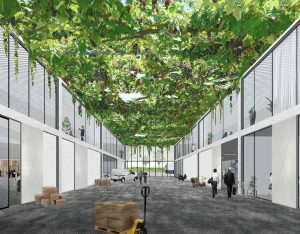 Les Halles Généreuses is the winning proposal for a durable and large-scale industrial complex in Blanquefort near Bordeaux (FR), organised by FAB (La Fabrique de Bordeaux Métropole). 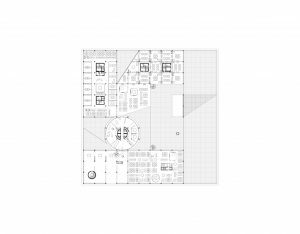 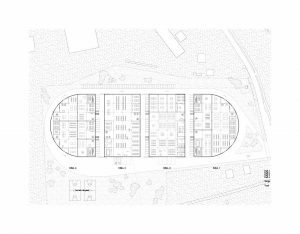 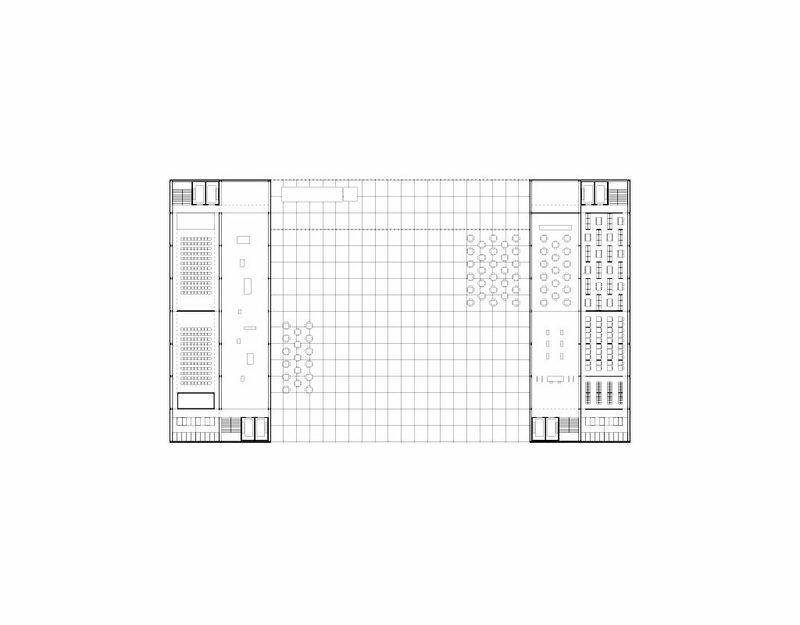 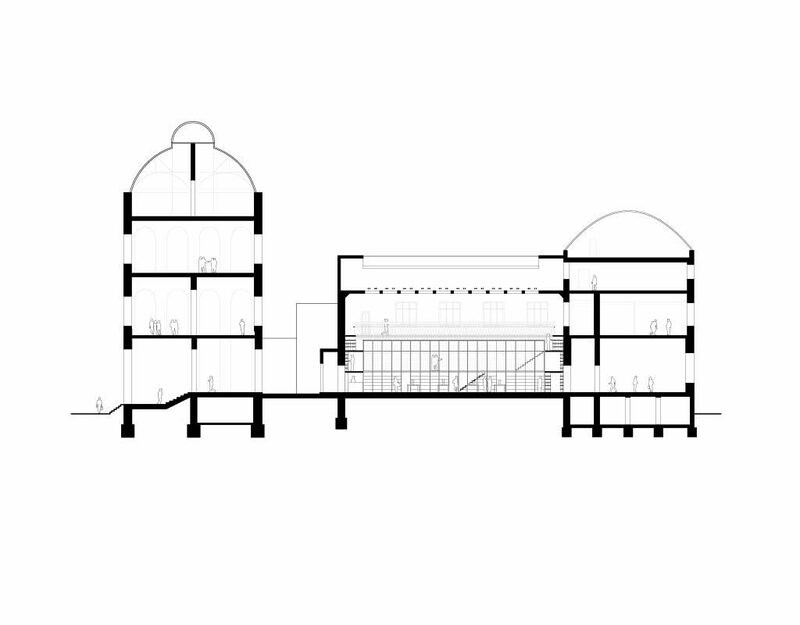 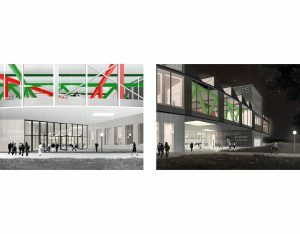 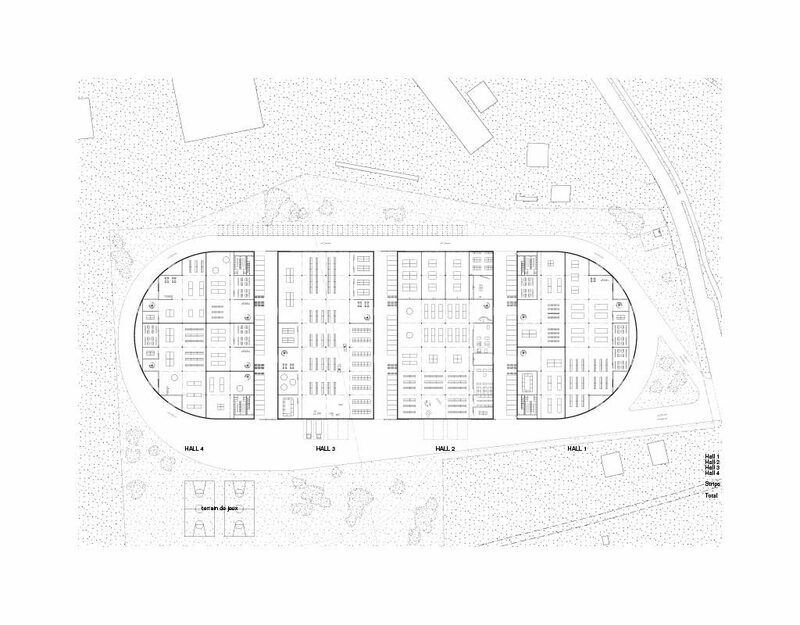 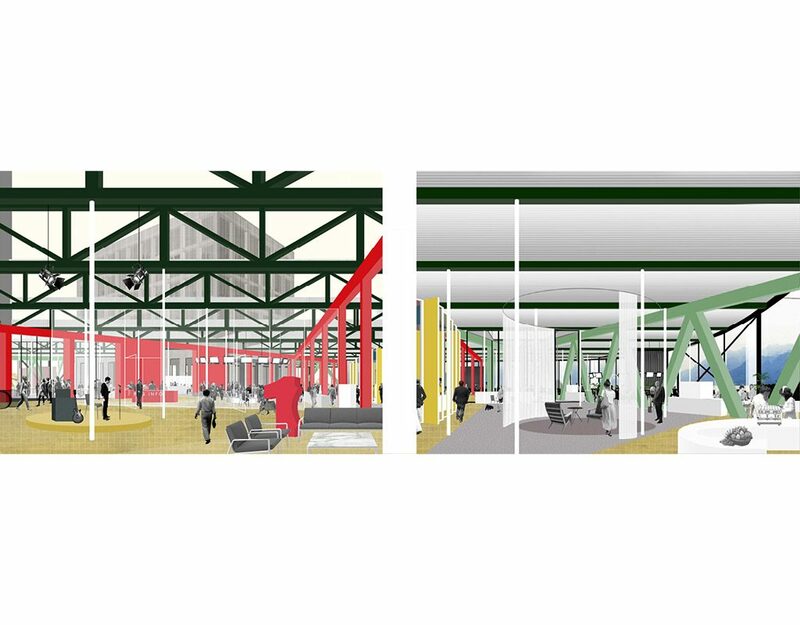 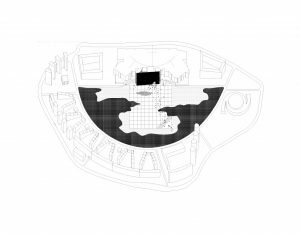 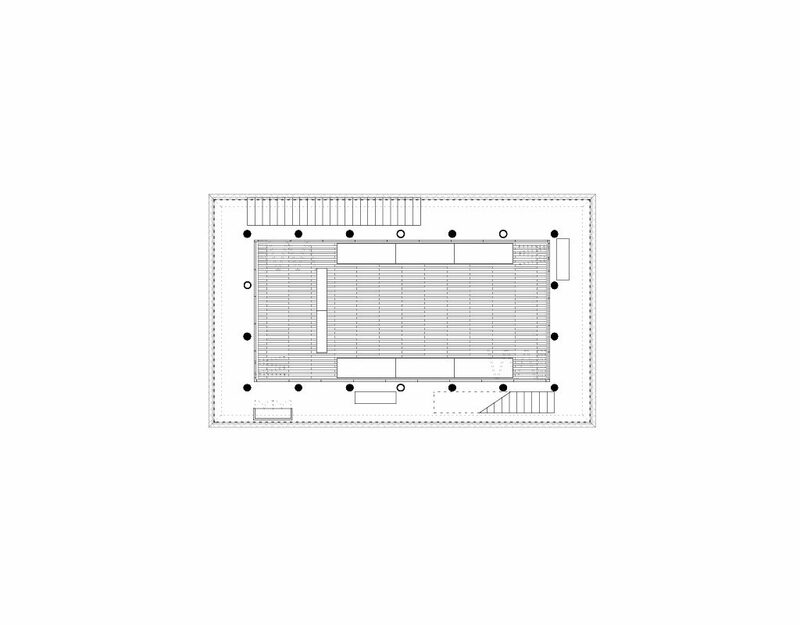 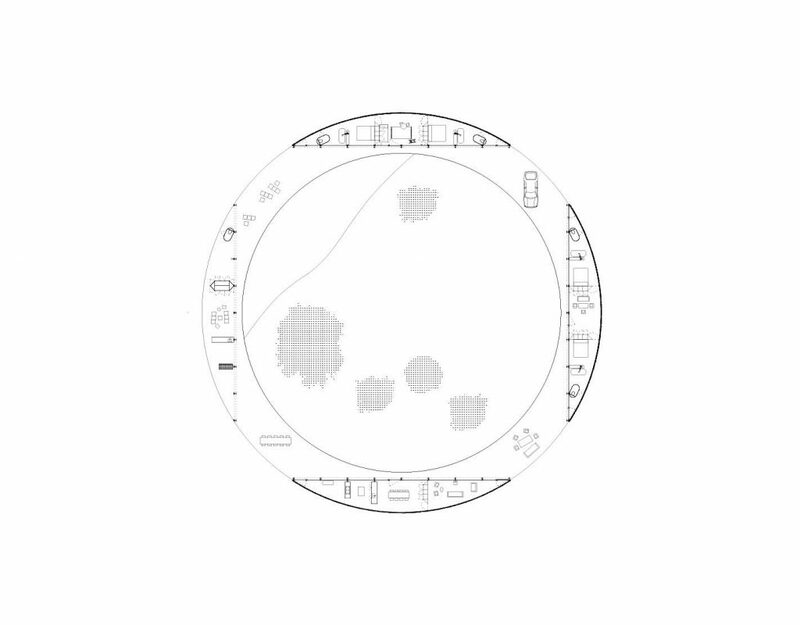 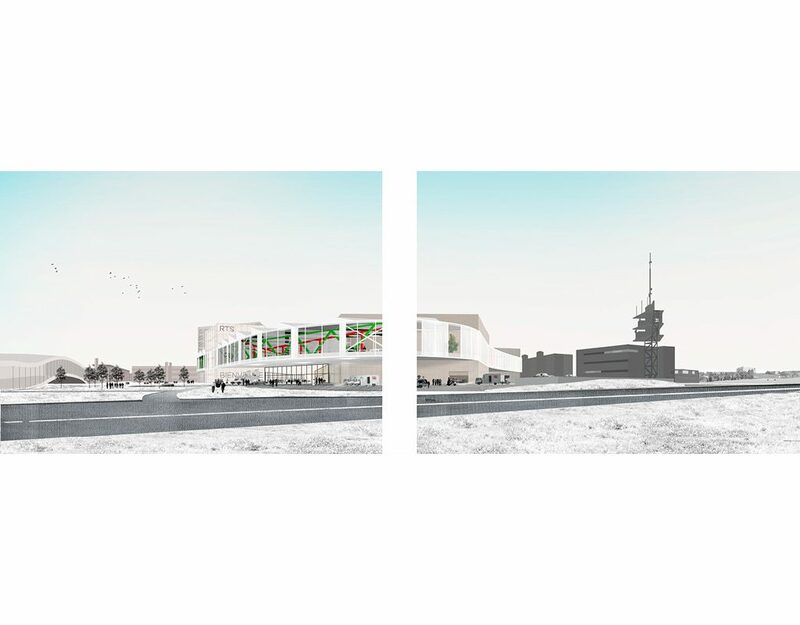 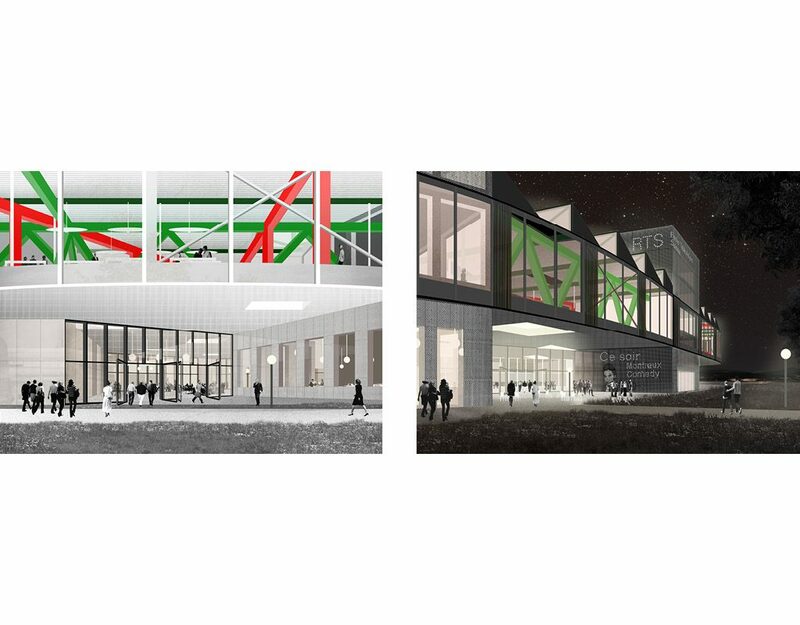 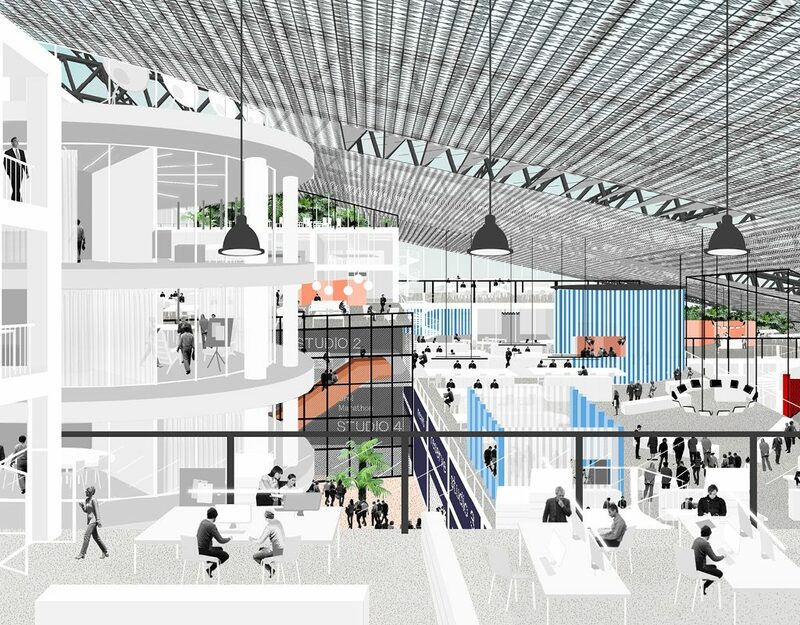 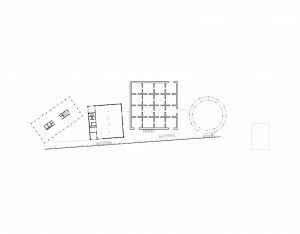 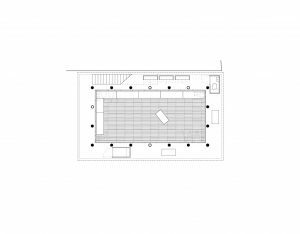 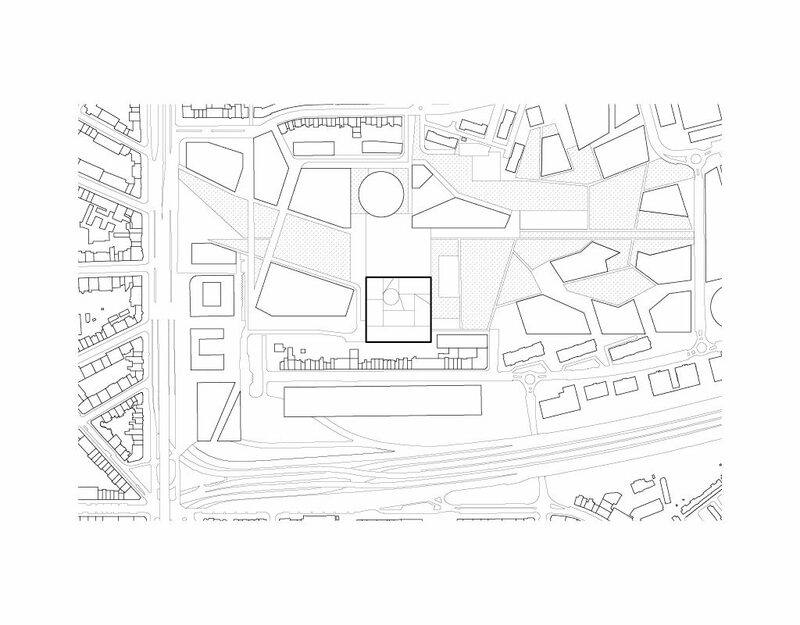 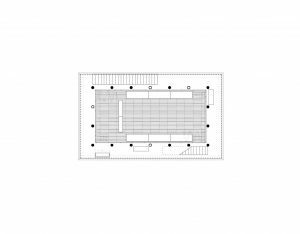 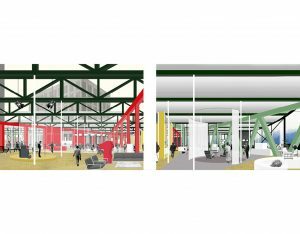 The 20 000 m² project, features a set of multipurpose and flexible production halls, joined in an elongated elliptical floor plan, and crossed by green transversal axes. 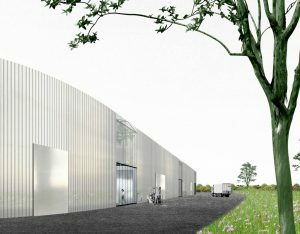 The building will be the first stage of a sustainable industrial site ‘Ecoparc’. 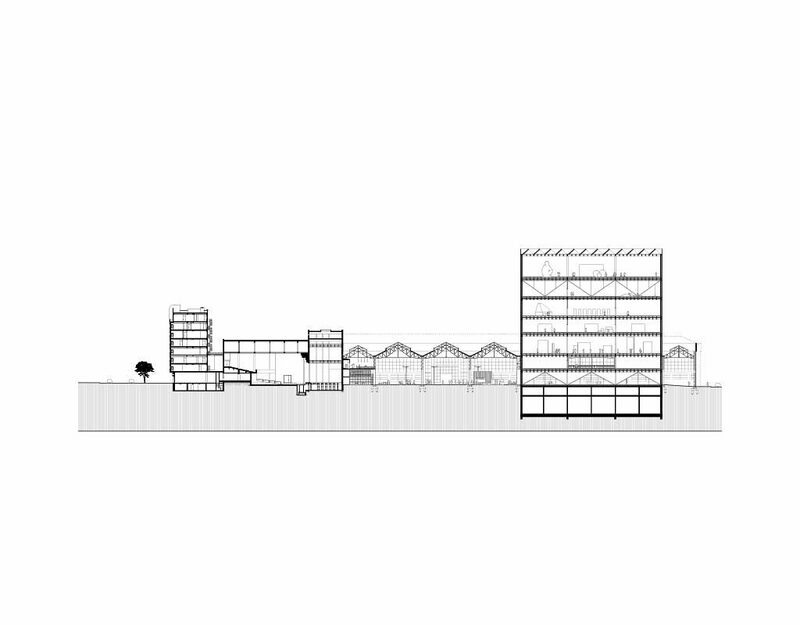 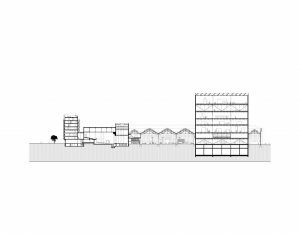 The building measures the scale of an industrial complex in relation to its surrounding landscape. 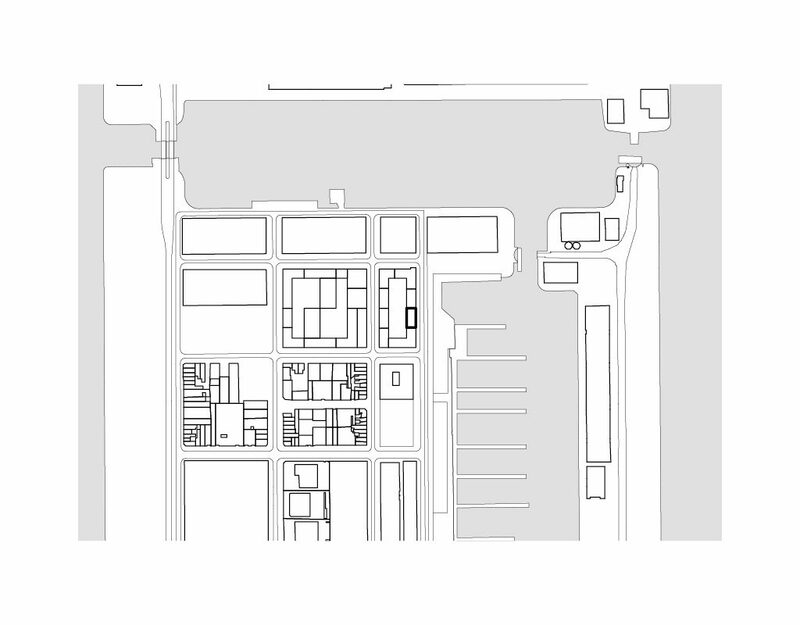 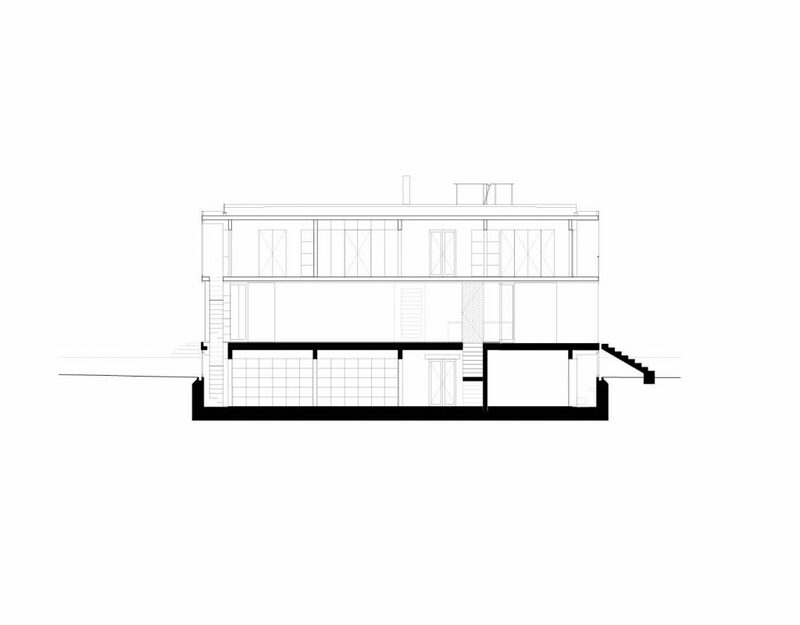 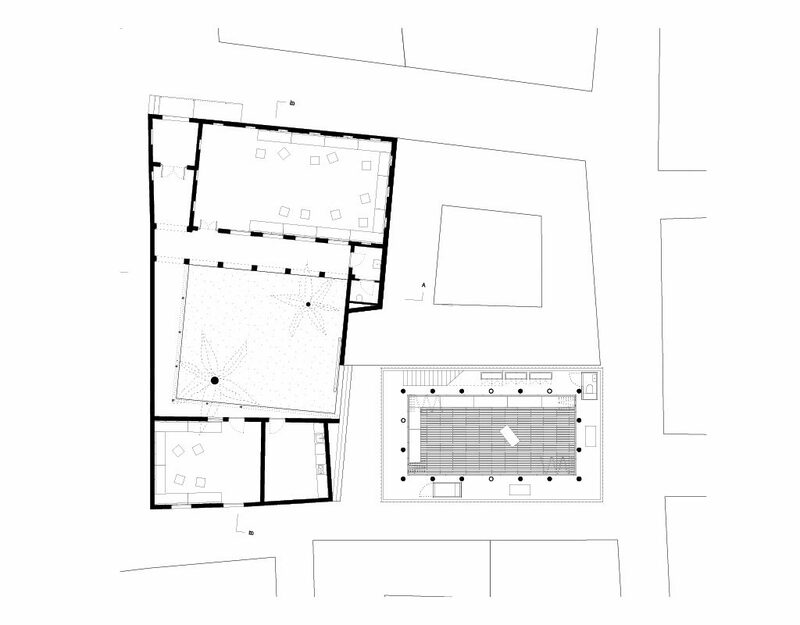 The proportions of the building become territorial. 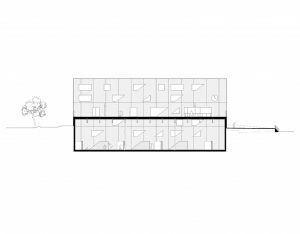 The volume is composed of a series of warehouses separated by shared functional zones, making for a compact but porous building. 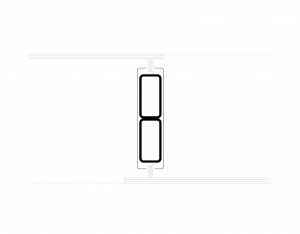 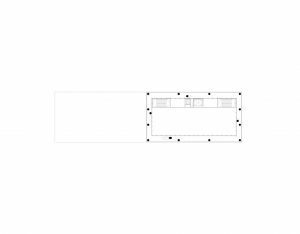 The rounded perimeter facilitates access and by simple subdivisions creates a clear and easy use. 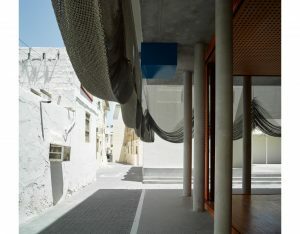 The inner streets serve as common areas where various activities can be organised: parking areas, daily deliveries, a clear business address, etc. 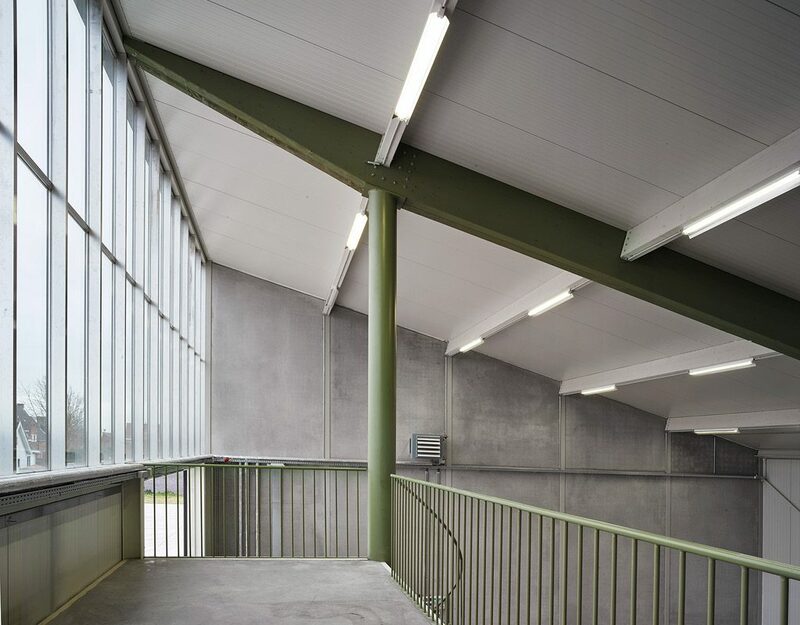 A light pergola structure transforms this industrial zone into a qualitative indoor space that also regulates the neighbouring office spaces by climatically regulated roofs and cross ventilation. The new library for the municipality of Sint-Martens-Latem is first of all a central gathering point. In the tradition of the cultural center, the library is set up as a large living space, shared by the residents of the municipality. 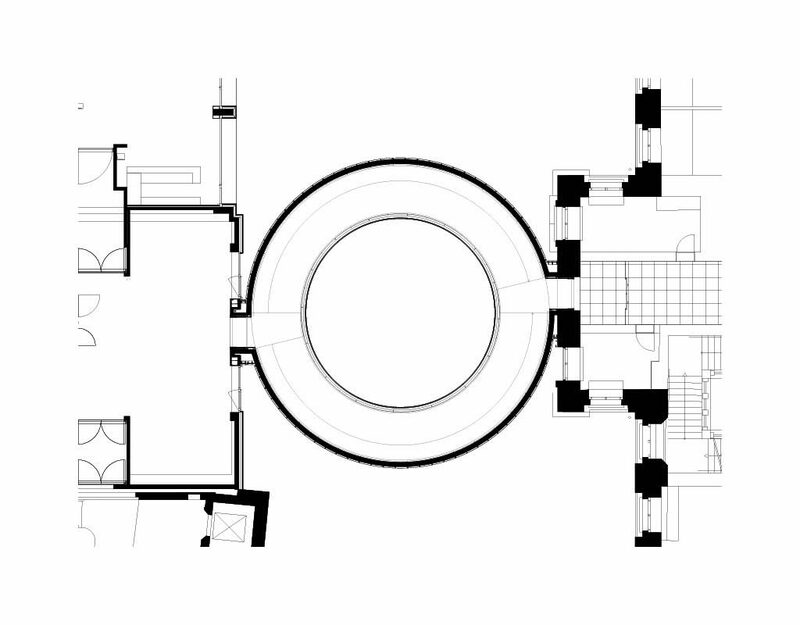 A saddle-shaped roof is delimited by a circular perimeter. 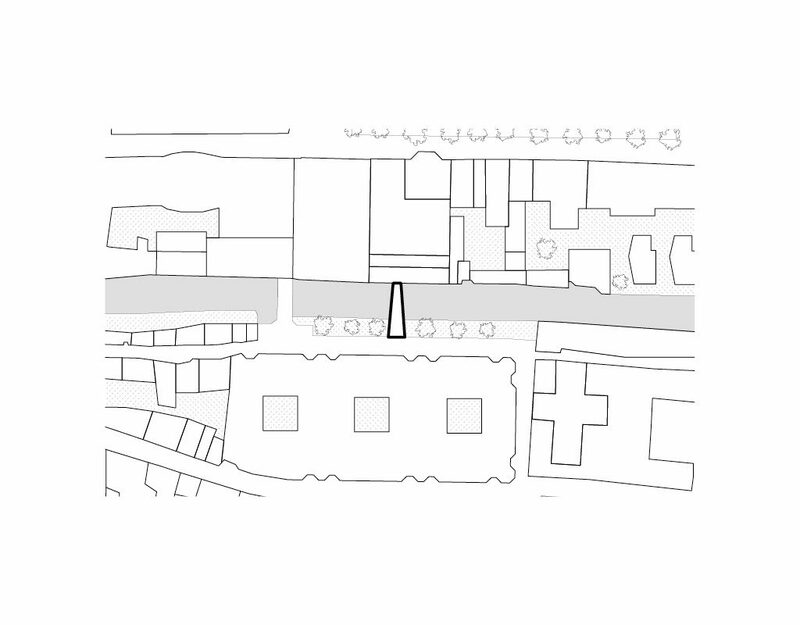 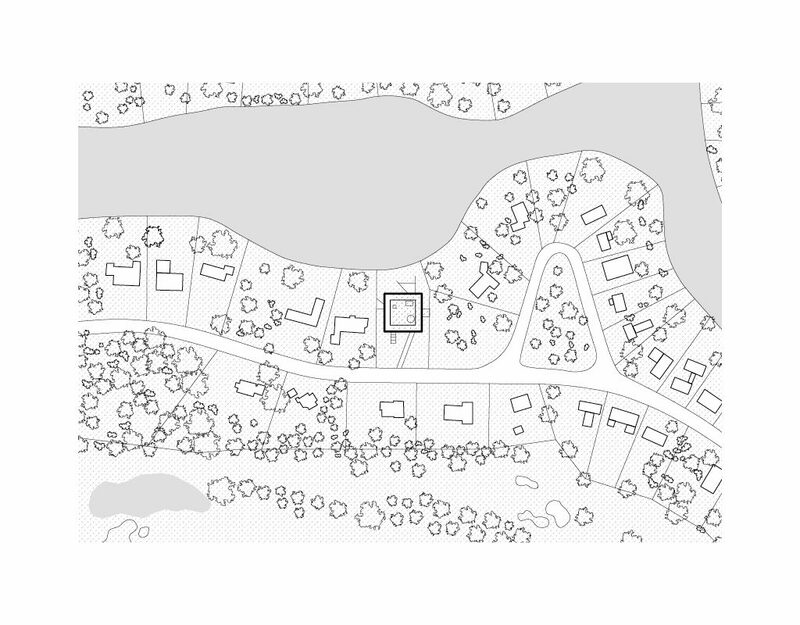 The perimeter cuts the roof shape into a distinctive figure in the center of the municipality, as anchor point, as the first element of a cluster of public buildings – buildings in the village center, along the road and along the new municipal settlement. 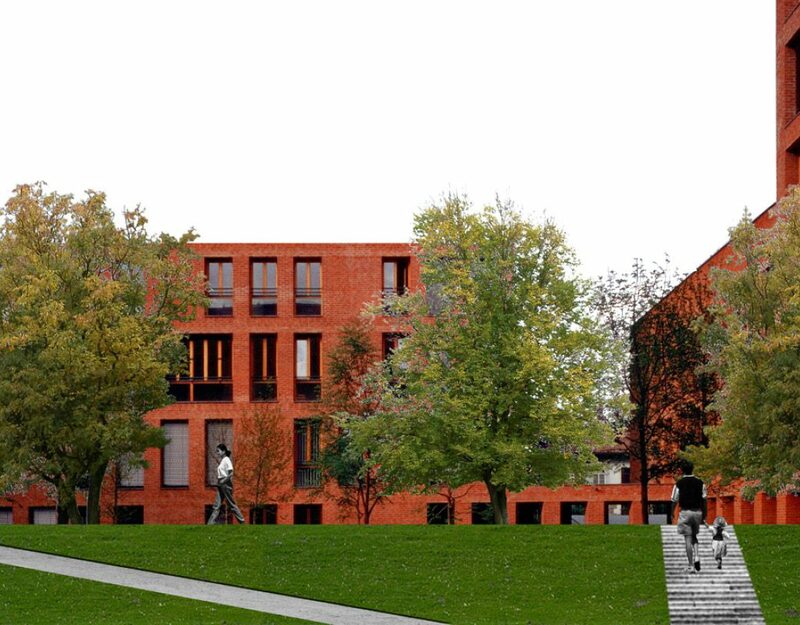 The rounded red brick perimeter makes the main space of the library building. 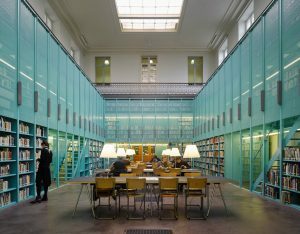 The library cabinets inside are built alongside and also carry the roof. 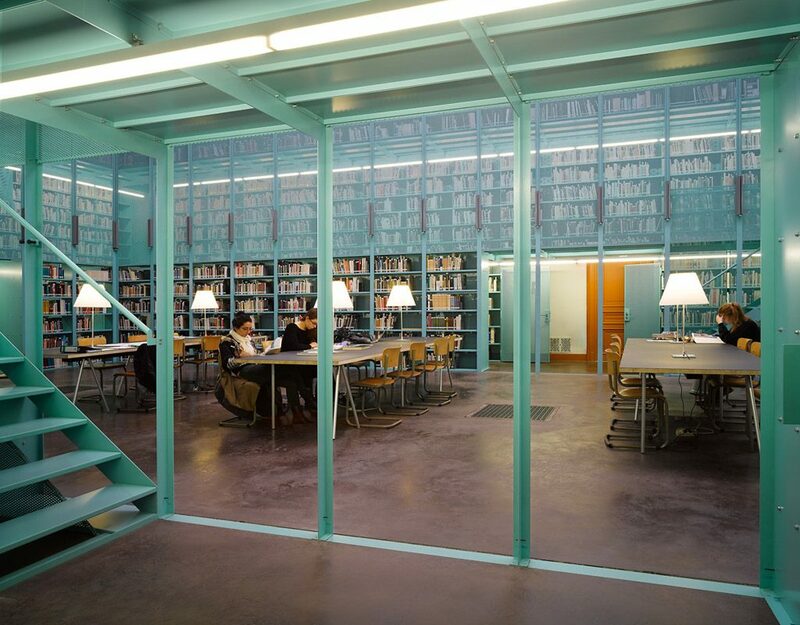 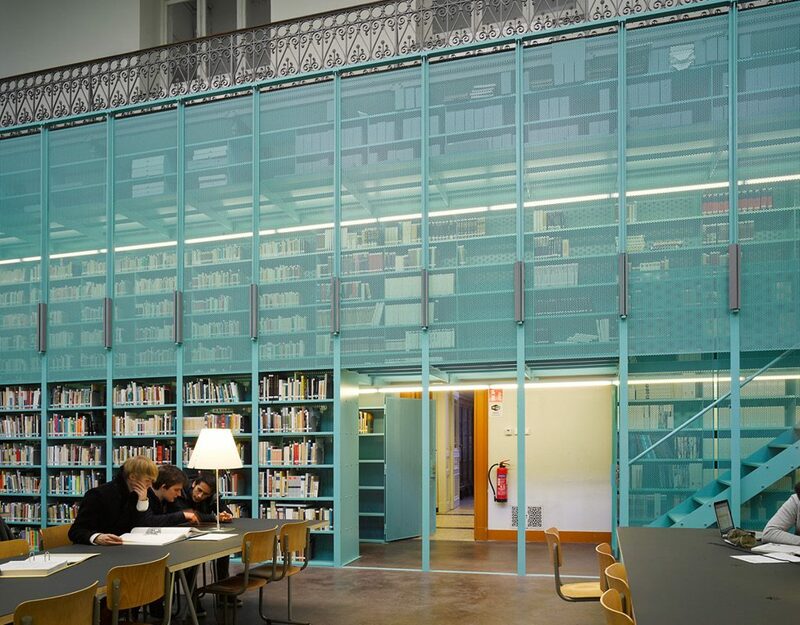 The steel cabinet wall defines the separation line between library spaces and municipality. 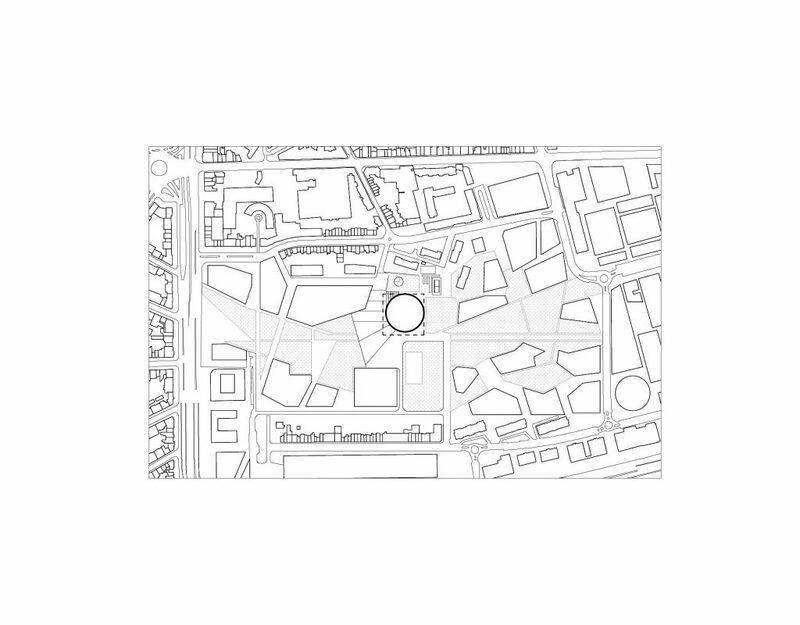 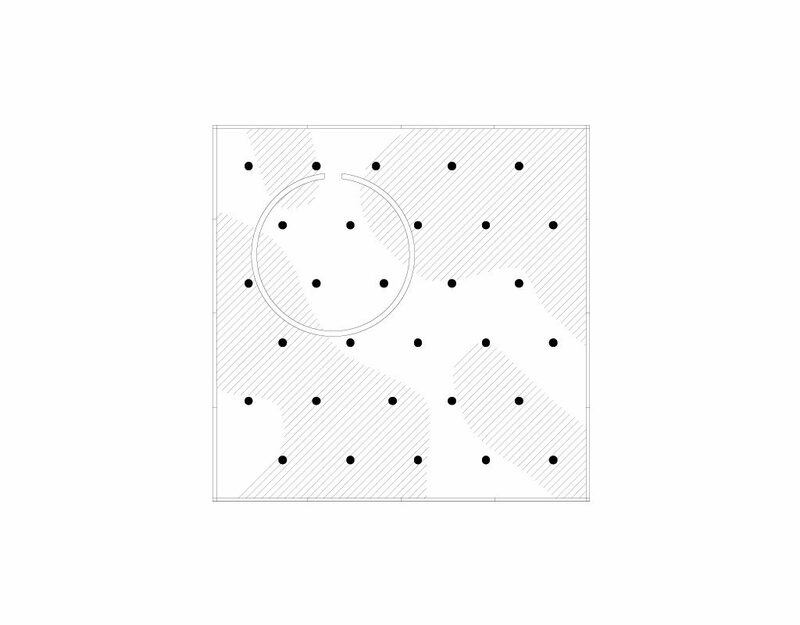 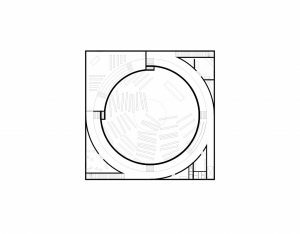 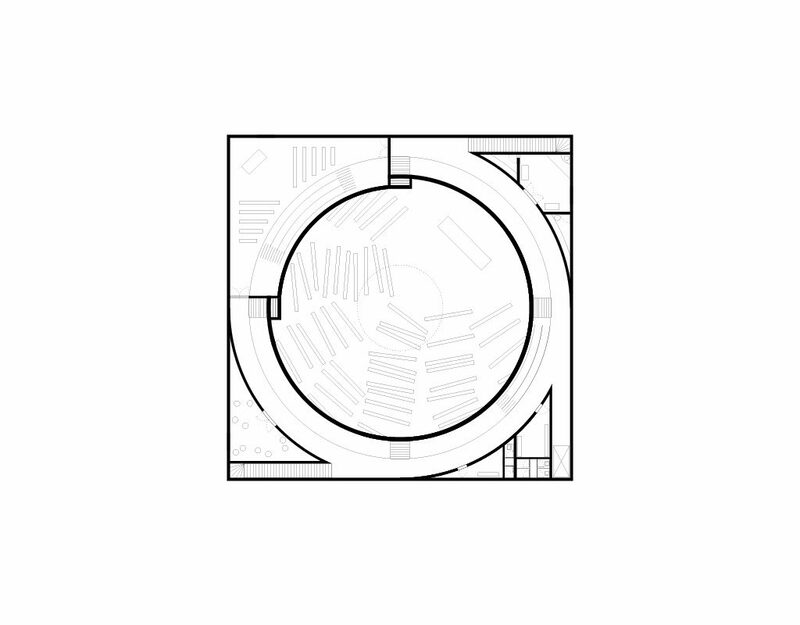 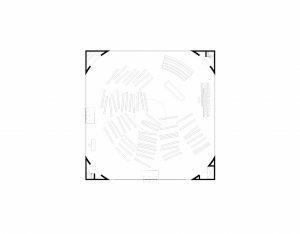 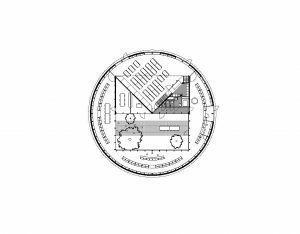 In the round perimeter, a square figure makes both the reading garden and the polyvalent hall. The reading room is a reading room in direct relation to its garden. 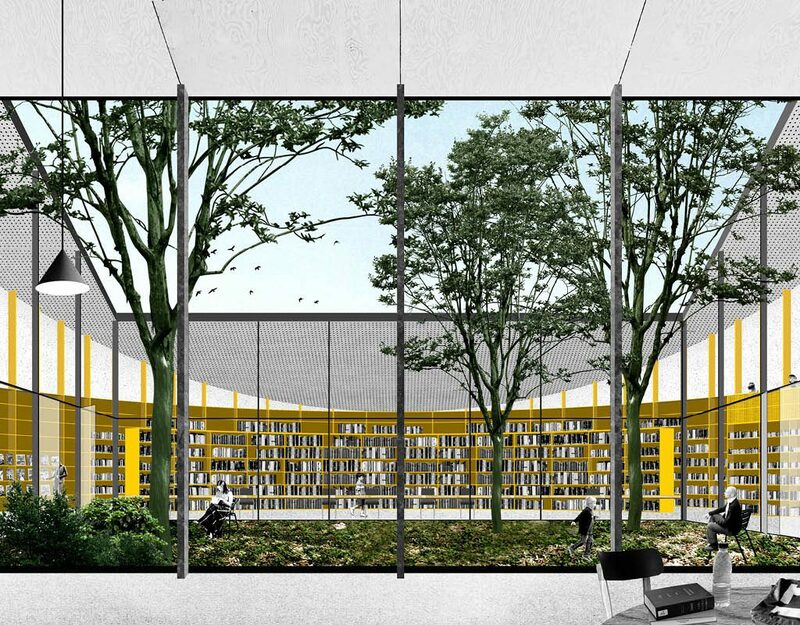 The reading garden is the center of the library, as the ‘largest room in the largest house’ of the municipality. 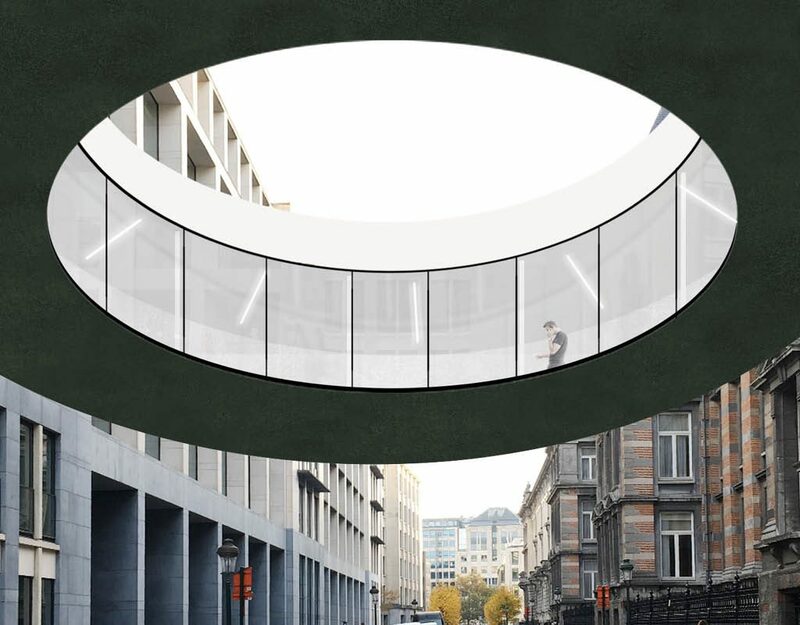 ‘Tondo’ is a footbridge that connects the House of Representatives’ offices with its recent extensions, the new Forum Building, on the other side of the Leuvensestraat in the centre of Brussels. 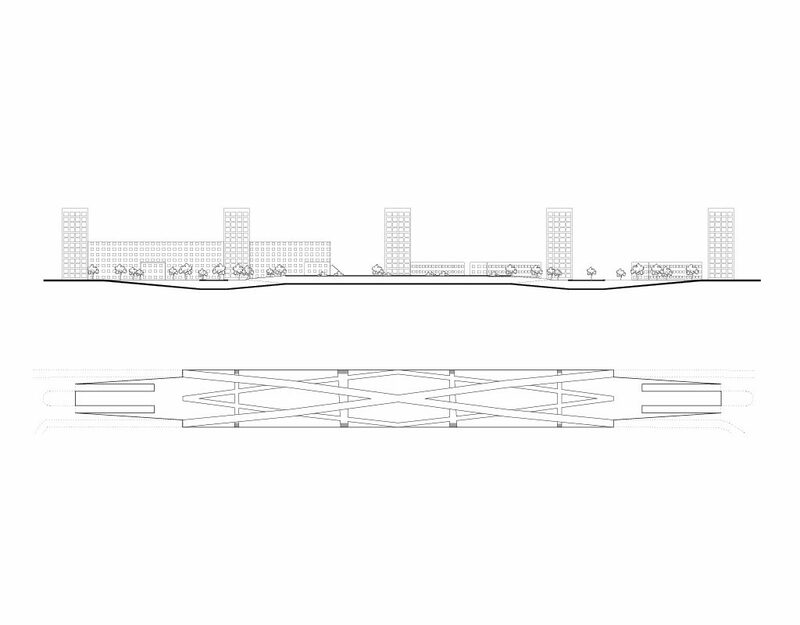 The bridge was explicitly designed as a spatial element, rather than a technical solution. Named after the tradition of the ‘Tondo’, a circular renaissance painting, it’s shaped like a ring, and tucked between the two facades. 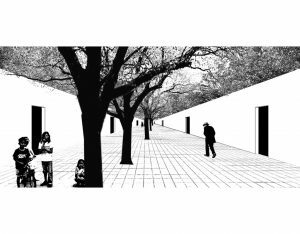 There is a generous walk around an enclosed outer space, which also functions as an escape and meeting space. 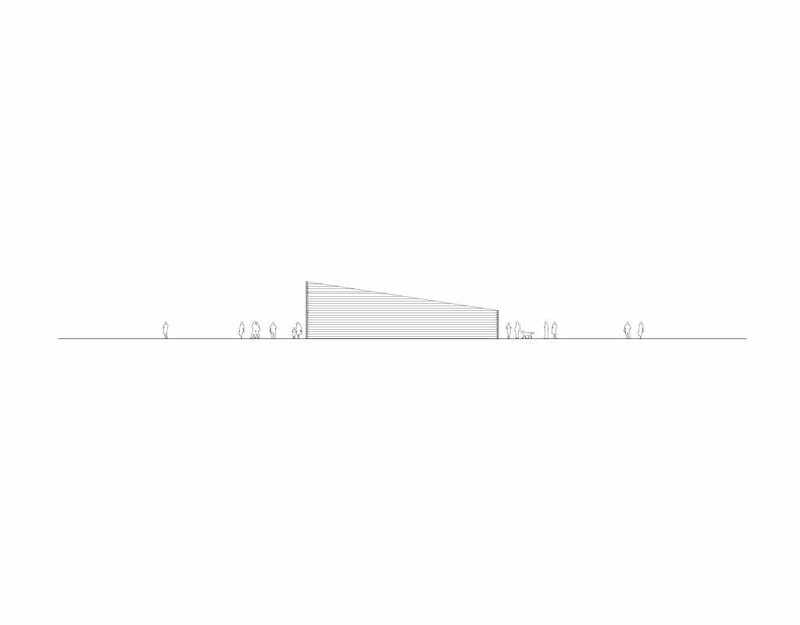 At the same time, the ‘detour’ also allows the height difference between both buildings to be bridged by means of a single, accessible slope of 4%. 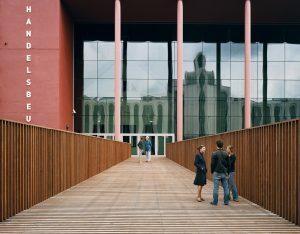 Towards the city, the bridge shows itself as a ‘closed’ element, in the tradition of, for example, the Bridge of Sighs. Coated with mirrored panels, they reflect the facades of both the Forum building and Parliament. From closer she shows through the opening a subtle view of the passages between the two buildings. 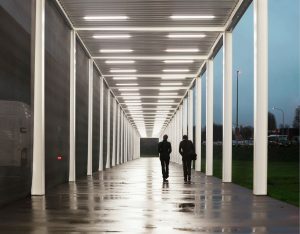 Structurally, the bridge can be described as a stiff disc, the roof, on which the floor hangs with a minimal presence of structure: a near ephemeral pavilion between the buildings. 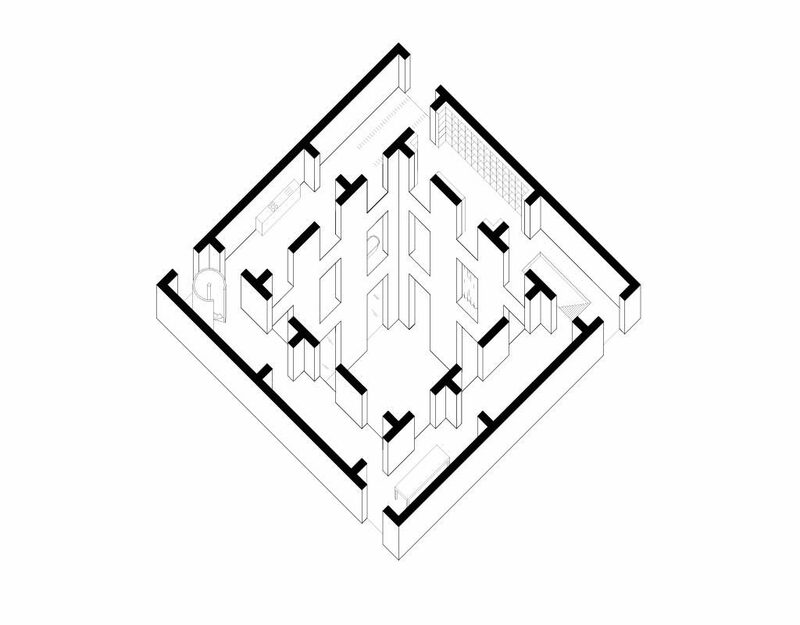 Viewed from above, however, the sculptural beam game of the structure is visible: an ‘eye’ on the world. Curated together with Giovanni Borasi and in collaboration with Go Hasegawa Associates, the exhibition ’Besides, History: Go Hasegawa, Kersten Geers, David Van Severen’ questions what role history can play in a contemporary architecture practice. 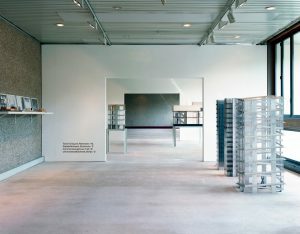 The exhibition, originally installed in the Canadian Centre for Architecture (CCA) in Montréal, CA, occupied seven rooms. 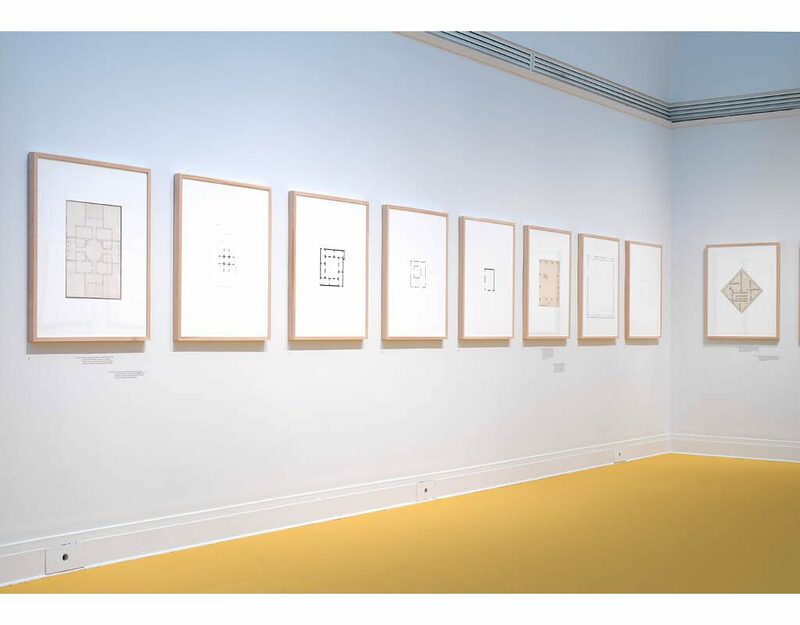 Each of them was dedicated to specific mediums such as plans, sections, models, perspectives, 1:1, and photographs. 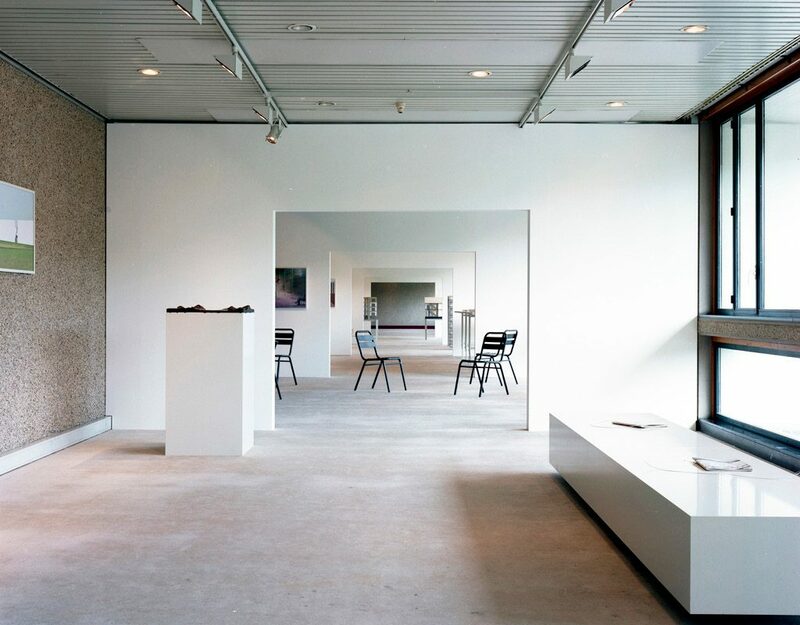 Within each room, historical and contemporary material stand side-by-side. 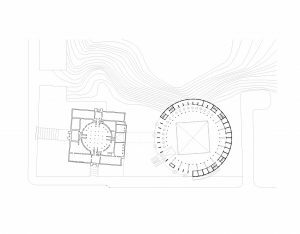 By re-interpreting and appropriating each others work, the two practices create an active dialogue and construct a relation in which history becomes something that can be used, rather than be just studied. 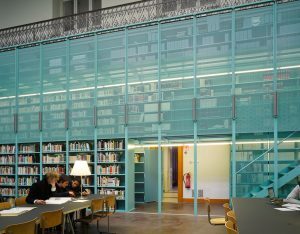 The material of the exhibition later travelled to the Serralves Foundation Library in Oporto, Portugal for it’s second installation. 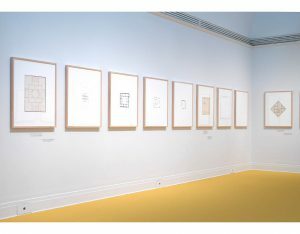 It was accompanied by a publication under the exhibition name, published in English by König Books and in Japanese by Kajima Institute Publishing. 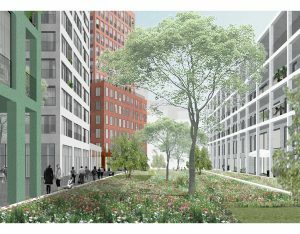 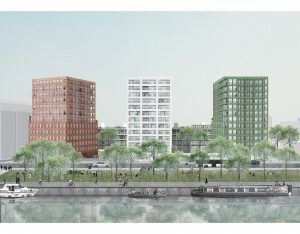 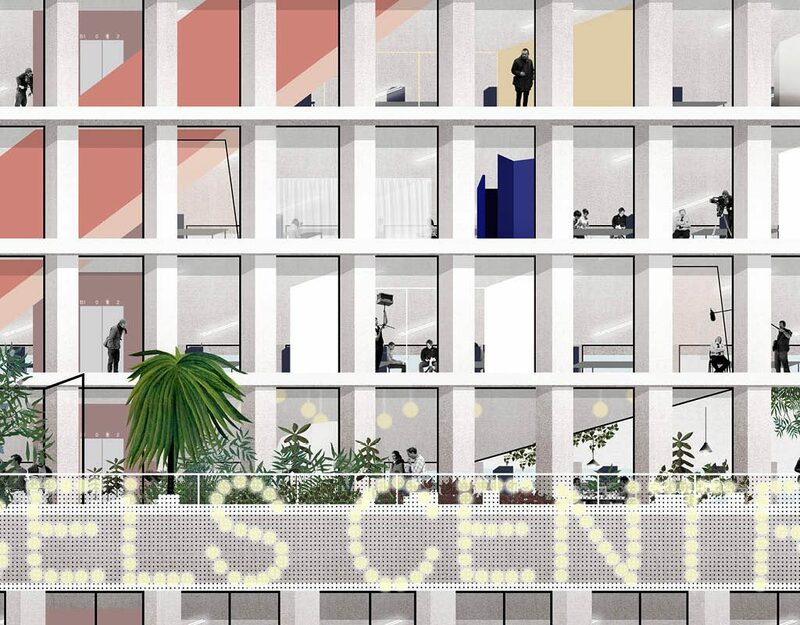 OFFICE, in collaboration with Nicolas Firket Architects and Bureau Bas Smets, won this competition for the redevelopment of the ‘Havenlaan 12’ site at the Brussels Canal area, by developer Triple Living. 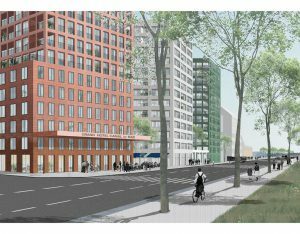 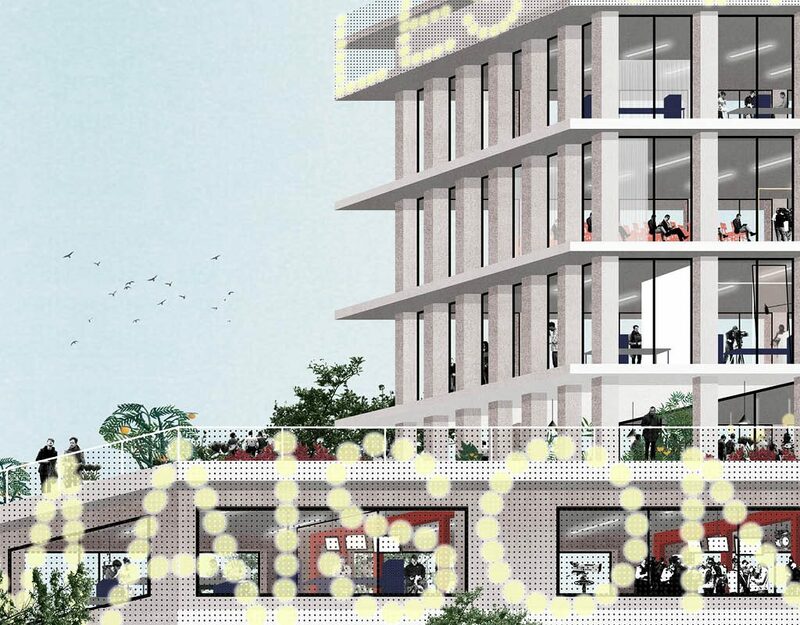 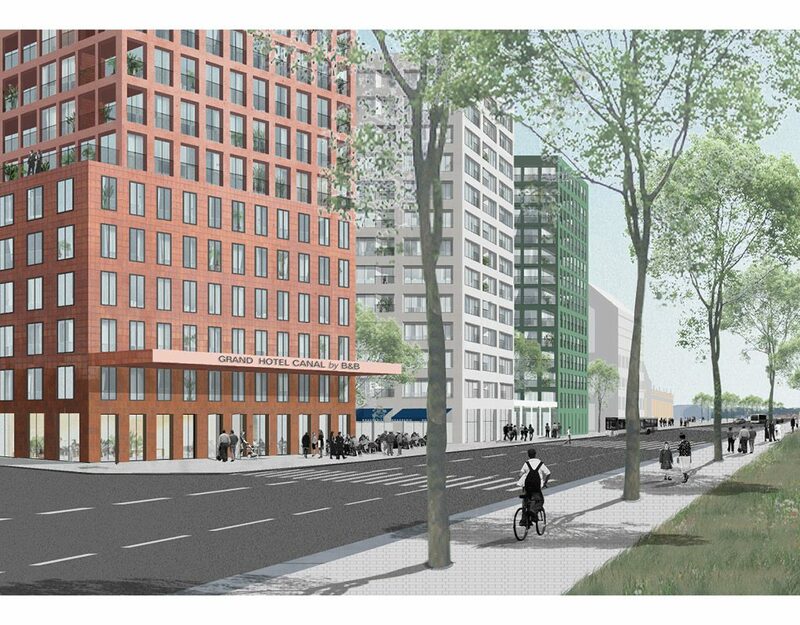 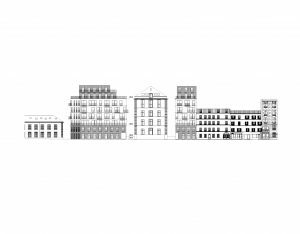 The competition was organised by Brussels Bouwmeester, who together with the Molenbeek commune, the Brussels regional authorities and the client, chose the project out of an original longlist of 30 teams, and 3 final proposals. 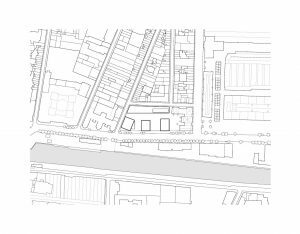 The site, which sits next to Tour&Taxis and faces the future ‘Beco park’ along the canal, is currently occupied by an office building. It will be replaced by a family of three small towers and a lineair housing block, organised around a central semi-public garden. 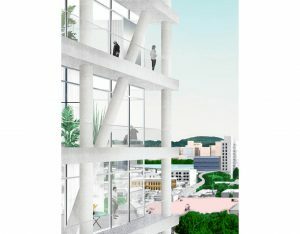 The volumes, who share a similar character and finishing in coloured concrete paneling, will together form a permeable, urban ensemble with a strong identity, which can be seen as a blueprint for future developments. The existing underground parking will be used as the foundation for the new development. 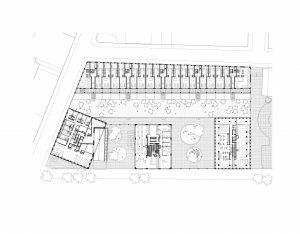 The 28 000 m² of planned floor surface will contain a mix of housing, assisted living, a hotel and various commercial spaces. 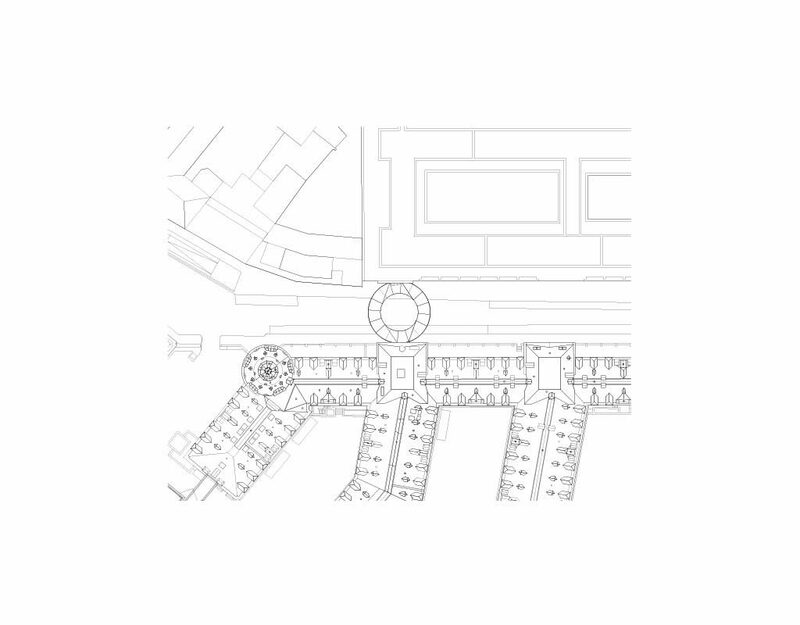 The various types of housing (row houses, apartments and studios) will be complemented with private outside spaces, from gardens at the ground level until terraces, loggia’s and winter garden in the upper levels. 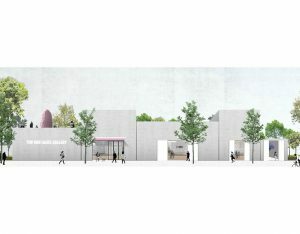 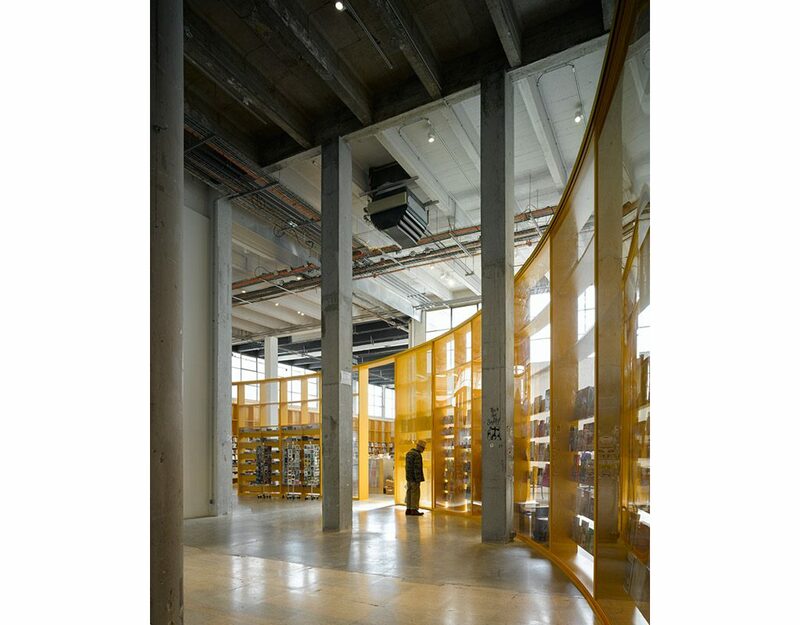 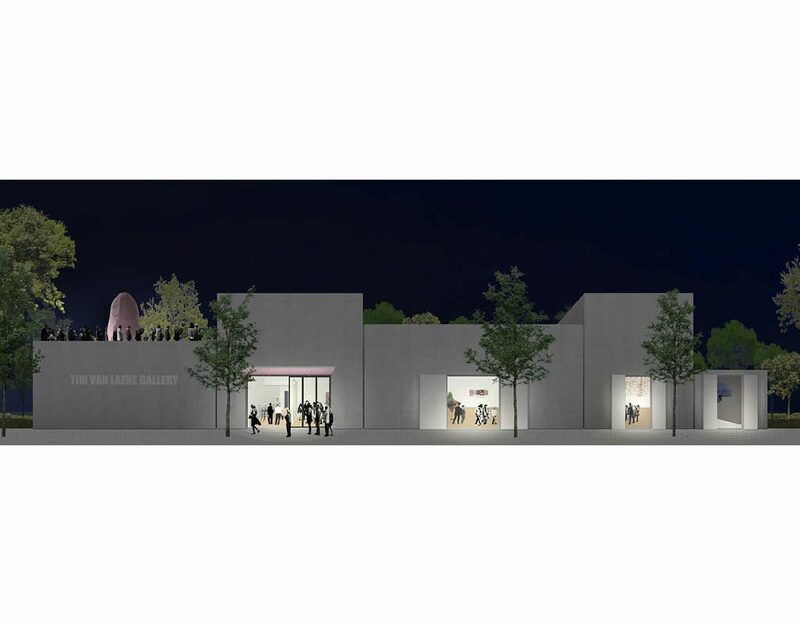 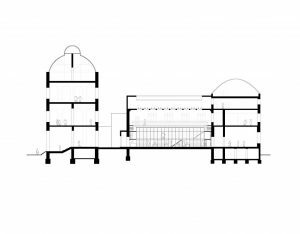 This project was the winning proposal in a call for proposals for the new bookshop of Palais de Tokyo, together with the Cologne based publisher Walther König and Parisian maison d’edition Cahiers d’Art. 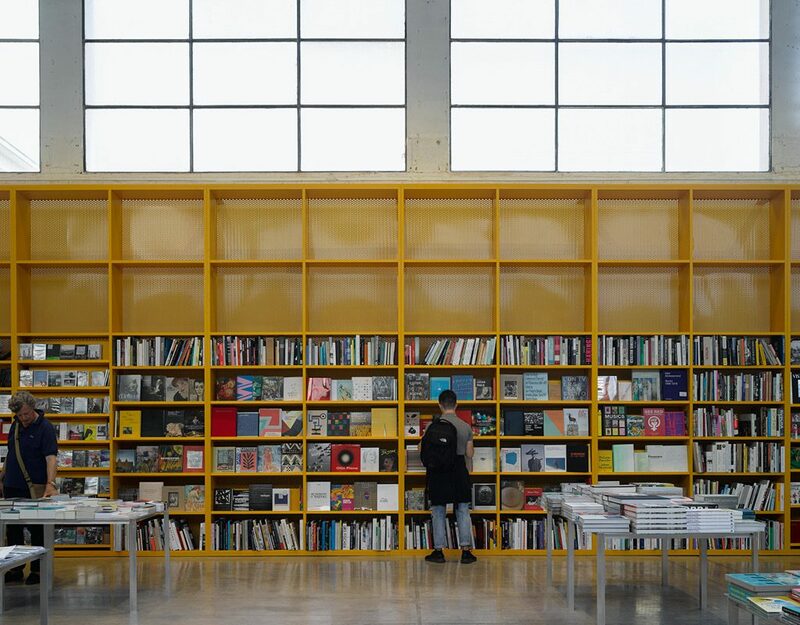 The new bookshop aimed to become an important part of the identity of the future Palais de Tokyo, while also being a strong character and destination in itself. 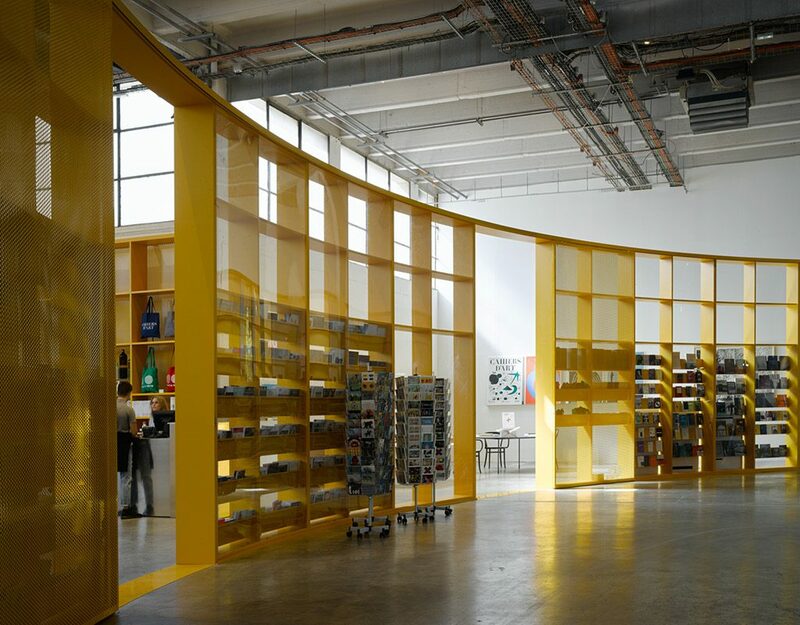 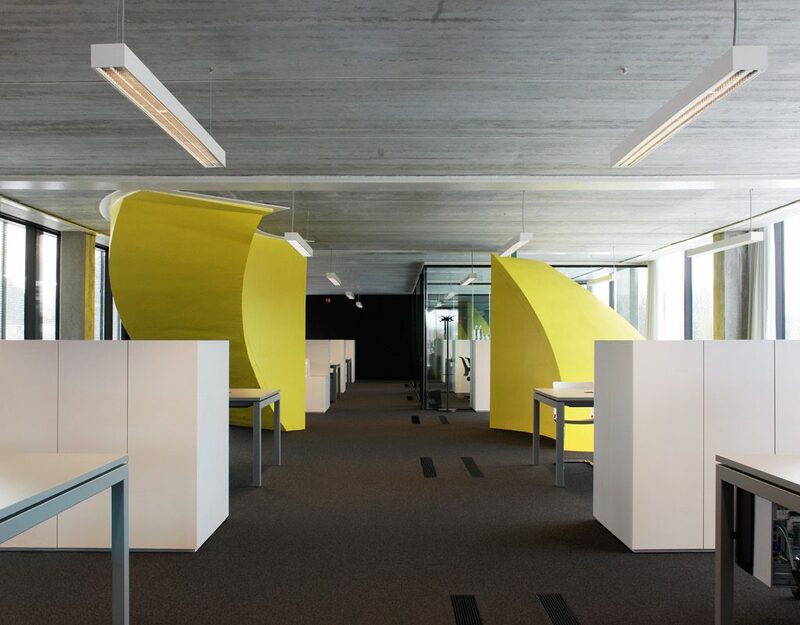 Wooden bookshelf units of 2x4m, lacquered in a bright yellow colour, are simply inserted into the existing space. 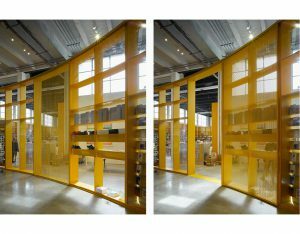 They are both the structure and the frame of the shop. In most areas the shelves follow the outline of the existing room, while in others they allow themselves to be free, bending to create an impressive curved vitrine attracting guests to the shop. 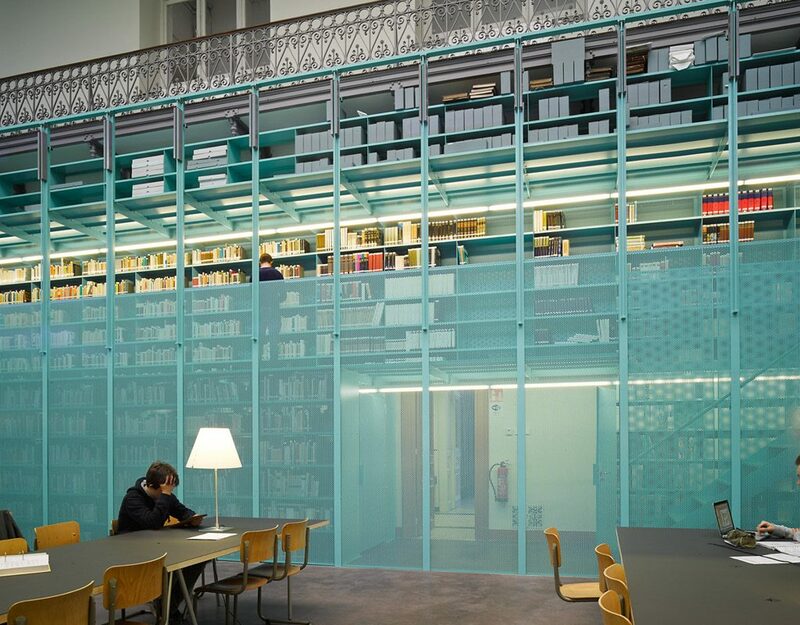 The bookshelves provide possibility to flexibly attach additional elements such as perforated metal back walls, glass facade, sliding doors and curtains. In that way they answer all needs of a functional bookshop: displays, vitrines, storage, zoning, and security. 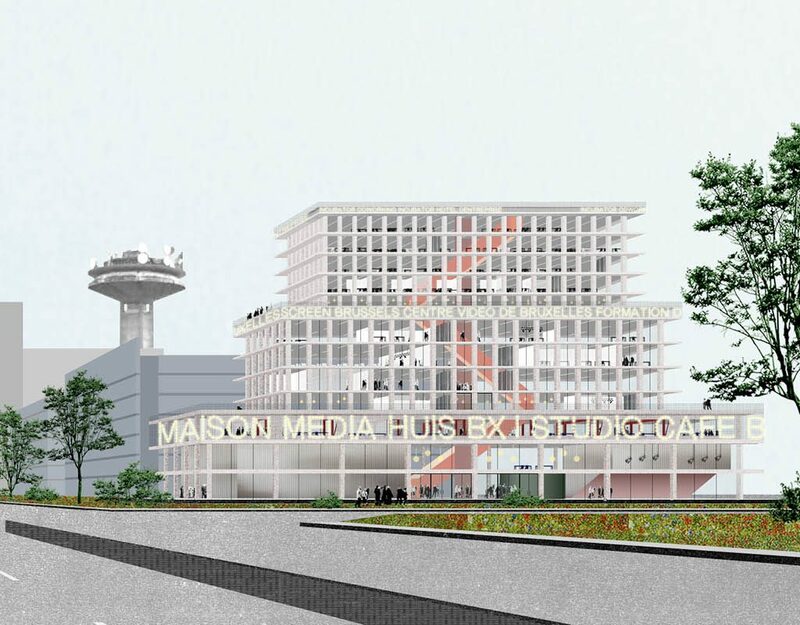 The new headquarters of the RTBF is conceived as a simple square volume with an inclined roof. 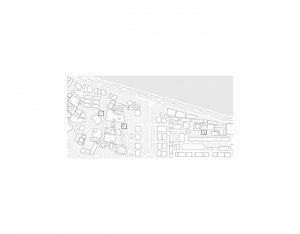 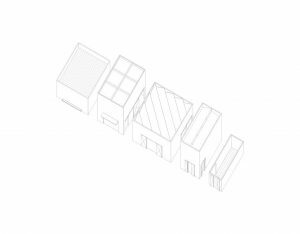 Set in an urban context of ambiguous qualities, and in direct proximity to the small scale neighbouring houses at its back, the project tries to be at once blunt and urban and subtle and generous: both box and roof. 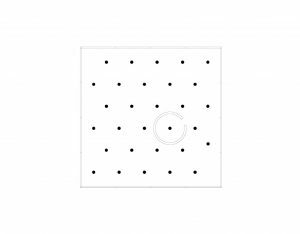 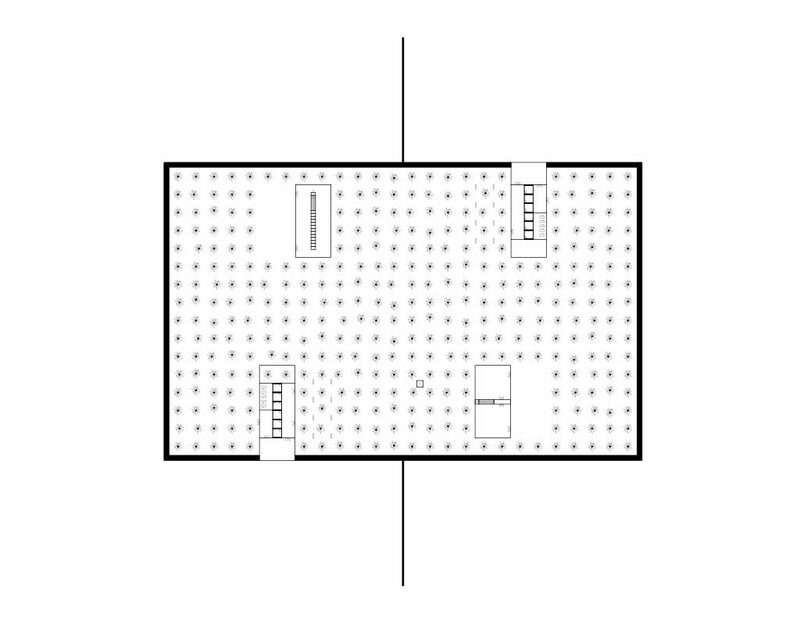 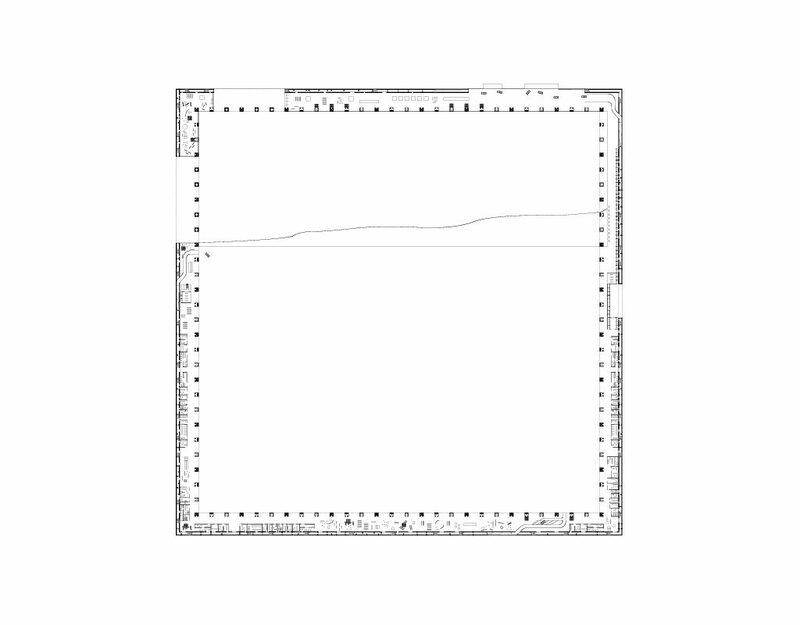 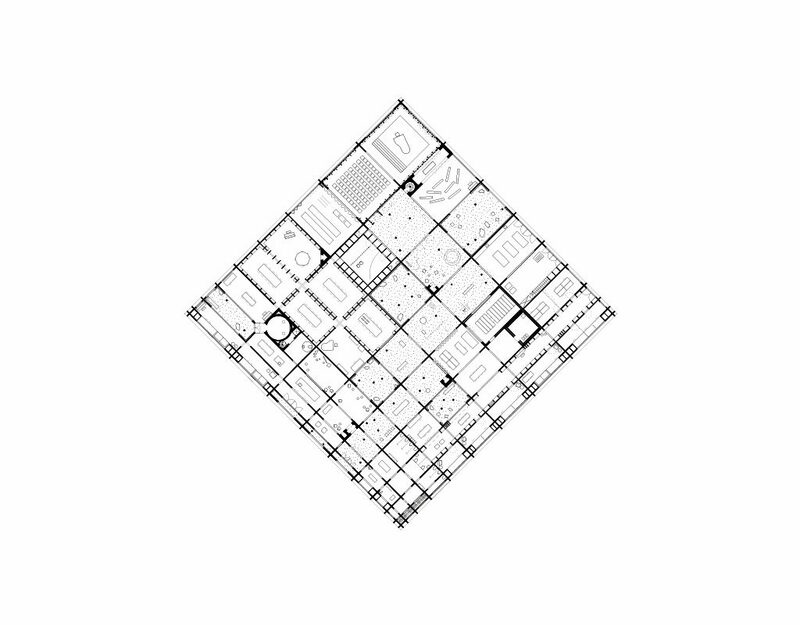 The big square is defined by a metal grid perimeter. 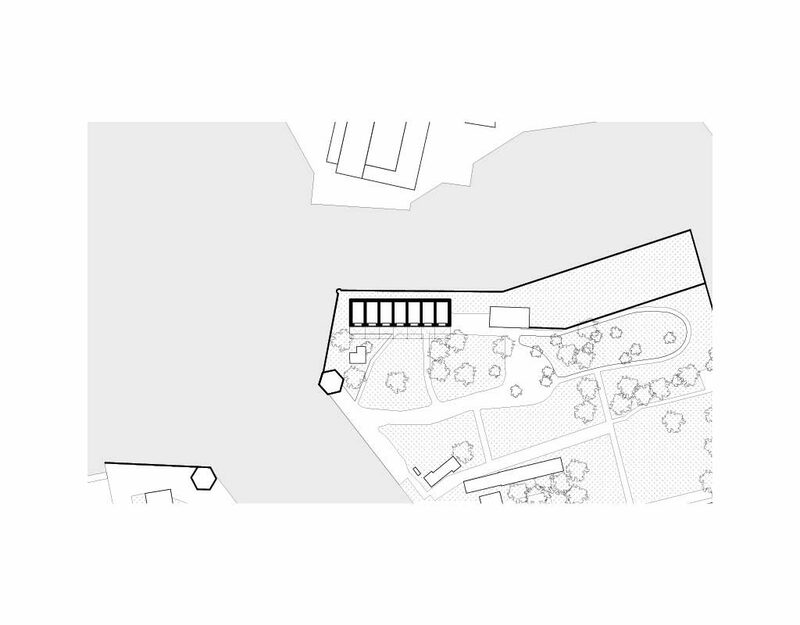 This perimeter separates clearly the content of the ‘public’ building from the public realm. Opening or closing different windows makes the RTBF building more or less accessible. 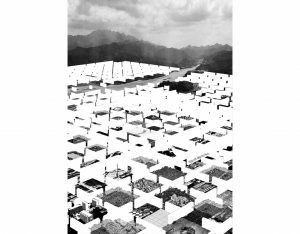 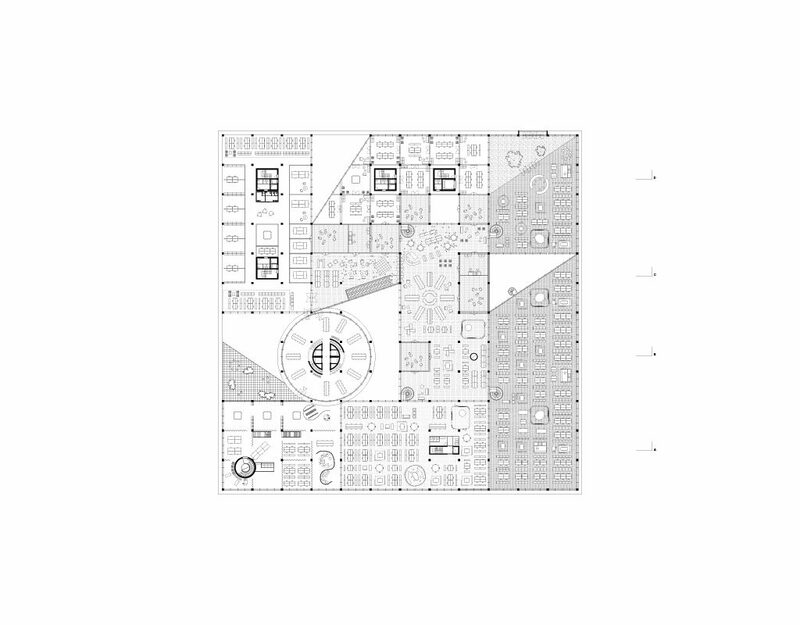 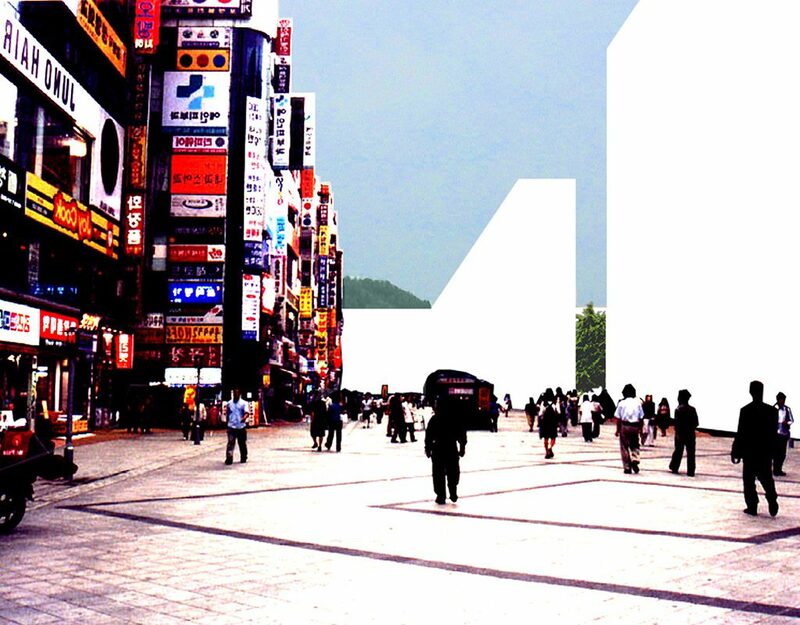 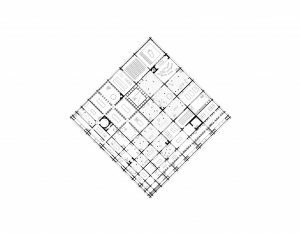 The big square plan is organised as a set of smaller volumes based on an 8 by 8 concrete column grid. 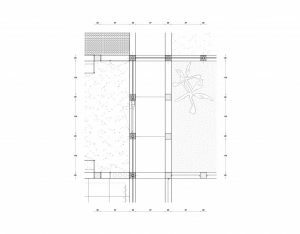 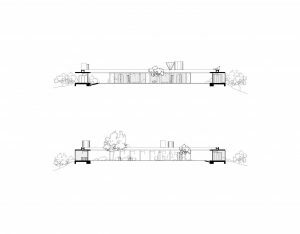 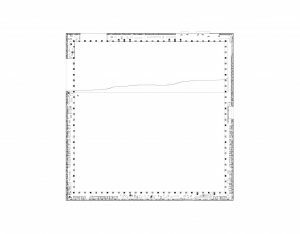 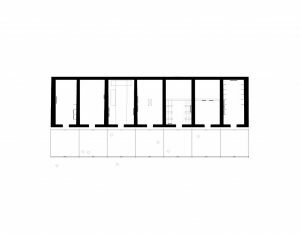 The volumes are created by defining an inner glass perimeter, thus creating various sets of thresholds that allow the different levels of publicness of the complex its particular place. 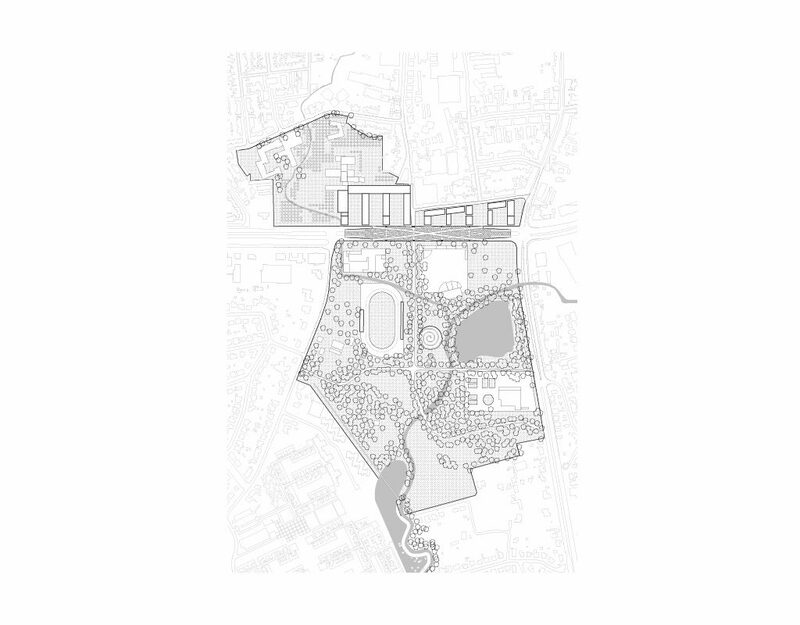 The combined plan has a certain complexity without giving up a simple organisational structure. 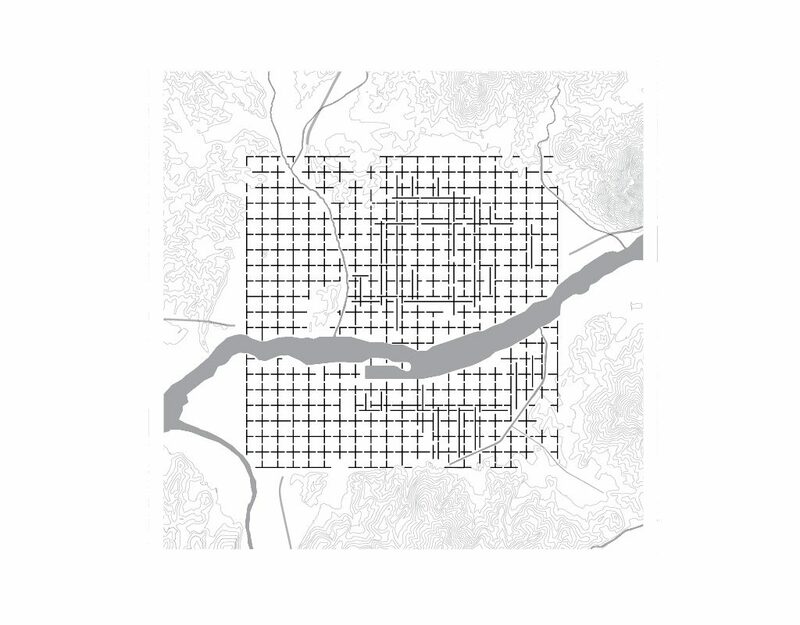 The separate volumes of the ‘captured city’ are thus all interrelated and are neither completely independent nor all the same. 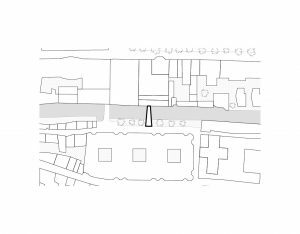 They have a band like organisation, with an increased level of accessibility towards the main square, and a logistic face towards its back. 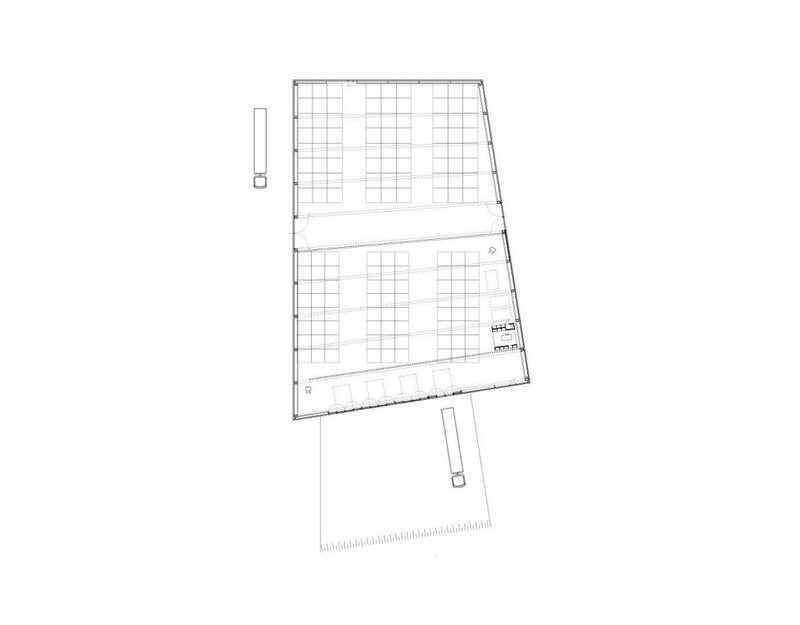 Inside the contain floors of different heights, and create a stepped working environment, central to the building. 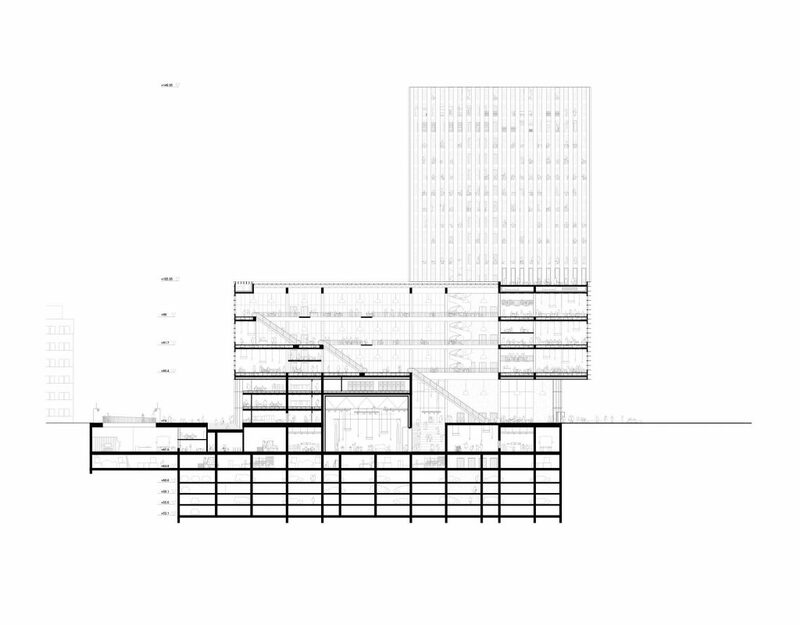 It is this stepped office landscape that gives space to the redactions and the radio studios protected by a gigantic roof. 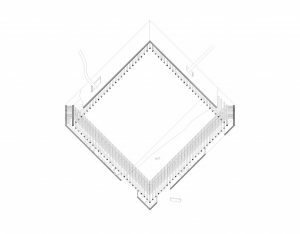 The roof which is made out of the same metal grid as the perimeter facade,is oriented to the south. Acting as a climate veil, it mediates light and climate. 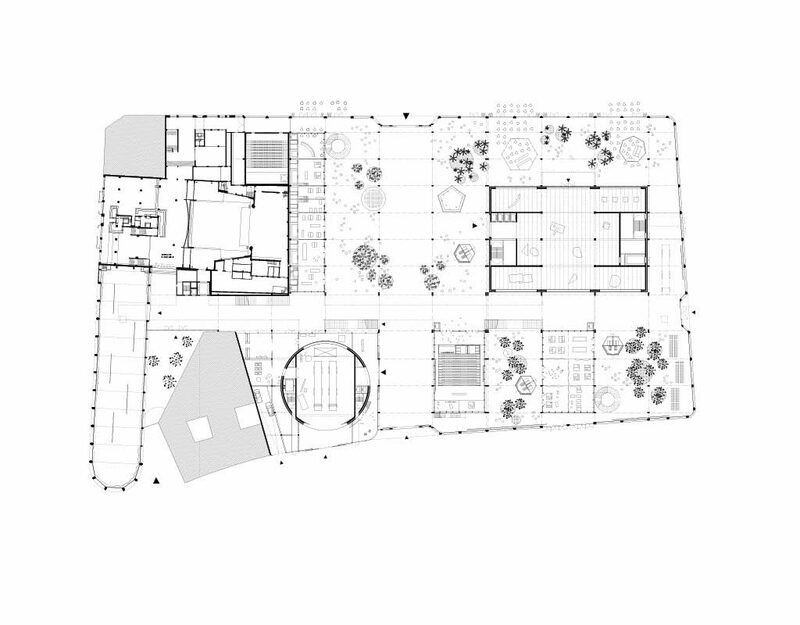 At crucial points the plot is kept vacant, thus creating a set of inner gardens. 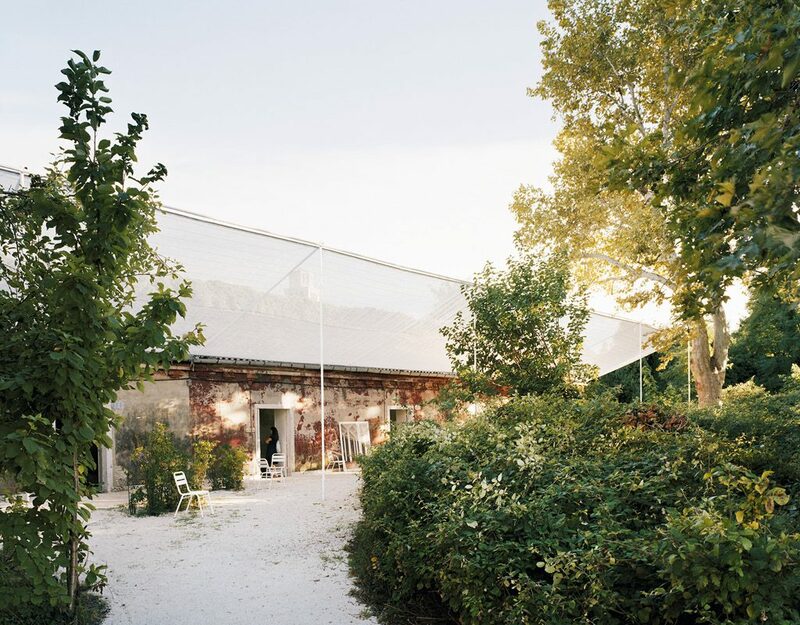 The gardens and the roof give the building its distinct character: both greenhouse and ‘boîte à miracles’. In the delicate equation between showing and selling, the threshold plays a fundamental role. 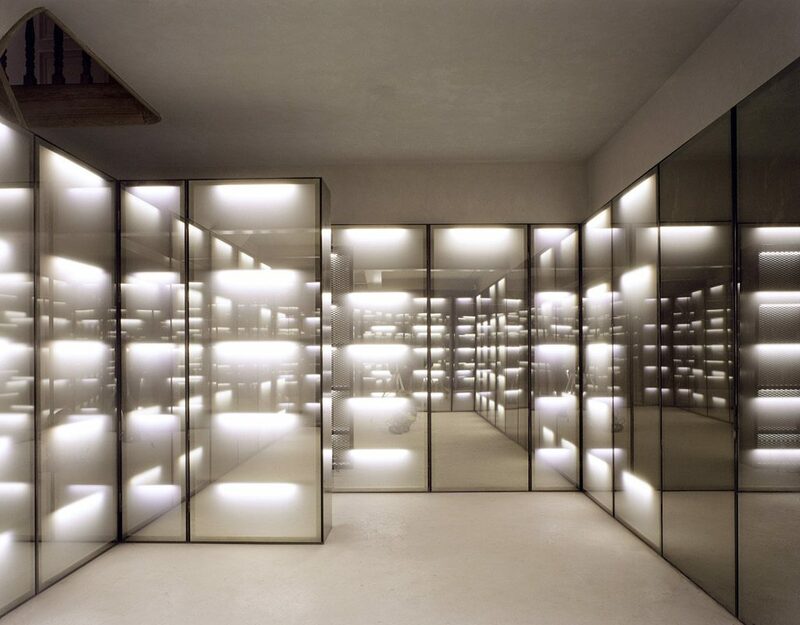 Hence the design of the first Paco Rabanne shop mediates between total openness and total enclosure. 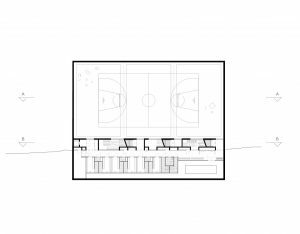 The space thus created is intimate yet accessible and tries to represent an idea of delicacy, technology and luxury without using common places. Materials are refined but direct and simple. 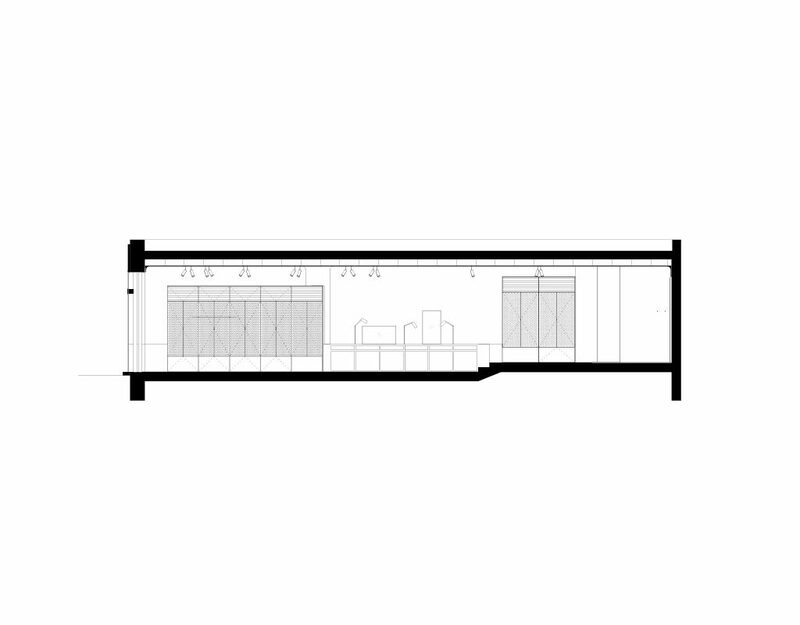 The perimeter – the room in the room – carries all the materiality of the shop and makes its background. 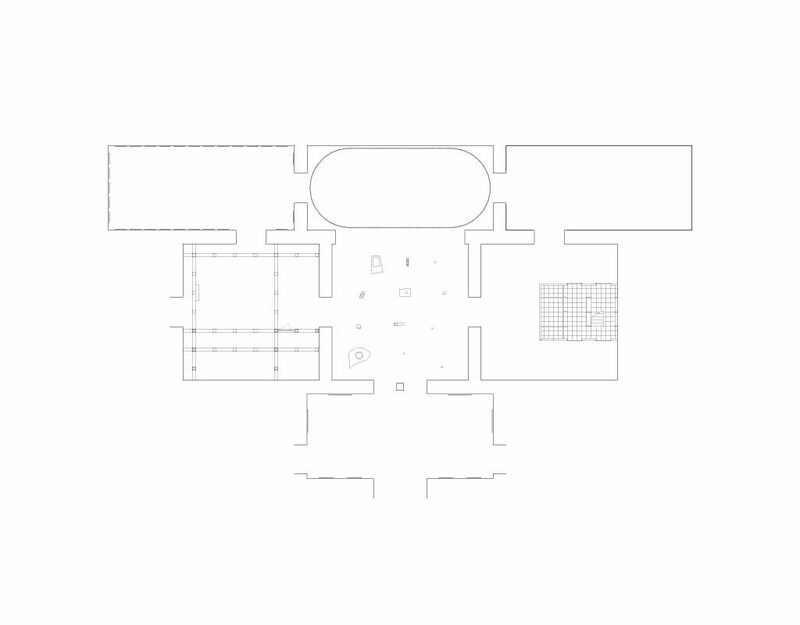 As such the intervention hangs between device and spatial correction. 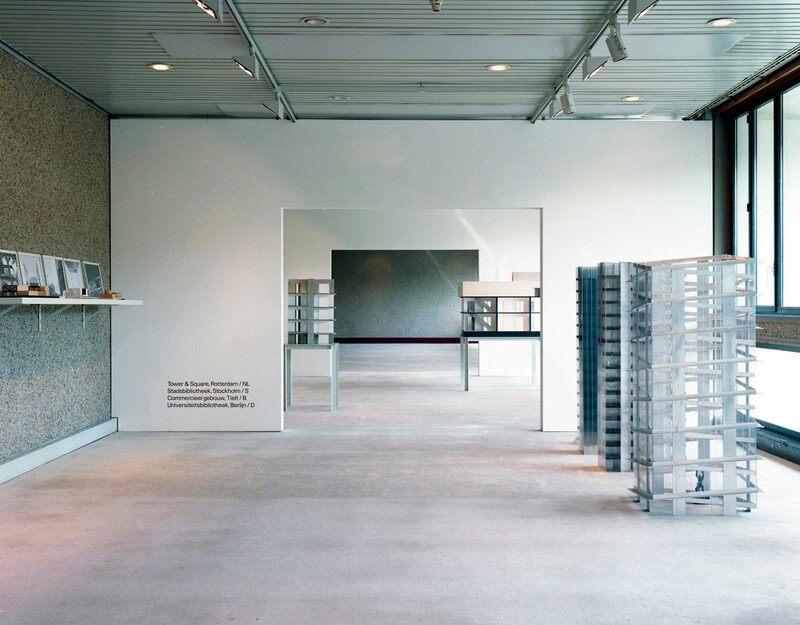 Doors, shelves and ‘windows’ organize the view and make the display possible. As a result the space is completely organized through a simple but transformable perimeter wall, a wall that carries within itself the echo of the radical experiments of Paco Rabanne himself, as he executed them directly on the material of clothing. 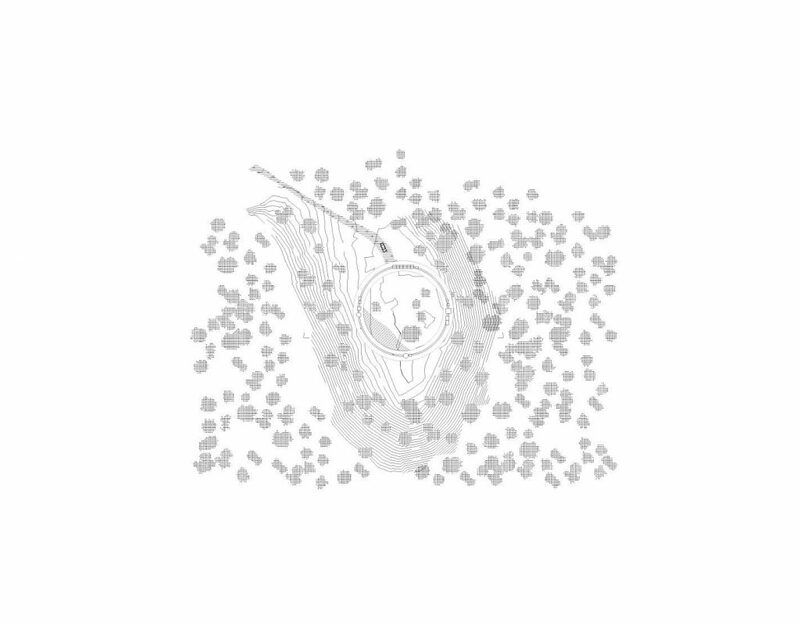 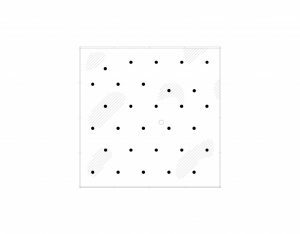 Here traces of that are found in the perforated aluminum surfaces of the semi cupboards, but indirectly, as if we want to keep the ambiguity into what the future will bring. 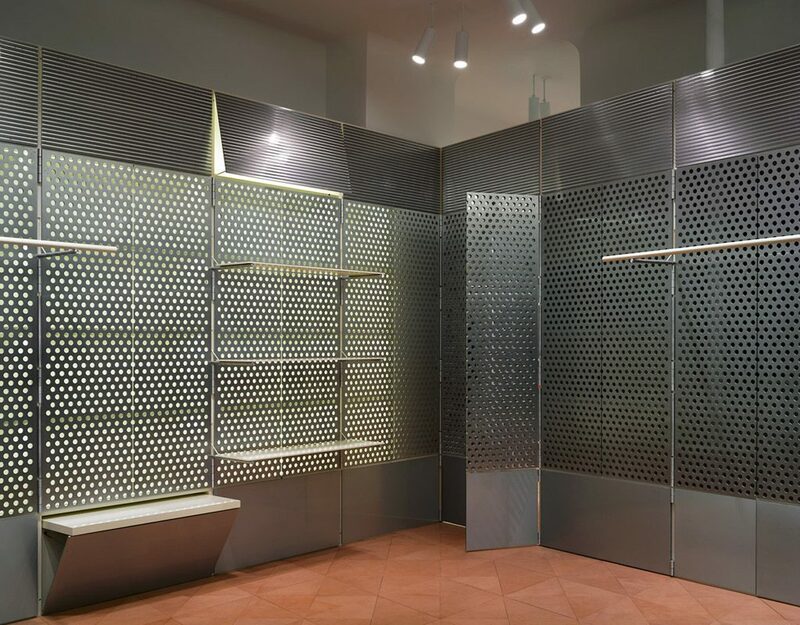 The shop consists of two main ‘spatial’ elements: the aluminum perimeter device that organizes the main spaces and the ‘Loos’ space, space that is intricately designed with a contemporary refinement. 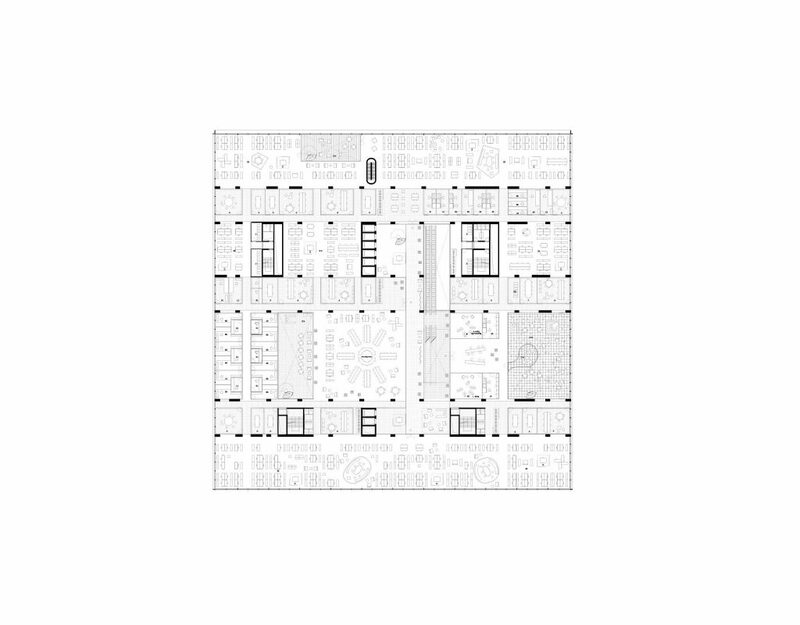 These spaces could be considered more ‘classical’ yet convey a radically contemporary materiality. 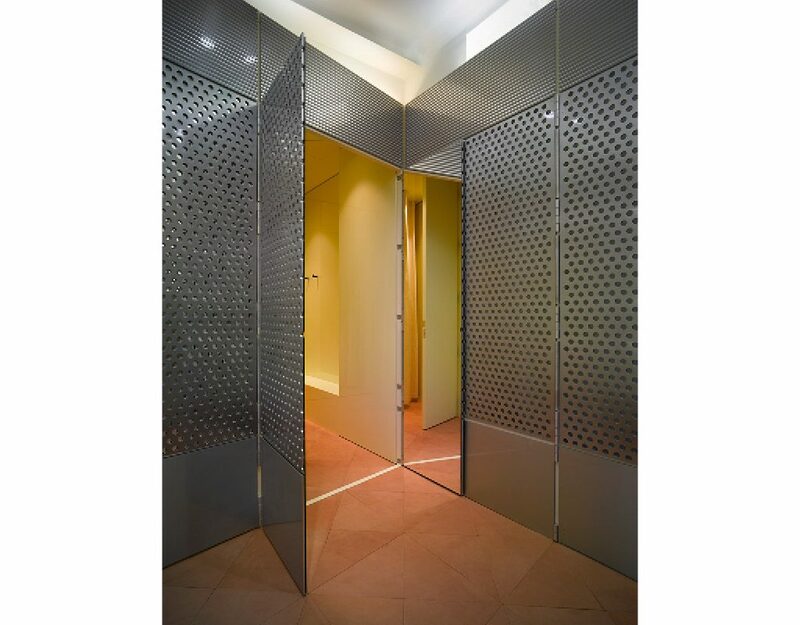 If we keep Loos’s adage ‘ how to dress well’ in mind, we can only be convinced it is exactly the dichotomy of the most intimate and most exhibitionist of interventions that is able to translate this most curious of relationships between fashion and space into architecture. 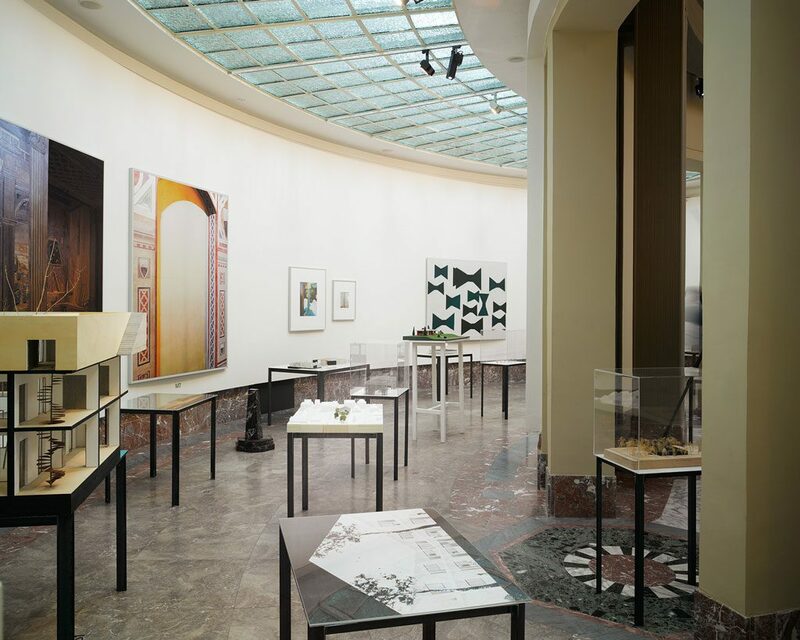 OFFICE’s retrospective ‘Everything Architecture’ was organised in the antichambres of the Victor Horta-designed BOZAR arts centre in Brussels, and ran from march 3rd until May 29th 2016. 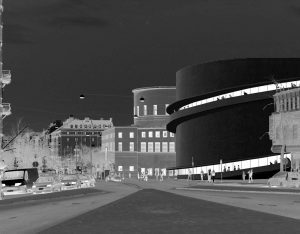 Afterwards it moved to centre d’architecture arc en rêve in Bordeaux, and will eventually also be showed at the AA School in London. 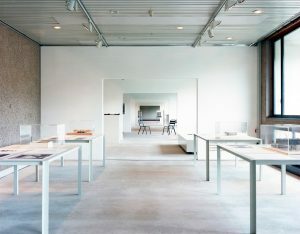 The point of departure for the exhibition is the idea that each of the products of OFFICE is considered a project in itself. 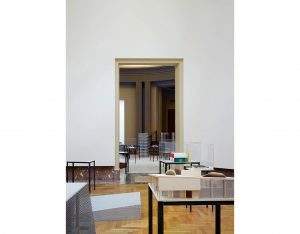 Models, drawings and perspectives are will populate the antechambers of the Centre for Fine Arts as individual objects, together with works of art that are related to the spirit and language of OFFICE. 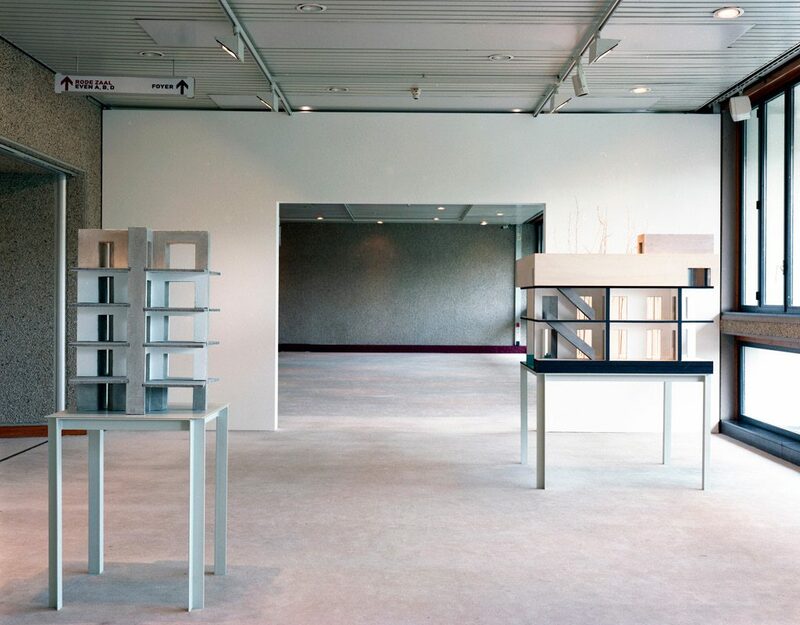 In this field of objects, sculptures are considered as compagnons de route to the architectural production. 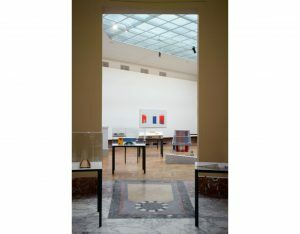 Paintings and photo’s enforce or break the different antechamber perspectives and search for dialogue. The exhibition was accompanied by a limited edition release of ‘OFFICE Kersten Geers David Van Severen — Volume 2’, the first published part of an oeuvre catalogue in the making, which is published/distributed by Walter König. 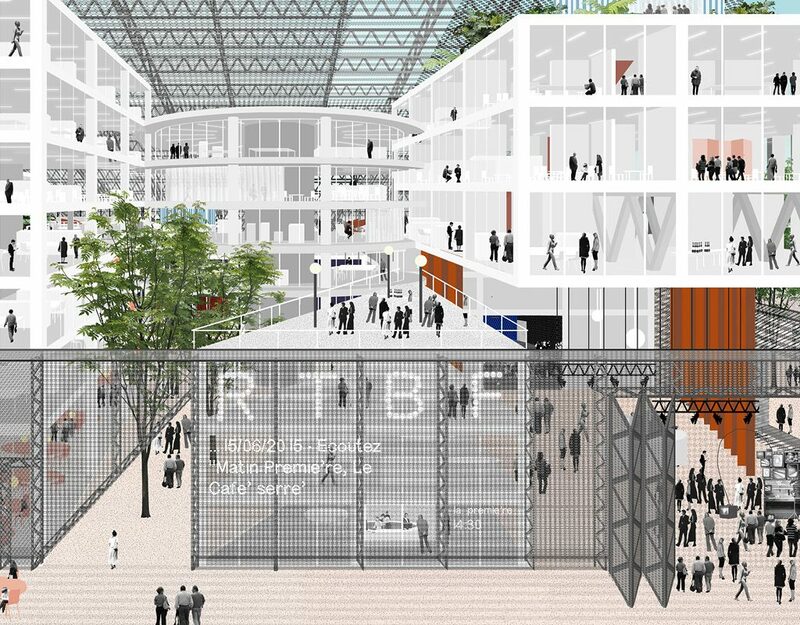 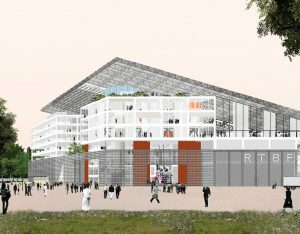 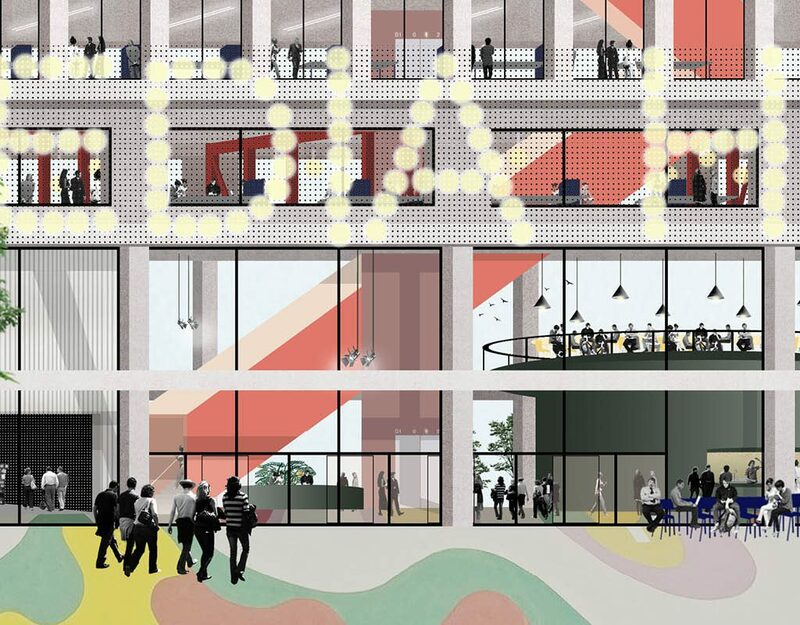 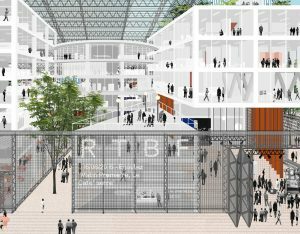 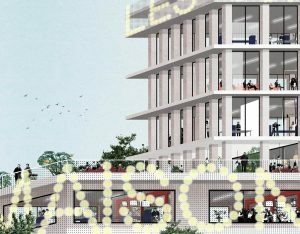 Atelier VRT, the new headquarters of the Dutch-speaking Radio and TV, will be the first step in the development of a new urban area in the East of Brussels. 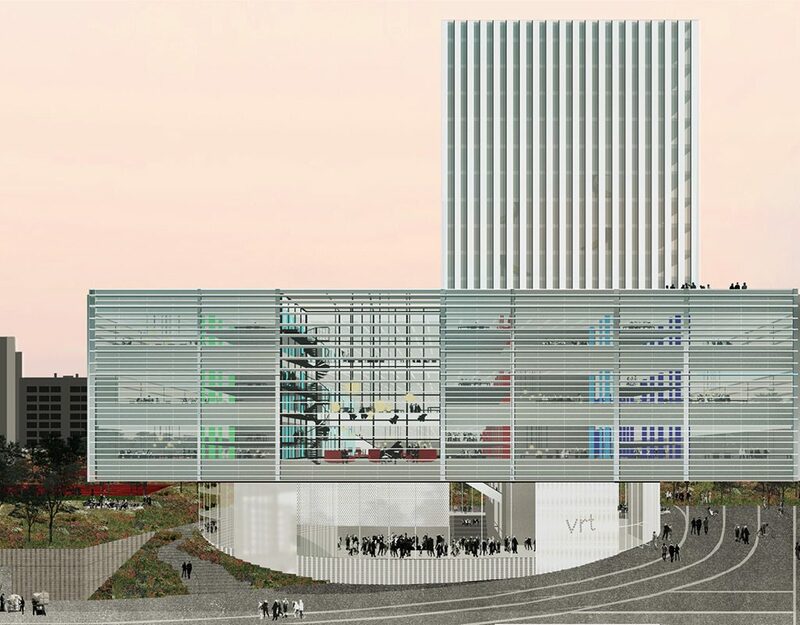 The competitionproject is the response to the complex demand of condensing a program of 55.000 m² of redactions, studios, logistics and administration, and 800 parking spaces, on a plot of just 12.000 m². 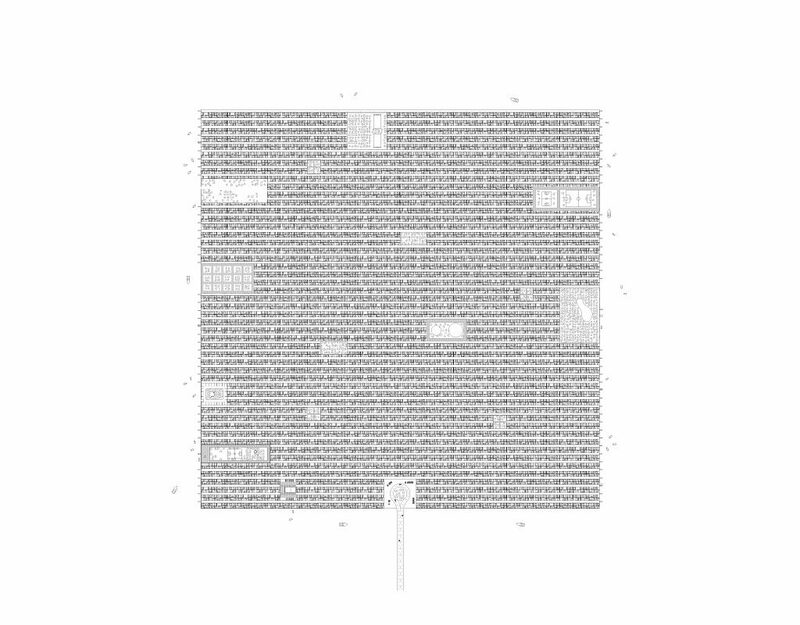 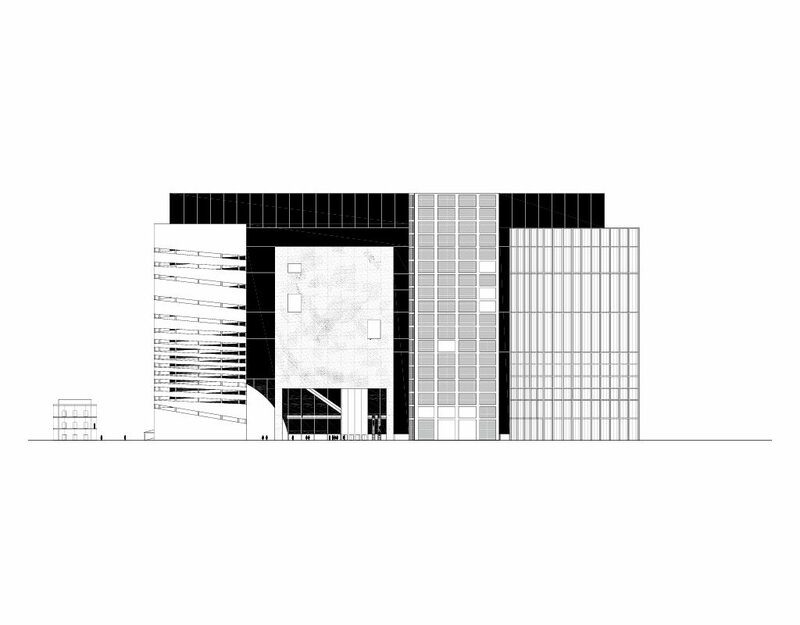 The silhouette is defined by the stacking of three clear volumes, representing three chunks of the program. 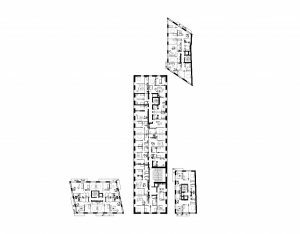 These volumes are developed almost as three separate buildings sharing a continuous grid of vertical shafts and circulations. 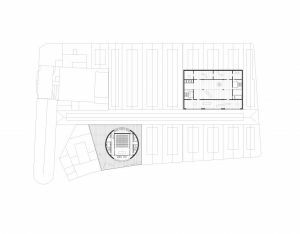 The round base, containing studios and public functions, places itself at the southern corner of the building site. 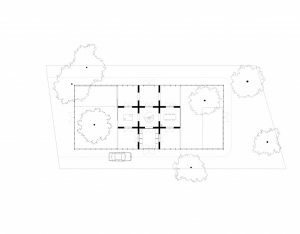 It allows for the landscape to continue around the building and is accessible from all sides. Its interior is developed as a series of strips that contain more or less accessible pieces of program. 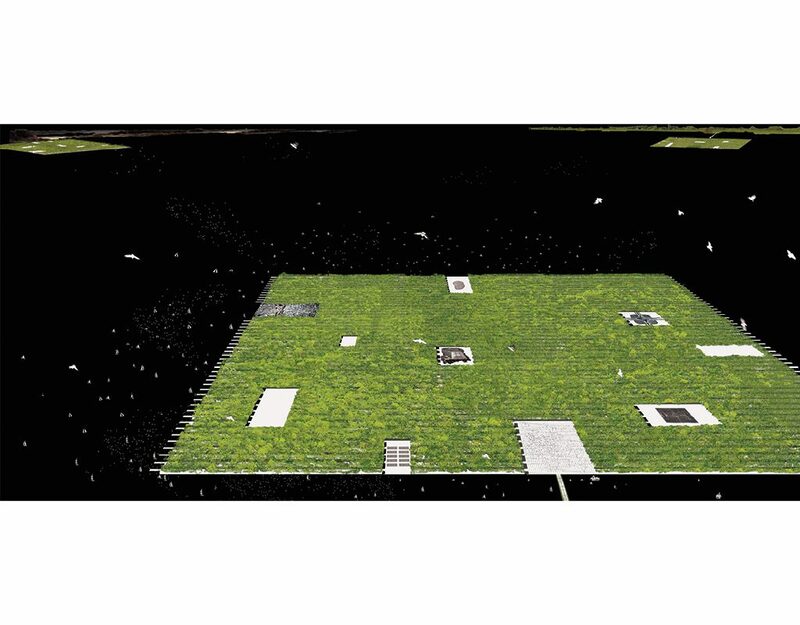 On top of this base sits a square box containing three layers of redactions. This box cantilevers to create sheltered public spaces underneath. 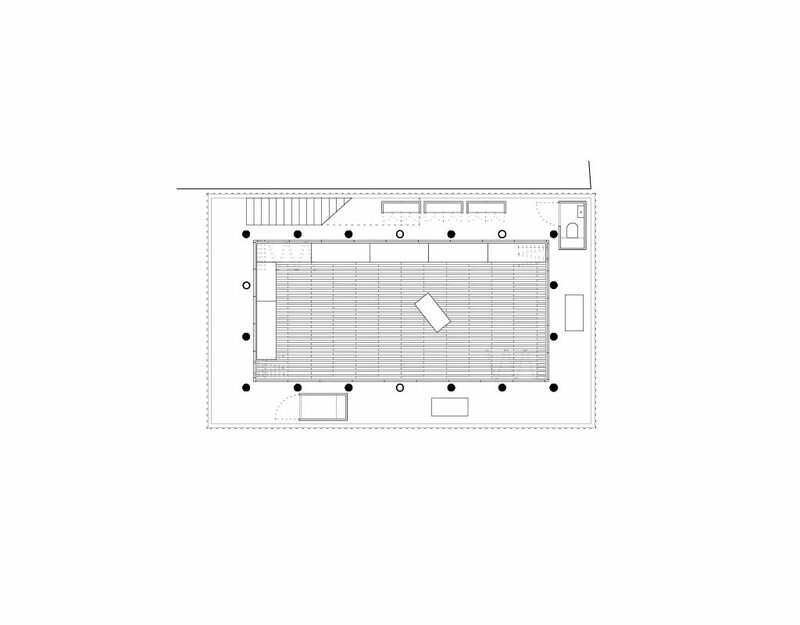 The redaction spaces are open floors, 6m high, allowing for flexible workspaces and interaction between the different redactions. 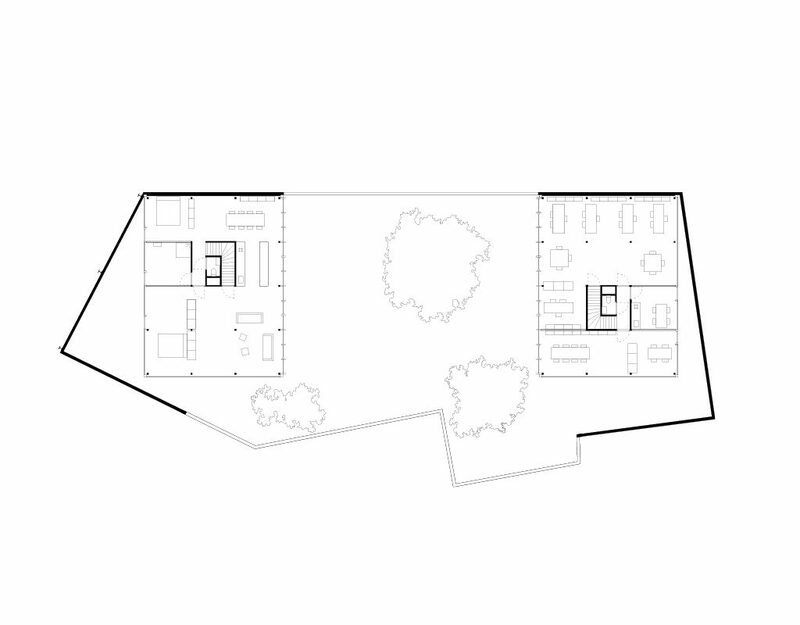 Four atria are cut out of the prismatic volume to provide open spaces of interaction. 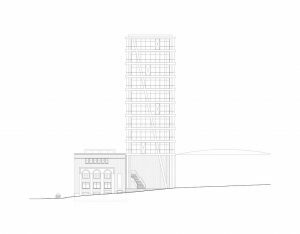 The stacking is crowned by an office tower 40m high containing administrative functions. 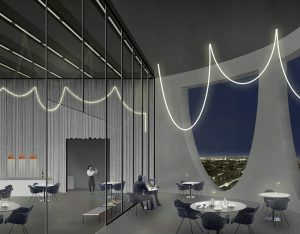 In its base a restaurant validates the roof of the box as a terrace. Underground, an almost machine-like organisation of the logistical spaces make it possible for the building to function. 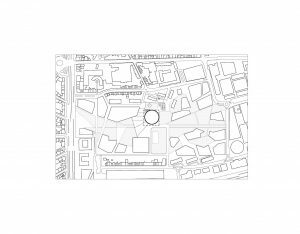 Circle, square and tower are oriented to structure the development of its future context, as the surrounding park and development will take a long time to fully materialise. 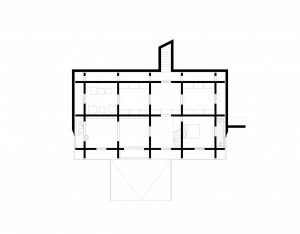 The building had to be conceived as a solitary object that creates its own context. 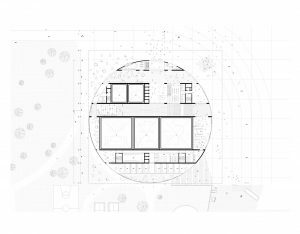 The architecture is both open and specific, providing a framework for the quickly evolving media of today, tomorrow and in twenty years. The new building for RTS (Radio Télévision Suisse) is positioned in the heart of the double campus of EPFL and UNIL. 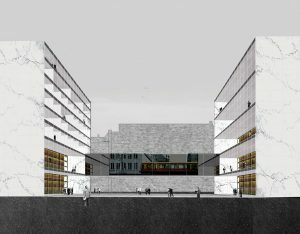 It will function as a ‘hinge’ between the two campuses, as well as between fields of education and research, and between classical broadcasting and contemporary media. The project consists of four separate volumes, supporting a disc-like volume suspended 7 meters above ground. 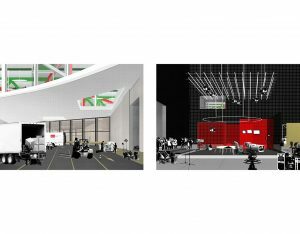 The volumes include a large television studio, a concert hall, a media library and the RTS’s administration. 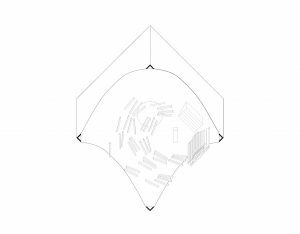 The suspended volume, the ‘Champ’, contains the different redactions and broadcast studios, organised as a ‘field’ of landscape offices. On the ground floor, a glass wall connecting the 4 supporting volumes create a public foyer, connecting the different entrances of the RTS. 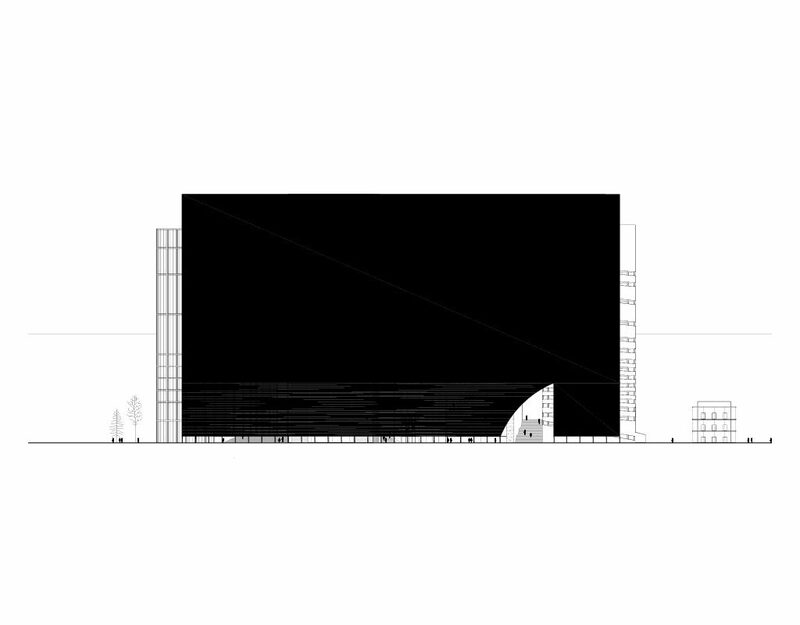 The redactions, heart of the production of RTS, are lighted from above by the industrial-like shed roof. 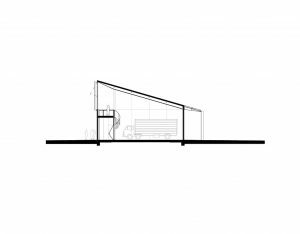 The protruding volumes, the major supporting beams, as well as a system of patio’s organise its contents, creating more or less separate zones within the field. 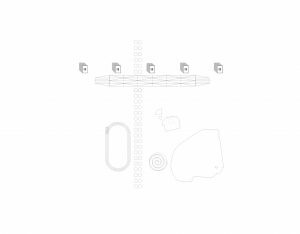 The field is a ‘chipboard’, allowing for various and unlimited ways of collaboration between the different redactions, endlessly adaptable to the ever-changing world of media. 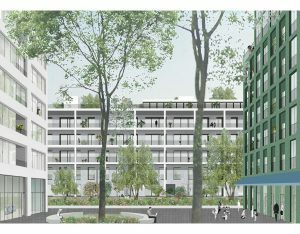 OFFICE, in collaboration with NP2F, has won the restricted competition for renovation and transformation of the Caserne de Reuilly in Paris (lot C). 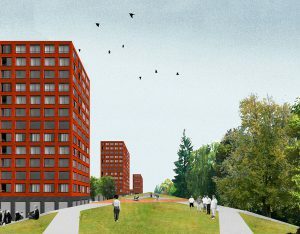 The project consists of a mix of program with a strong focus on housing. 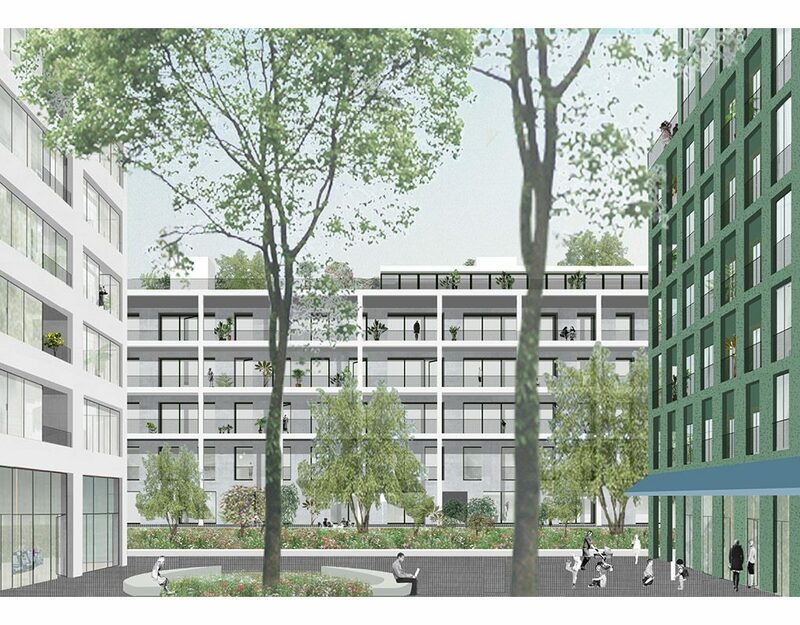 The former military site will house 600 units (40.000 m²) and the central space transformed into a public garden. 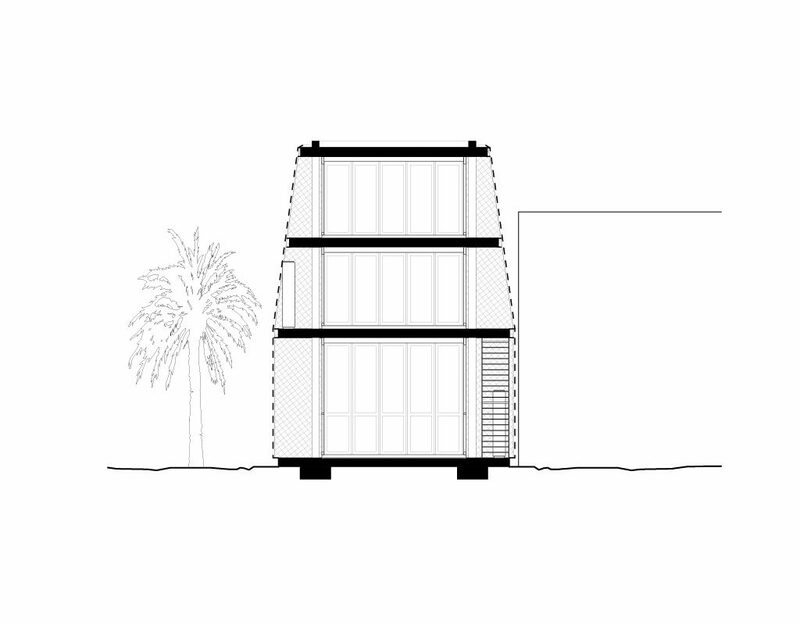 Today the existing architecture creates an unreachable urban “machine”, protected by a wall. 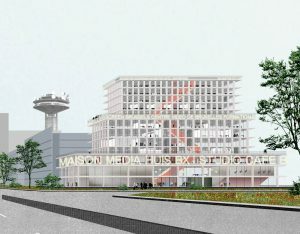 Now dedicated to welcome Parisians, the caserne must become a porous place in the city. 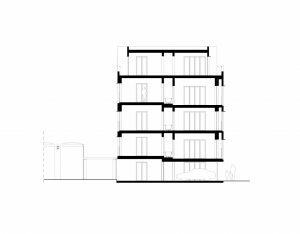 The project developed by NP2F and OFFICE proposes the creation of different volumes, independent of the existing building. 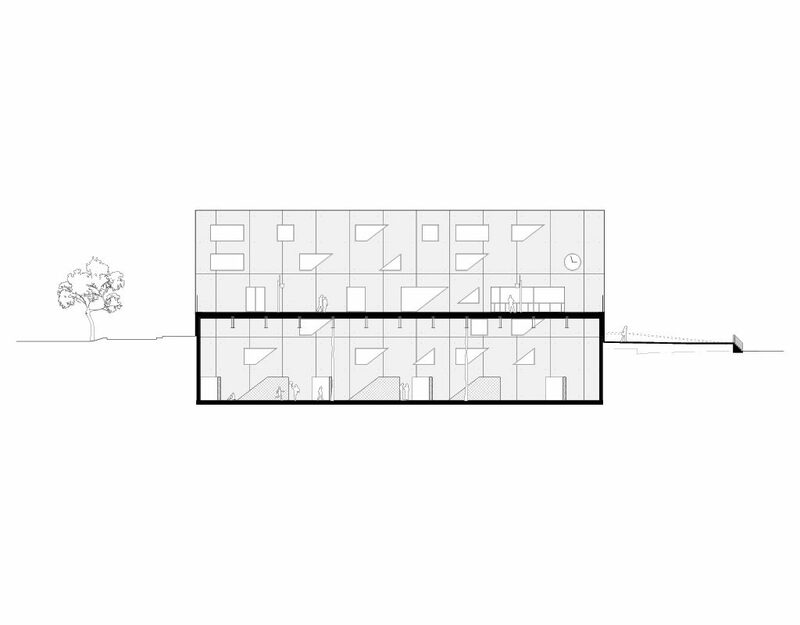 Detached from each other, they express a relative dignity and provide a strong common vision. 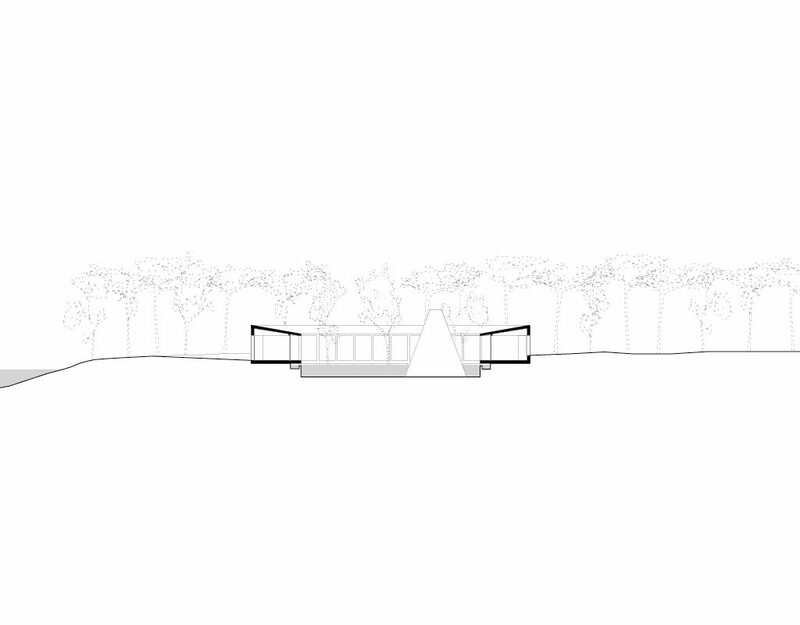 These new constructions slip gently in the existing voids, remaining at close distance, and thus allow visual connection from the city ​​towards the garden. 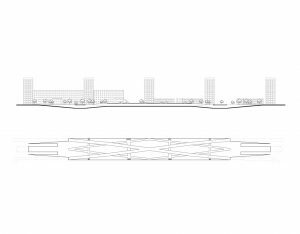 The project forms a complex piece of city where every building has its own characteristics while sharing a common language. 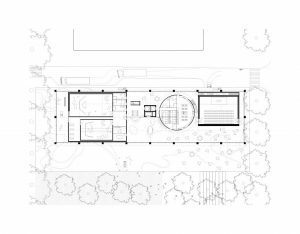 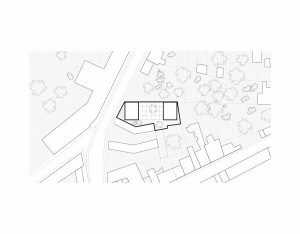 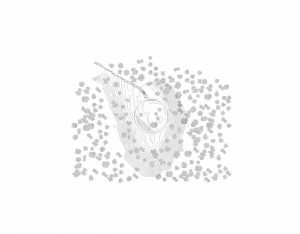 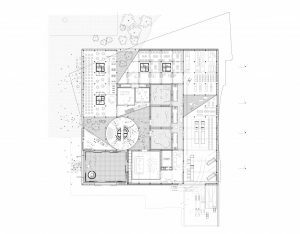 The different volumes therefore are engage in a dialogue with each other, the garden and the city that surround them and provide a strong transition between public space and private space. 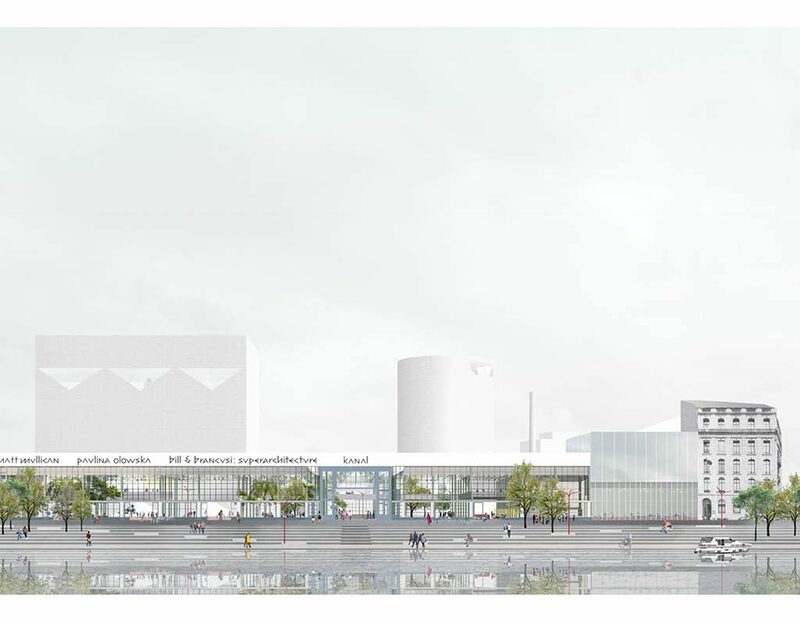 Visible from the street the caserne will now be a breathing space in the heart of the city. 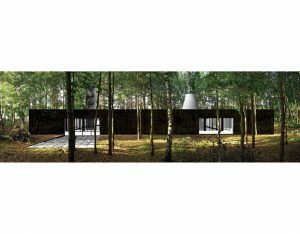 The new Arvo Pärt Centre, dedicated to the Estonian composer of classical music, is located in a marvellous place near Kellasalu. 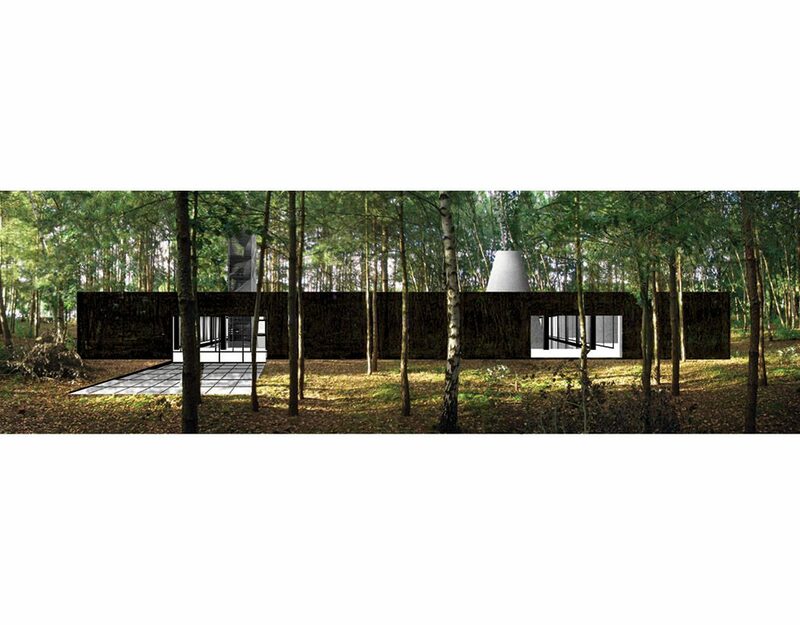 This elegant, dense stretch of forest is a datum where the silence of nature presents itself to one who engages with it. 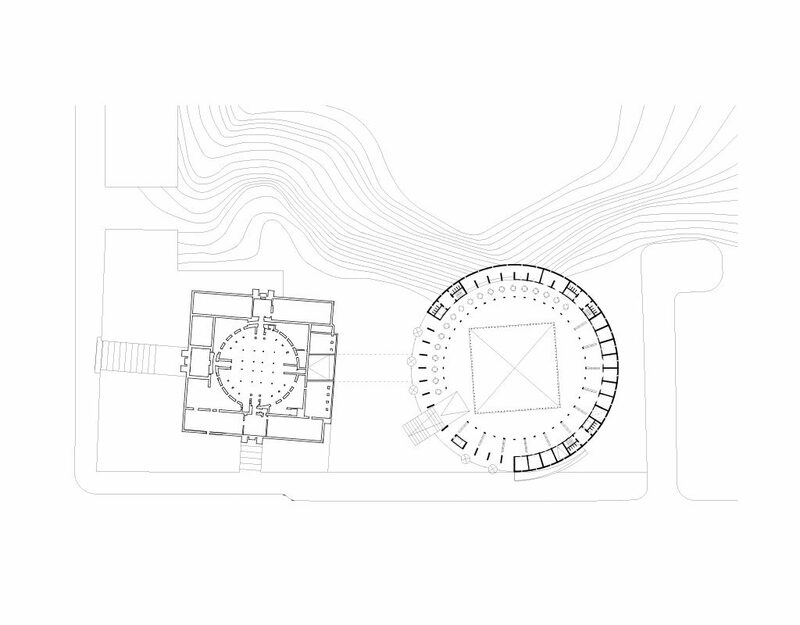 The centre brings in a set of harmonies related to the site. Symmetrical and loose, it presents a compact way to inhabit this beautiful stretch of nature. 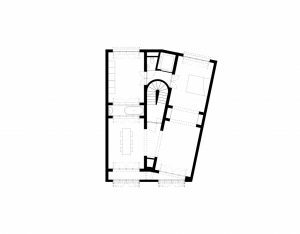 The Centre is conceived as a set of rooms of different sizes that are developed in a harmonic system of related measurements. 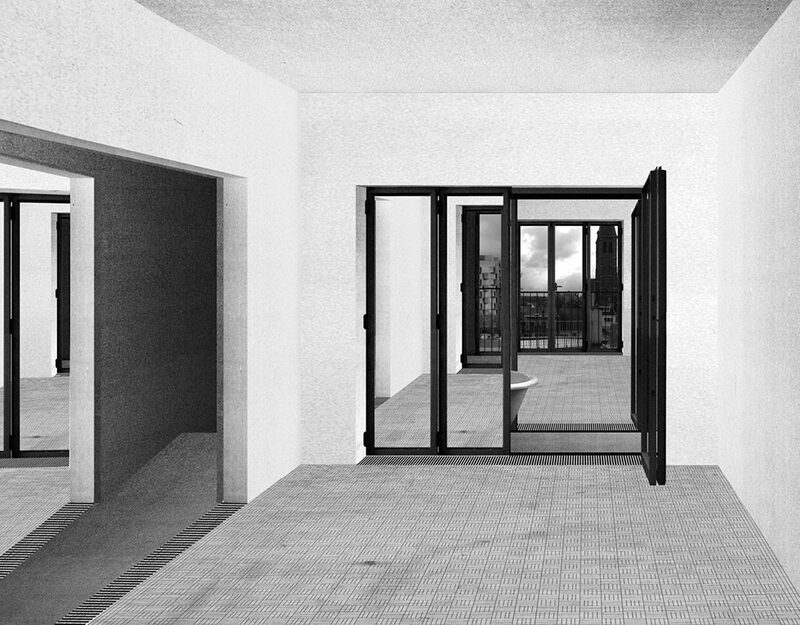 The rooms have increasing length, width and height. 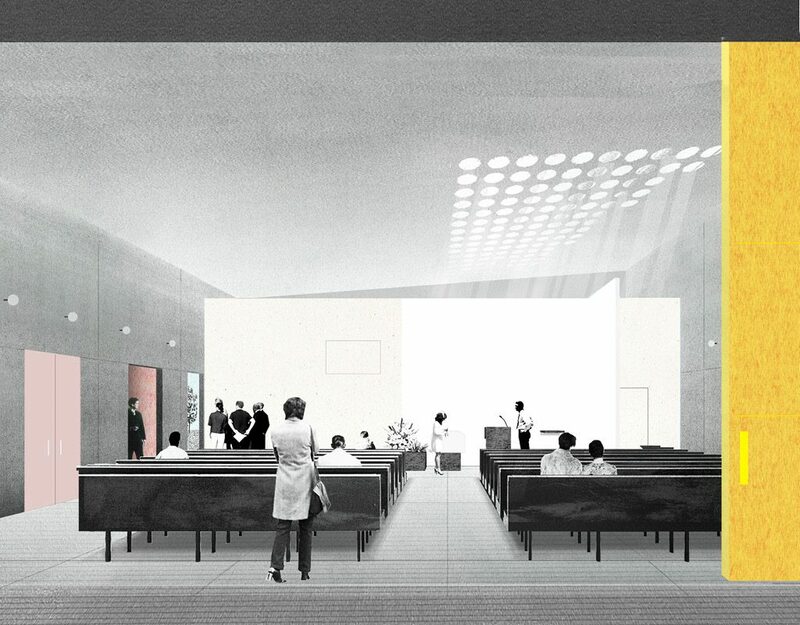 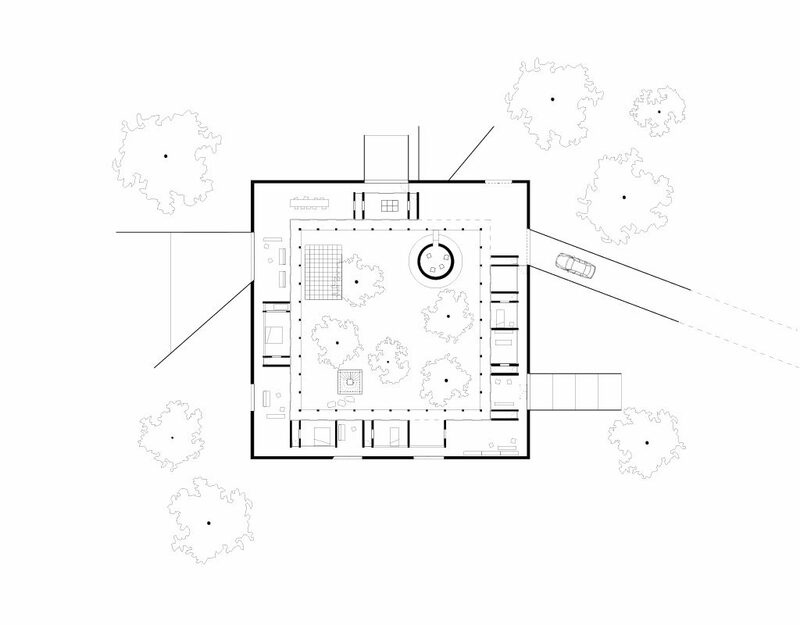 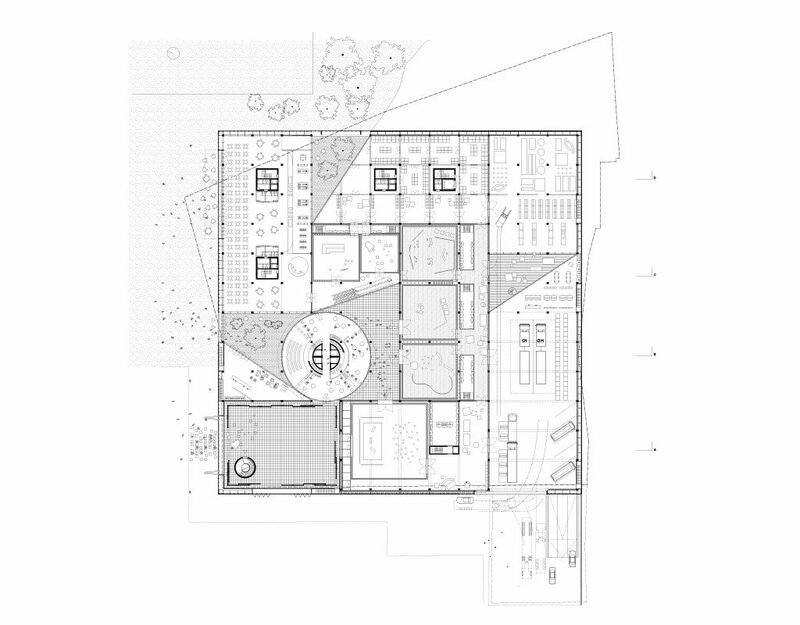 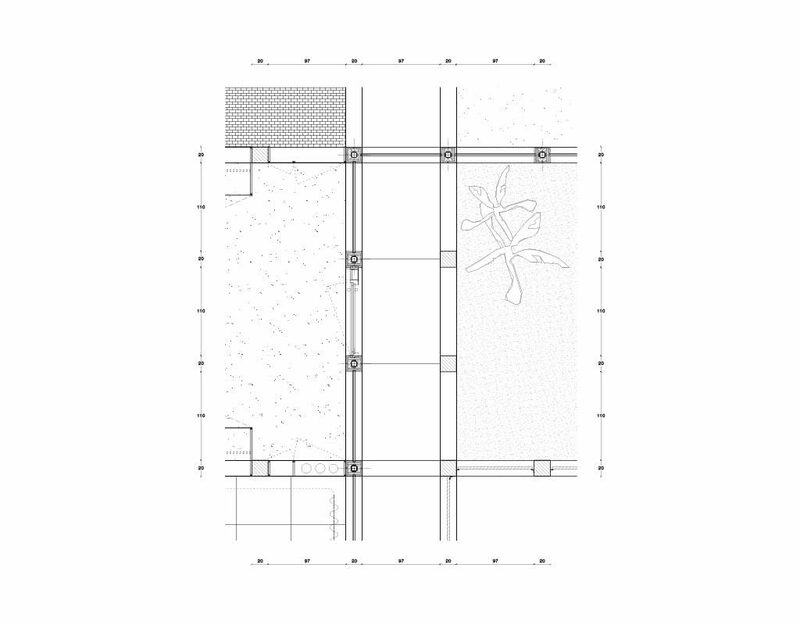 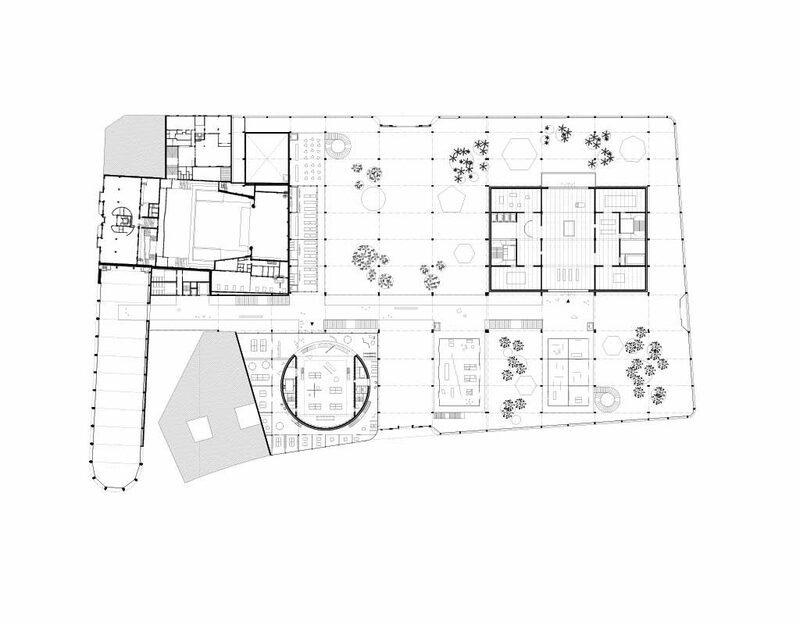 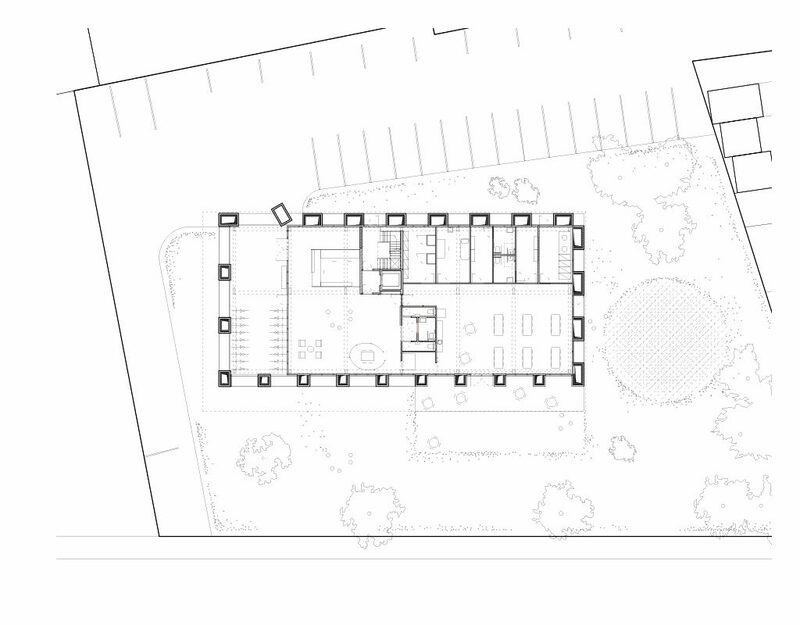 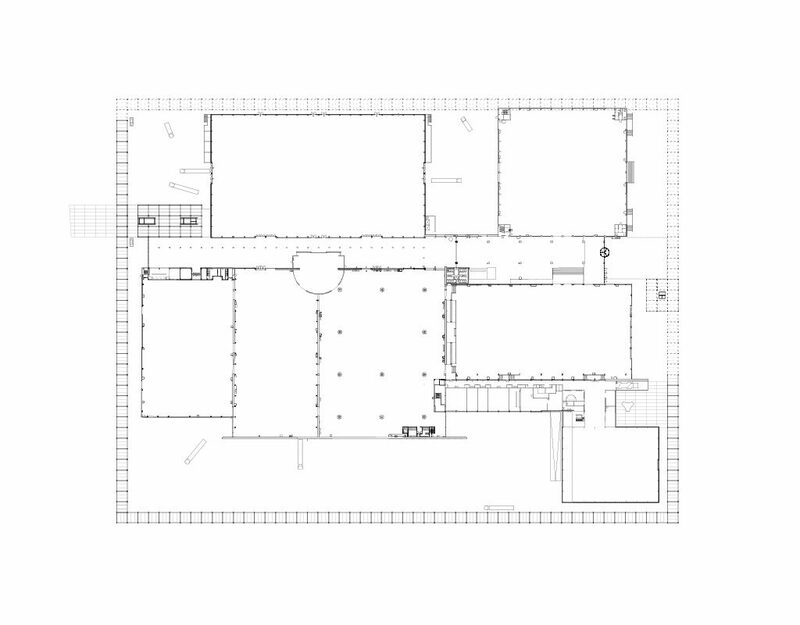 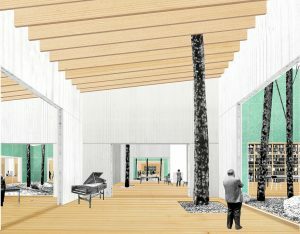 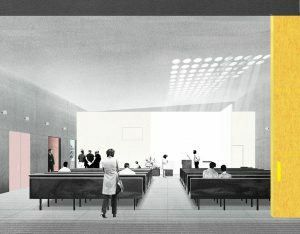 The growing and developing plan thus creates a field of closely connected spaces, each with a unique relationship to the surrounding nature and the other rooms close by. 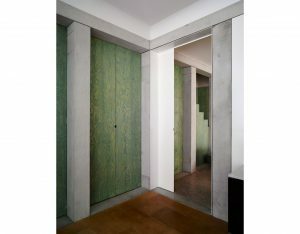 The enclosing wooden walls interrelate with each other and the landscape through a classic system of enfilade openings. On top of the walls a glass surface makes the roof, it relates each of the rooms directly to the sky under the trees. 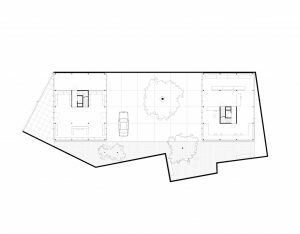 In a framework this ethereal, it is important to measure tenderness and warmth and for that reason the layers between roof and room – beams, velum or also simply closed – creates intimate spaces where one can regress from the direct impact of nature and sky. The crematorium is an important public building. 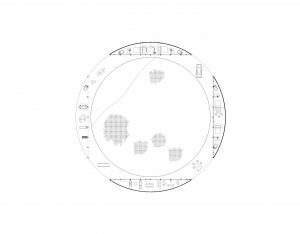 It has however an ambiguous relationship with self expression, torn between its own technical content and its ceremonial character. 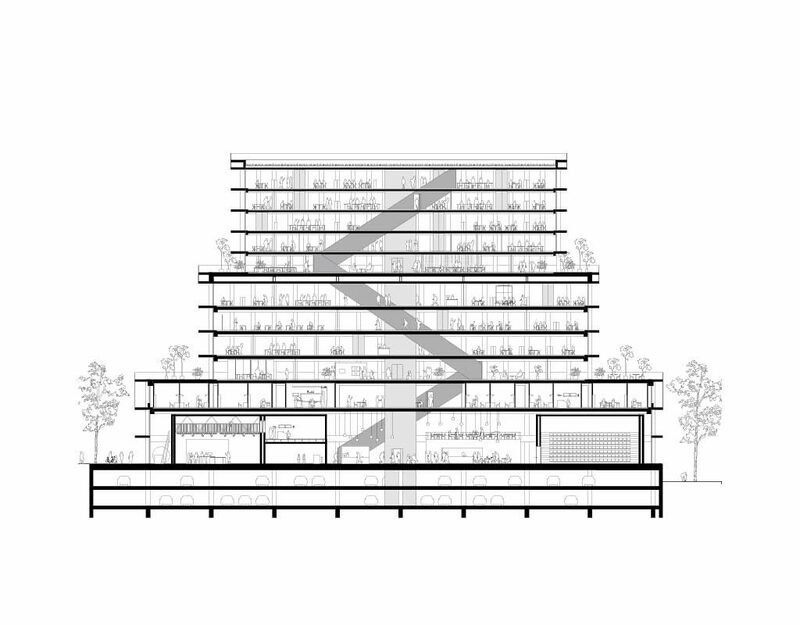 To overcome this we designed the building as a big inclined table of which the roof is the protagonist. 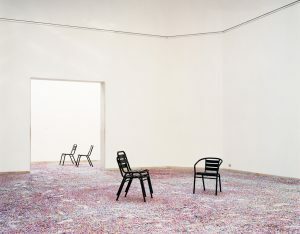 As a ‘nature morte’ developed together with the artist Richard Venlet it is intended to communicate its particular public content. 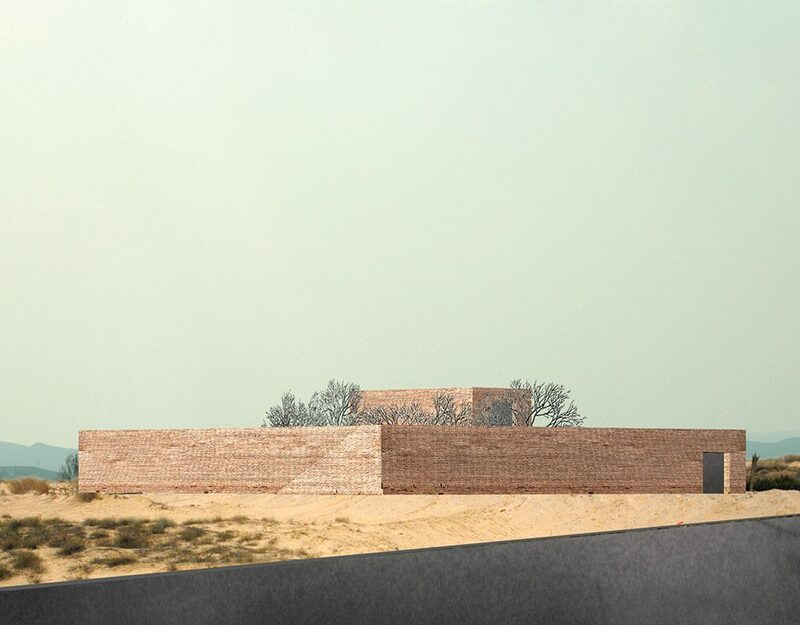 The big roof itself is placed within a carefully orchestrated landscape designed by Bureau Bas Smets, a set of new landscape elements populating a site in the polders around the coastal city of Ostend. Under the inclined roof one finds a mix of public, administrative and technical functions in a single story building. The roof is dotted by roof lights and abstract shapes that answer both technical and symbolical requirements. 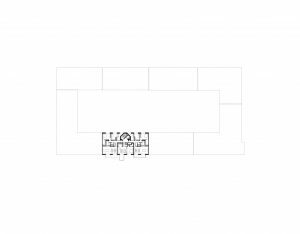 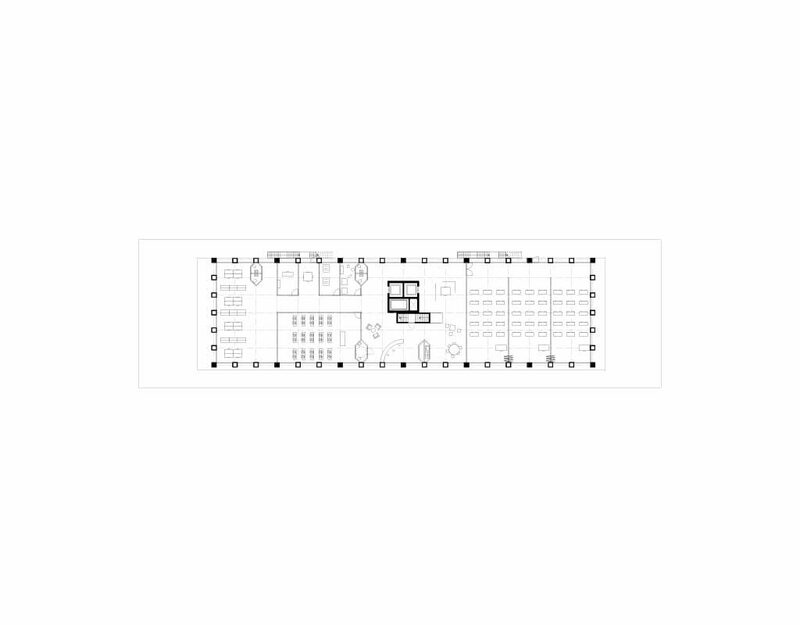 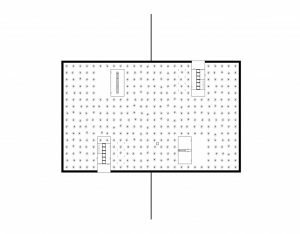 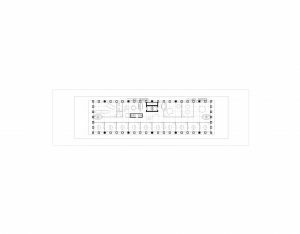 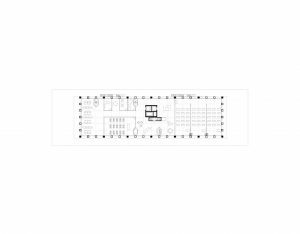 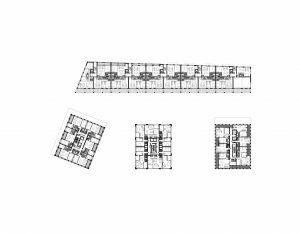 Its spaces are organised in lateral strips of various widths, containing reception areas, waiting rooms and the centrally located ceremonial halls, alternated by thin bands of auxiliary functions and passages. 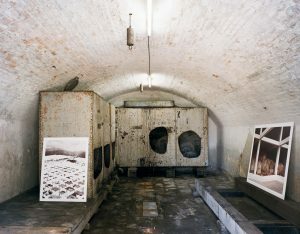 The cremators are located under the highest point of the building. The relation of the spaces to the surrounding landscape is indirect, and mediated through a double facade of glass and perforated metal panels, allowing for a discrete and serene atmosphere in the halls. 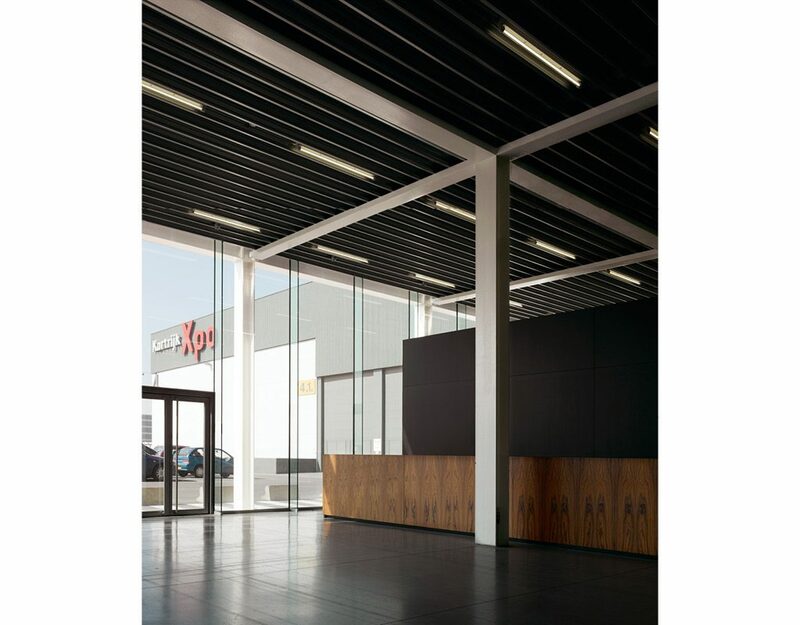 The twist in direction between the programmatic strips and that of the roof surfaces creates a continuous set of triangular spaces of varying height, which function as a covered arcade around the building. 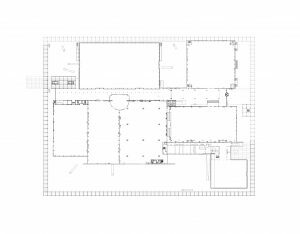 This project is the conversion of a worn out building into a contemporary and durable office space, without demolishing its skeleton. 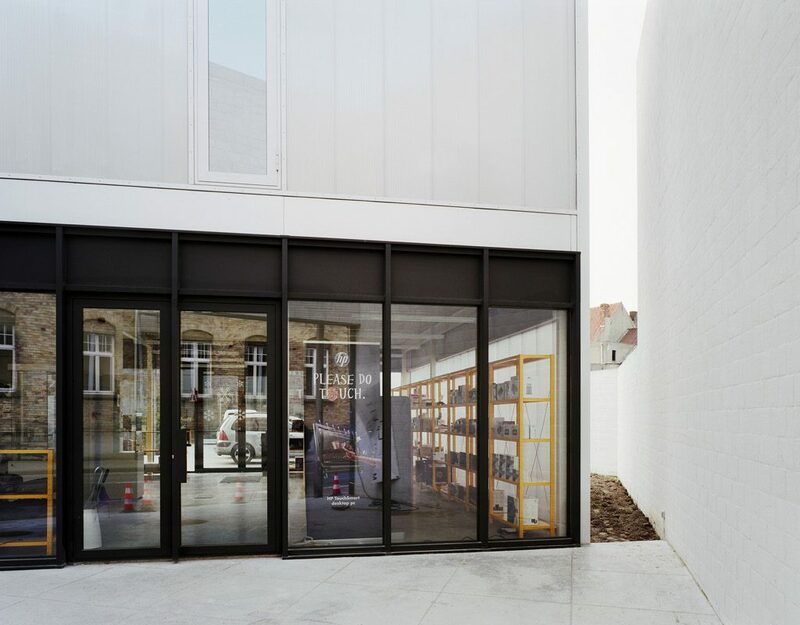 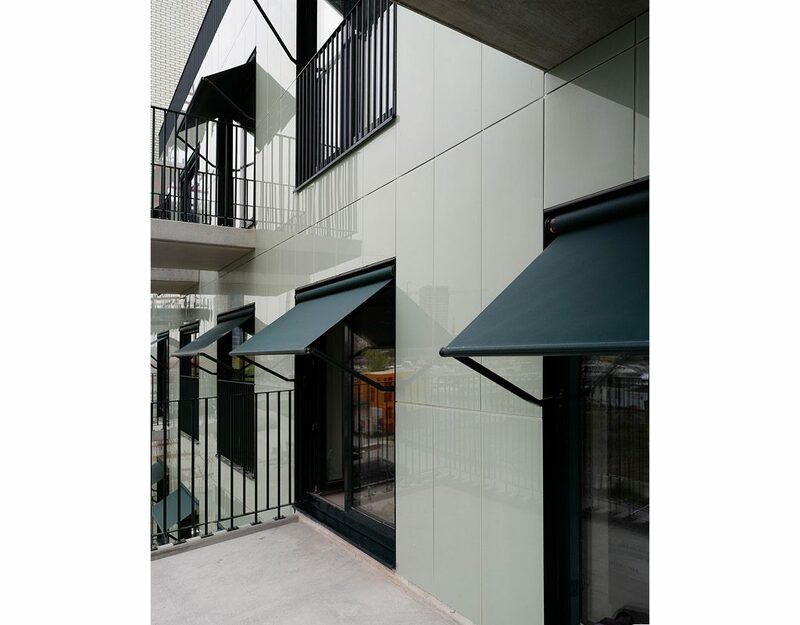 By introducing an independent facade around the stripped existing building, that serves both as an architectural element and a technical tool, we contain and control the distribution of technical installations and natural light and give the building a new urban presence. The new facade consists of a sequence of hollow concrete columns of various size, which contain the technical ducts and machinery characteristic for a contemporary ecological project. 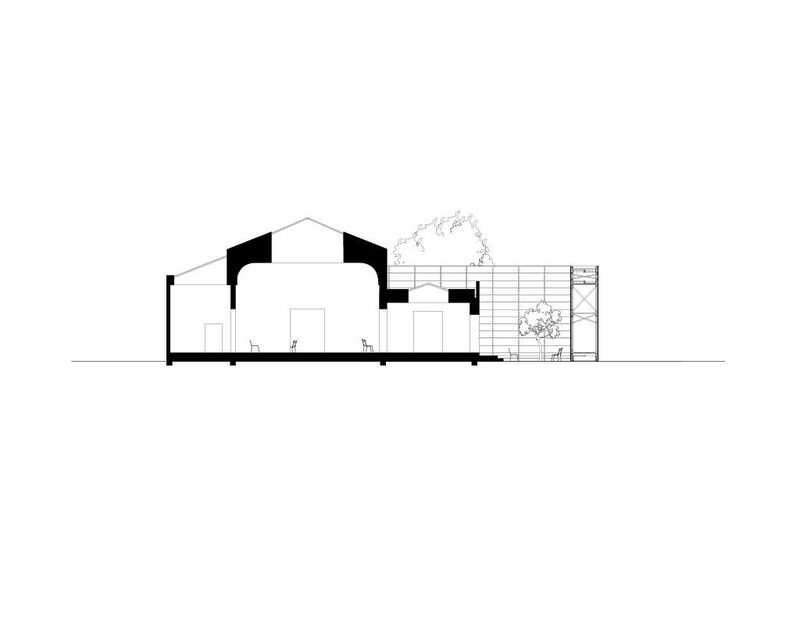 As a structure it is independent from the existing building. 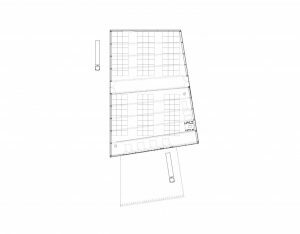 It supports a series of terrace slabs, whose depth vary according to the orientation, and that function as solar protection. 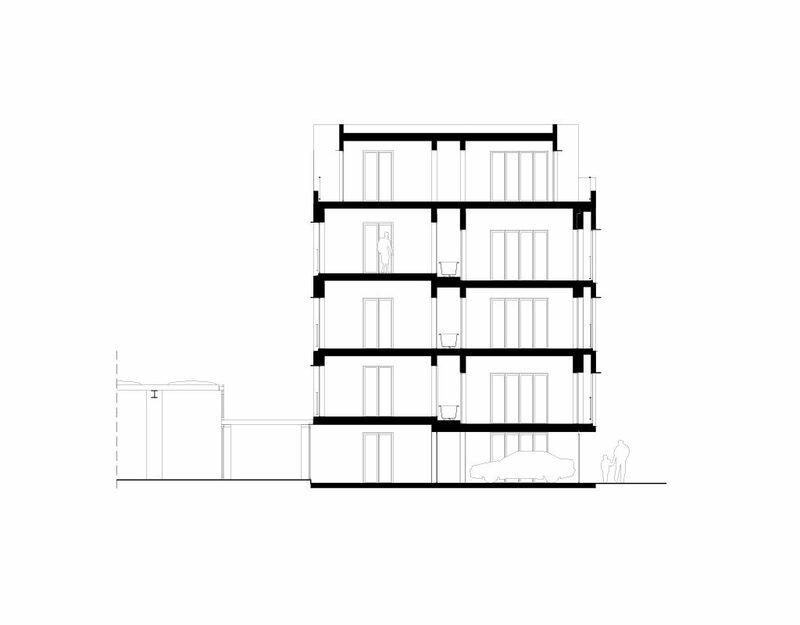 The existing core of the building is maintained and optimised to include a stair and an elevator. 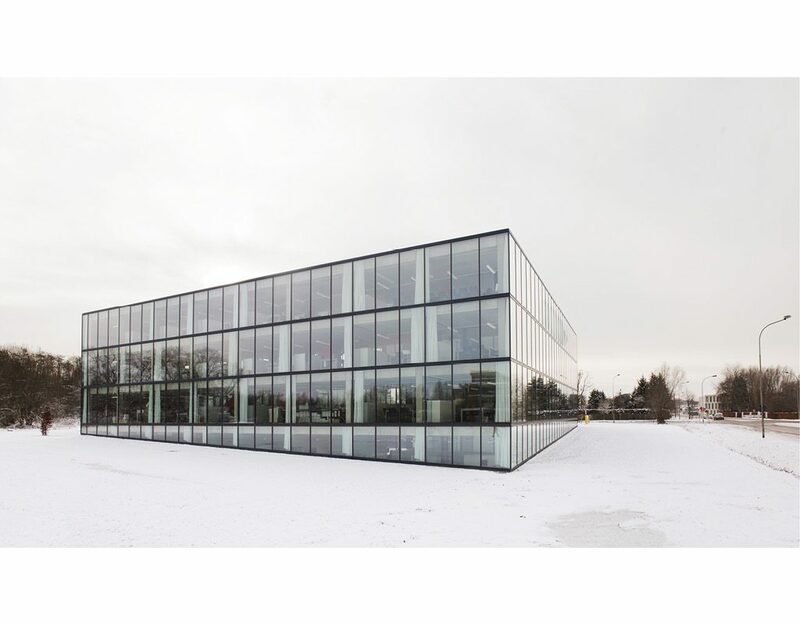 A second core for sanitary installations is added behind the opposite facade, thus creating two similar office spaces per building level and providing a flexible frame for possible future programmatic infills. 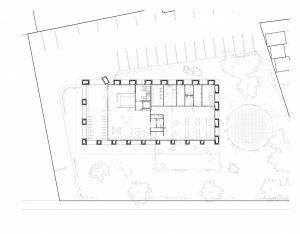 Around the building we reduced the former parking by a new organisation in the back of the lot, making room for a public garden and a lunch terrace at the street side. 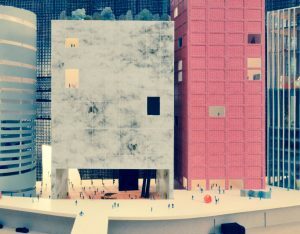 The inertia of the contemporary center, in opposition to the ‘flavor of the month’, is perhaps its major asset. 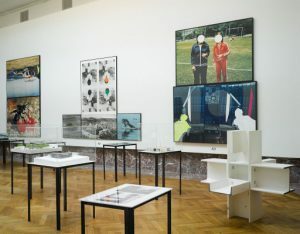 For that reason our center for Contemporary Art in Moscow does not celebrate the spectacular of Now, a Now that will always be a recent past – accumulating and showing takes time – but rather tries to create conditions for exposing and archiving that are perfect tools for a metropolitan experience of art: for the fast and the slow, the consistent and the fragmented. 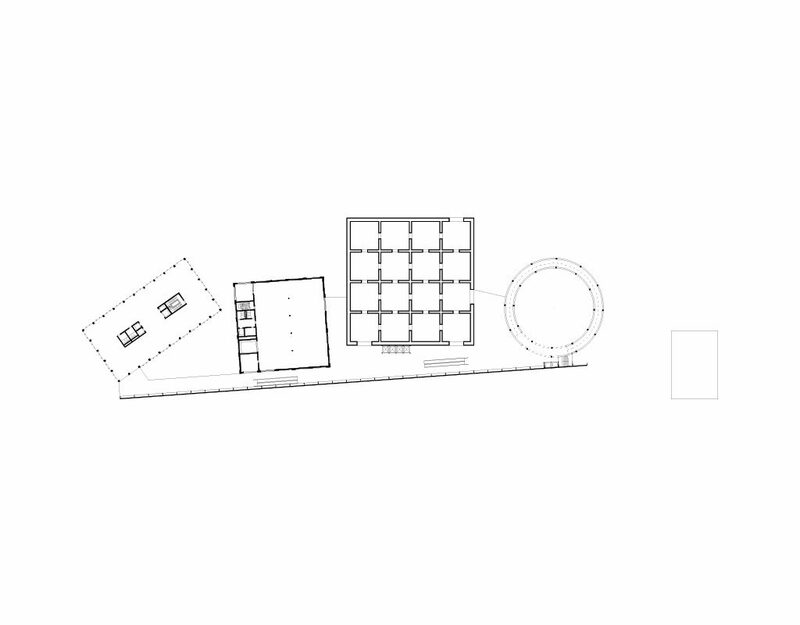 Based on this point of view, our center for contemporary art is seen as a machine for delay. It serves an institution in transition, on its way to become a metropolitan art center. 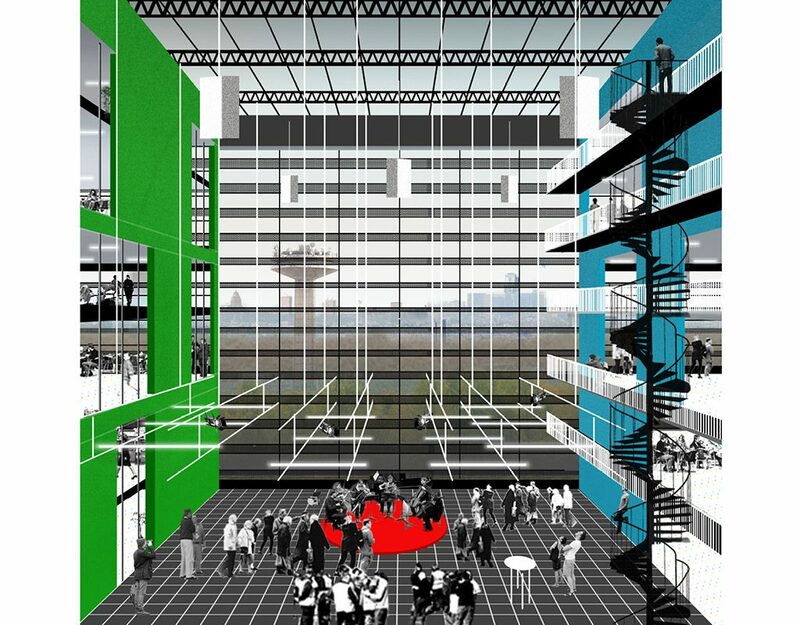 The NCCA needs to develop a twofold discursivity; with the city and with the public. 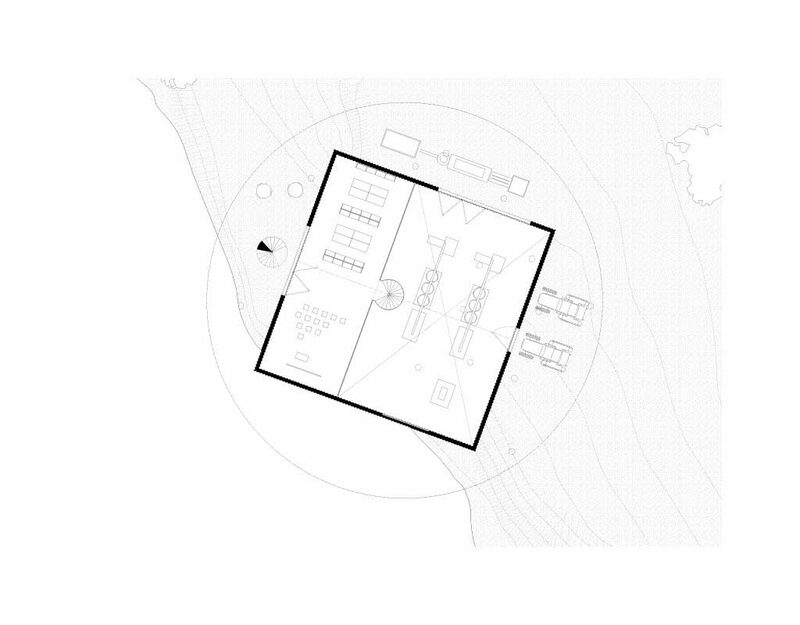 The spatial set up of the museum can enhance the ways how the museum can perform this discursivity. 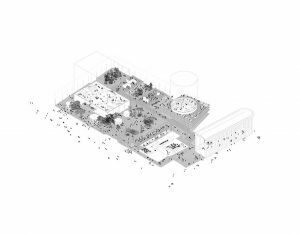 We see it as a place where city, collection and public can be interwoven; a shared space where artists and public can be active participants and not just passive exposants or consumers. 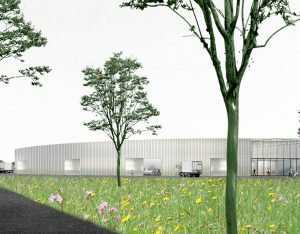 This building, commissioned by the Provincial Development Company of West-Flanders, will provide rentable working and production spaces for four young companies in various fields of work. 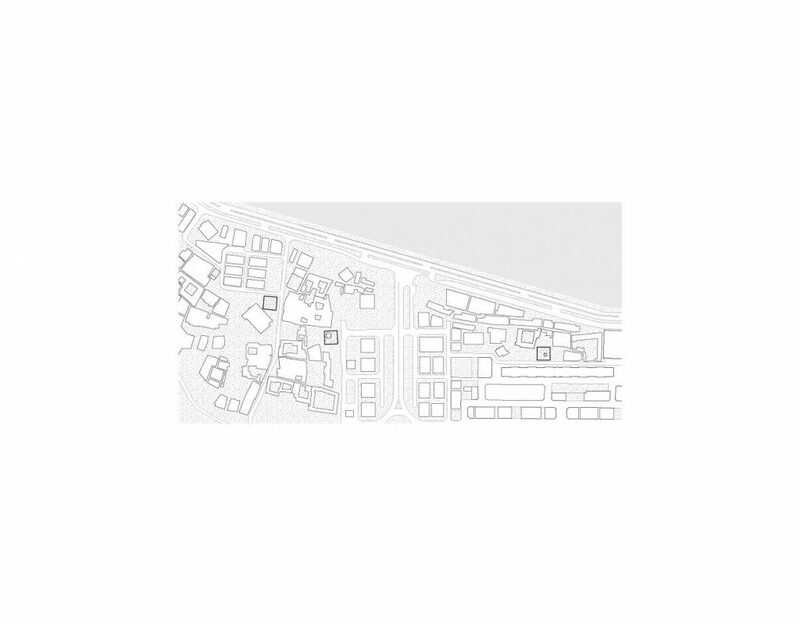 It is the only common building of the allotment of private companies and thus needs to express that position. 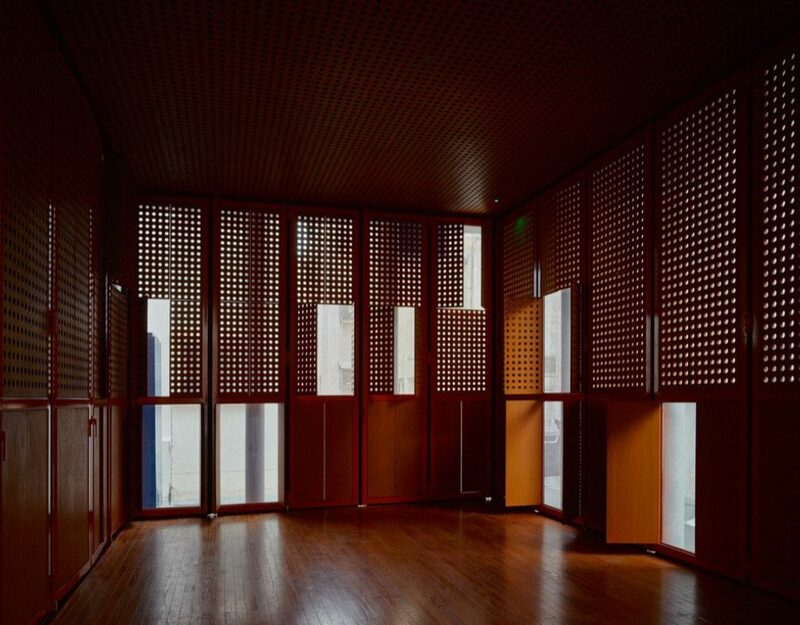 For that reason the building is at once very ‘box-like’ and archetypical but also elegant and refined, to set an example of economy of means and public engagement. 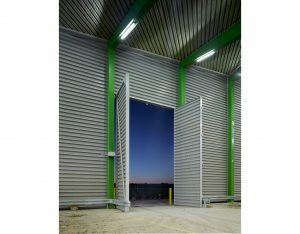 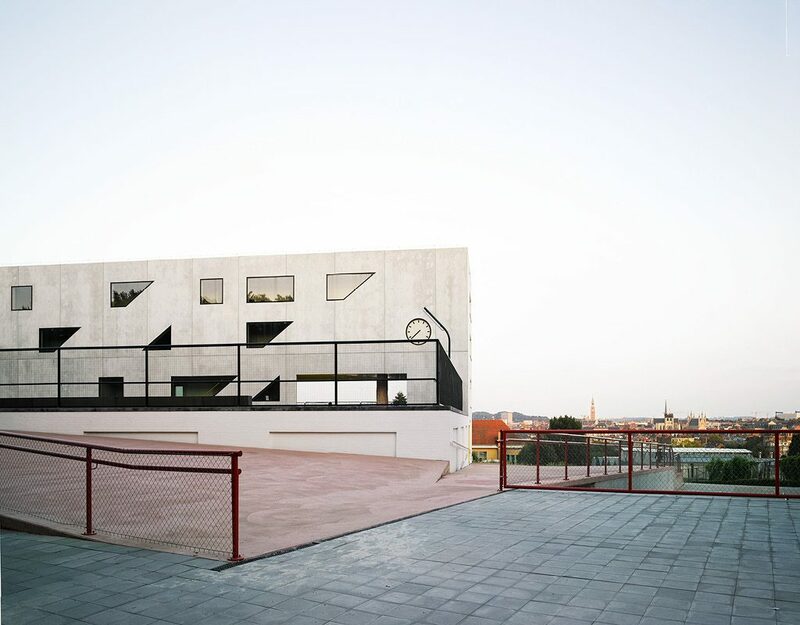 The project is a simple and spartan box, demonstrating a refined use of standard industrial building elements, such as prefabricated concrete walls, aluminium cladding and cupboard-like office spaces. 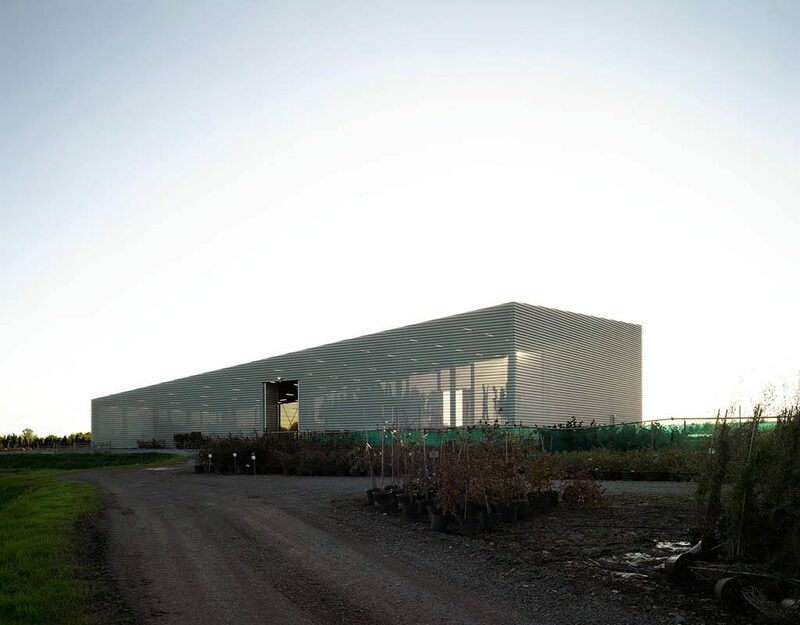 A continuous north-oriented glasshouse facade brings light until deep into the ateliers, mirroring the open backside of the building. 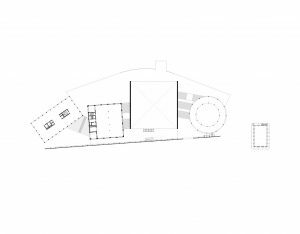 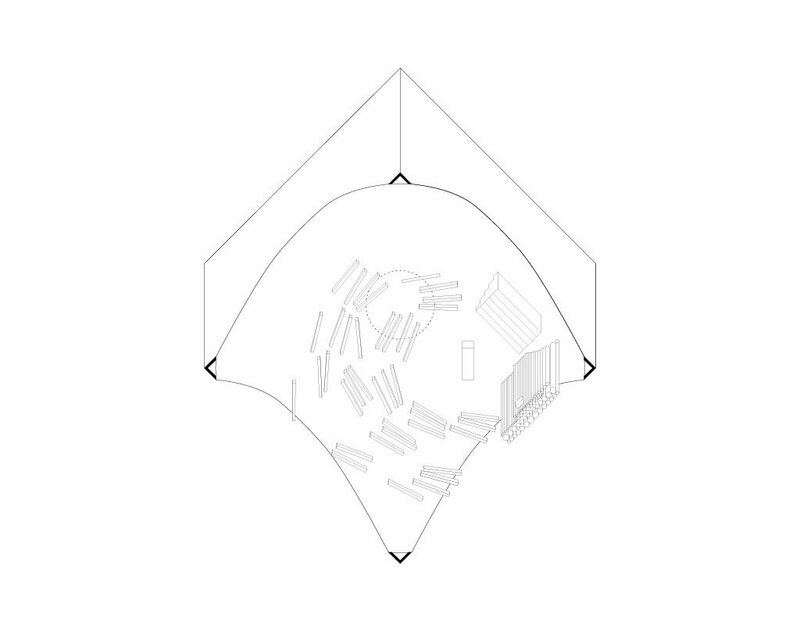 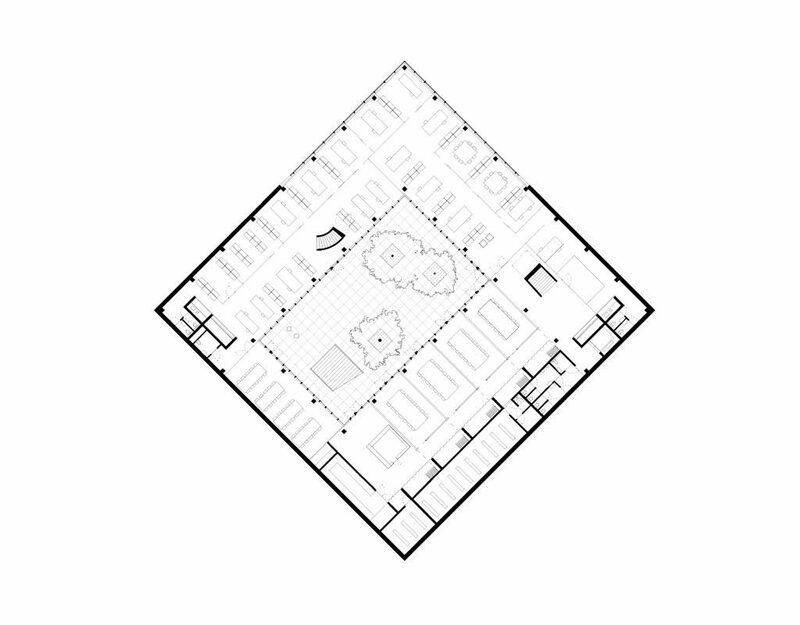 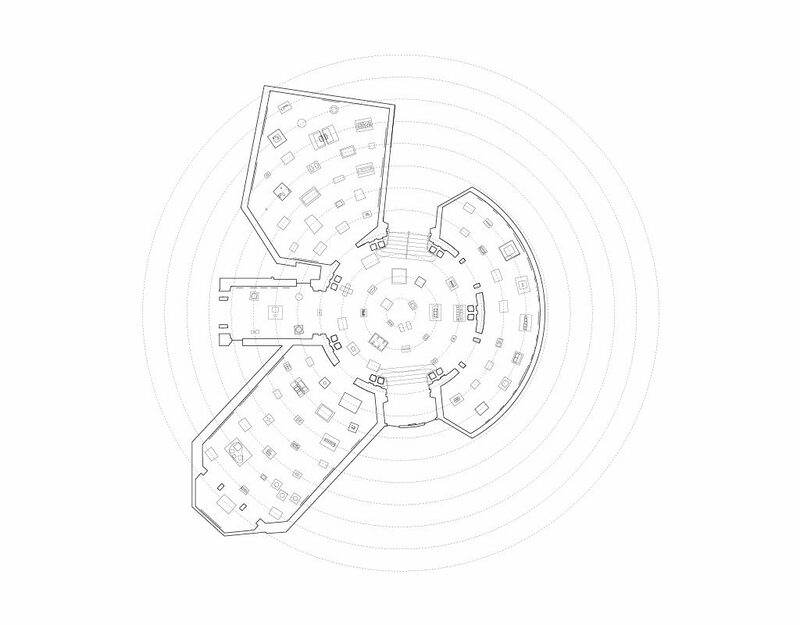 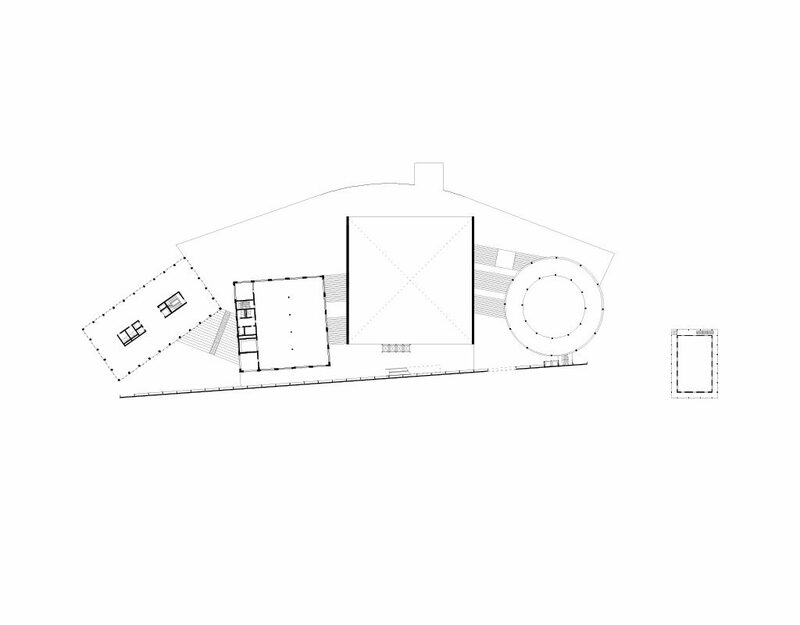 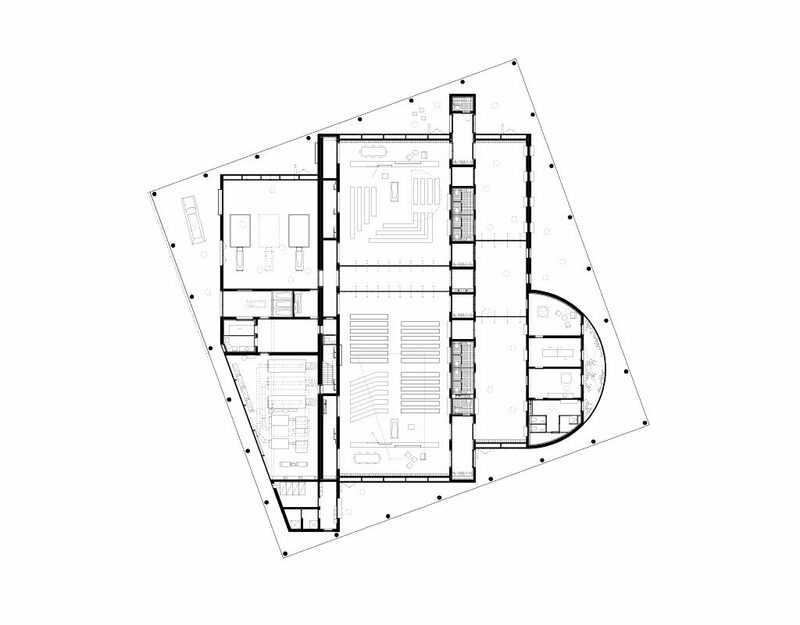 The four spaces are flanked by a communal meeting room, whose triangular form distorts the simple geometry of the building, and plays a perspective game with visitors arriving on its parking lot. 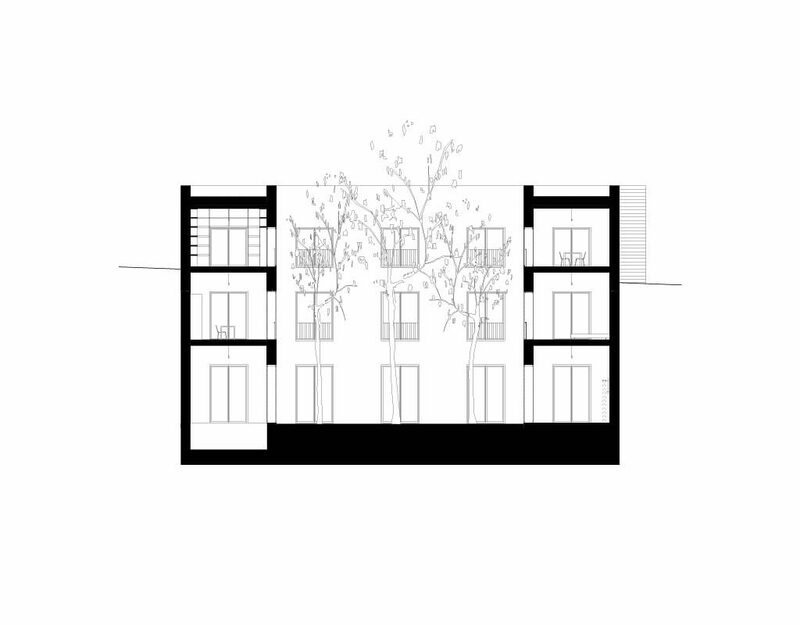 The overhanging roof creates a set of protected parking lots in the back for the renters, thus freeing the public front facade of the obligatory cars, and maximising space for manoeuvres at the front gates. The distorted perimeter of the building is en exercise in box-ness, making an argument for a self-conscious utilitarian architecture. 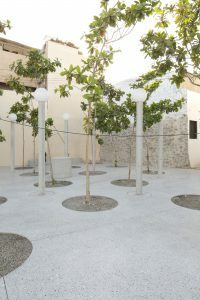 The design for the Bahrain Pearl Path comprises of a route of 18 public squares and a bridge, of which two have been completed. 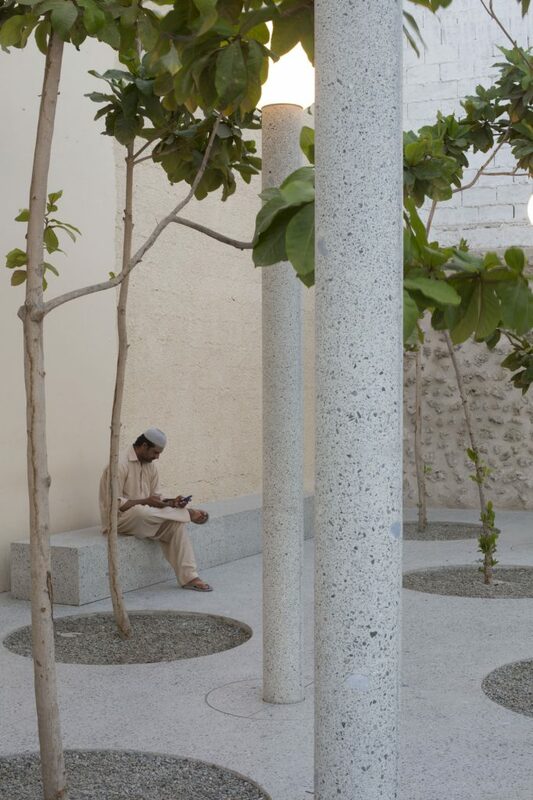 The small-scale public squares, dotted along the Unesco world heritage ‘Pearling Trail’, are finished and furnished in polished concrete and cooled with a piping system. 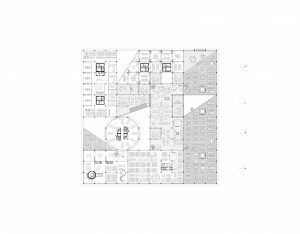 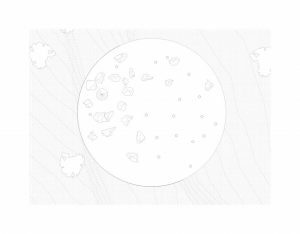 They will provide punctual micro-climates, points of relief and places of interaction for visitors and inhabitants of the former pearl city. 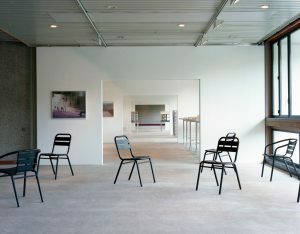 In collaboration with Bureau Bas Smets. 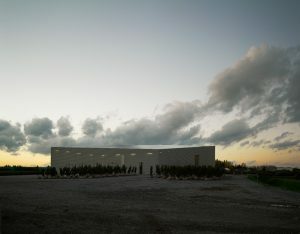 Photos by Roberto Graziani. 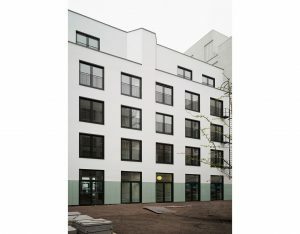 Housing Complex (Cadix) is an apartment building on four levels with 11 units and 2 commercial spaces. 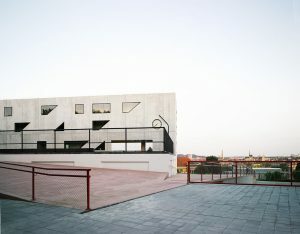 The building is a part of a collective design of a building block amongst four architecture practices. 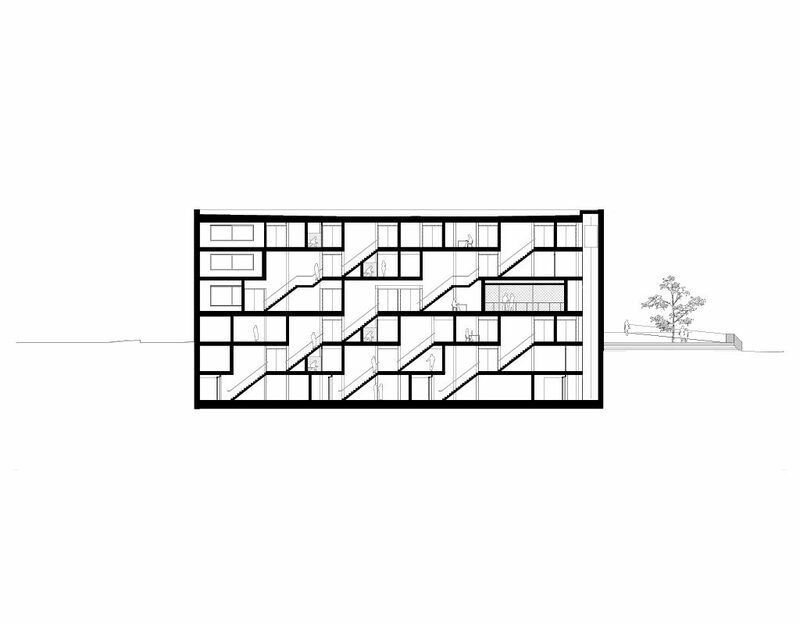 The project formulates a nuanced answer to the current question of sustainable living, on the edge of the city. 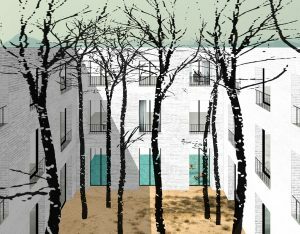 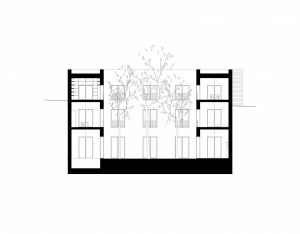 The block creates an inner courtyard, providing a space away from the city, while the flush, highly reflective facades facing the water edge of the Escault river engages with its surroundings. In OFFICE’s building, large cantilevered balconies break up the static, rigorous facade and reference the warehouse typology with projections reaching out towards the water. 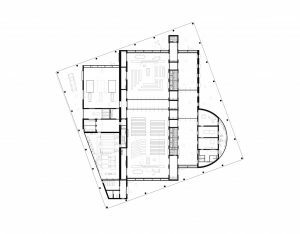 Generous window openings and double doors between the rooms allow for a great sensation of both volume and flexibility of use. 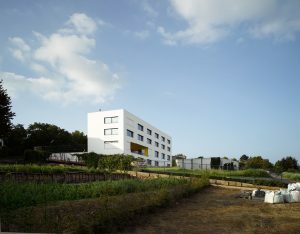 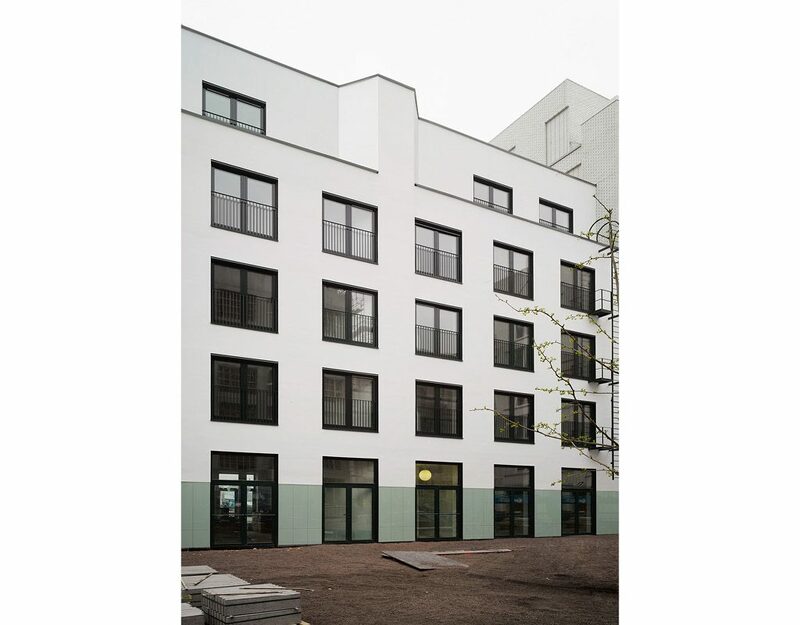 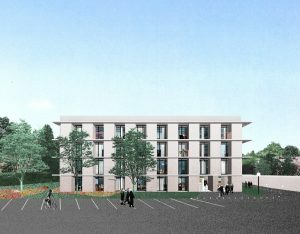 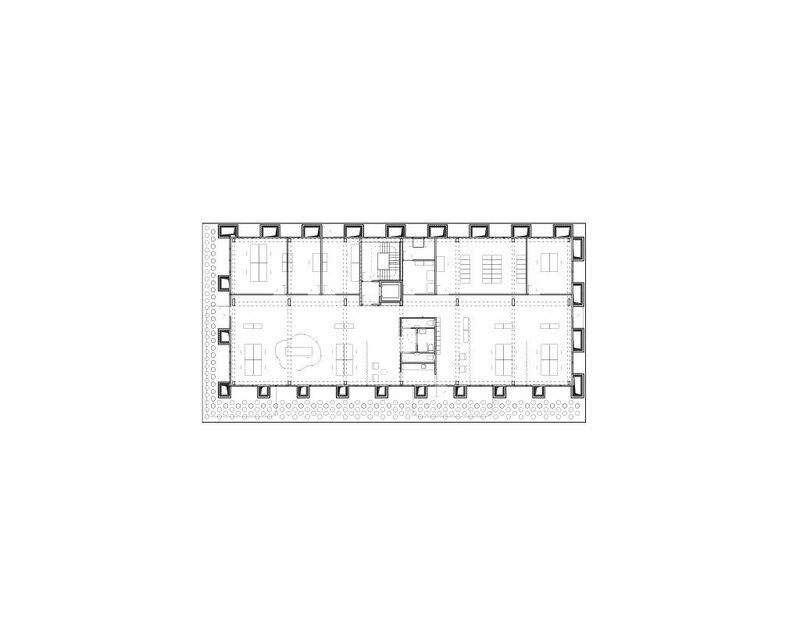 The project complies with the requirements of Passivhaus for minimizing the energy consumption of futur inhabitants. 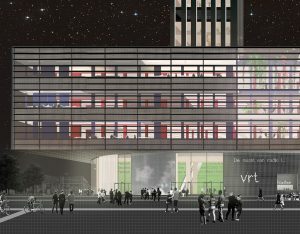 Competiton entry in collaboration with Project2, Architecten de Vylder Vinck Taillieu bvba,Meta Architectuurbureau and NoArchitecten, 1st prize. 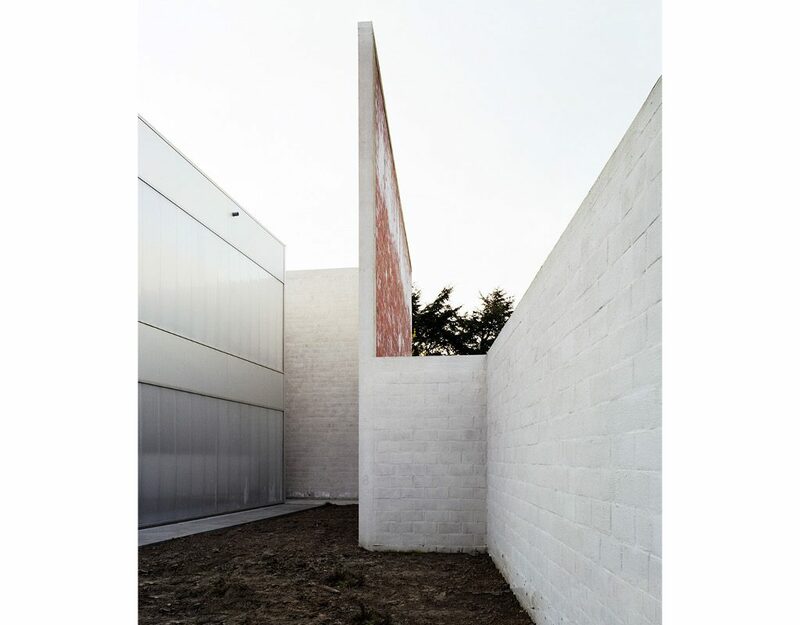 Photos by Bas Princen. The Solo house is a country residence in a large untouched forest, in the mountainous region of Matarraña, two hours south of Barcelona. 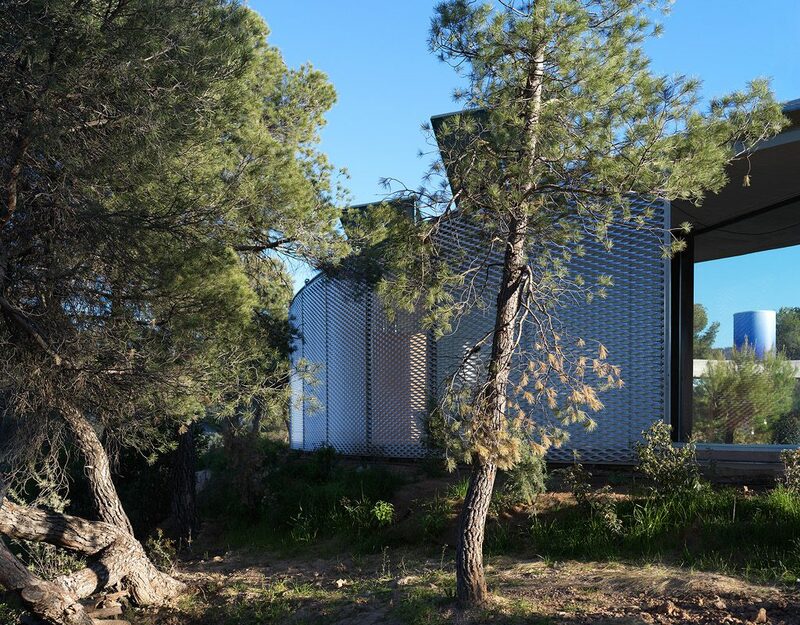 The house frames the top of a plateau, overlooking the surrounding forests and dramatical landscape. 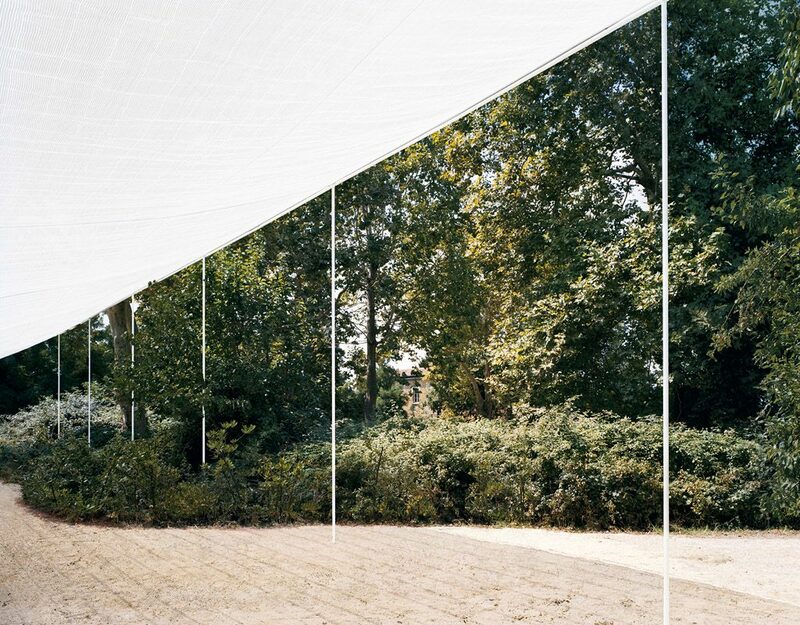 Since the scenery is so impressive, we felt architecture should be invisible, merely emphasising the natural qualities of the surroundings. A simple circular roof with a diameter of 45 meters underlines the qualities of both the plateau and its edge. 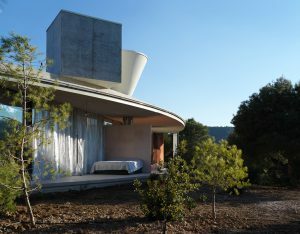 The roof functions as a shelter, and forms the perimeter of the inhabited surface. 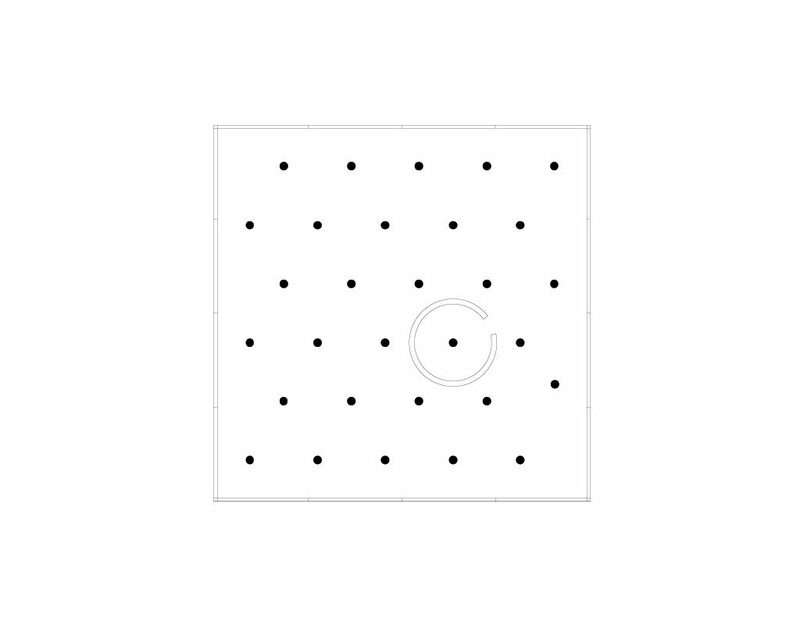 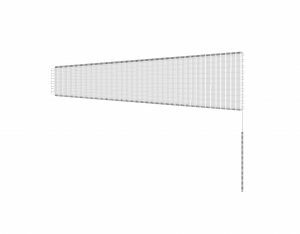 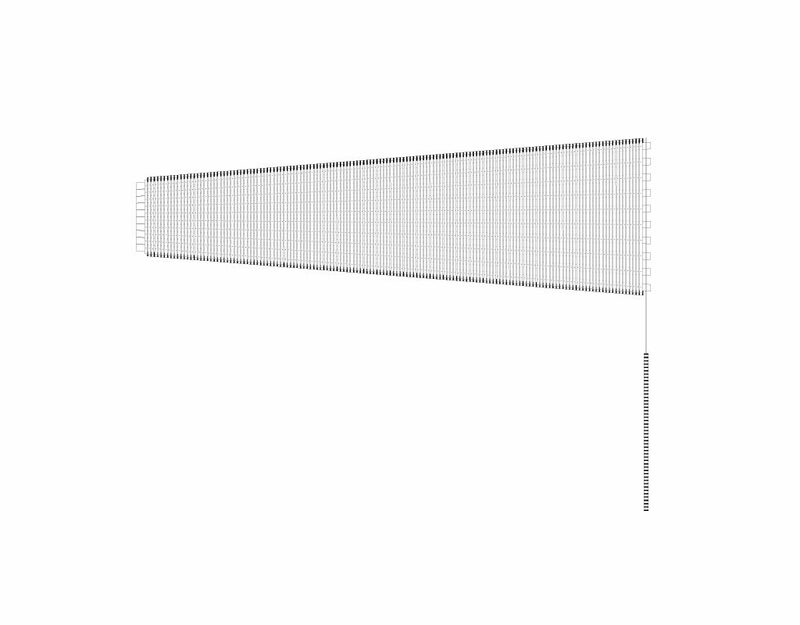 It is supported by four straight rows of eight columns, which cut chords from the circular base shape. 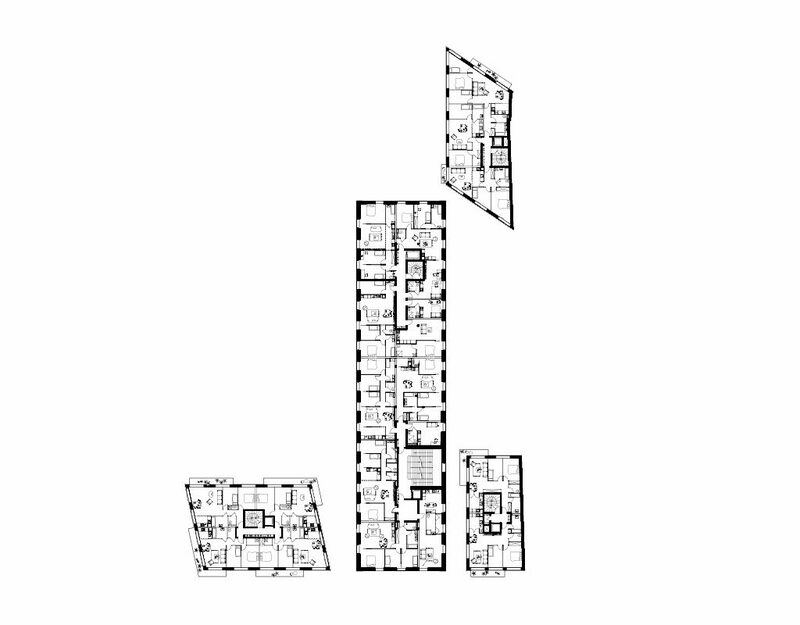 Only these four areas are inhabited, with variable levels of protection. Large stretches of curtain facade slide on the outer edge of the circle, allowing the living areas to fully open, and providing a maximum relationship between the dweller and the surrounding nature. 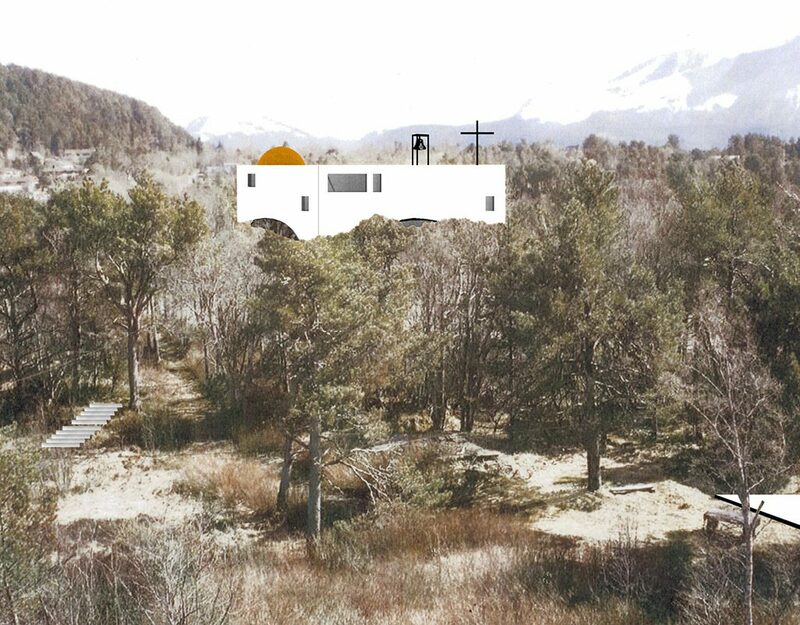 Since the terrain is not connected to any services, the house will be completely self-dependent. 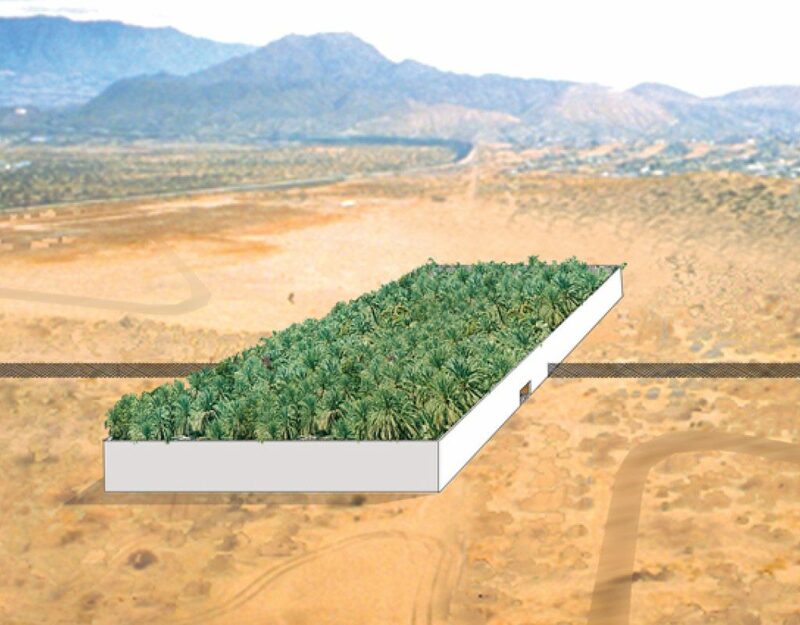 Photovoltaic panels will provide thermic and electrical energy, which will be stocked in buffer tanks. 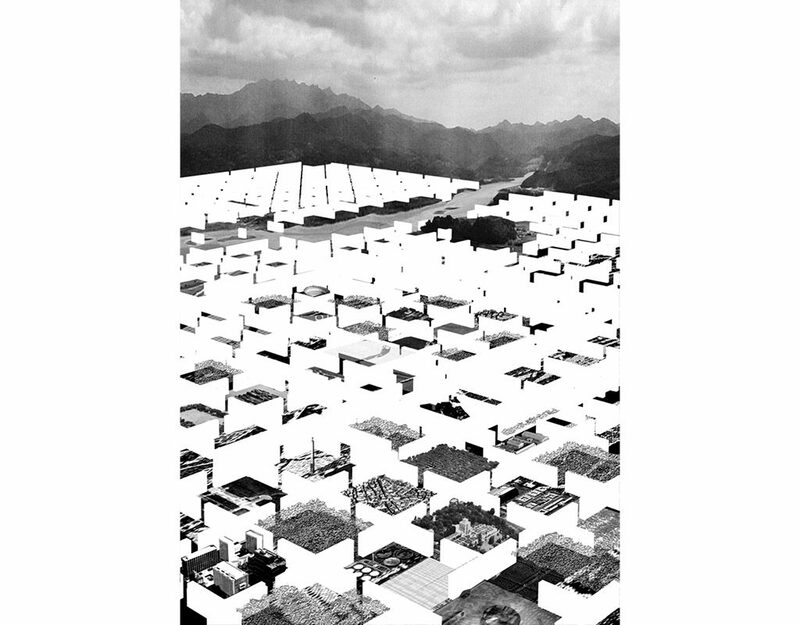 Water is claimed on the site itself, and purified after use. Each of the devices are placed as abstract objects on the roof. 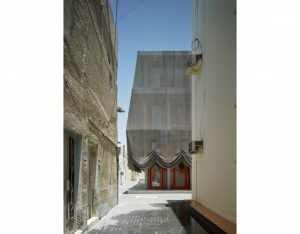 Dar Al Jinaa and Dar Al Riffa are two similar buildings, part of a project of urban renewal in Bahrain. The ambition is to give a public face to the ancient community of pearl fishers, and their musical and cultural traditions. 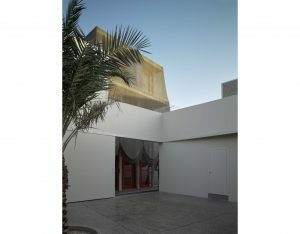 Each project consists of both the renovation of an existing Dar (‘house’), and a new, added Majlis (‘collective room’). 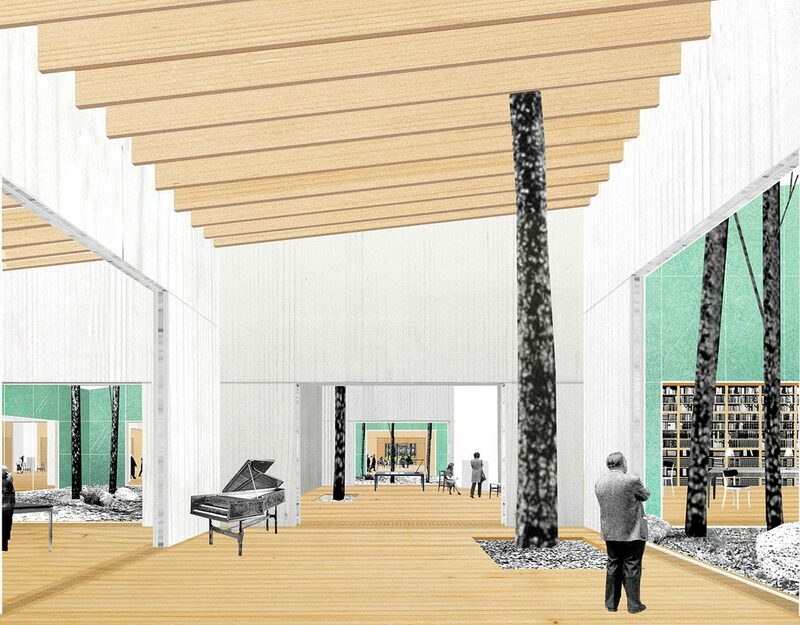 The Majlis will be used as communal spaces for traditional music performances . 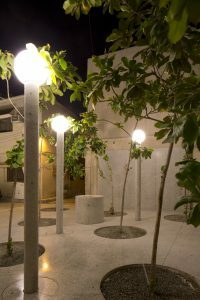 Both buildings consist of a simple structure of round concrete columns and platforms. 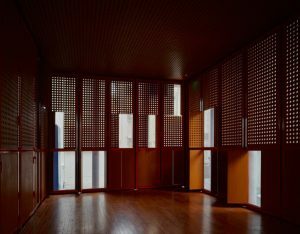 Rectangular folding glass facades, equipped with perforated wooden shutters, create intimate interior spaces on the platforms. 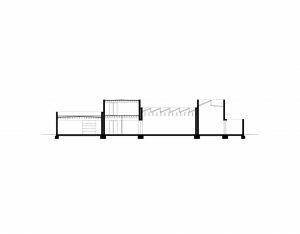 Stairs, sanitary boxes and technical installations populate the exterior platforms, forming the furniture which makes this simple structure functional. The entire building is covered by a seamless steel mesh, providing cover from the harsh desert sun, and transforming the buildings into enigmatic, ‘veiled’ objects, protruding from the dense Bahraini urban maze. 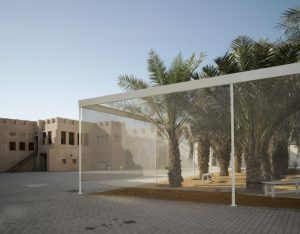 When the building is in use, the veil is lifted to allow passers-by a glimpse of the performances inside. This set of gardens was designed and built for the 11th Sharjah Biennial 11, curated by Yuko Hasegawa. 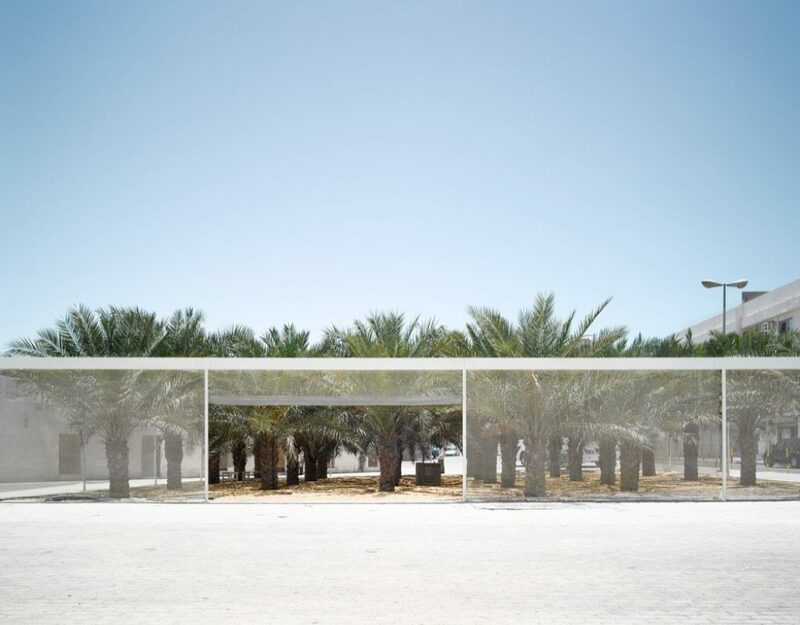 After developing a strategy to urbanise the existing heritage area of Sharjah during the biennial, OFFICE created a set of pavilions, which both through their volumetric presence complete the city fabric, as they create small gardens for the neighbourhood. 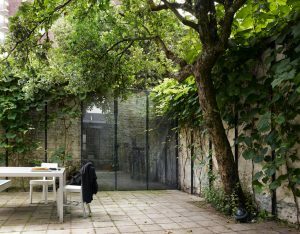 The three pavilions consist of a simple steel structure covered in transparent steel mesh walls, framing a lush oasis-like garden. 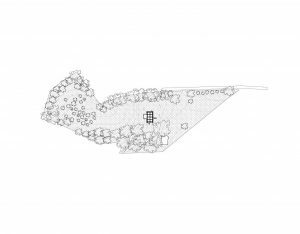 The three gardens have varying degrees of public accessibility, each creating a dialogue with specific urban contexts and their users. As lightweight and permeable pavilions that show glimpses of their garden-content, these new structures are contemporary versions of the traditional additions to the old city, where courtyard perimeters were continuously added to the existing fabric. 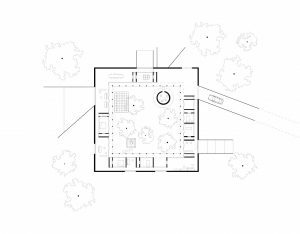 The new Garden Pavilions apply this logic today, and smuggle a set of oasis gardens for the public disguised as architecture back into the maze of the Arabic city fabric, in which public space has become almost non-existent. 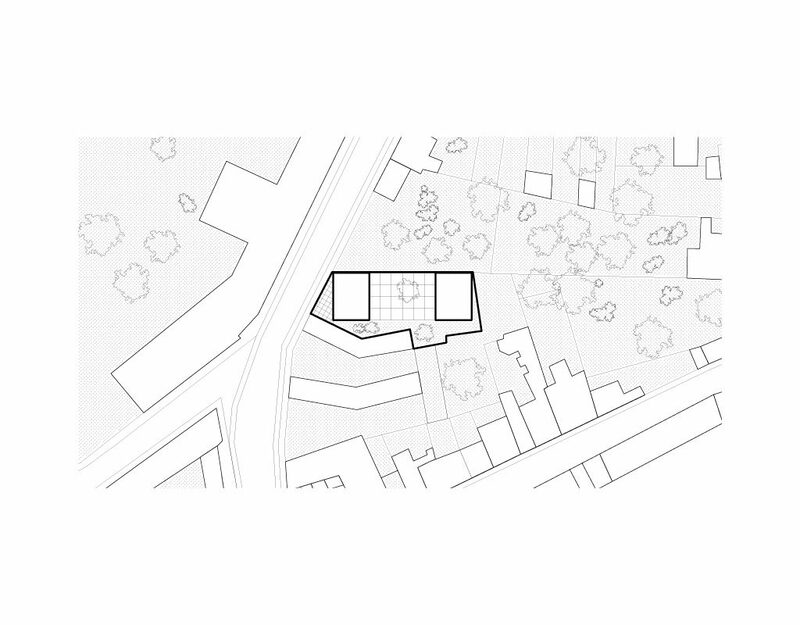 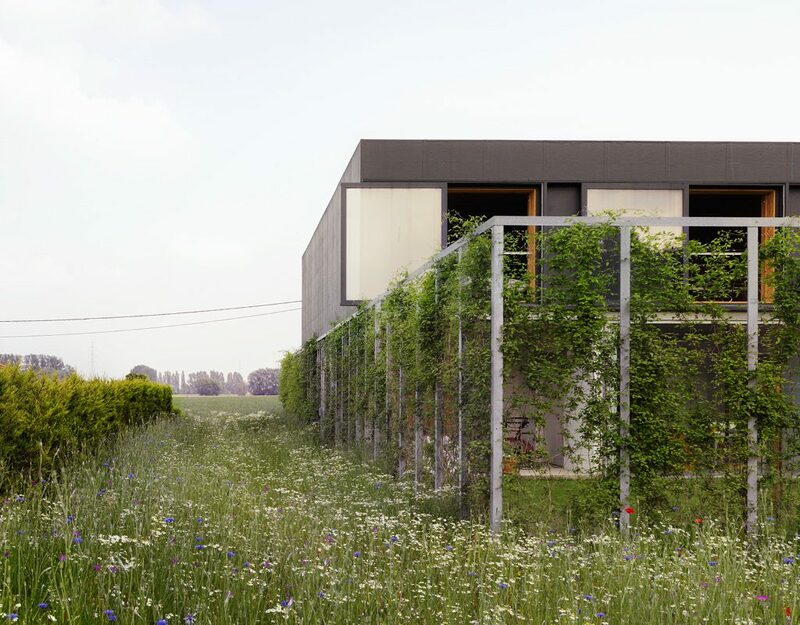 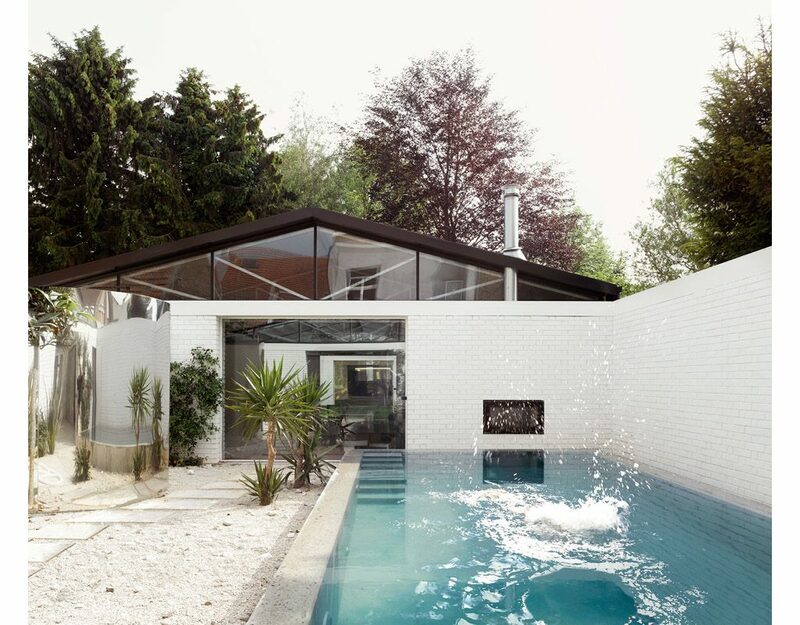 Der Bau is the project for a villa on a large, secluded site in the periphery of Brussels. It replaces a mansion from the 1900’s, taking roughly its volume. 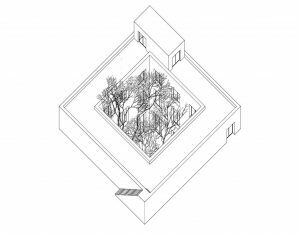 As a ghost volume it offers only a set of relations; with the landscape, with the topography, and internally, mediated through the set of walls and overhanging floors. 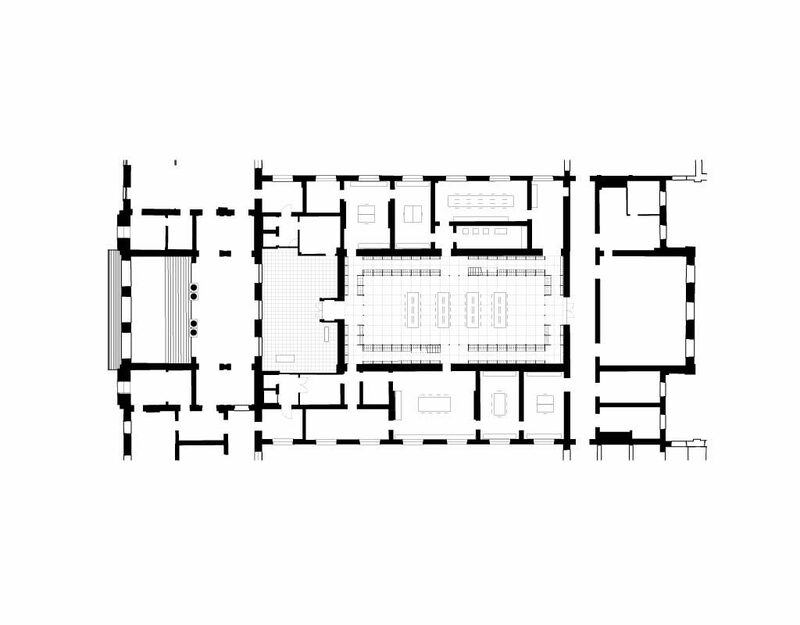 The base of the building, which is half submerged in the rising terrain, is formed by a compact grid of rooms, organised as an enfilade through central double doors. 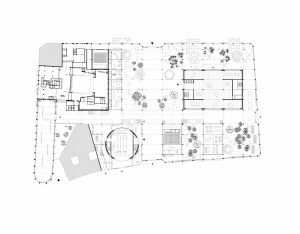 The grid is cut off to create open, niche-like spaces at the extremes of the plan, which are left mostly open towards to outside. 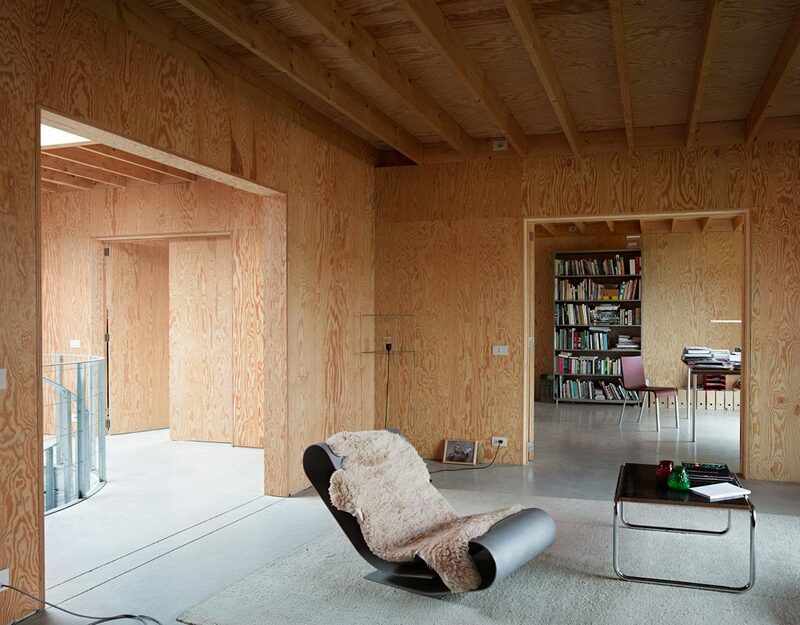 On the top floor, the same plan is repeated, but whereas the basement floor is a traditional construction of brickwork and concrete flooring, the top one consists of massive timber panels. 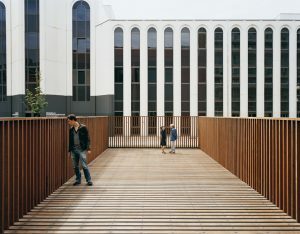 These panels are structurally connected in order to create an extremely stiff, waffle-like structure, only supported by a handful of columns. 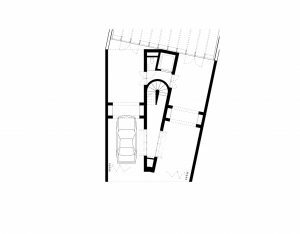 This allows the intermediate floor to have an open floor plan, uniting kitchen, dining and living areas in a continuous meandering space. 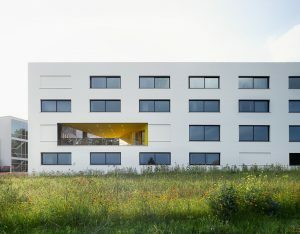 A set of five compact ‘boxes’, connected by sliding windows, contain auxiliary spaces and the connections to the other floors while functioning as structural supports. 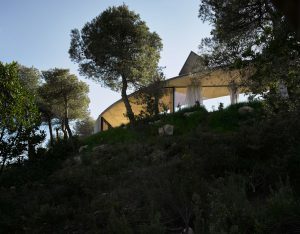 The glazed surfaces suspended between them can completely slide open to connect the living space directly to the landscape around it. 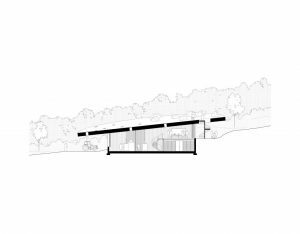 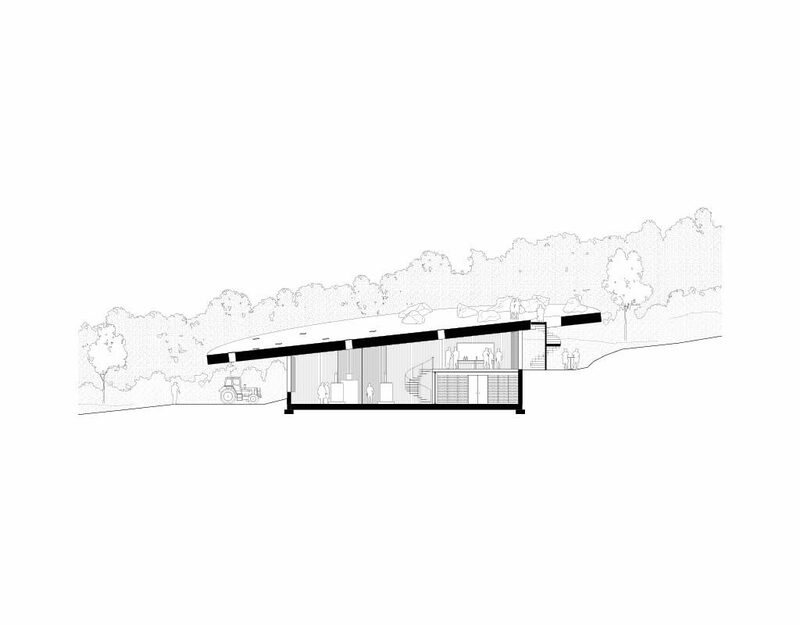 As an ultimate gesture emphasising the private nature of the site, the most intimate spaces are pushed to the extremities of the plan, and are framed with large glass panels towards the landscape. 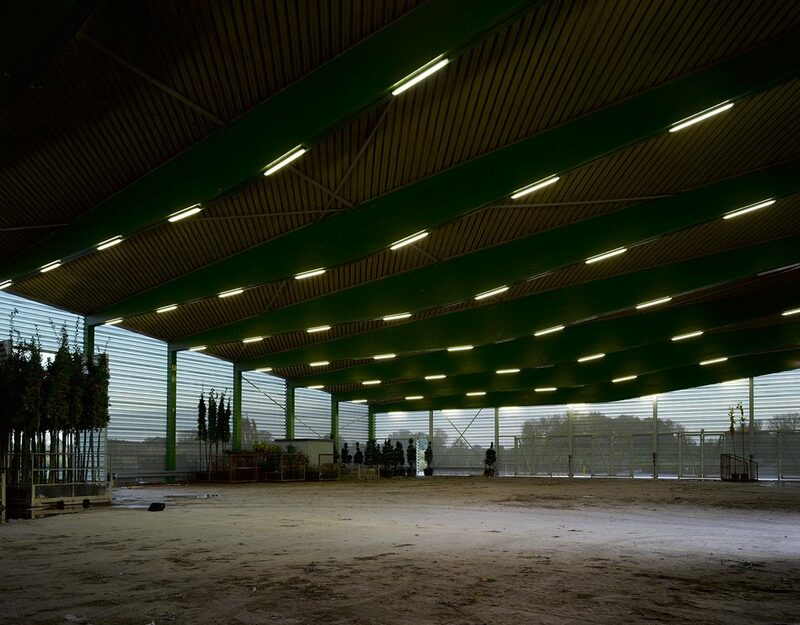 This industrial building, part of the infrastructure for a large tree plantation in Brabant, sits in the middle of fields of potted plants of varying scales; its main purpose is a space to dry potted plants twenty-four hours before distribution. 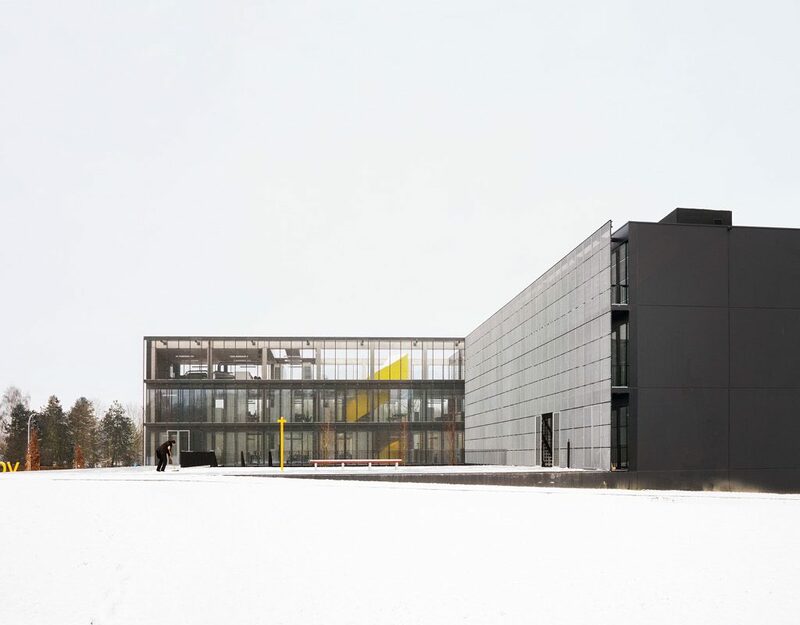 This building is the most extreme and simple incarnation of a big box: a building envelope removed from anything even vaguely referring to function—a true building without content. 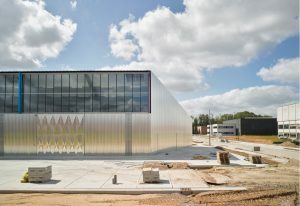 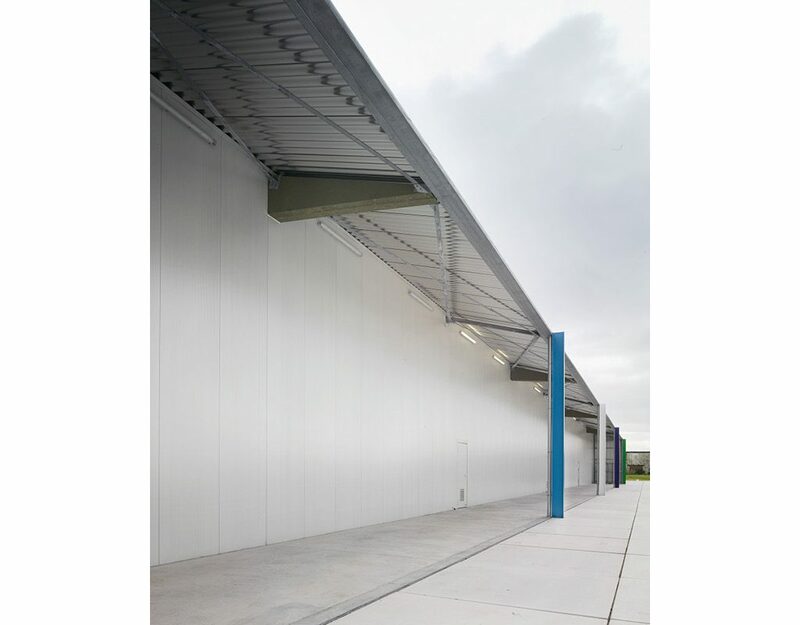 The process for drying plants requires currents of air to enter but meanwhile protection from rain; therefore the building is designed as a perforated perimeter with a closed roof. The perforations give the viewer the impression of an almost nonexisting building, a building through which one can still see the silhouettes of plants temporarily stored, a building that does not land in the ground but floats in space. 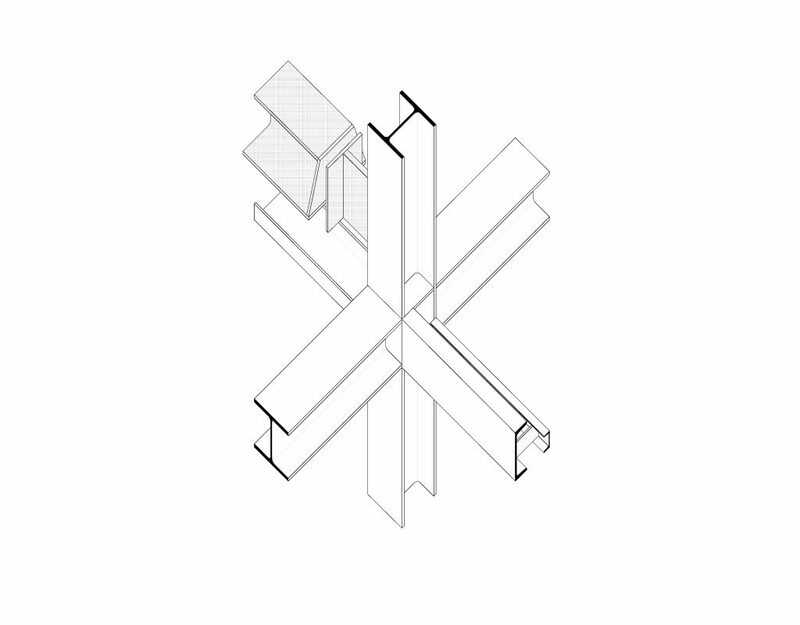 Its simple geometry—the result of two colliding straight-angled triangles—gives the building multiple appearances from different vantage points. 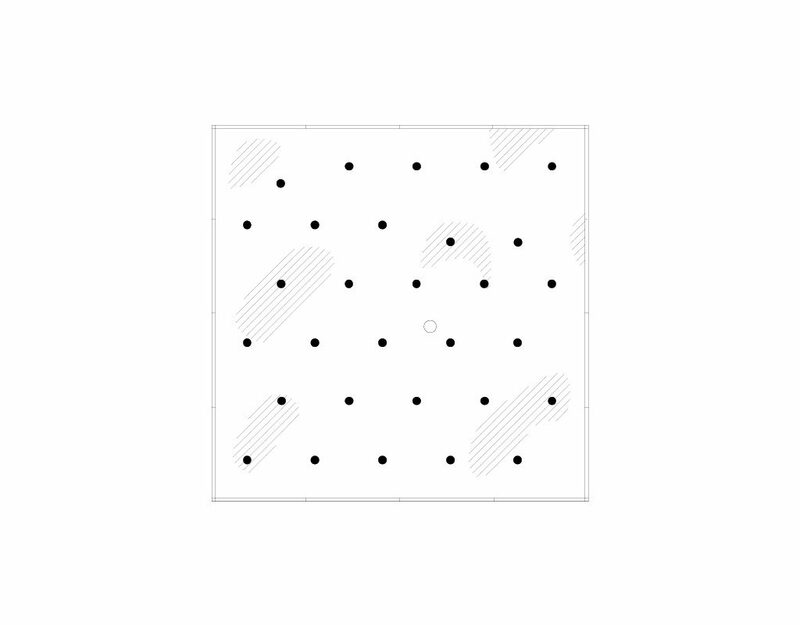 It sometimes appears box-like, sometimes a perforated plane. 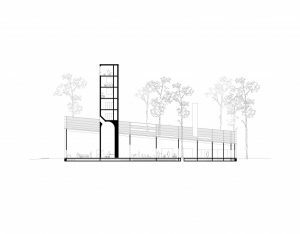 The interior of this simple yet massive structure is constructed of hybrid laminated wood beams, painted white, and steel columns, whose rhythmic placement sets the spatial experience. This agricultural school building is situated on the outskirts of Leuven, overlooking the city from its slightly elevated position in the landscape. 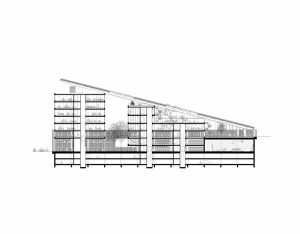 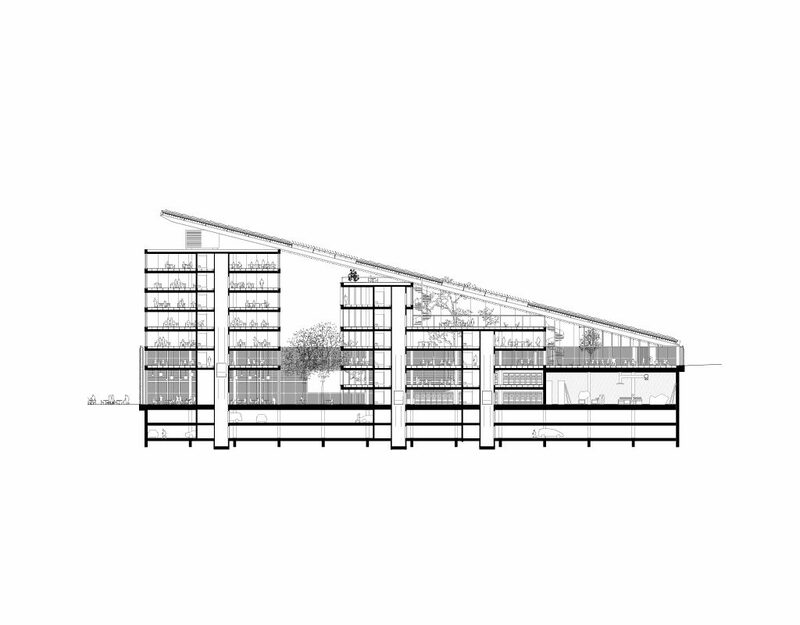 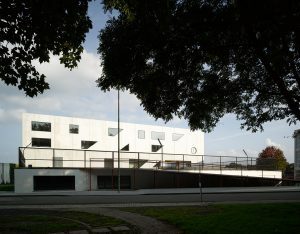 The building consists of a linear block of five floors, housing the classrooms and facilities complemented by a horizontal volume—the sport hall—attached to it. 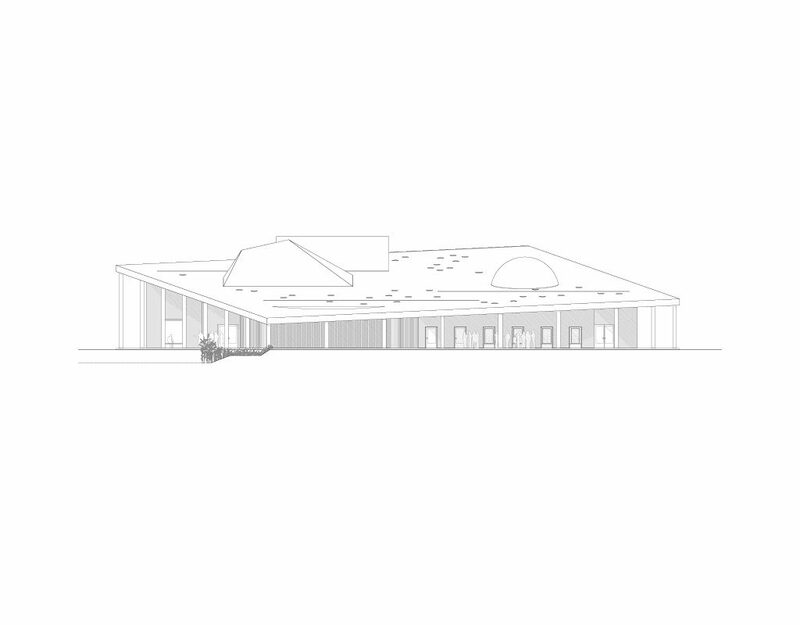 The roof of the sport hall forms the playground with an equal volume. 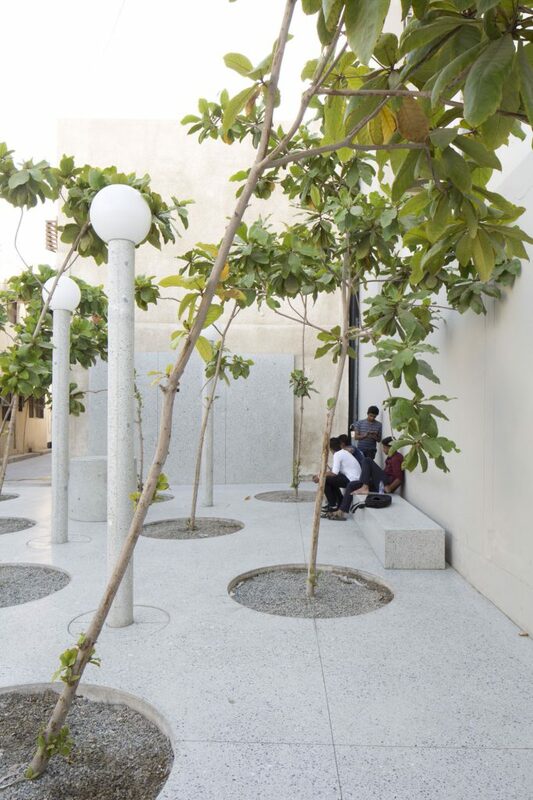 The playground lies before the classrooms, effectively working as the entrance to the school complex. 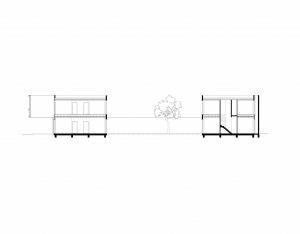 This platform cuts through the class volume, marking the entrance to the school and providing a view to the school’s agricultural fields. 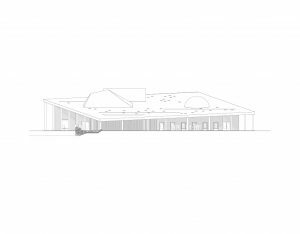 The main feature of the school is a parallel set of stairs and landings between playground and sports hall on the one hand and the classrooms on the other. These set of stairs makes the main façade of the school building, executed in rough precast concrete, the mediator between all the school’s different activities. 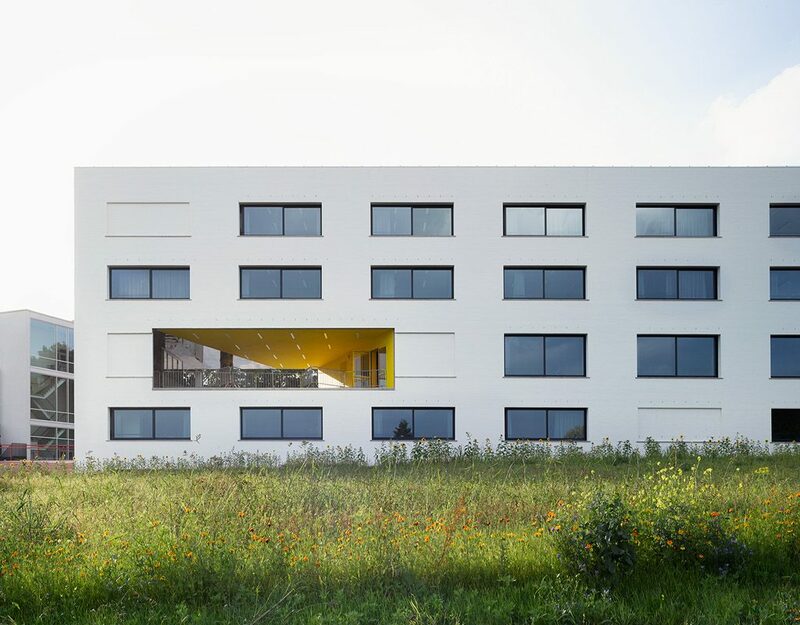 The school’s façade is simply standard brick painted white. 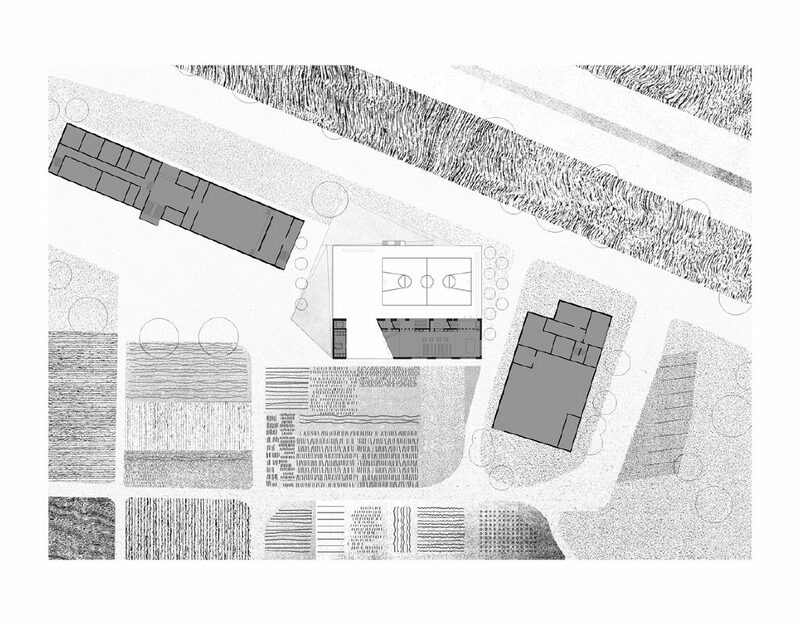 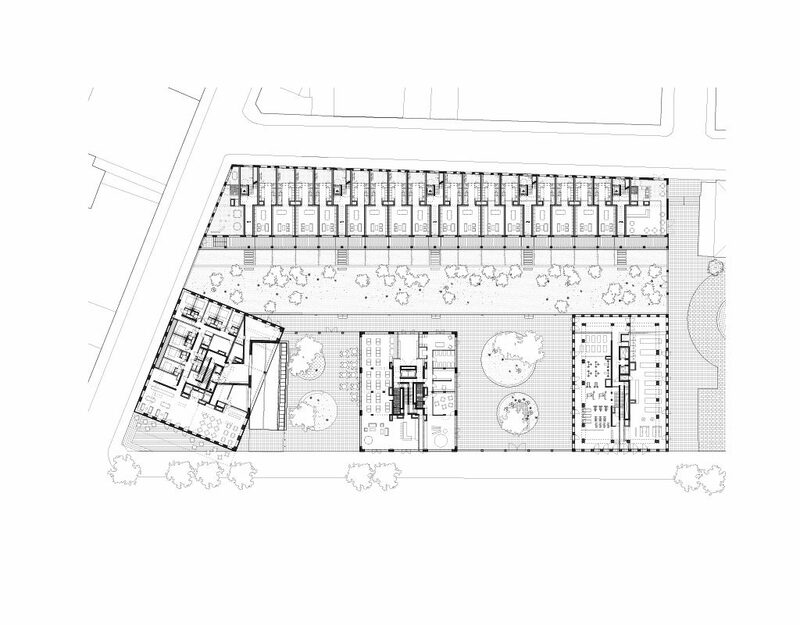 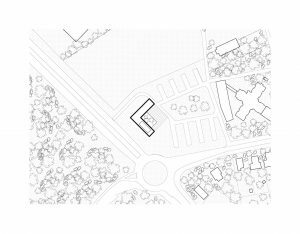 The entire volume of the school building turns away from the street to align with the orientation of the fields of the schoolyard. 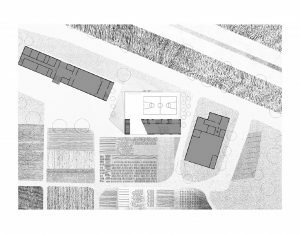 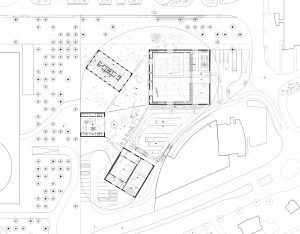 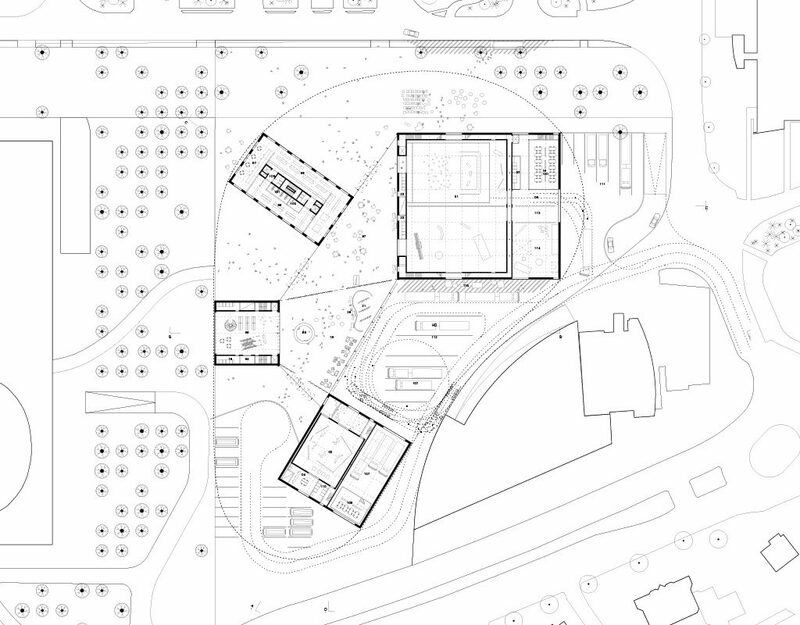 As a result the volume of the school creates a set of secondary spaces that provide the bike storage and an entrance ramps to the main premises. 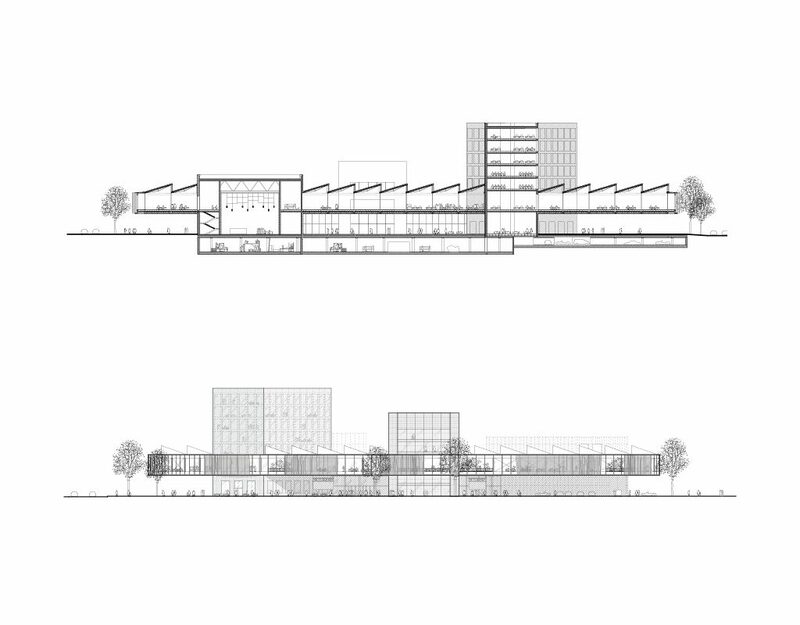 The volume of the school forms a distinct angle with the street and the neighbouring buildings. 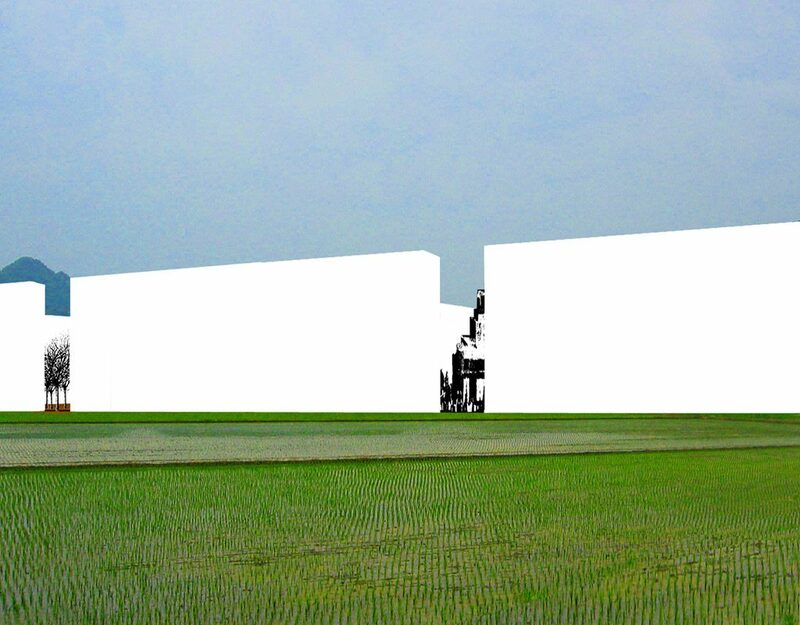 Through its twisted position it finishes the existing geometric layout of the fields behind, and at the same time, by opening up like a gate, allows for a view over the fields towards the city of Leuven, almost as a staged medieval city scene. 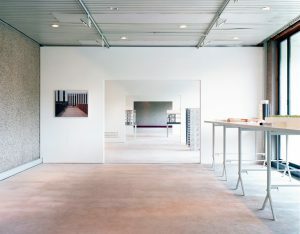 Competition (Open Oproep), 1st prize. 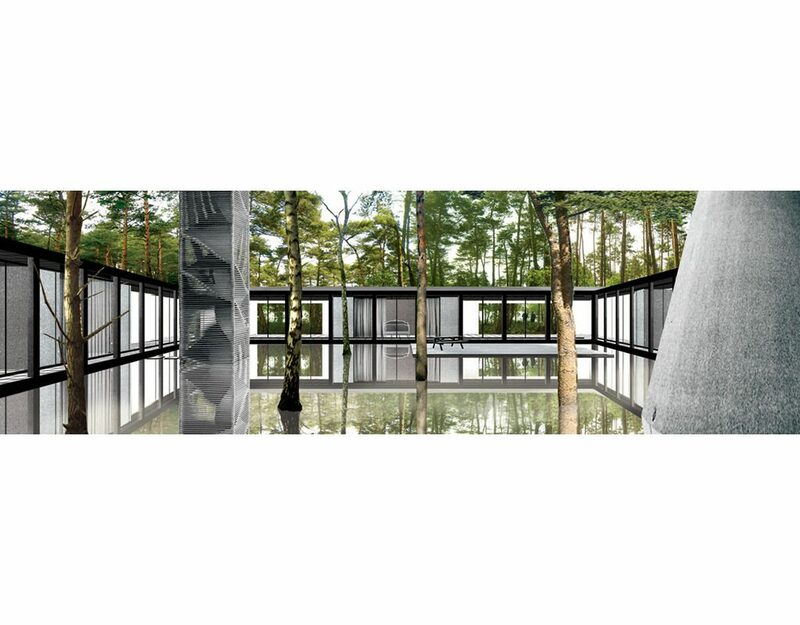 Nominated for the Mies Van Der Rohe Award 2014. 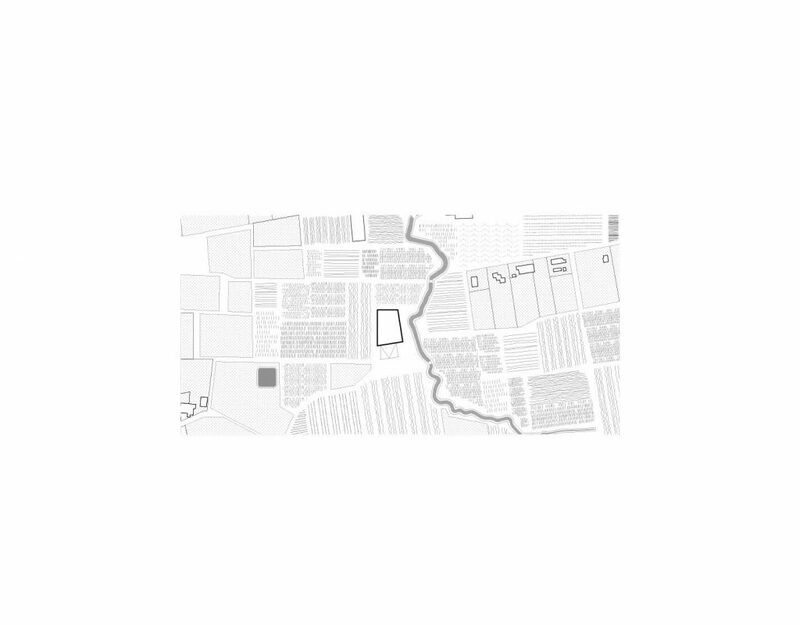 In 2010 Kazuo Sejima invited Piet Oudolf to design a beautiful garden at the very end of the Arsenale area of the Venice Biennale. 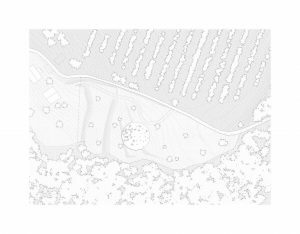 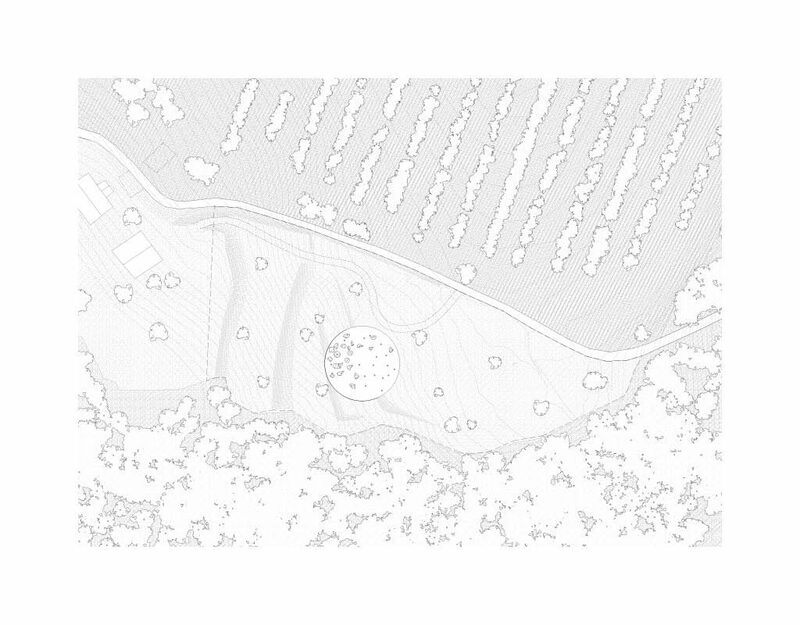 This intervention made an until then undiscovered building visible: a former ammunition storage on the edge of the newly designed garden. The curator realized the pavilion was too interesting to leave it empty and asked us to present our work in it. 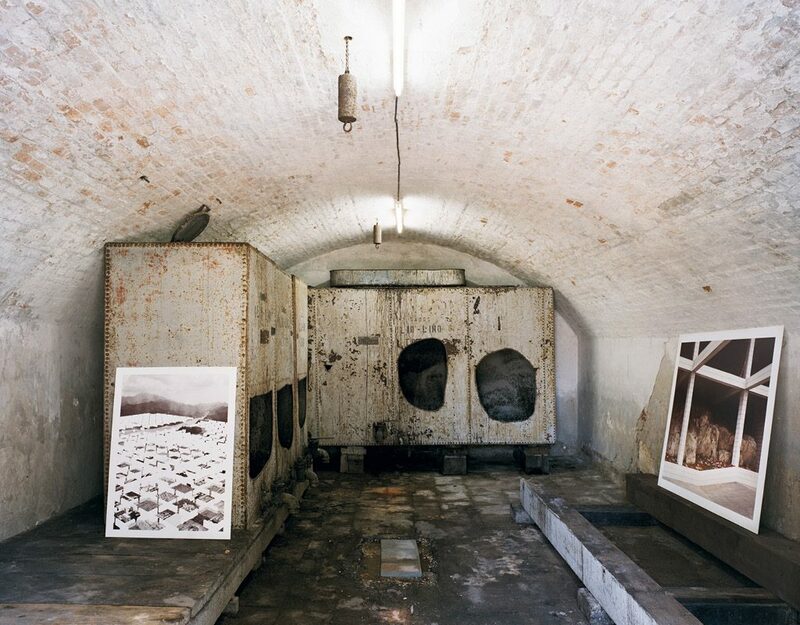 The storage facilities are made out of seven separate vaulted rooms, in rather decaying conditions. 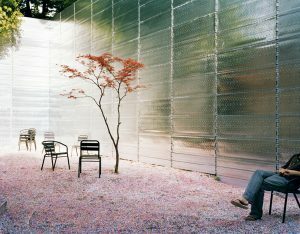 We invited photographer Bas Princen and decided to make a presentation about our mutual approach and interest in the image and the perspective. 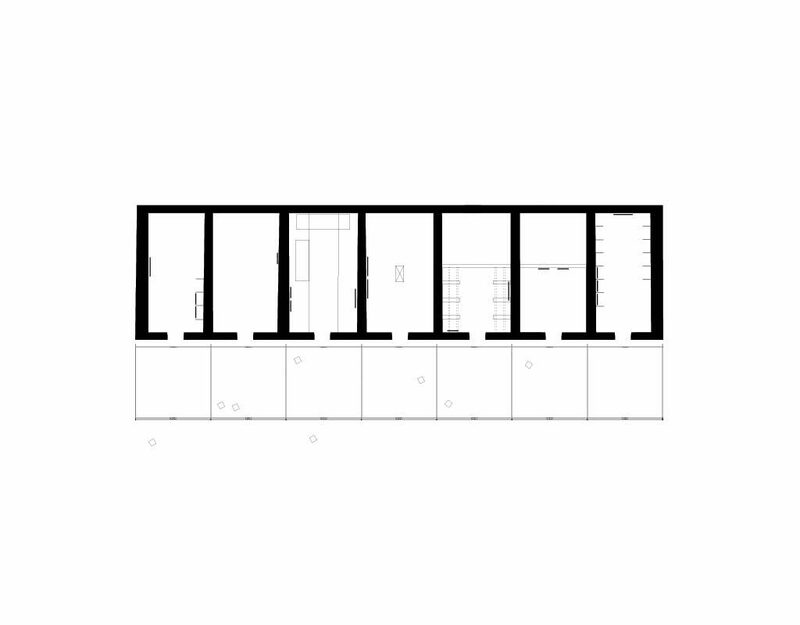 The seven rooms of the storage facilities looked like the perfect context for that. 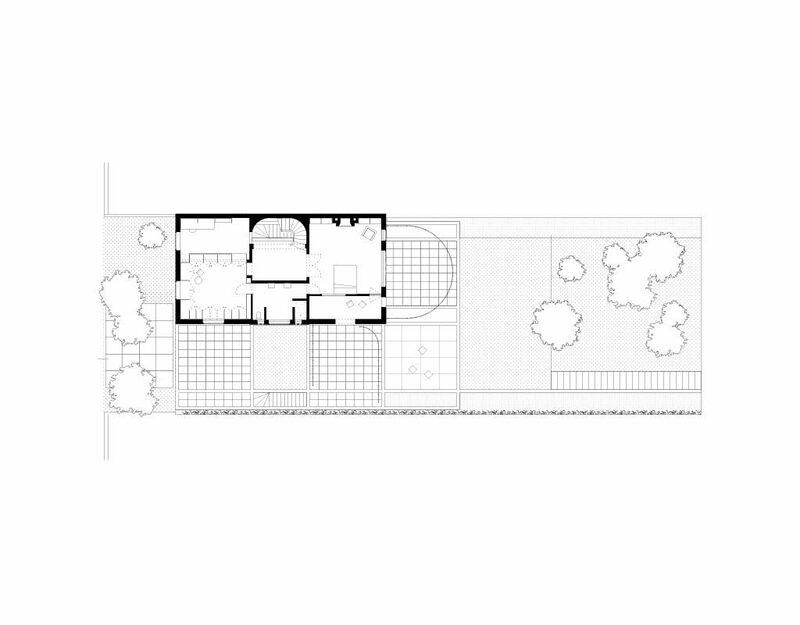 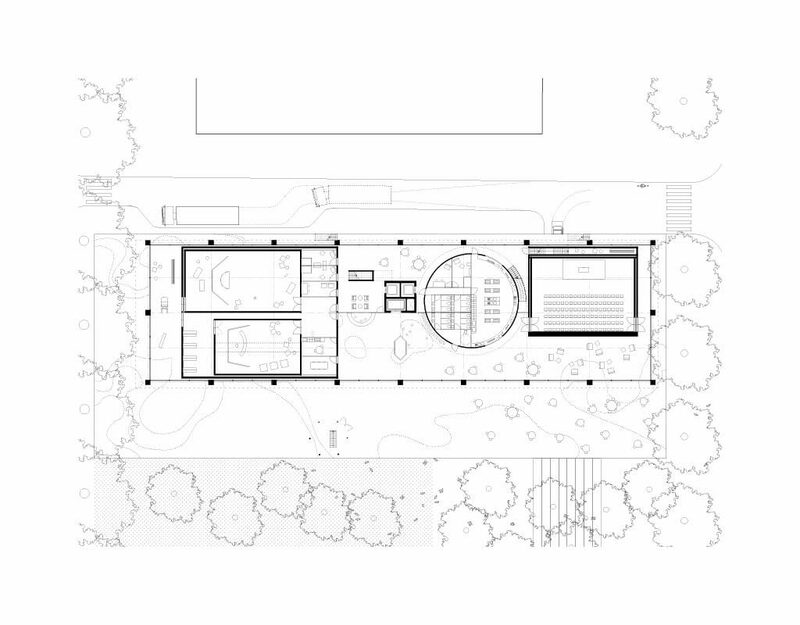 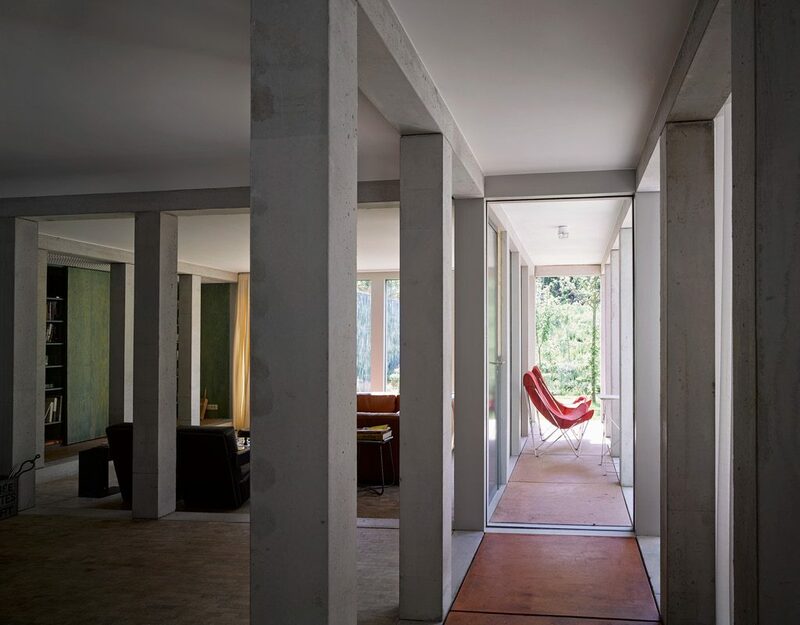 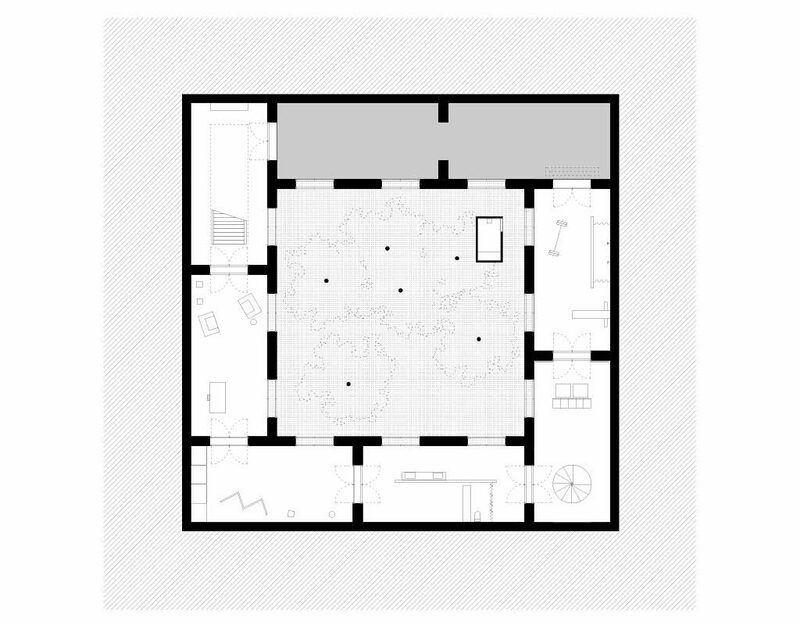 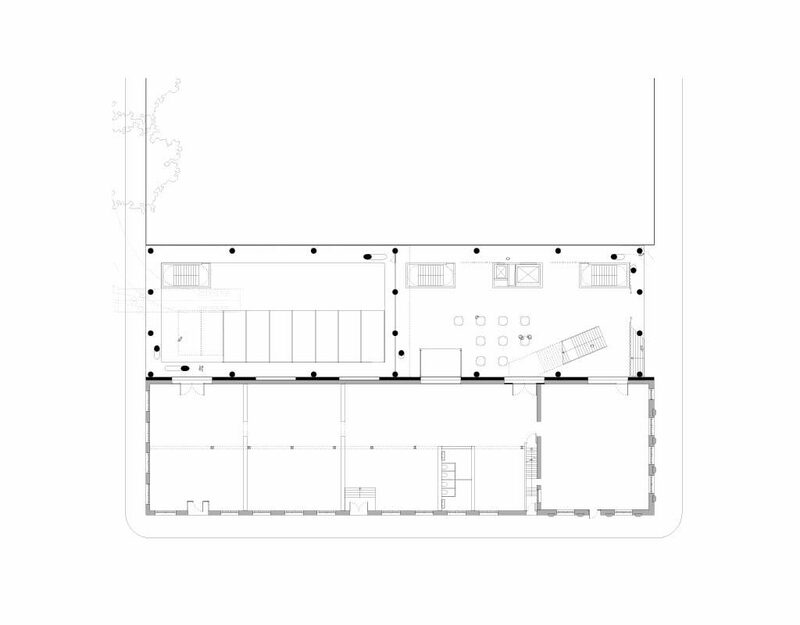 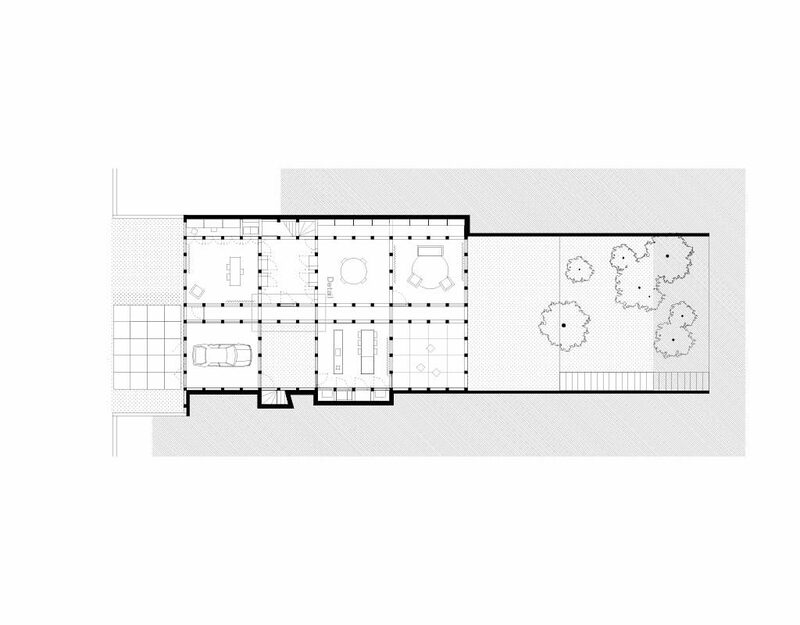 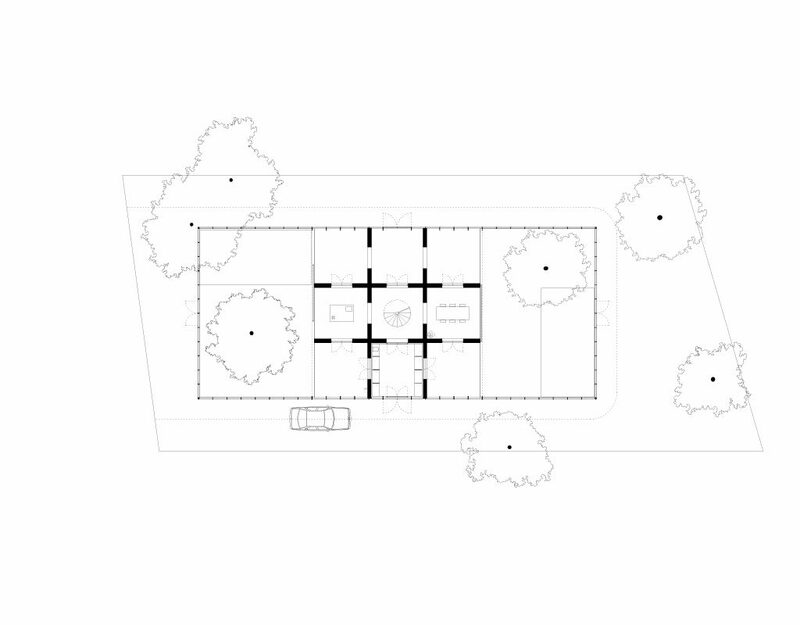 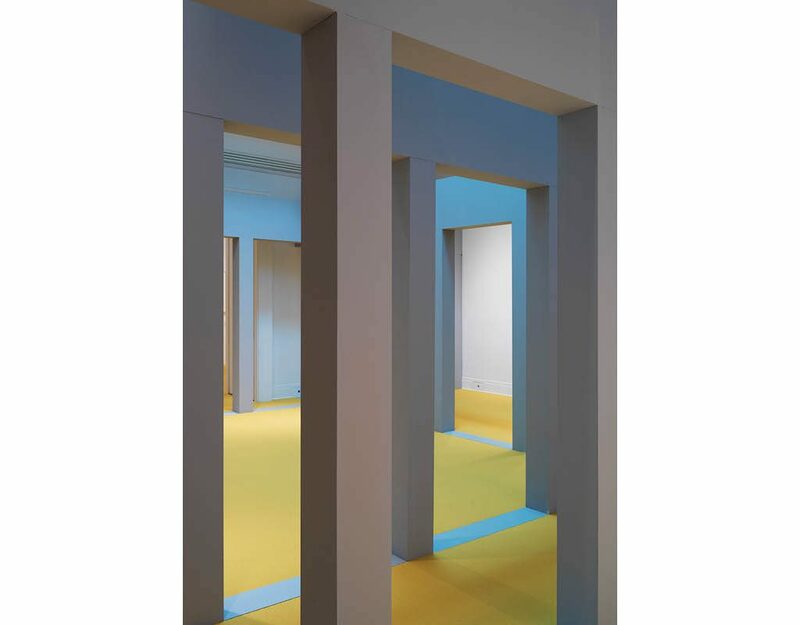 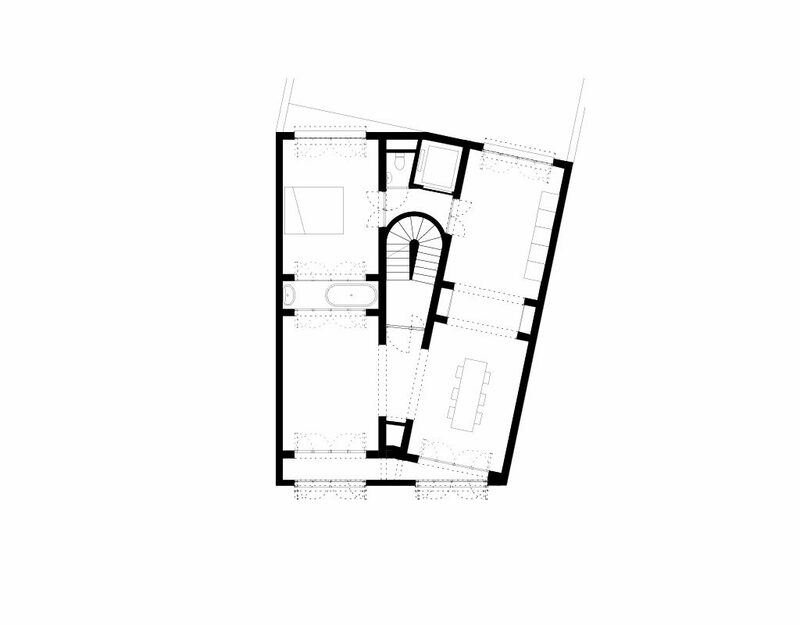 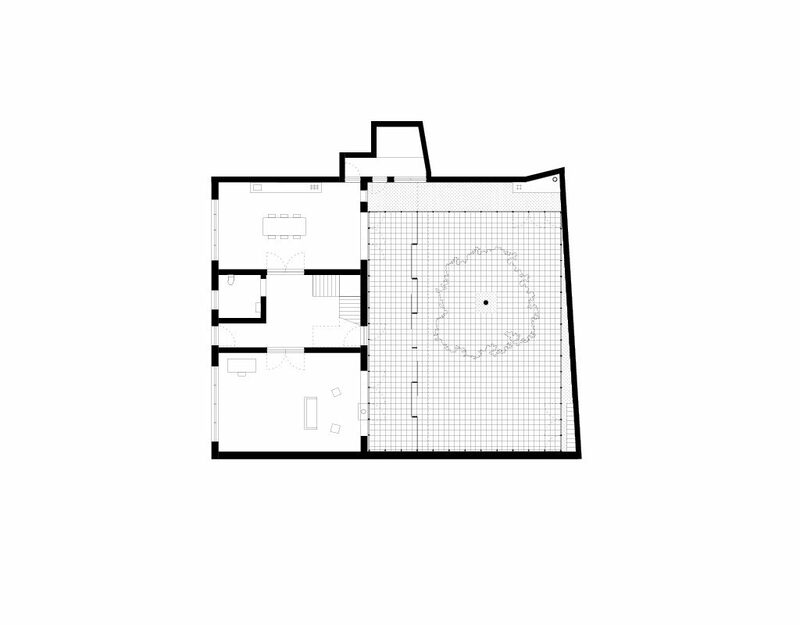 What was missing was a mutual connection—like a hallway—between the different rooms, as well as a spatial device to seek for a relation with the garden/park in front of it. The intervention to resolve both issues is as simple as it is effective. A parapet, or porch made out of an elegant white steel structure covered with a reflective silver roof fabric was positioned in front of the existing building. 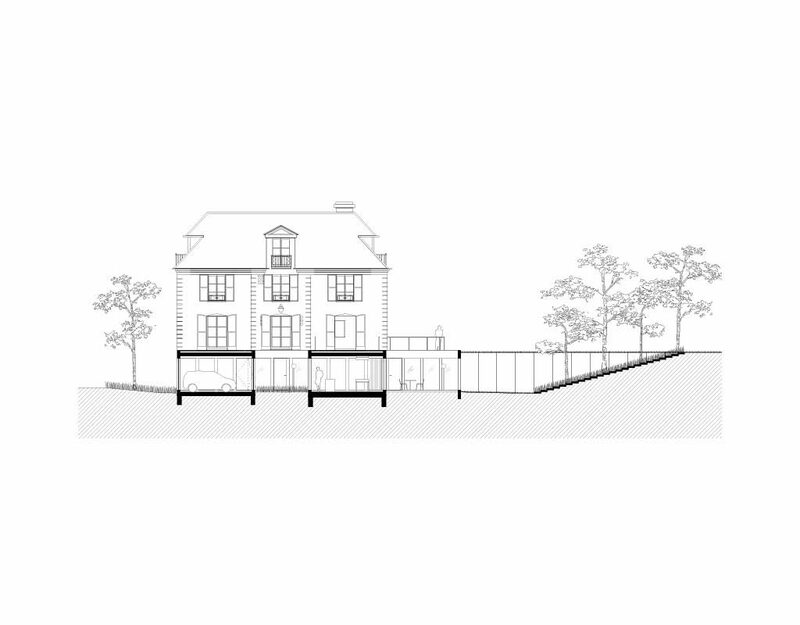 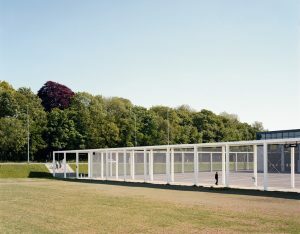 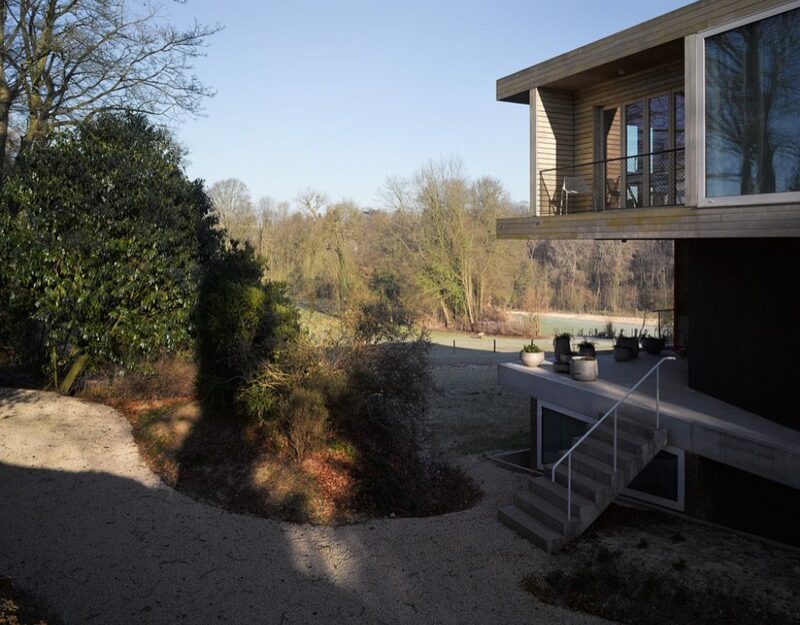 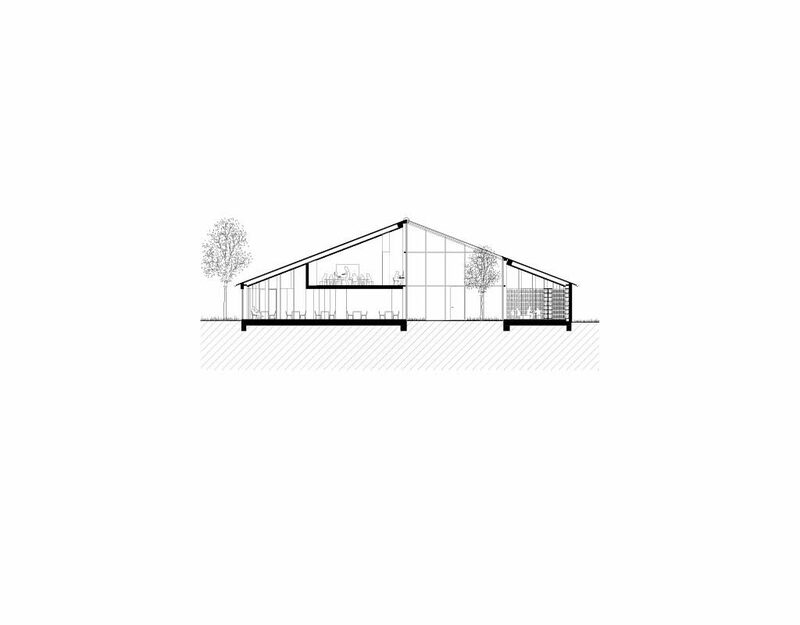 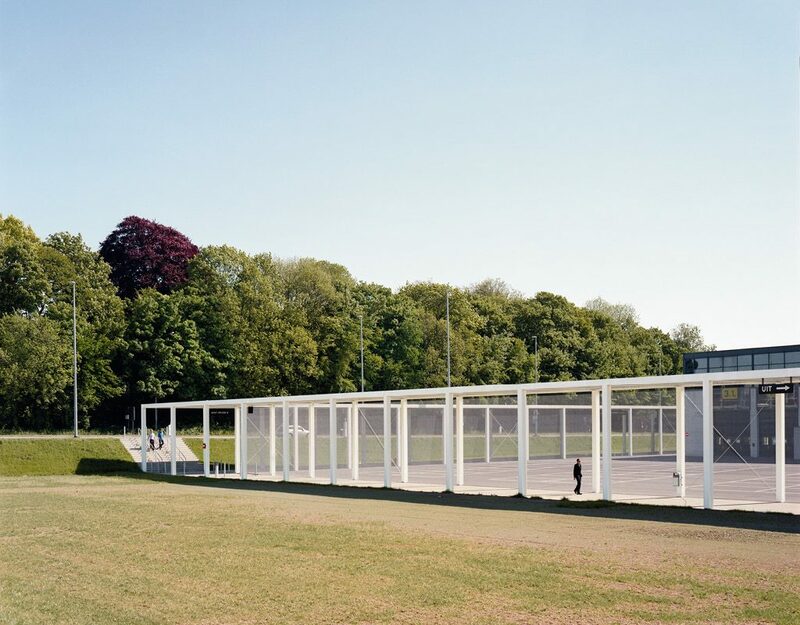 The new structure, placed along the entire length of the house, mirrors the existing pitch roof and thereby extends the existing pavilion with a new external gallery linking the seven rooms together. 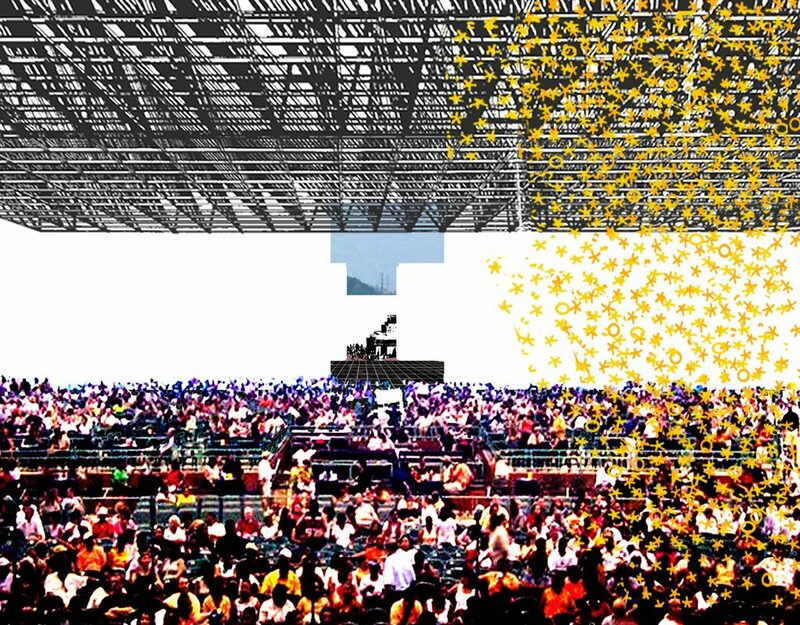 Under the roof one is not really in the building, not really in the park. 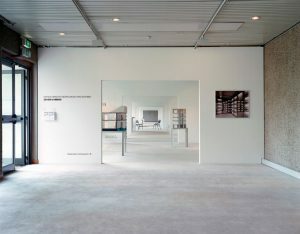 Inside each of the seven rooms, a juxtaposition of images of both Office and the photographer Bas Princen are presented side by side on white aluminum plates. 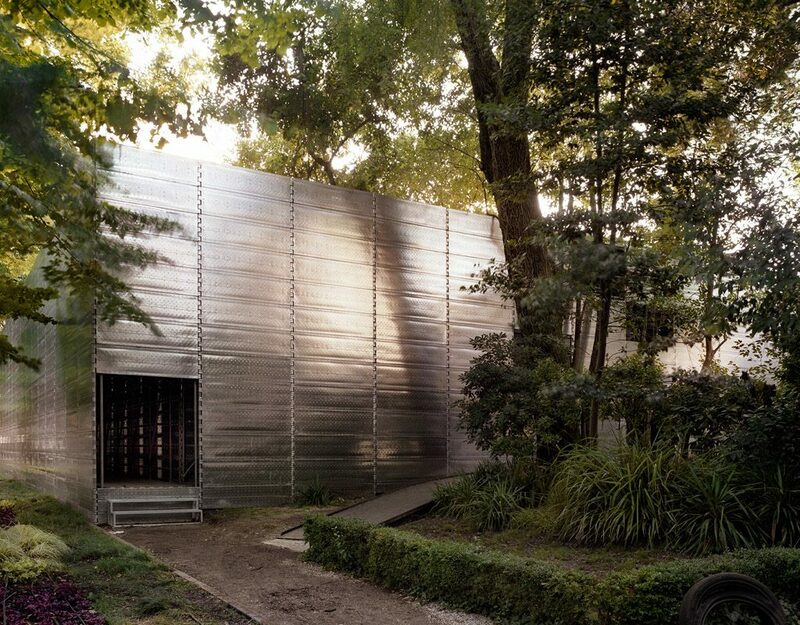 With a simple intervention the former ammunition storage became Garden Pavilion. 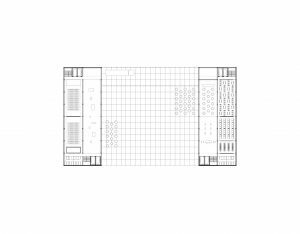 This project was the winning proposal in a competition for the organisation of the Ghent University architecture library in an existing physics hall in the heart of the ’Jozef Plateau’ building, a labyrinthine, 19th century university block. 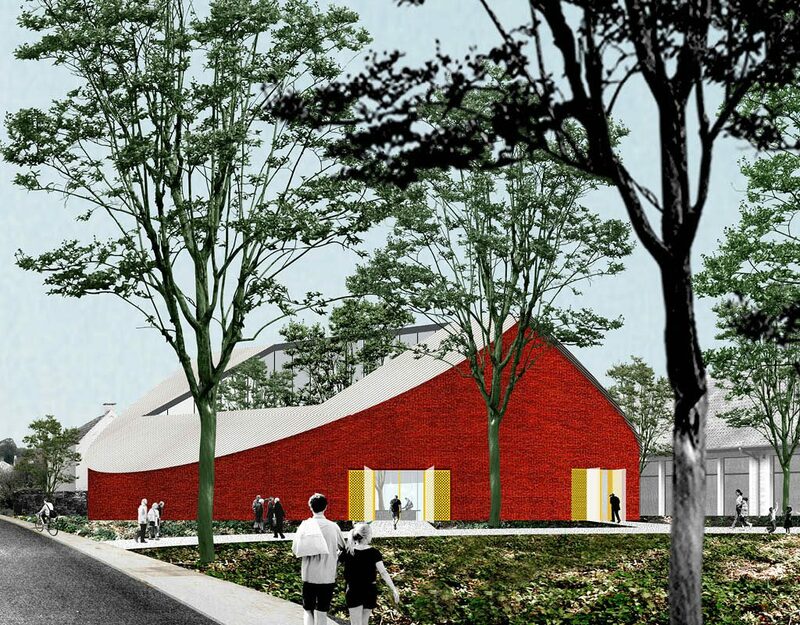 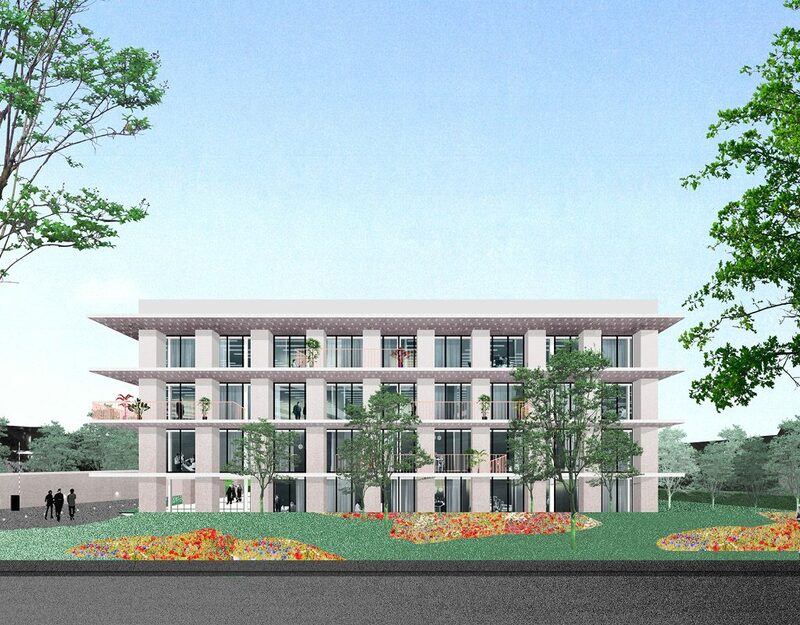 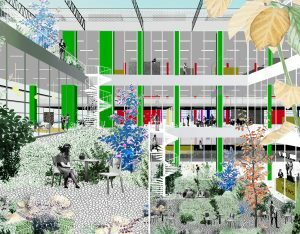 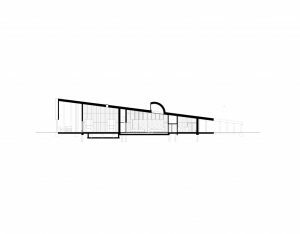 OFFICE’s proposal was two-fold: the refurbishment of the hall through the addition of a large steel cupboard; and the introduction of a new vertical circulation in the entrance courtyard of the new library, which would transform and clarify the use of the front wing of the complex. 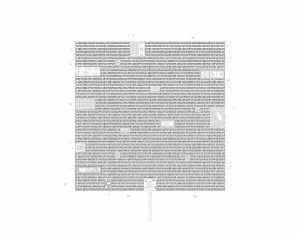 Only the first part of the proposal was executed. 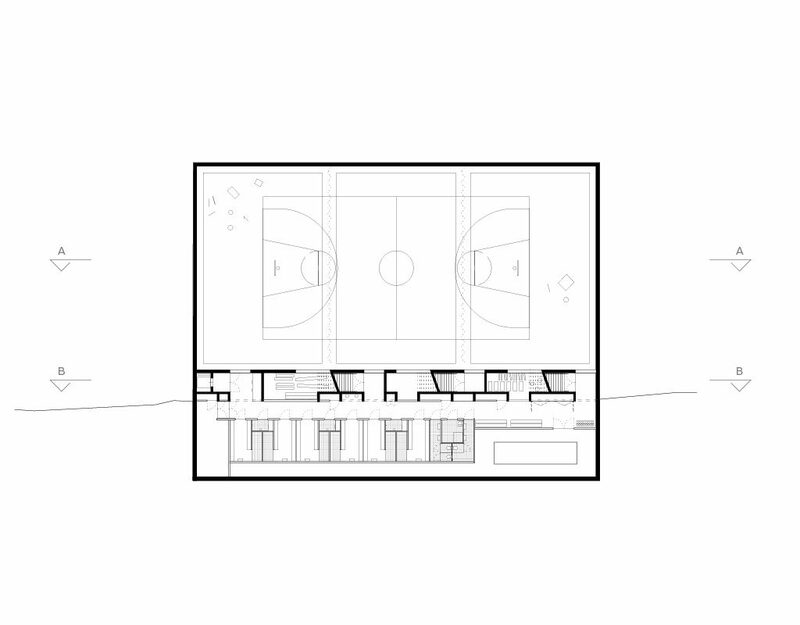 The intervention is the insertion of a large, pavilion-like piece of furniture under the balcony of the Physics hall. This accessible, three-storied cupboard forms a complete perimeter around the central, atrium-like space, enforcing its monumental scale. 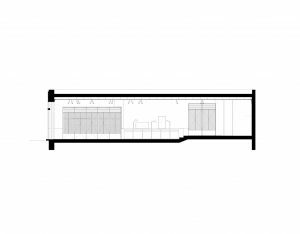 The perimeter of cupboards — realised completely as a bolted construction of prefabricated steel elements — contains passages, stairs and desks, and organises both the library itself and the access to the multiple back offices and auxiliary functions. 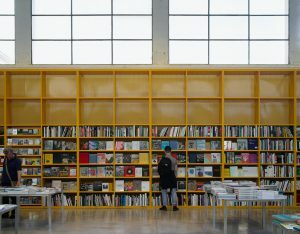 The different collections of books, which are organised in levels according to accessibility and exclusivity, are presented visibly towards the central space, which contains reading tables. 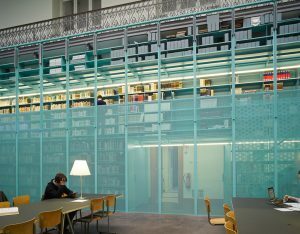 A system of vertically sliding, perforated panels allows for the cupboards to be closed off, protecting the collection during lectures and other events, while keeping them visually present. 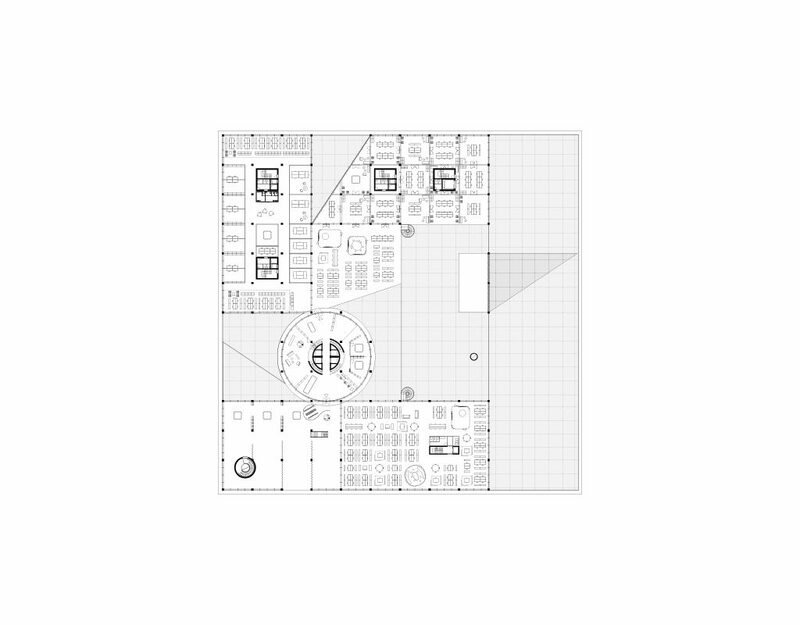 Invited competition, 1st prize. 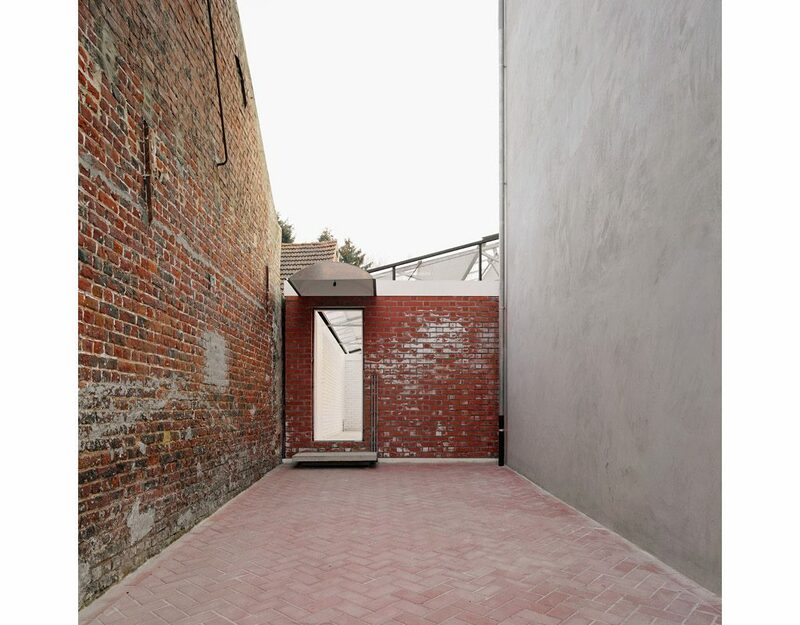 Winner of the Belgian Prize for Architecture 2015. When a theater company requested scenery for an outside play called “The Wall” quickly it became clear that both the specificity of the play and the choice of site was forcing some more interesting decisions. 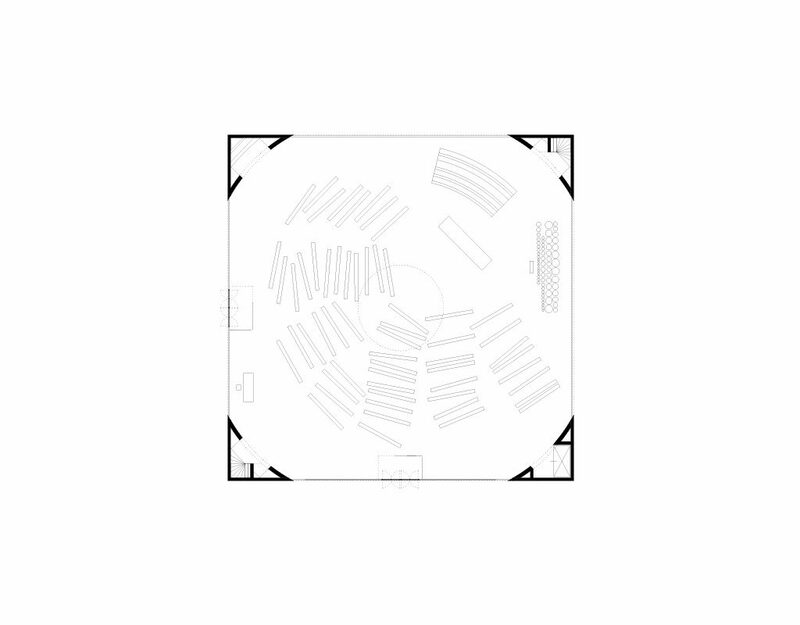 Since the play happens around the decor, the wall had to be circular; since the actors were not supposed to enter the walled space, it had to be closed. 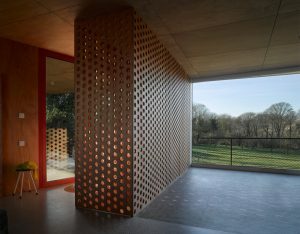 The main focus was to design an object/intervention that did not look like a cylinder, but like a proper wall. 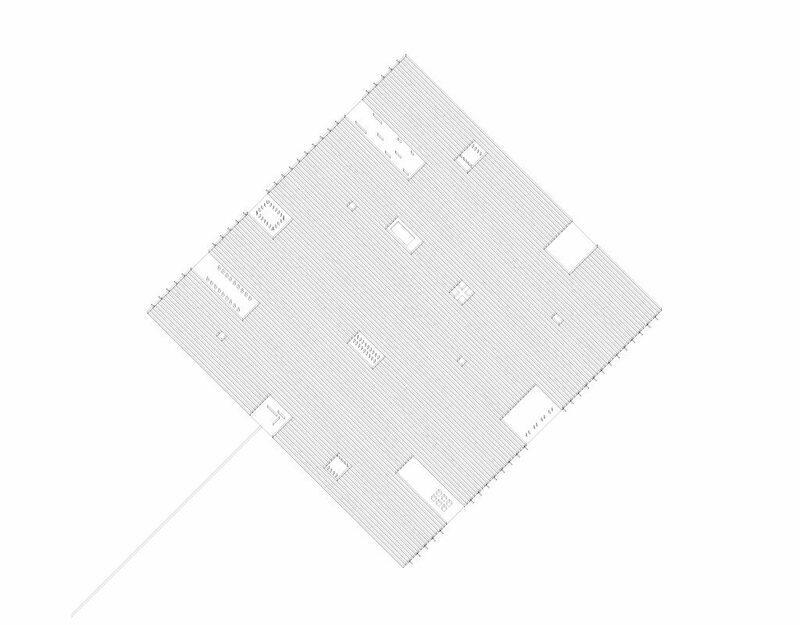 By cutting the top in an oblique way one gets a glimpse of that what one cannot enter. 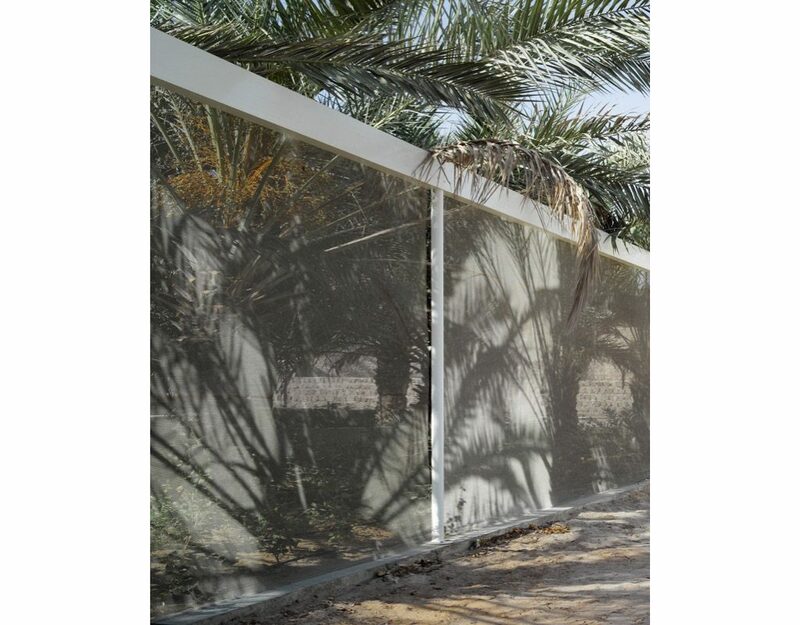 The intervention had to be cheap and was to be constructed by the theater company itself, but had to be durable, since most of the time, in between plays, the wall was simply there without protection. These goals were achieved by using very light, undulating galvanized steel plates, used in two layers in different directions to create a stiff whole. 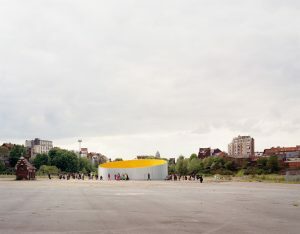 Ultimately, by painting the interior steel plates bright yellow, the interior of the wall, inaccessible as it is, became from afar its protagonist: as a gigantic egg yolk or a sun perhaps. The center of Brussels has a periphery inside. 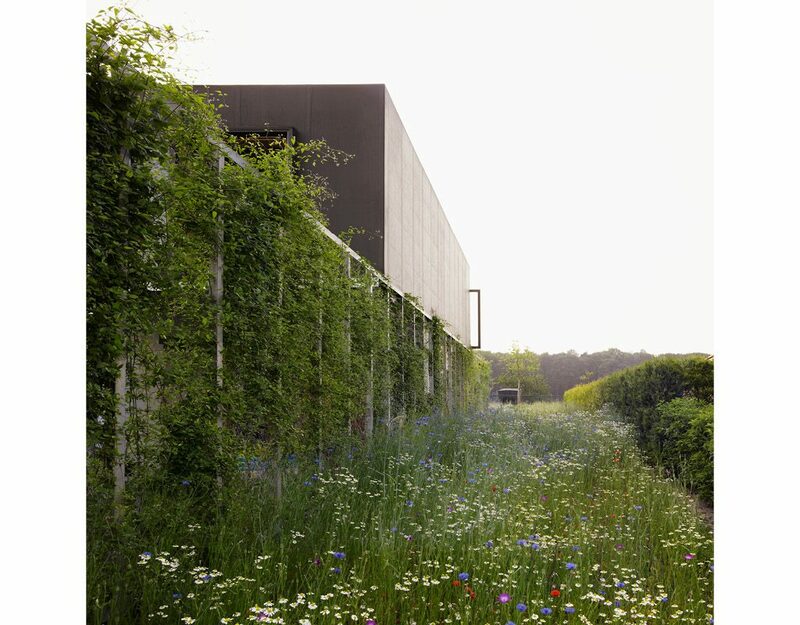 A piece of landscape, green, open, idyllic, as if it were on the fringes of the city (where it touches the forest) is to be found in the midst of it. 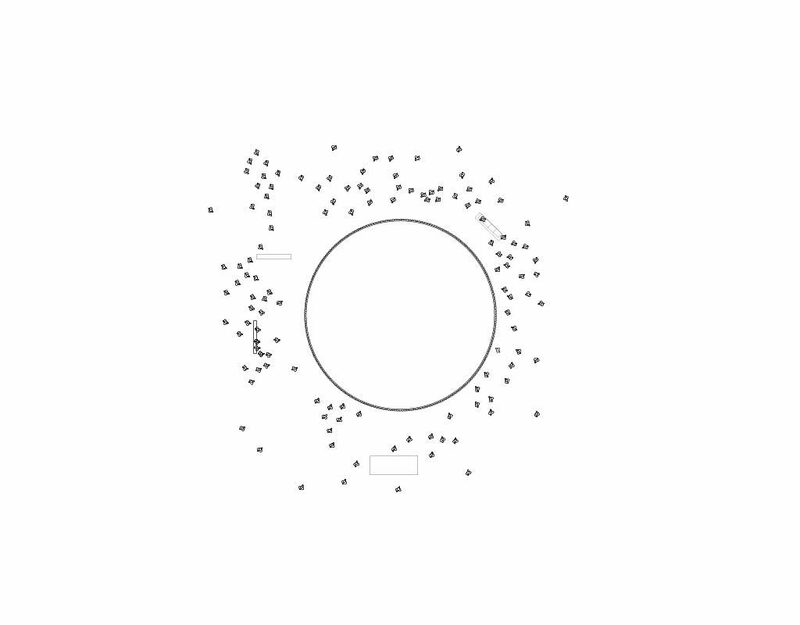 This particular condition is easy to destroy. 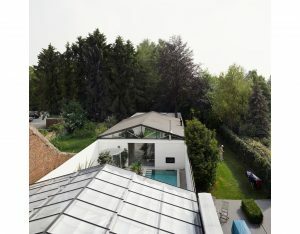 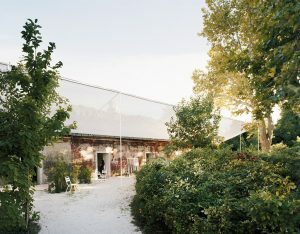 In order to double the surface of a seemingly freestanding house in this strangely lush environment, it was decided to elegantly underline the existence of everything there already was, to celebrate the status quo and to simultaneously make the addition disappear by making it extremely visible, making it, in a sense, the protagonist. 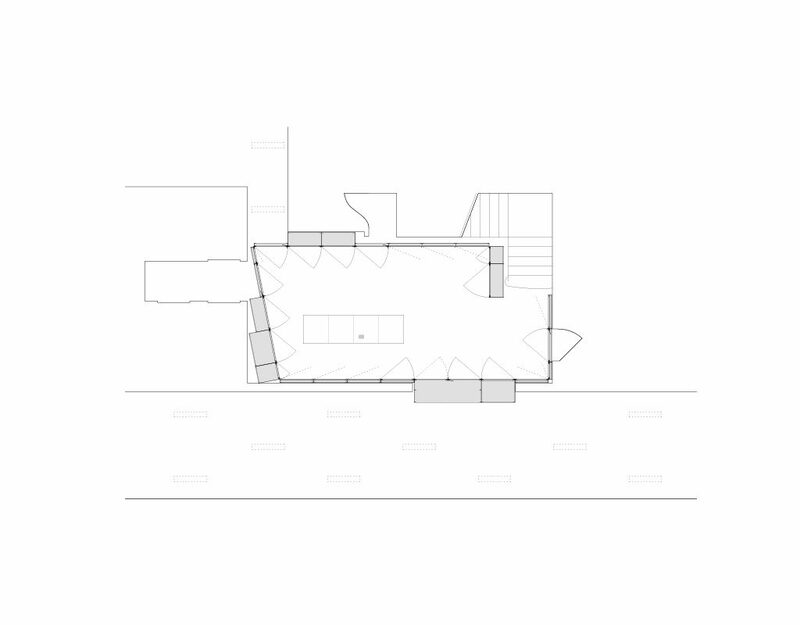 The new addition is projected under the existing house, not adding any new volume, but effectively creating its pedestal. 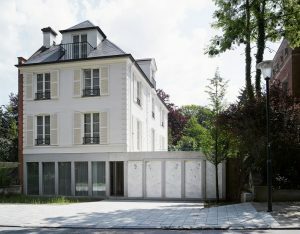 The pedestal turns the existing house into an exhibited object: maintained, cleaned and restored—undone of its original importance. 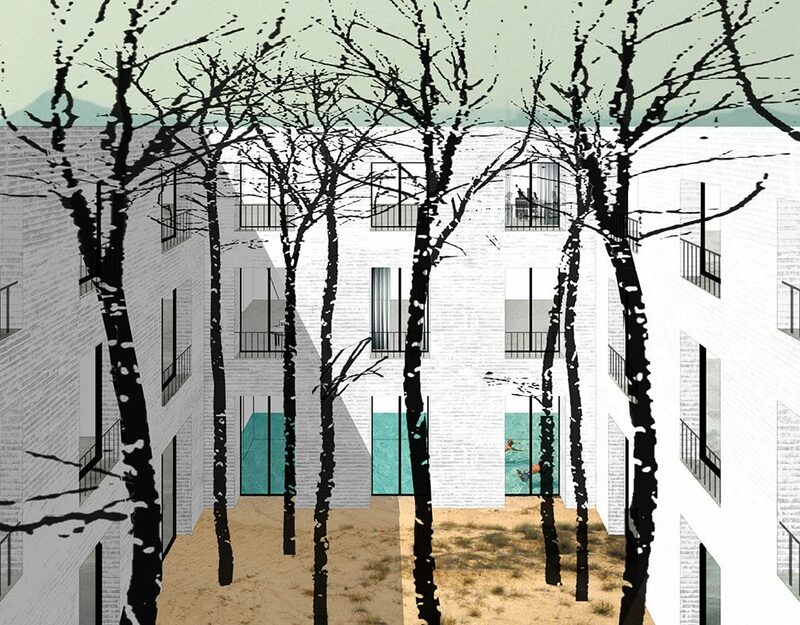 The existing house becomes a night house, a ghost house on top of a new, excavated villa. 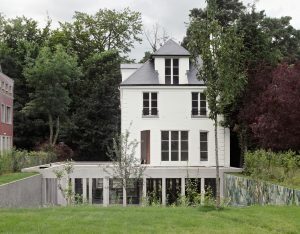 The villa is simultaneously new and old. 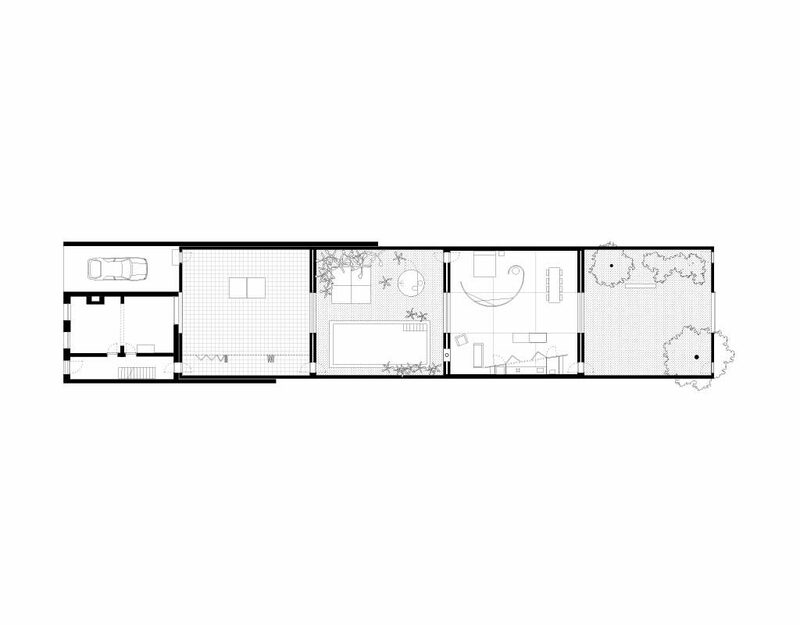 It is a house designed as a set of different spaces traced by columns. 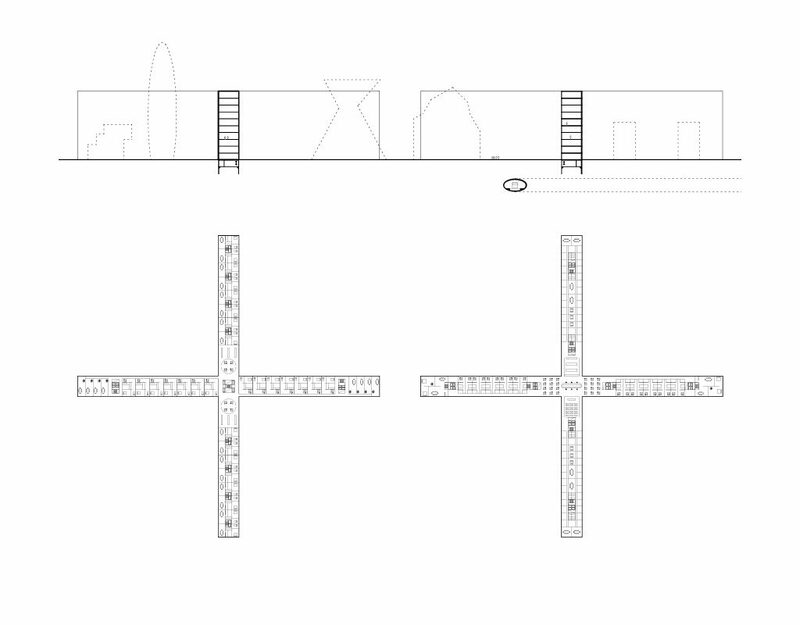 The column rhythm defines plan and sequence: a set of spaces which are not functionally defined. 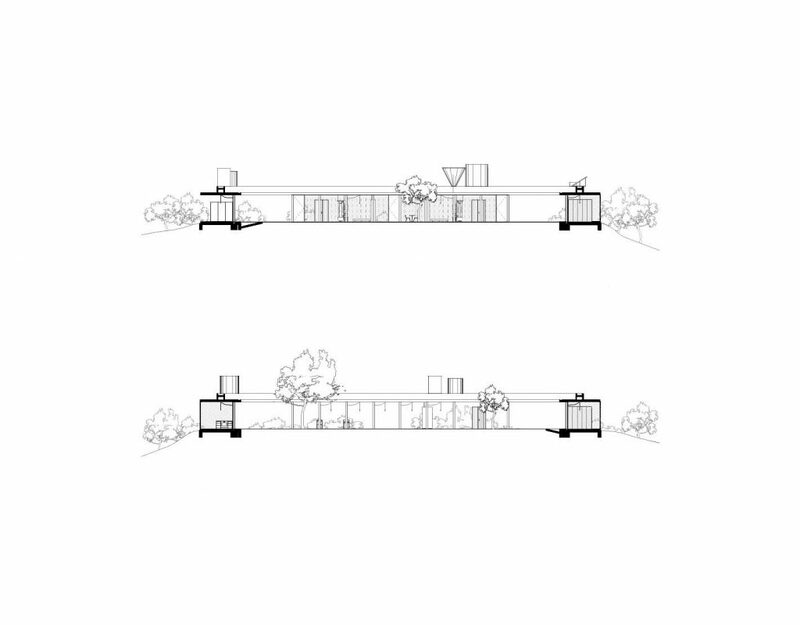 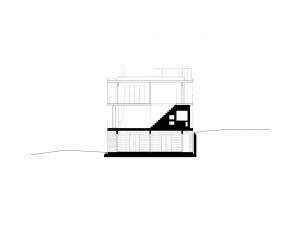 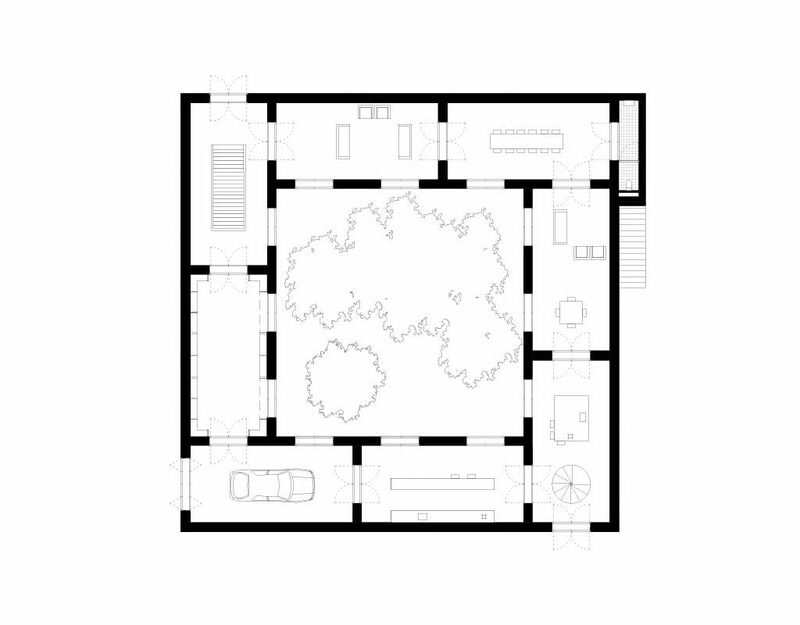 The villa presents itself as a remnant of a house; a set of tectonic elements crating different spatial hierarchies. Sometimes the spaces are open to the sky; sometimes they get their light indirectly. 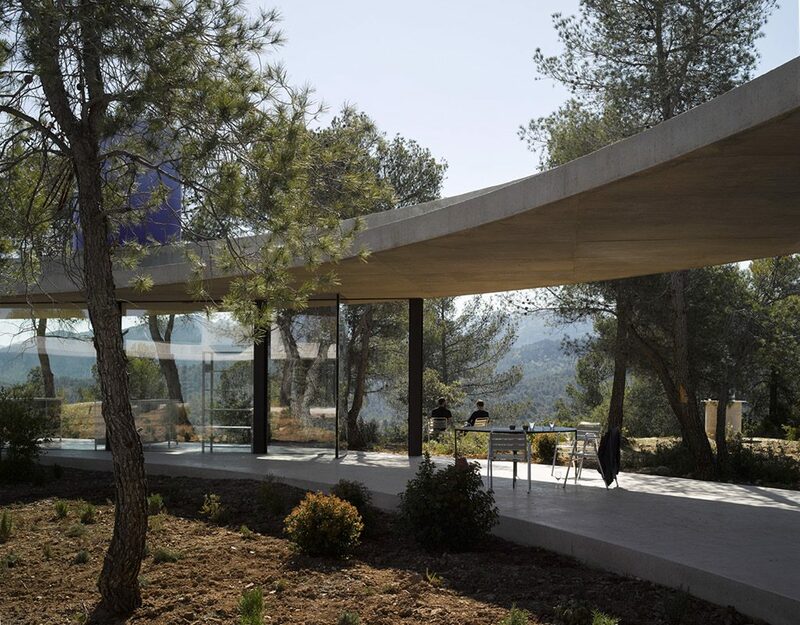 The structure is made of massive concrete beams and columns, measured with maximal tectonic effect. 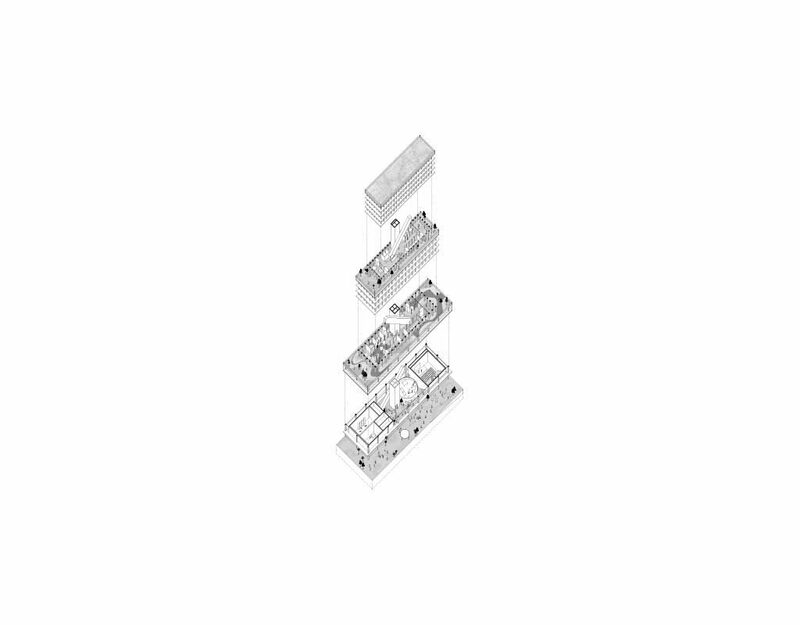 The structure is translated into a spatial idea. 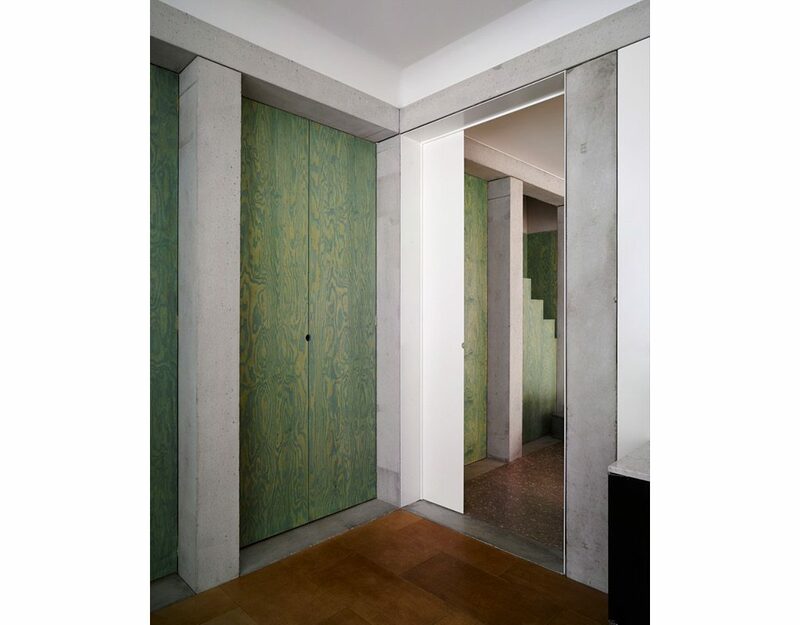 Concrete columns become stained wooden columns as soon as one crosses from inside to outside, effectively creating a spatial construct, a spatial sequence of hypothetical places to stay. 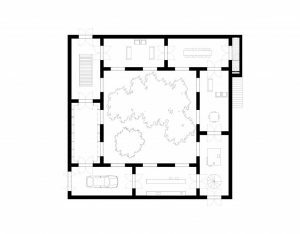 The villa thus exists in the green island that is maintained by its very existence, a conscious contribution to an urban tissue on the verge of extinction. 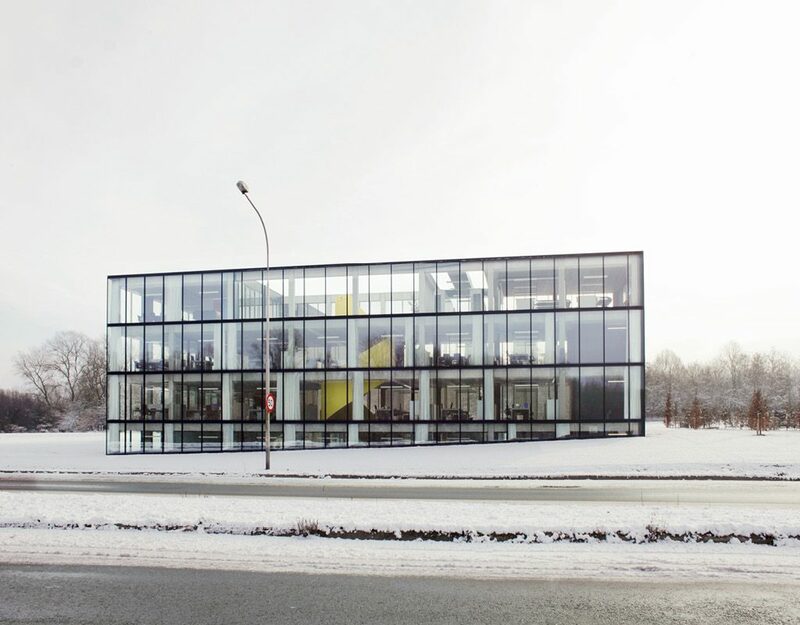 This office building, housing the West Flanders Chamber of Commerce, stands like a villa in the landscape of the urbanised edge of Kortrijk. The building is conceived as having two faces, like the Roman god Janus, showing distinctly different aspects to the street and the garden. 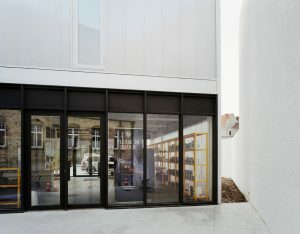 The representative façade on the street side, completely of glass, displays the organisation’s operations like a billboard in a giant concrete cabinet. 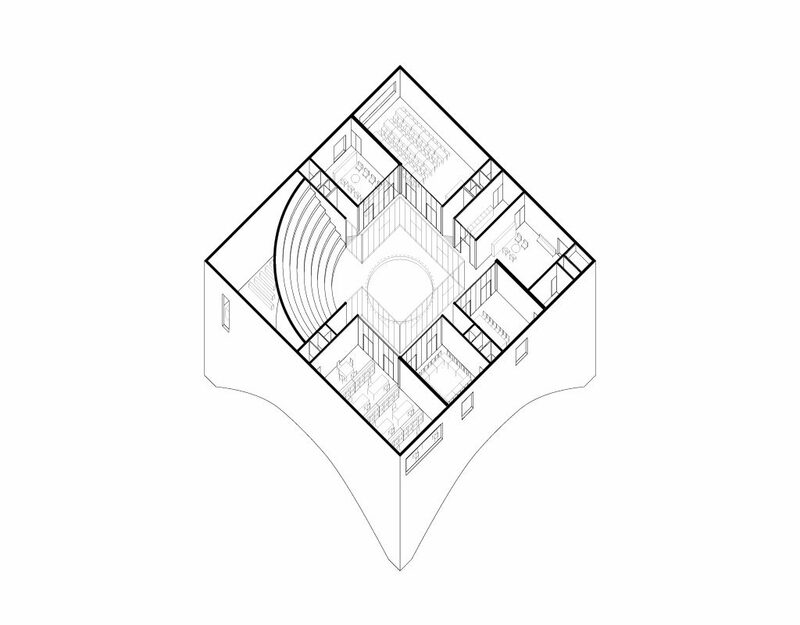 The only architecture within the open plan are the two prominent staircases. The entrance is on the more intimate side of the building facing the garden. 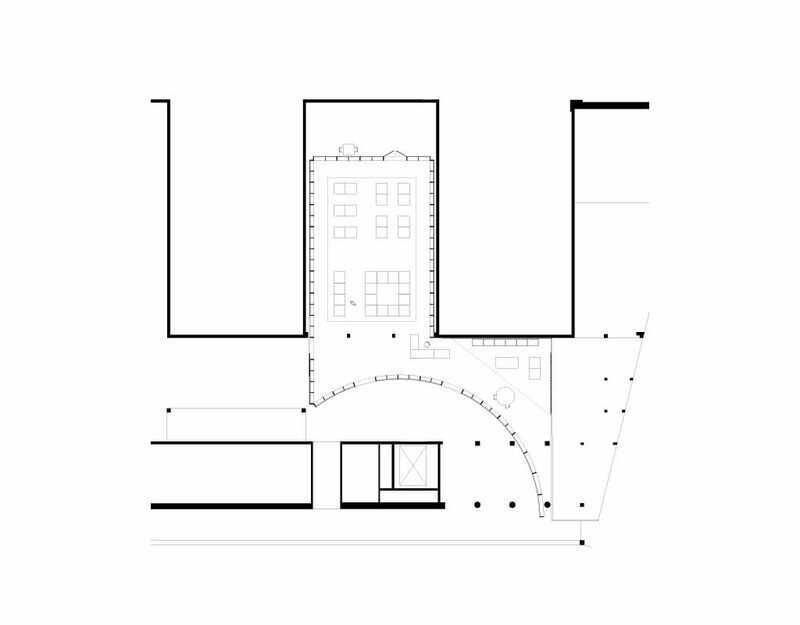 Its V-shape frames a part of the landscape and embraces the entrance plaza with a lower-lying patio, around which all the public parts of the building are accommodated. 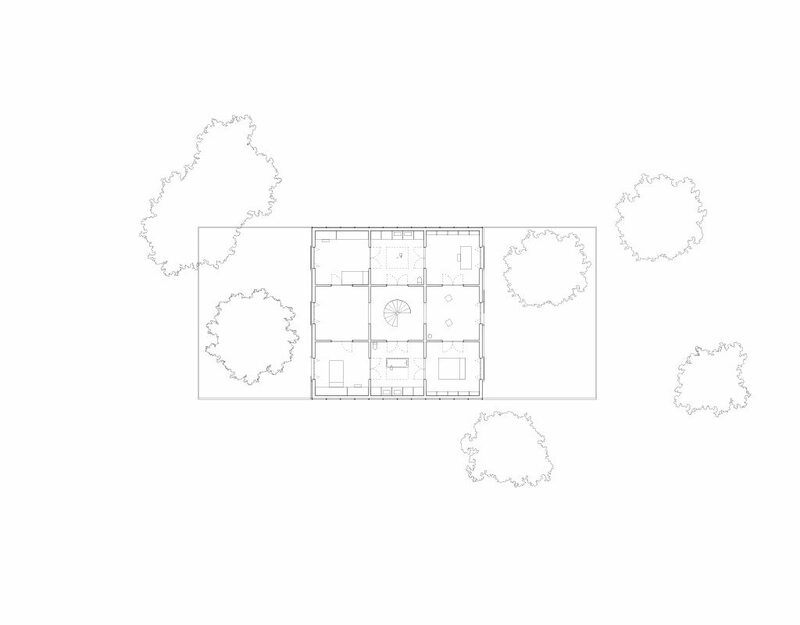 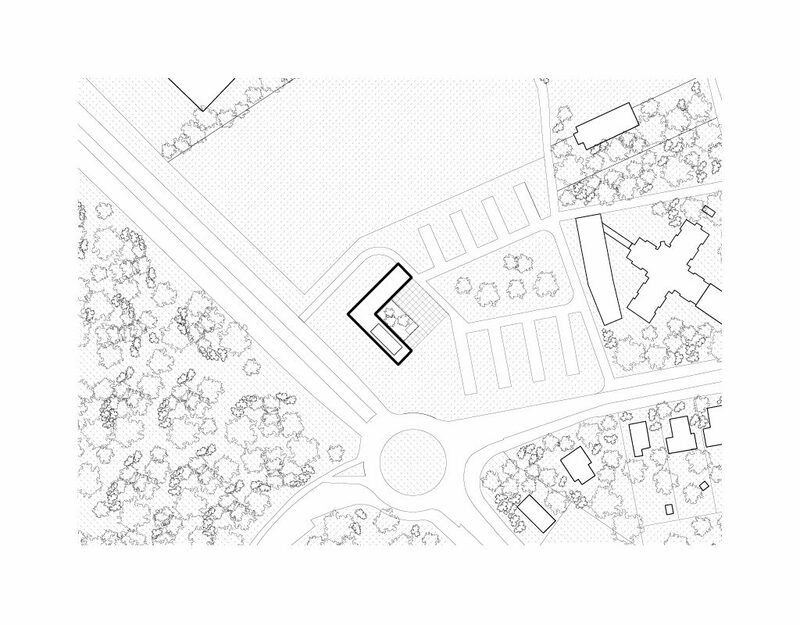 Here ‘Villa Voka’ forms the edge of the “meadow”, an open place in the wooded landscape. 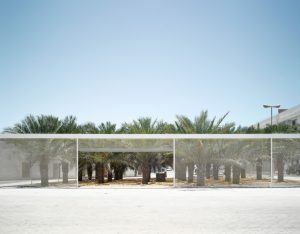 Both the façade and the plaza are finished with steel grid work that shields them from the sun out of the south, and also serves as a uniform and abstract material for the frame around several trees. 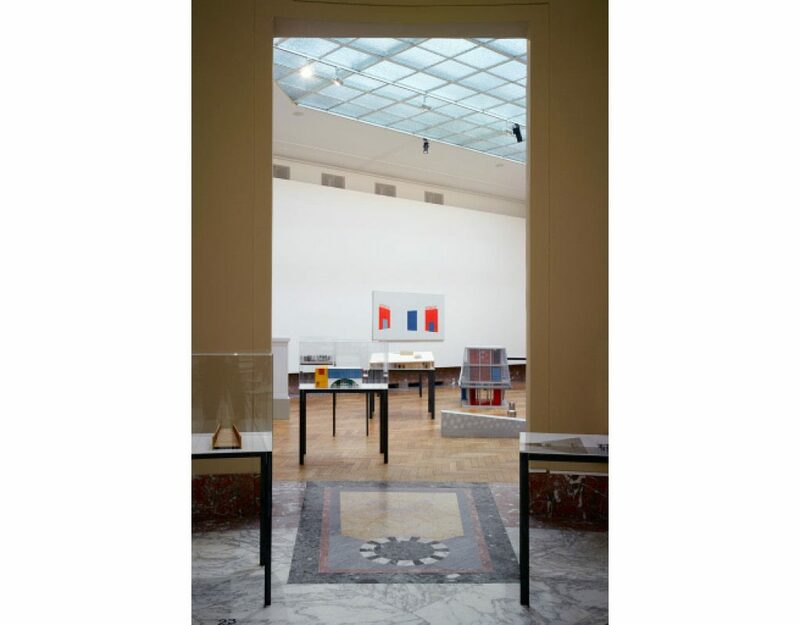 Seven Rooms, curated by Möritz Küng, was the first major retrospective exhibition of OFFICE, at deSingel Arts Campus in Antwerp, BE. 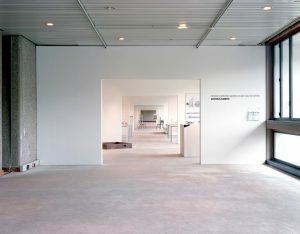 For this, an existing 80m long corridor of the complex was divided by eight white plaster boards into seven equal sections. 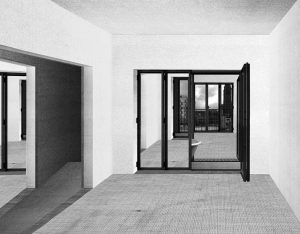 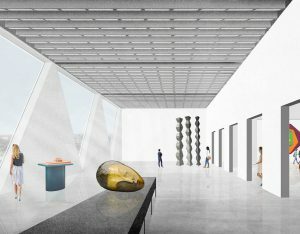 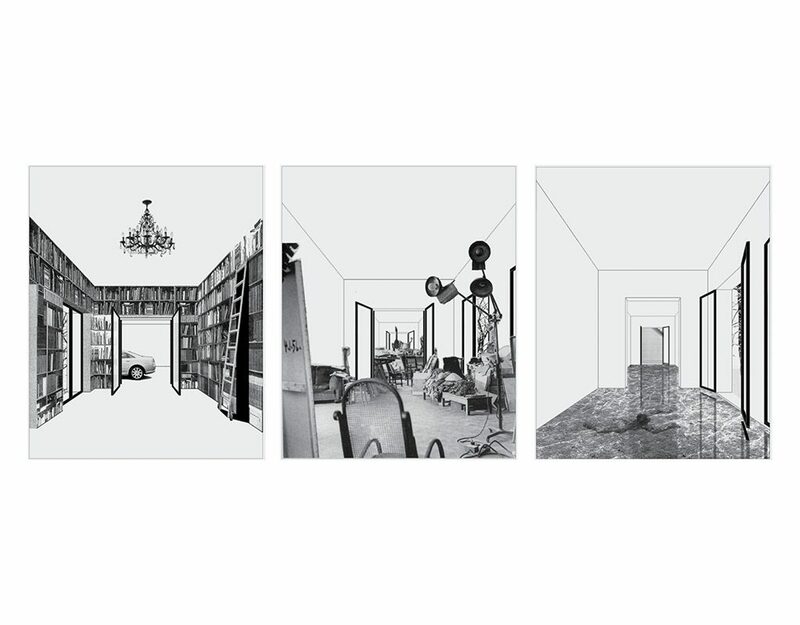 The sequence of rooms could be entered from both ends, and each room enclosed a composition of models and images depicting a certain project or a theme. 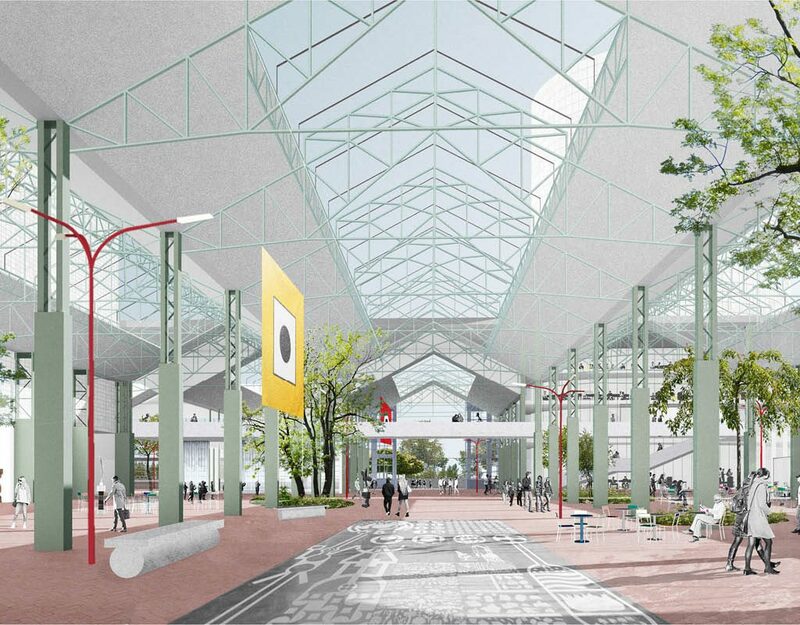 In the medium-sized city of Turnhout, part of the ring road will be tunneled, freeing an area between the centre and the city park. 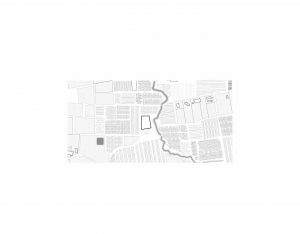 The Master plan for this area comprises of several interventions, re-instating the existing park as a ‘Central Park’ for Turnhout. 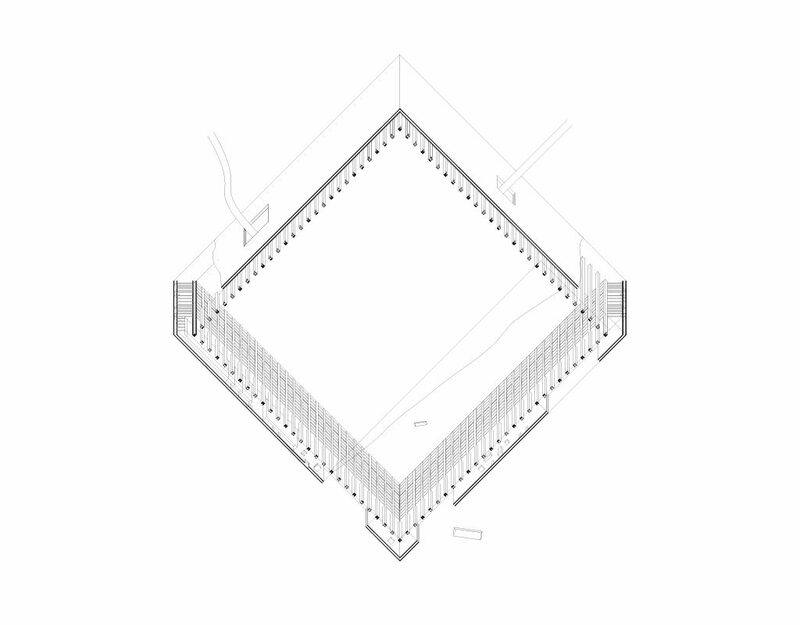 The key element is a dyke above the half-submerged tunnel. 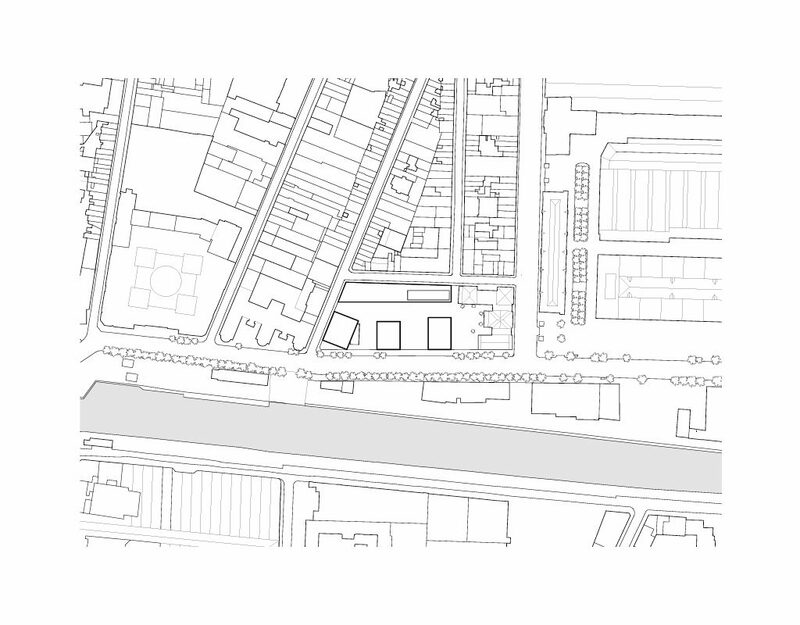 The dyke formalises a new urban edge and extends the park over the ring road towards the city. 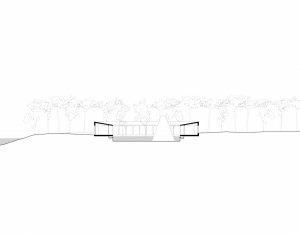 It is at the same time a barrier to and vantage point over the park. 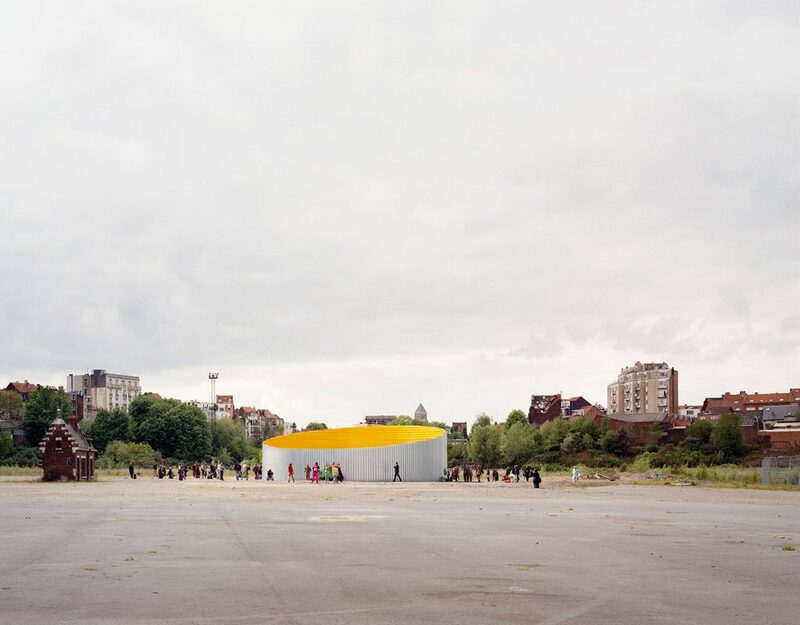 In the park itself several scenic interventions enforce the existing structure. 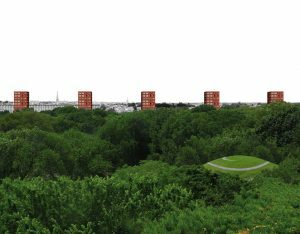 At the other side of the dyke a row of 4 towers, evenly spaced, marks the southern limit of the city. 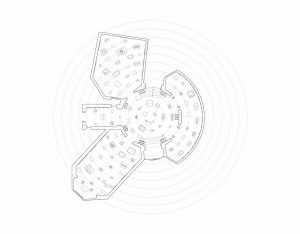 The proportion of the towers allows for different programs, living, offices and the extension of the neighbouring hospital. Between the towers low rise buildings are developed around courtyards which open towards the park. Competition i.c.w. 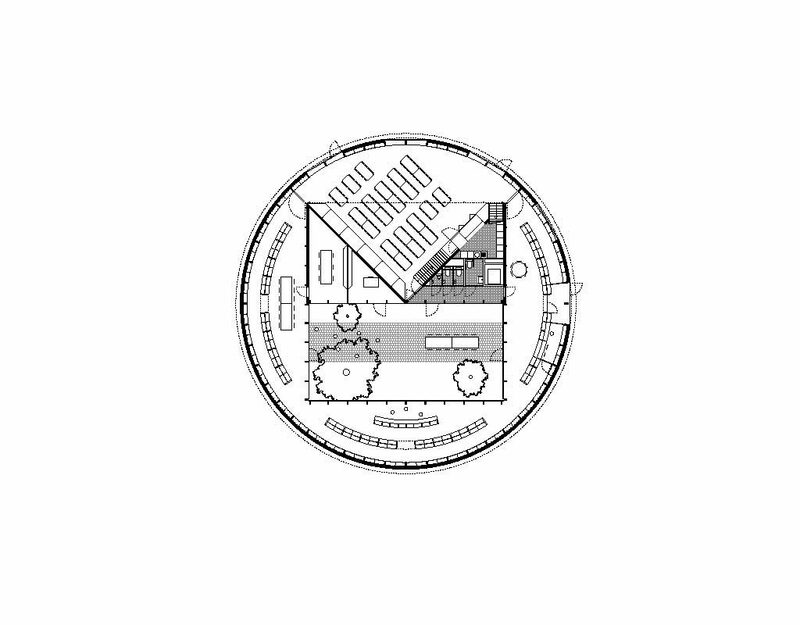 Technum, 1st Prize. This weekend house occupies the complete surface of a deep lot in small town in Flanders. 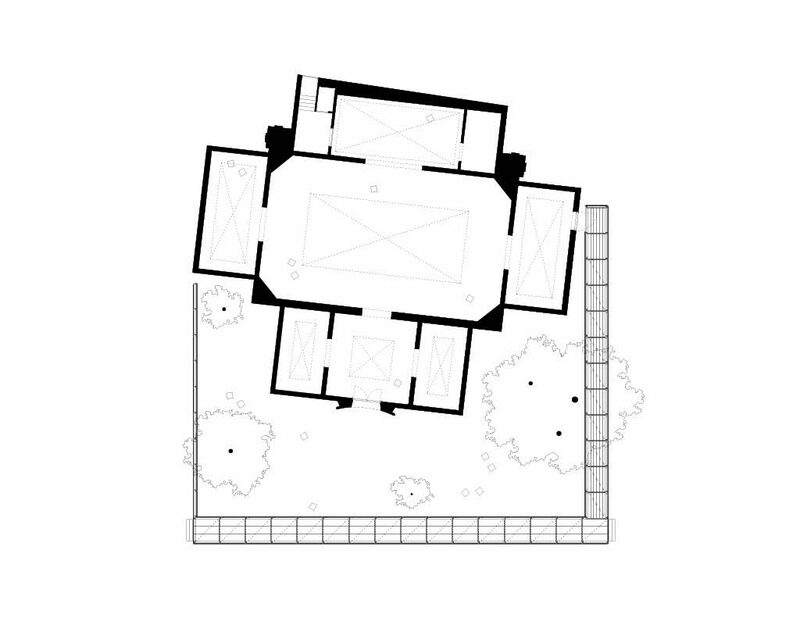 The long backyard of an existing rowhouse is transformed into the weekend house proper; the whole length becomes the house, turning the existing building into a guest house. 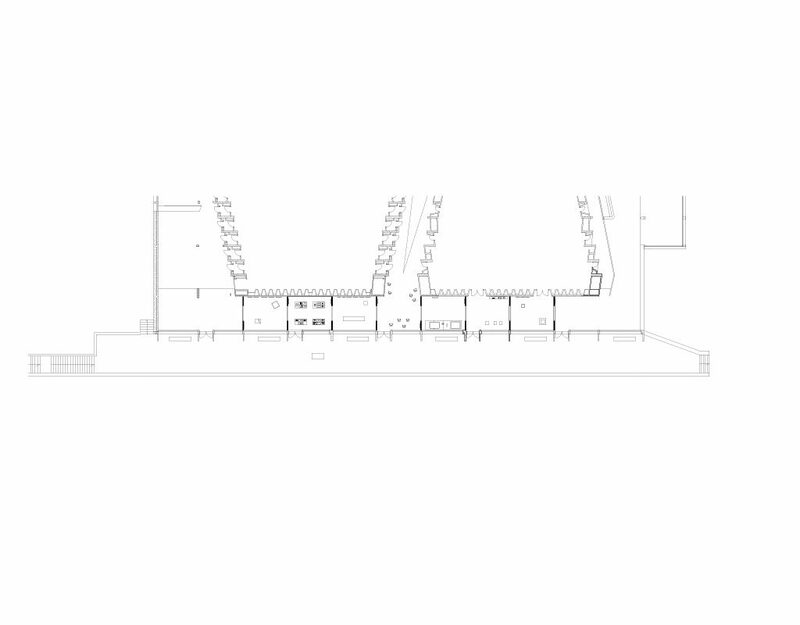 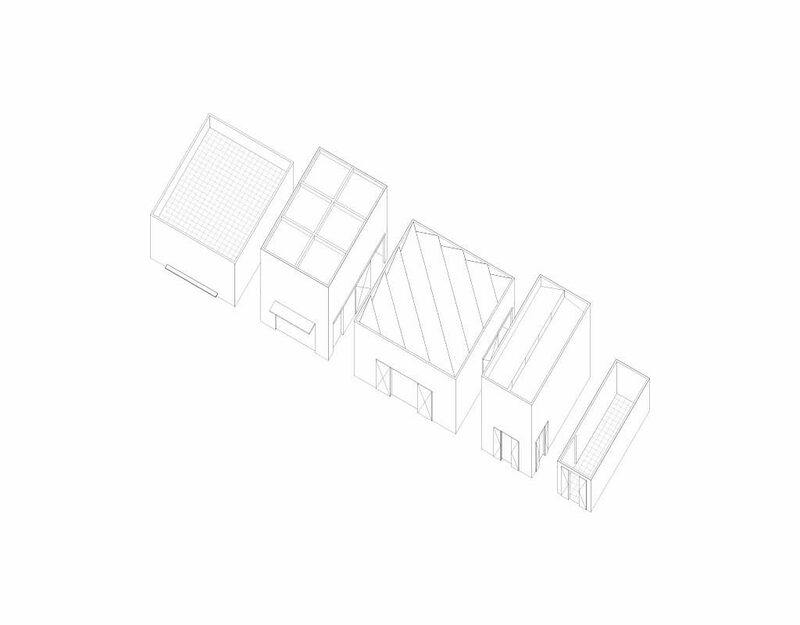 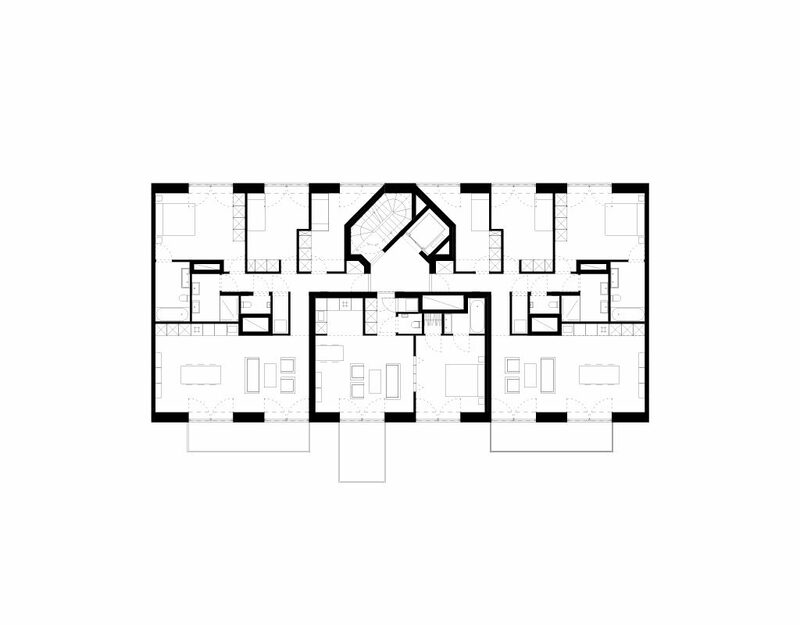 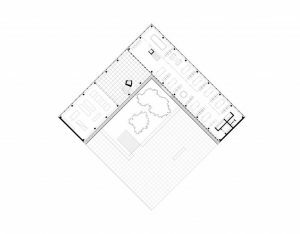 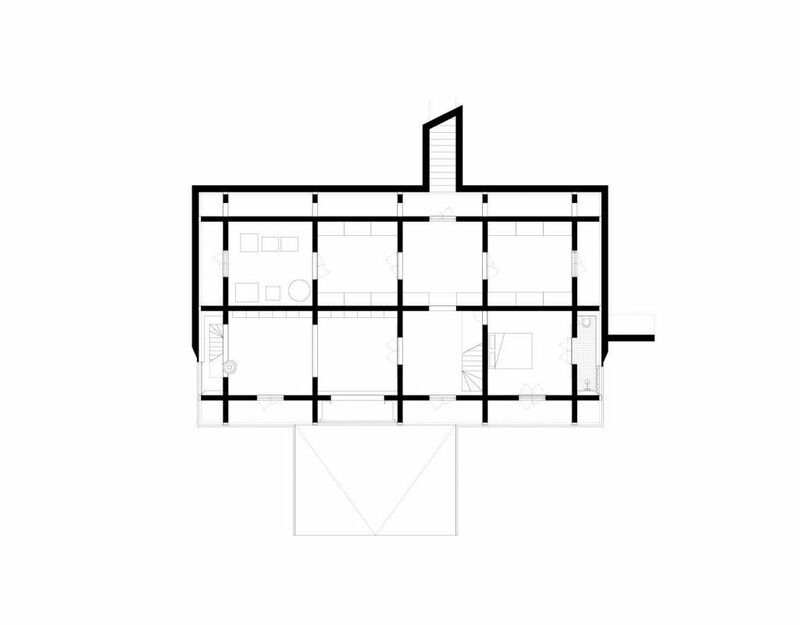 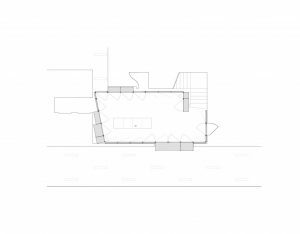 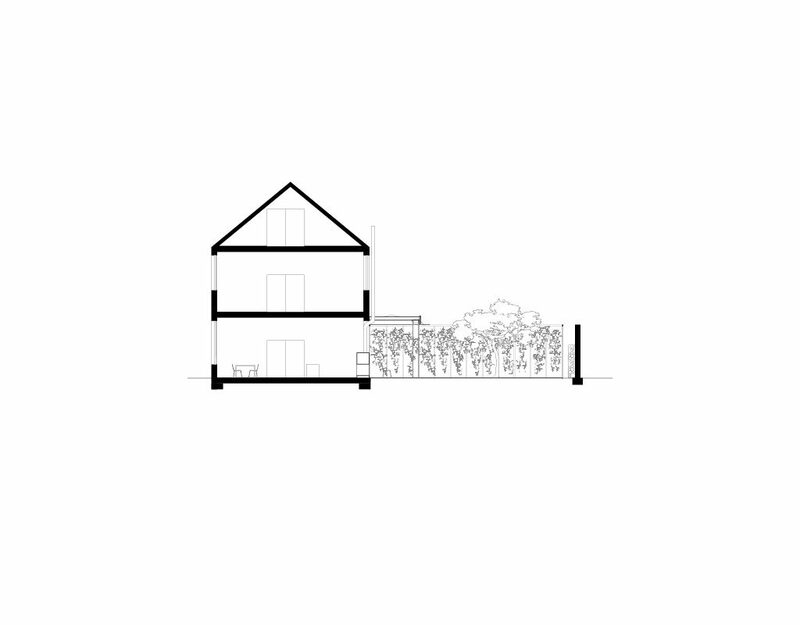 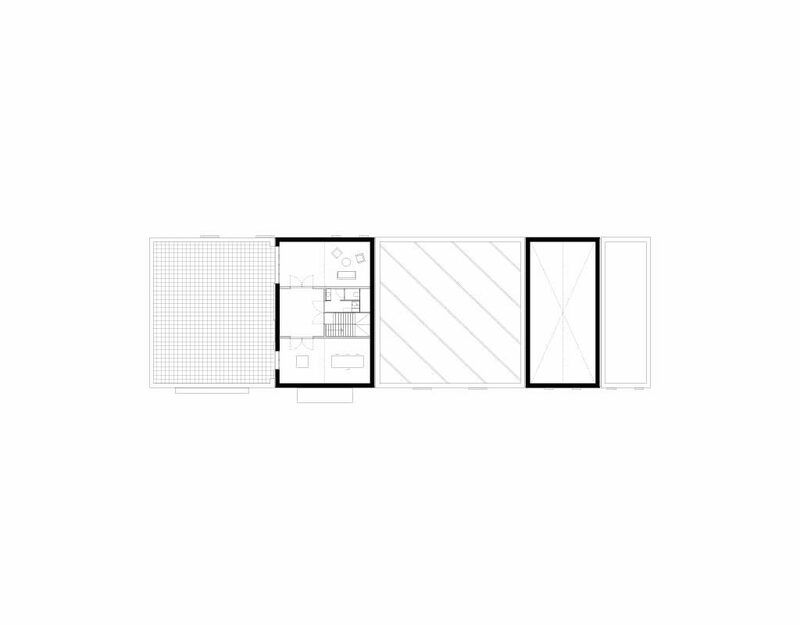 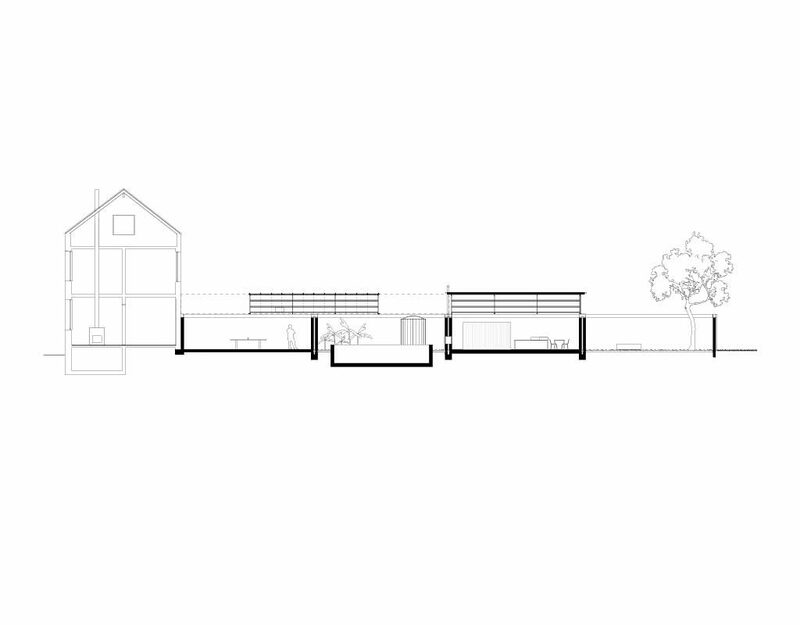 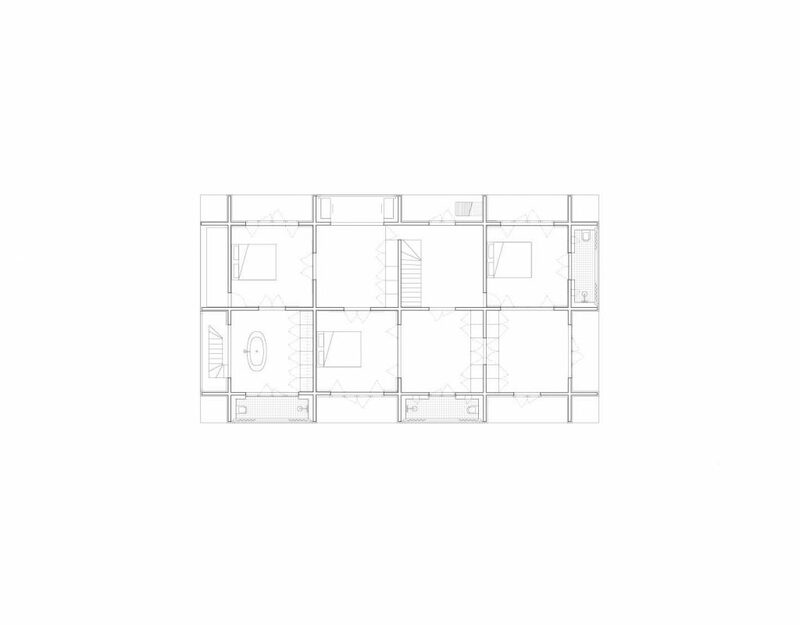 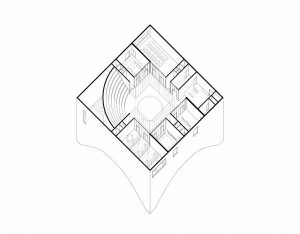 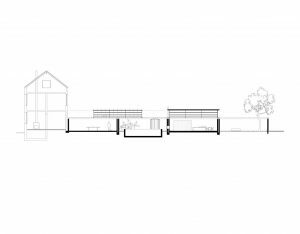 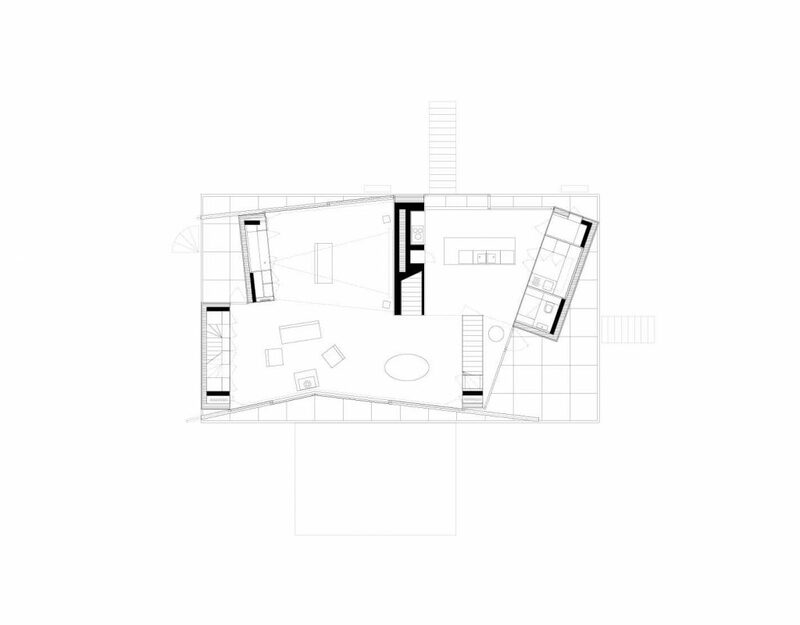 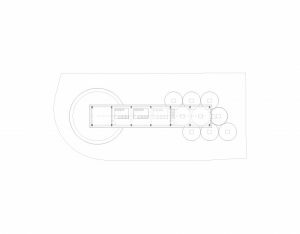 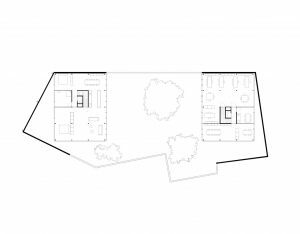 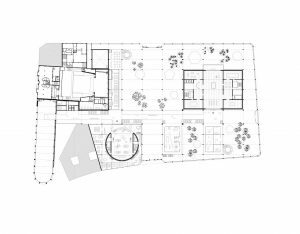 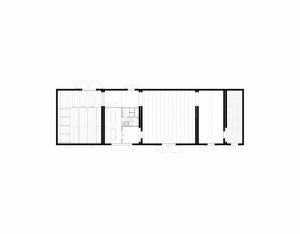 The new house is organized as a perspectival sequence of four equal rooms, thus providing a sequence of similar spaces whose infill is always different. 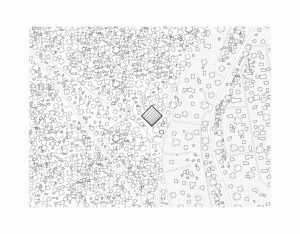 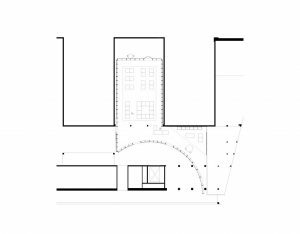 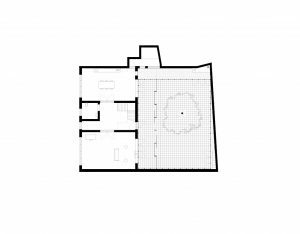 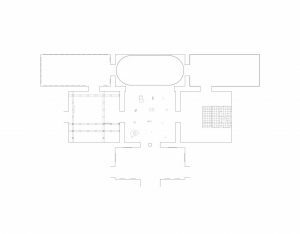 The sequence of spaces organizes a variety of distinct characteristics—a garden, a pool house, a courtyard, a living room. 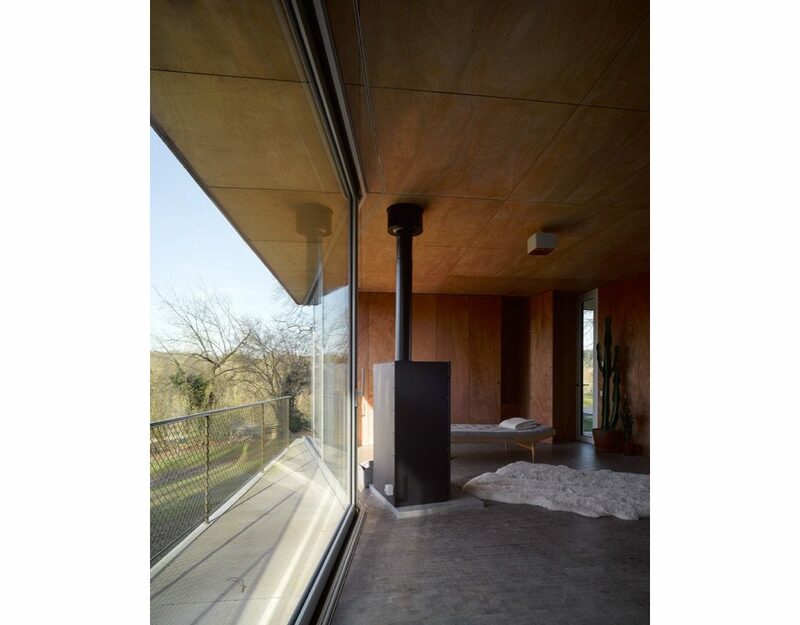 Central wall openings create an enfilade throughout the different spaces and a sliding glass roof enhances the flexibility of their usage. 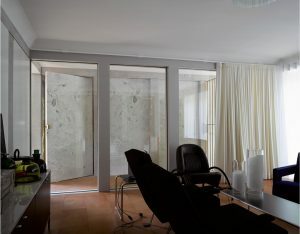 Each of the rooms gets its specificity through its particular furniture. 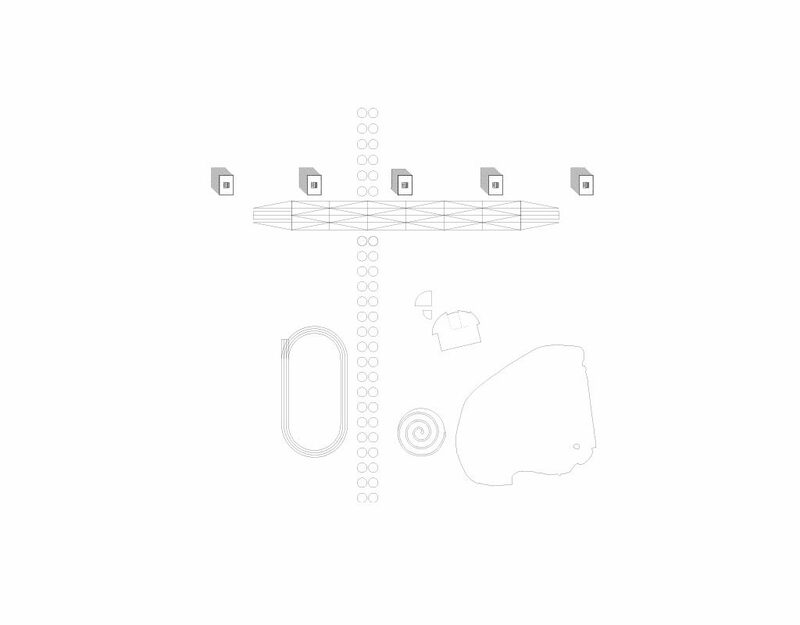 Together they form a set of interlocking mini-universes. 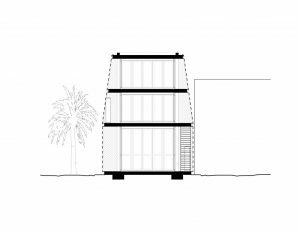 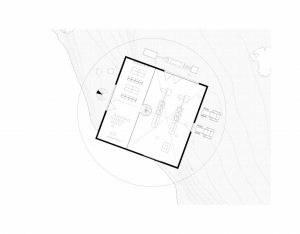 The core of the house is formed by the middle two rooms: one with a fixed roof, where two wood elements make the space inhabitable; and the other is a tropical greenhouse with a mobile roof, which contains a bathroom unit and a swimming pool. 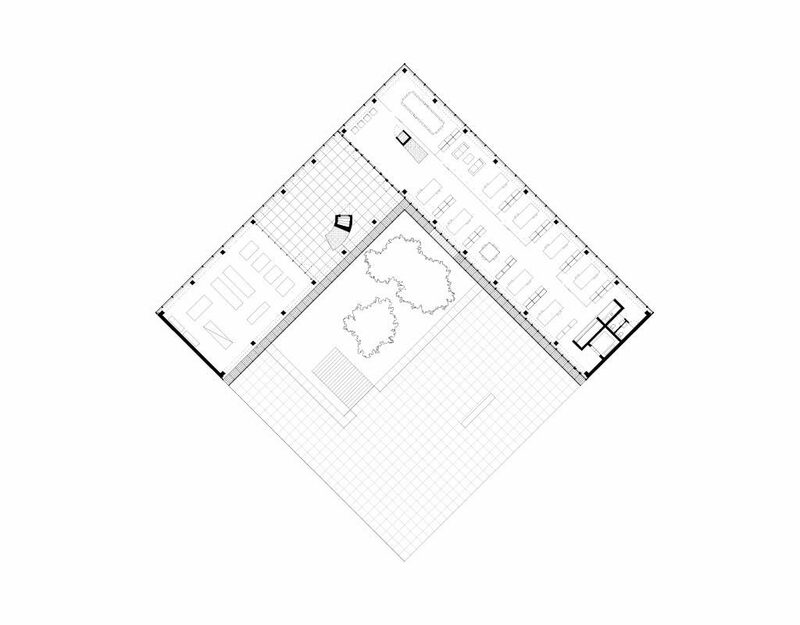 On each side of these two rooms one finds a garden room. 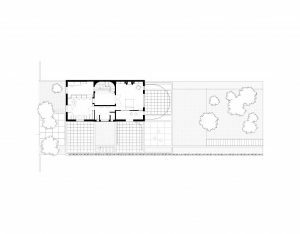 Closest to the living room is a simple green landscape, and between the green house and the guest house a paved courtyard. 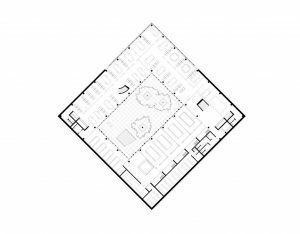 Each of the fixed elements in the room is an actor in the composition, carefully designed to live together with the residents and furniture. 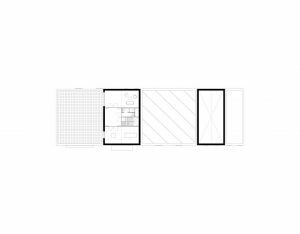 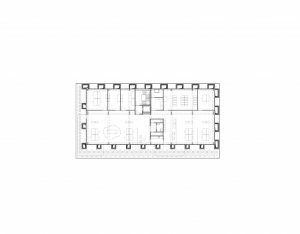 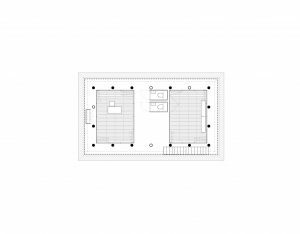 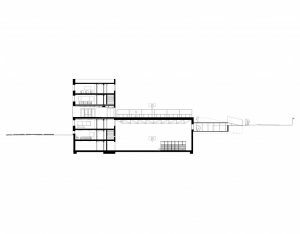 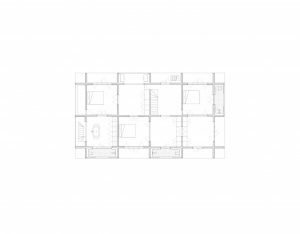 The design for a 1000 m² residence is reduced to the design of just one component, a room: a rectangular space with four entrances and no prescribed function. 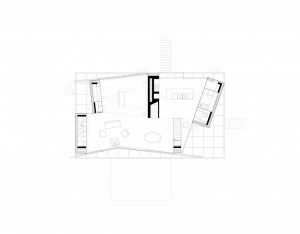 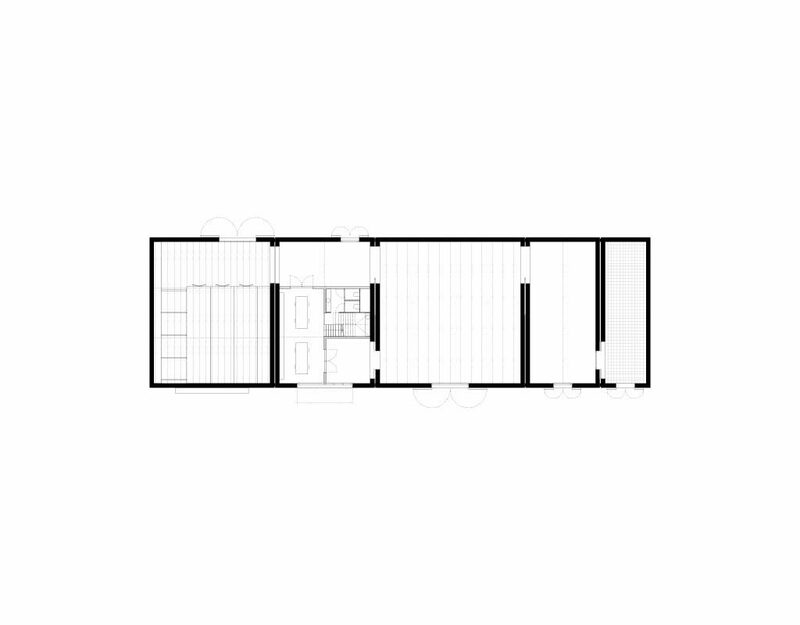 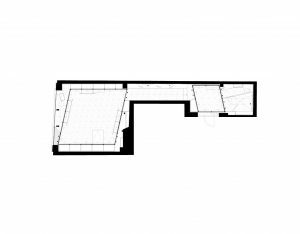 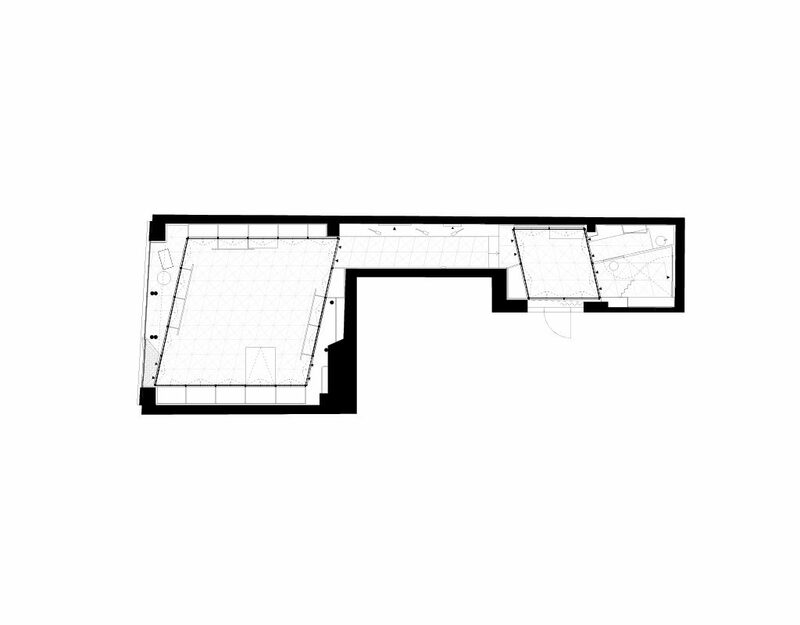 The room receives its individual character only through its ceiling height and its relative position in the house. 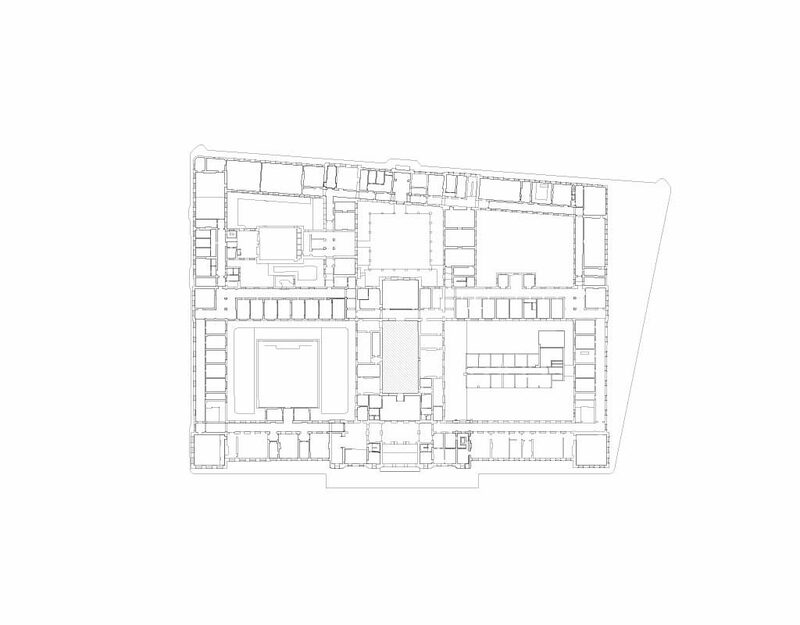 Twenty-four identical rooms are organised over three storeys, each time forming an enfilade around a central atrium. 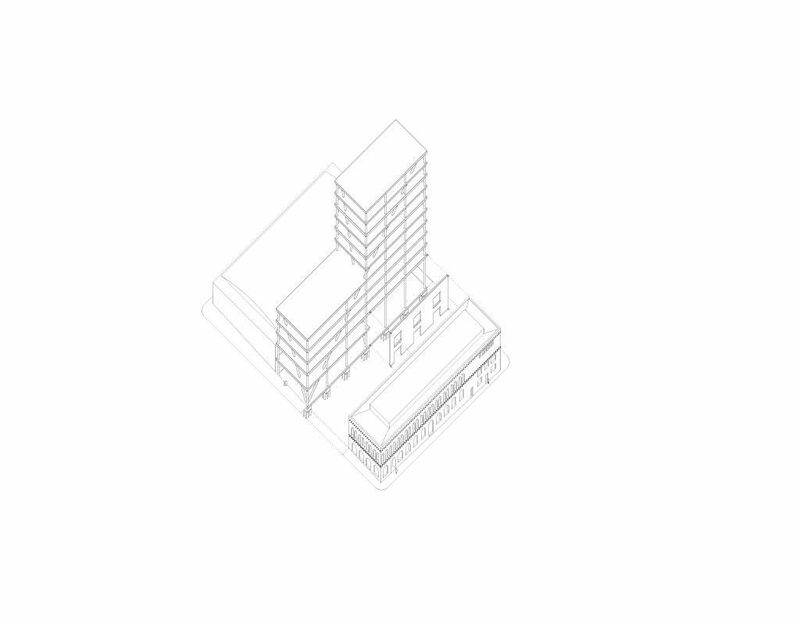 Because the building is sunken into the ground, only the top storey can be seen in the residential neighbourhood, like the tip of an iceberg. 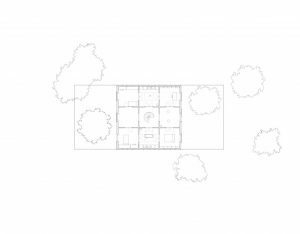 The inner garden is the actual outdoor space of the house, which tempers the harsh climate. All of the rooms are oriented to this sheltered interior garden. Two flights of stairs, which stand in the middle of the room like a piece of furniture, provide the connection between the storeys. 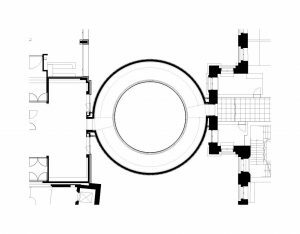 The luxurious aspect of this residence is not in an extravagant form or use of materials, but in the abundance of spaces. 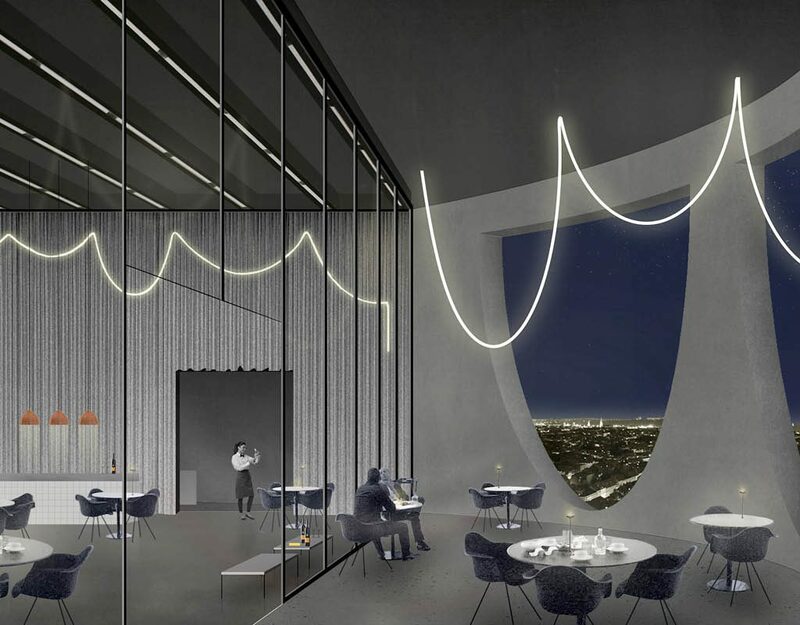 The enigmatic 25th room on the roof is for the attendant: a lookout post on a thick wall. 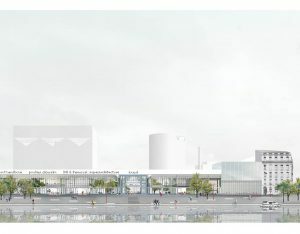 Design by invitation of Herzog & De Meuron. Curated by Ai Wei Wei. In the Belgian pavilion for the 2008 Venice Biennial the existing pavilion is enclosed by a seven-metre high wall, and thus separated from the predominant context of the architecture biennial. 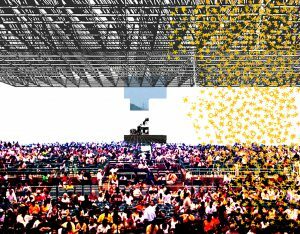 The floor of both the existing pavilion and the new ‘garden’ is covered with a layer of confetti. 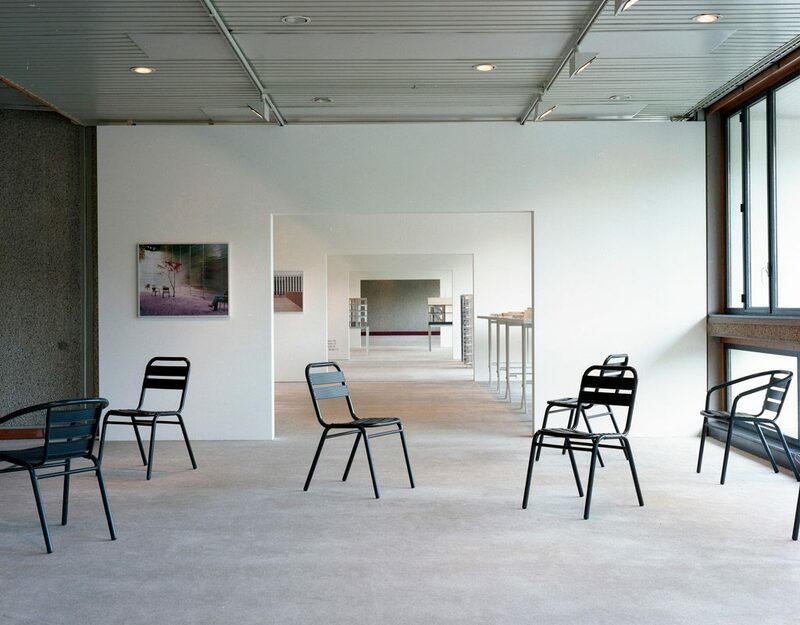 Chairs are spread here and there around the new pavilion. The existing awning under the skylights of the pavilion was removed so that sunlight streams directly in. 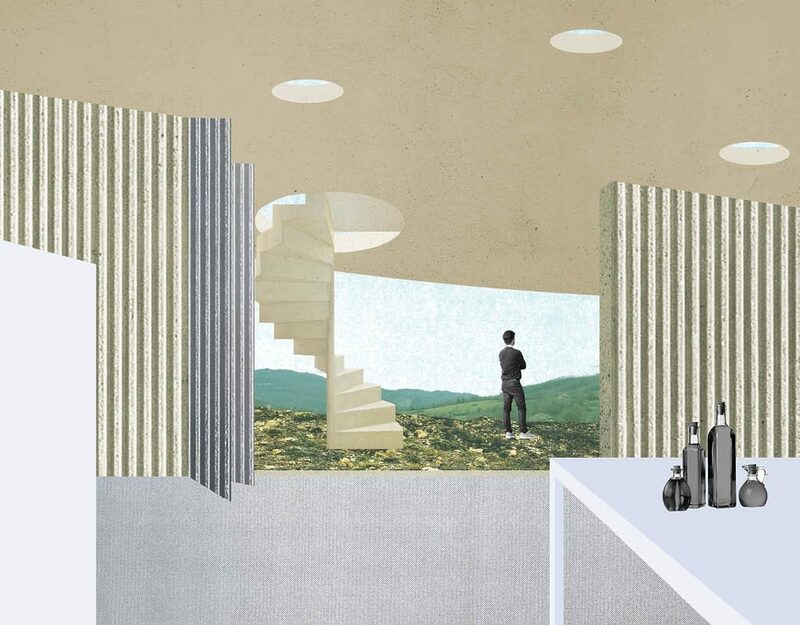 Visitors walk through between the two layers of the outer wall and enter the original pavilion through a side entrance, disorienting them before their experience of a new aggregate of spaces. 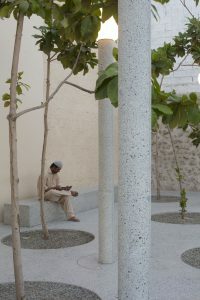 In the new walled garden of the pavilion one can sit in the sun or under the shade of trees. 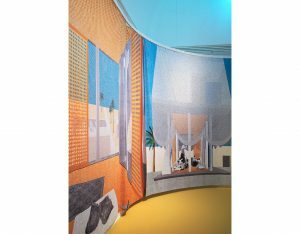 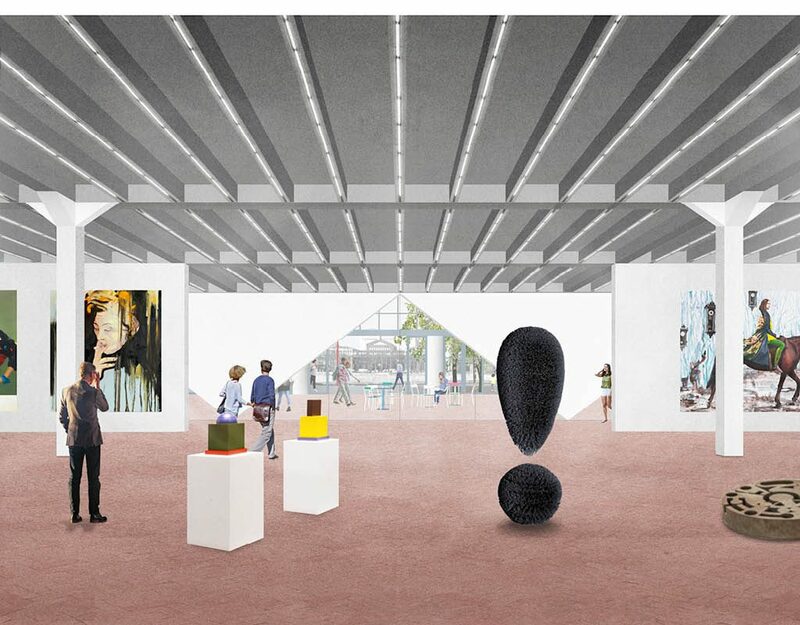 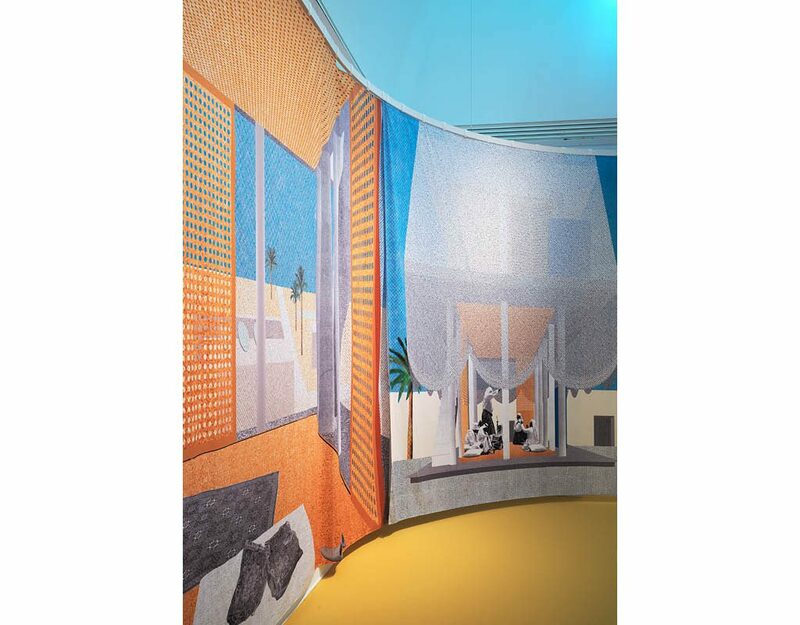 The new Belgian pavilion frames and displays the original pavilion, a piece of architecture that has been constantly adapted and transformed over the years. 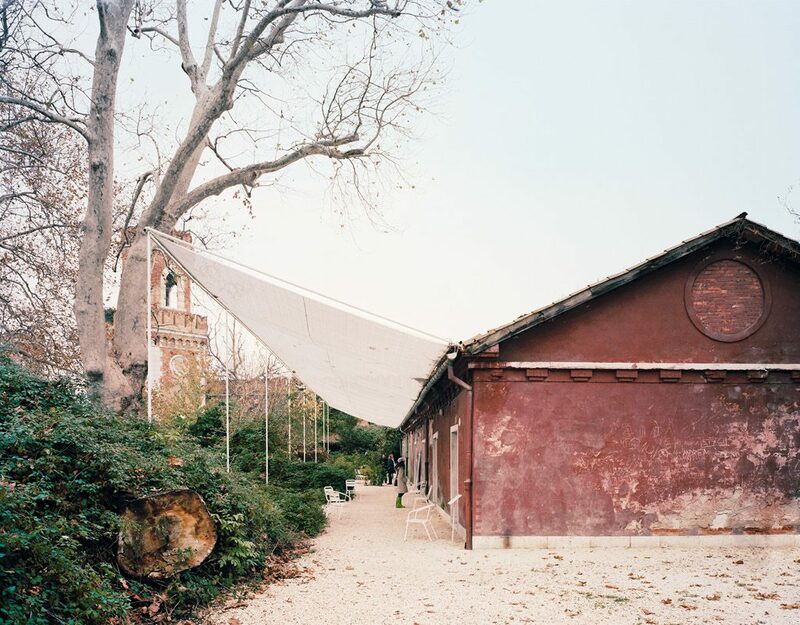 Belgian Pavilion for the Venice Bienneal of Architecture 2008. Invited competition among 13 young Belgian practices, 1st prize. Photos by Bas Princen. 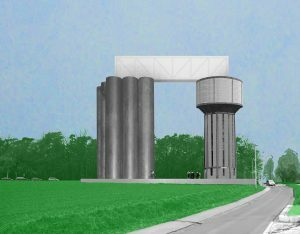 A water silo is placed next to an existing water tower, with which it is connected by means of a bridge. 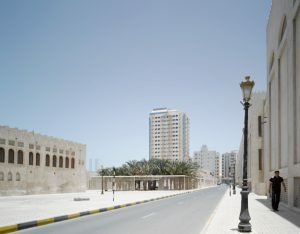 The old tower loses its function, but is preserved. 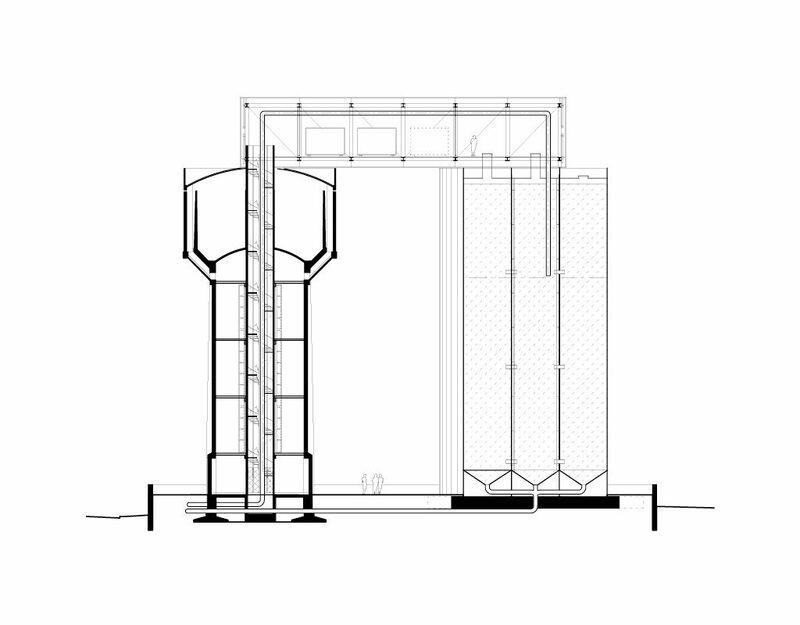 The new silo is comprised of nine connected chambers which, because of their individual measurements, can be brought to the site as ready-made cylinders. 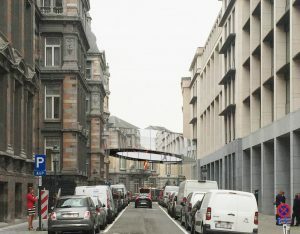 The connecting bridge contains all the necessary technical services and antennae. 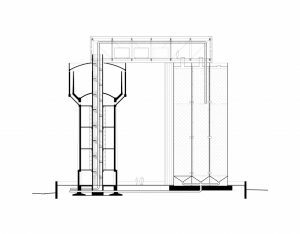 In this way the new silo functions specifically and only as a water reservoir. The interior of the old water tower is stripped out, containing only a stairway that provides access to the technical bridge. The composition of tower, silo and bridge creates a window to the landscape, lending a public character to the silo complex without the objects themselves being accessible. 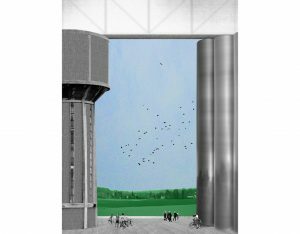 At the foot of the complex passers-by find a place to pause, a balcony that frames the Brabant landscape. 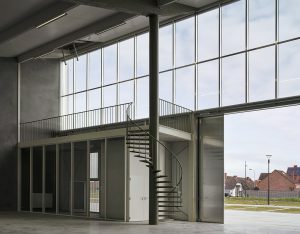 The party walls of a lot in Tielt are raised to their maximum height. 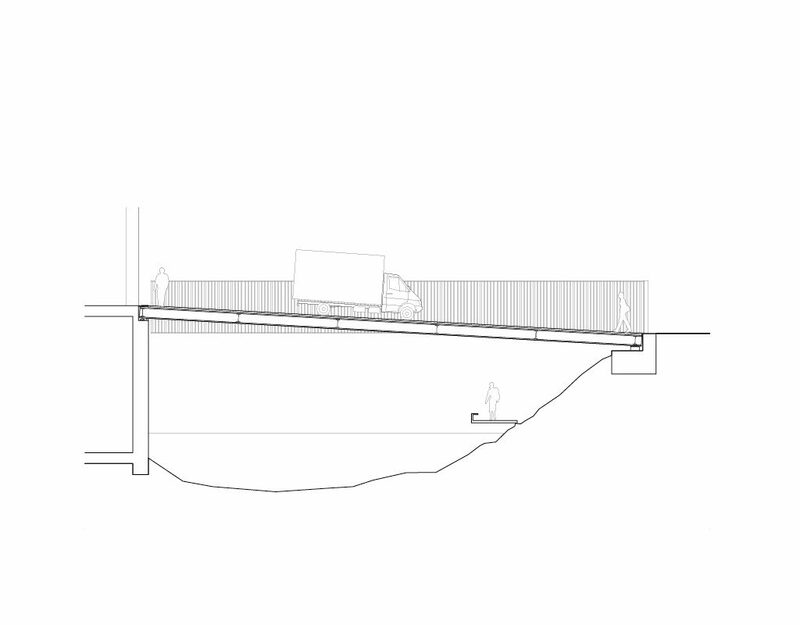 On the side toward the street the elevated wall forms a wide entrance. 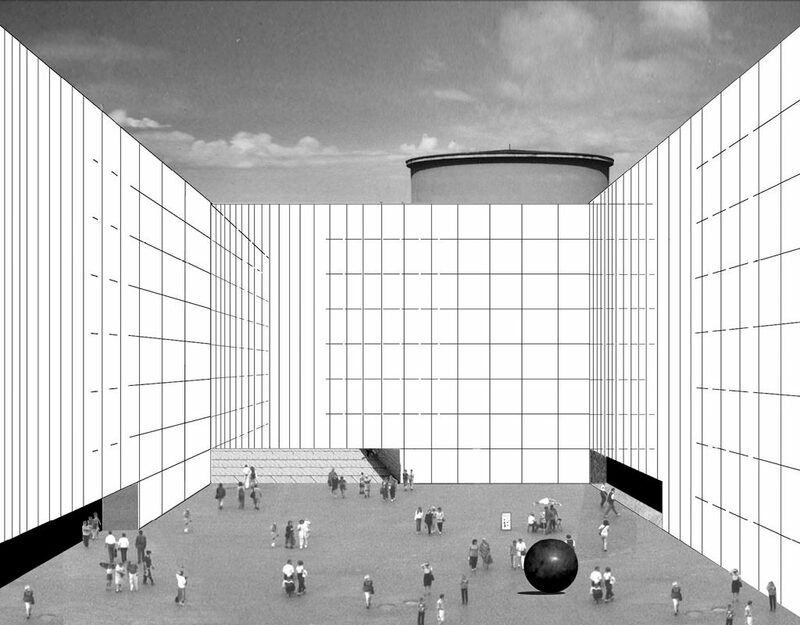 Within this frame stand two identical buildings, mirror images opposite one another, thus defining an inner courtyard. 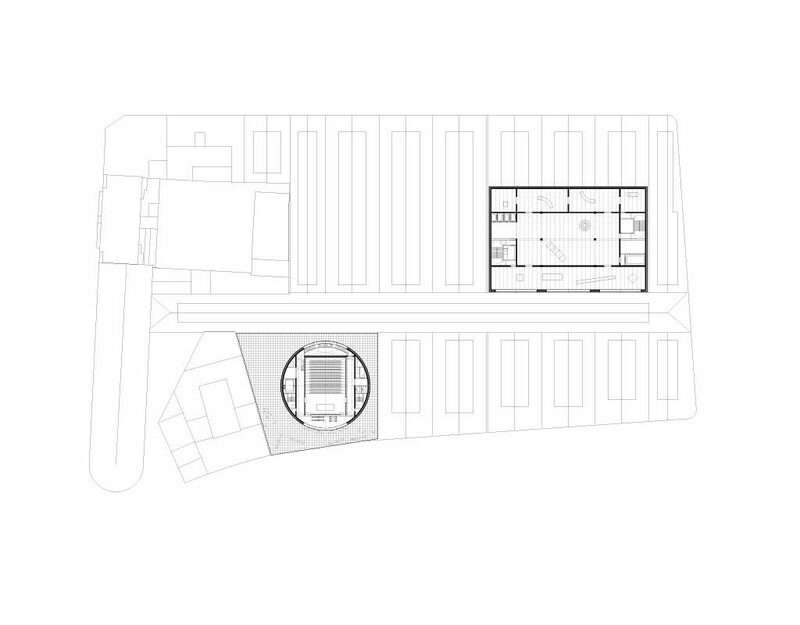 The block on the street side contains a store and reception area; the block at the back of the lot contains the less public section, the logistics spaces. The twin buildings are constructed as matter-of-factly as possible out of the typical range of industrial techniques and materials. 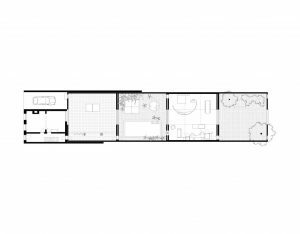 The structure consists of thin steel columns and beams, and steel deck floors. 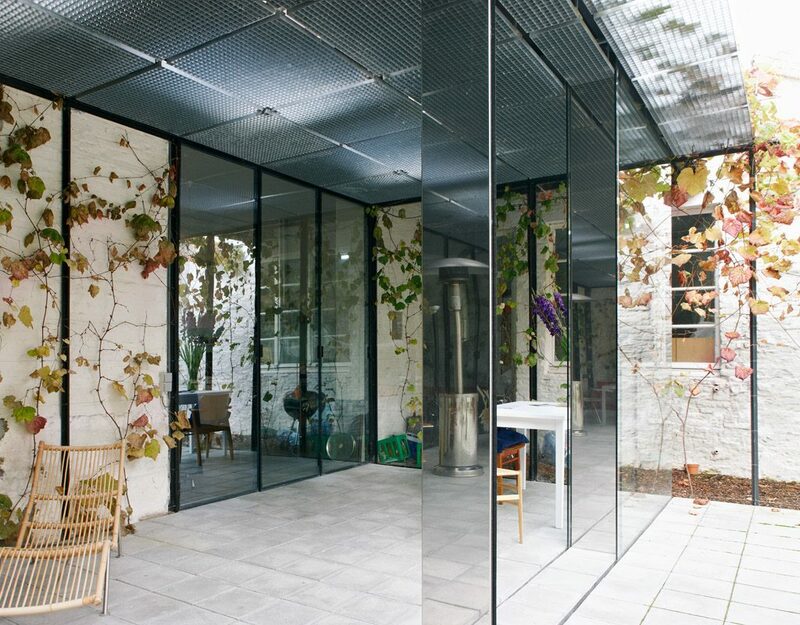 Both are clad with a pronounced curtain façade, partly filled in by glass, partly by polycarbonate panels. 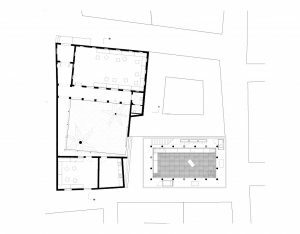 The courtyard defined by the two volumes functions as a parking and entrance zone. 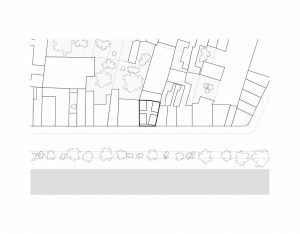 The remaining space between the footprint of the buildings and the lot lines becomes a whimsical garden, as a complement to their regularity. Kortrijk XPO is a typical exposition complex: a multifarious collection of similar halls, corridors connecting them to one another and snippets of vegetation. 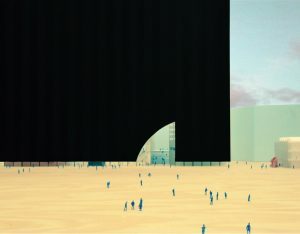 As one unifying gesture, a frame is placed around this chaotic entity. 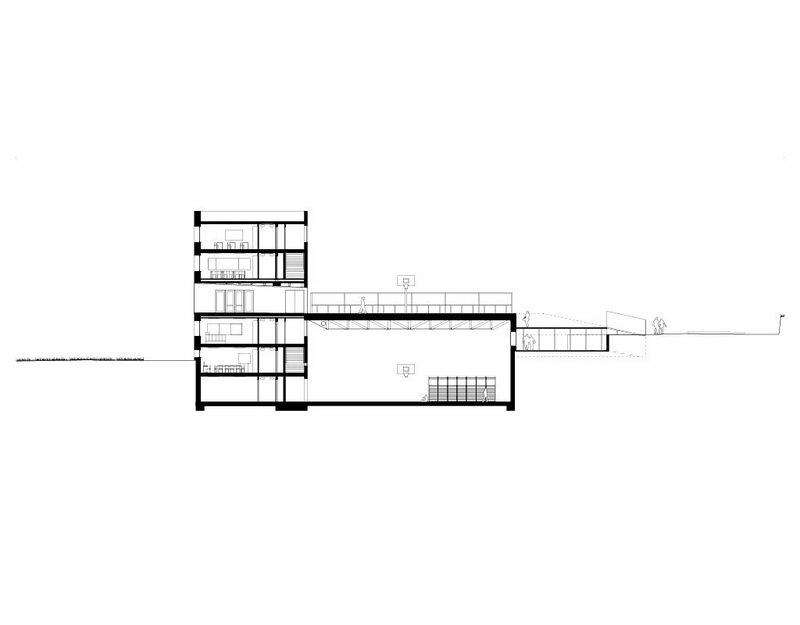 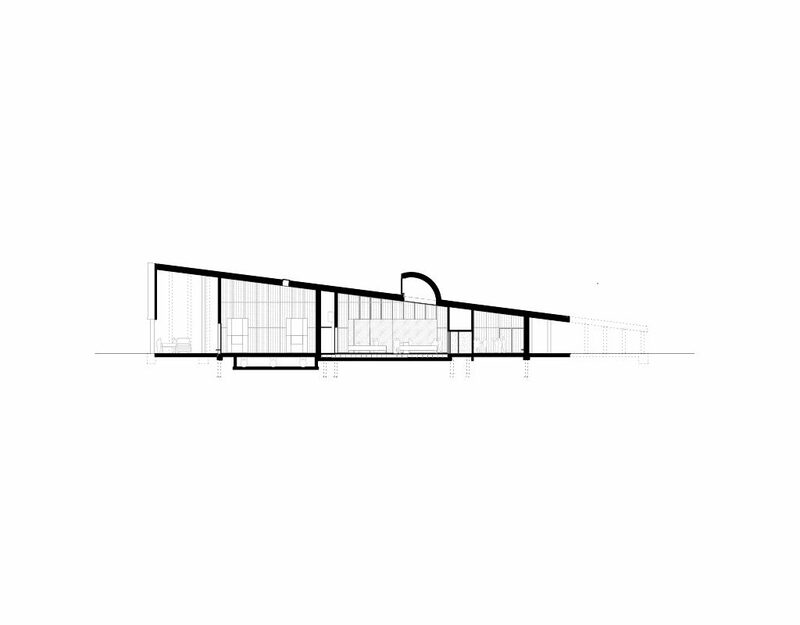 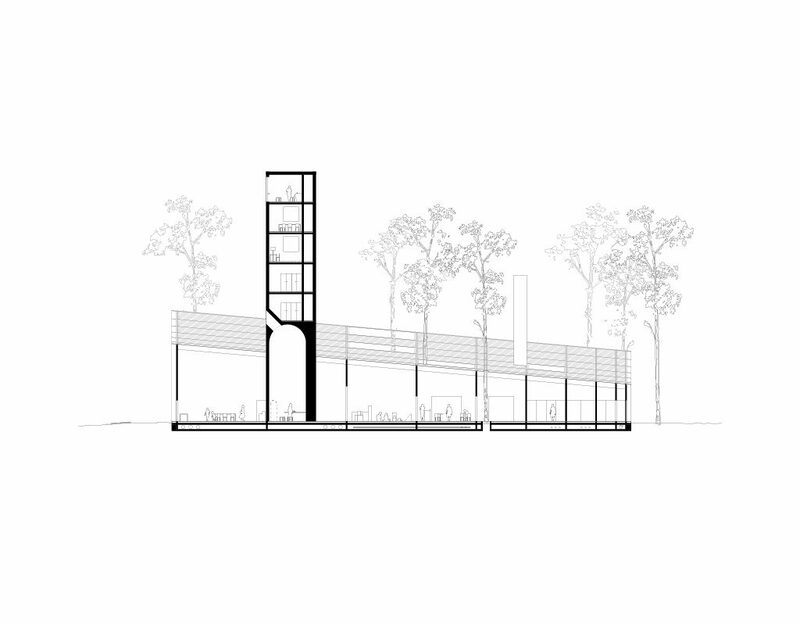 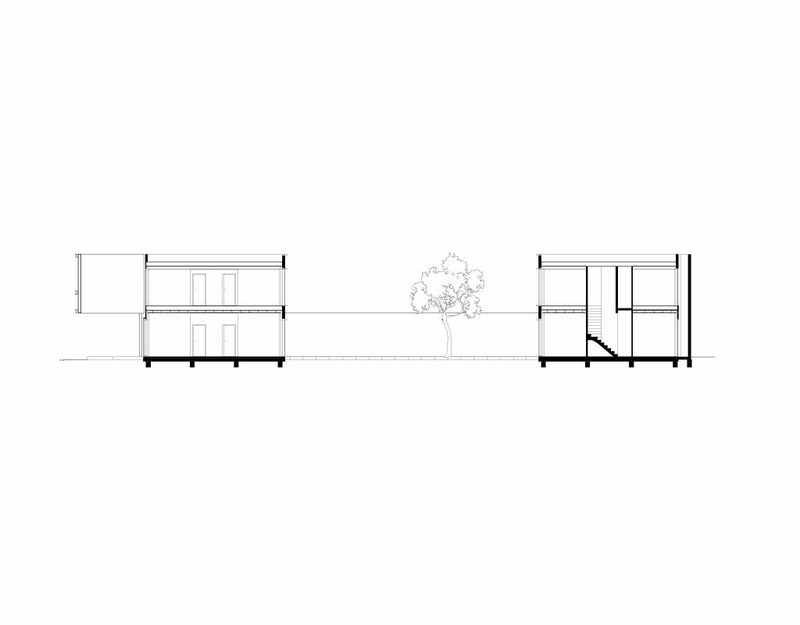 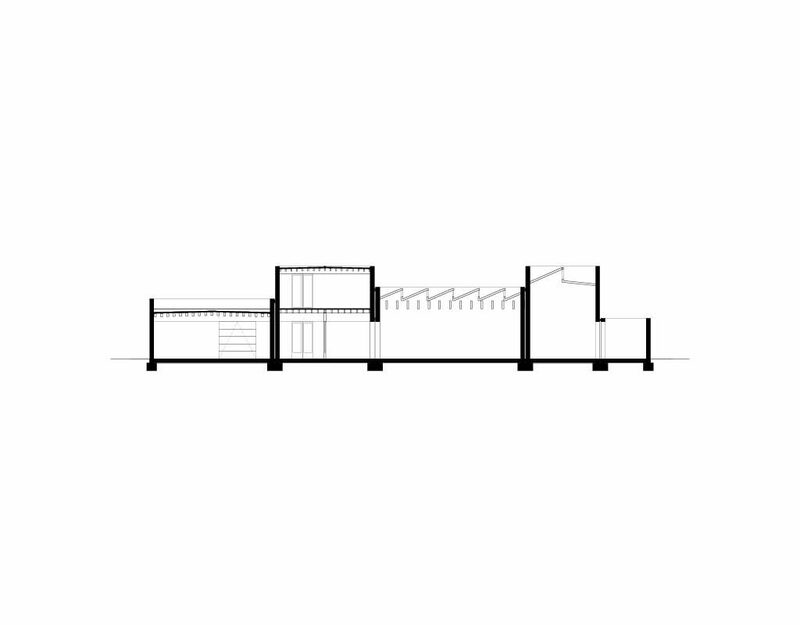 This frame is made up of a gallery constructed as a modular steel grid, in both elevation and plan. Occasional metal screens make this frame alternately open and closed, oriented towards or screening off its asphalted and logistic interior. Outside the frame the surroundings are natural and green. The entrance to the XPO halls is accented by a building that adopts the structure of the frame, thus forming a gateway to the interior. 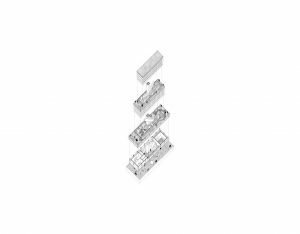 The frame redefines the exposition side as a clear whole, delineating its place in the urban fabric. 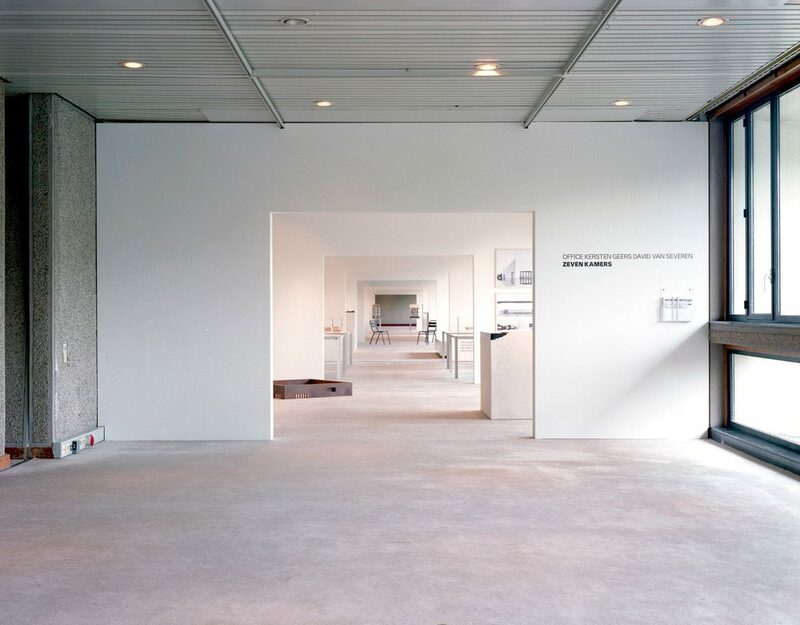 The frame is a gallery that imposes order on the entrances, passages, parking and logistics. 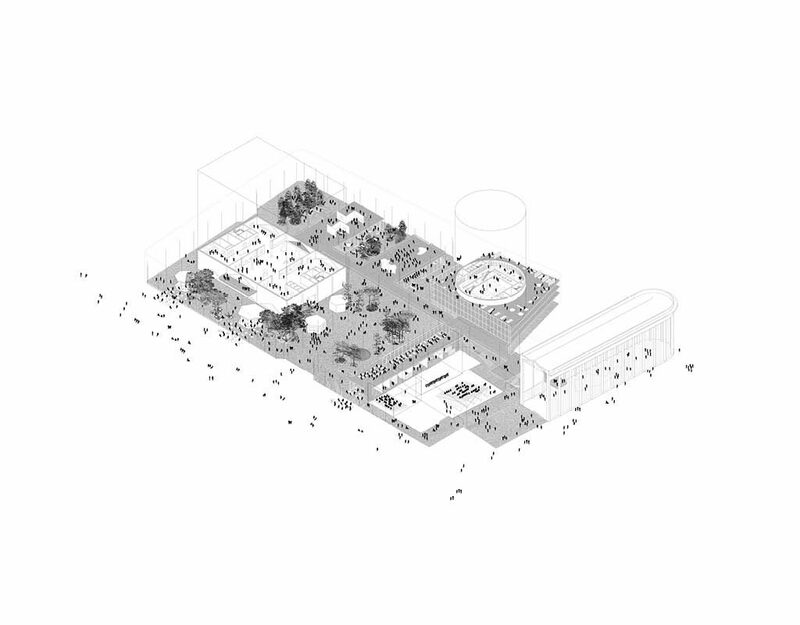 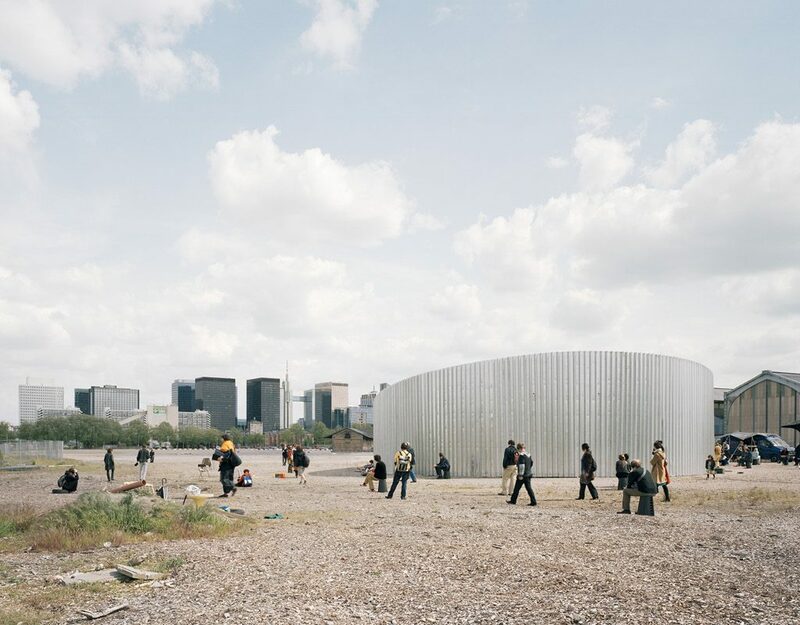 It gives the XPO site a recognisable facade that mediates between the scale of the visitor, that of the site, and that of the exhibition halls which it encloses. 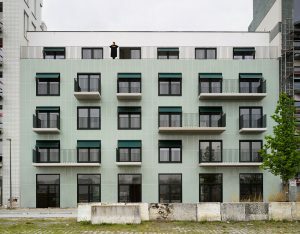 Project in collaboration with Joachim Declerck & Bureau Goddeeris. Nominated for the Mies Van Der Rohe-award 2011. 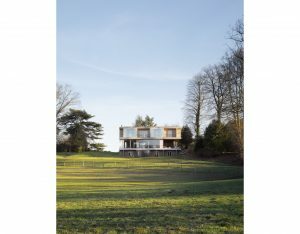 The house stands among the trees in the middle of a idyllic site at the lake of Keerbergen. The lake is not, however, accessible for those who live around it. Therefore, a water feature forms the centre of the dwelling. A number of objects – a sauna, terrace and observation tower – populate this garden, seeking a relation with the lake. 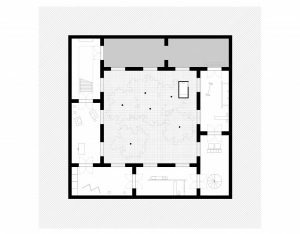 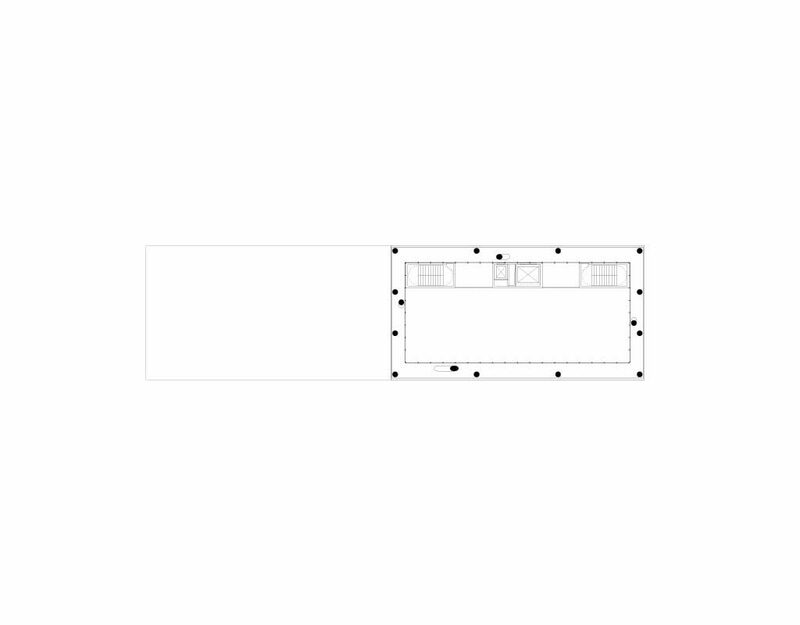 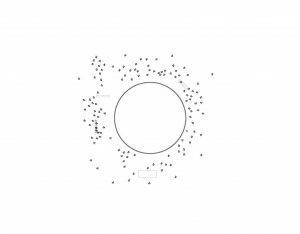 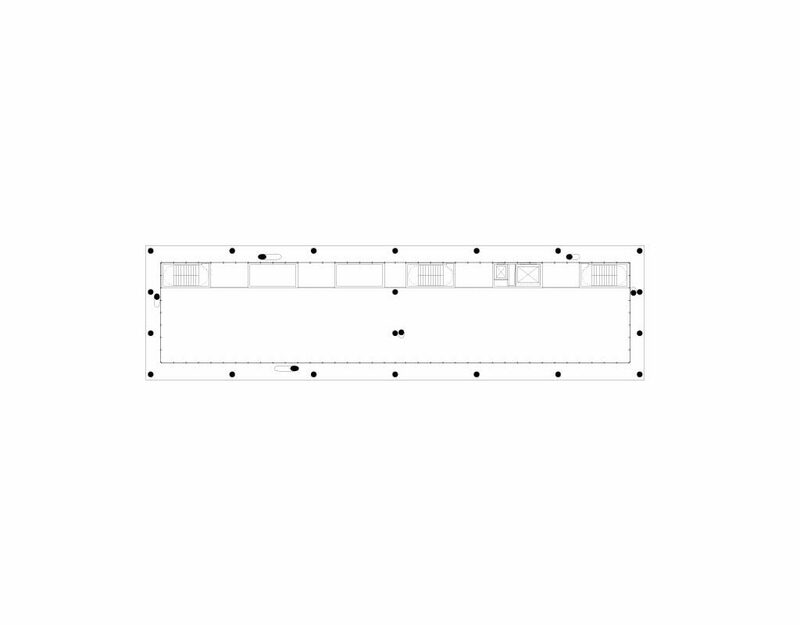 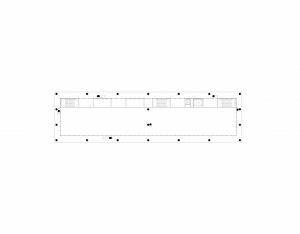 The house itself is organised by the placement of a number of simple volumes in a continuous circuit. around the water garden. 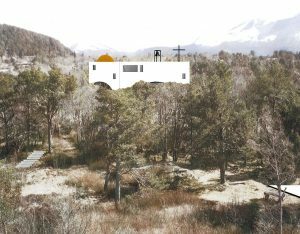 This way the projects attempts to exploit the romance of the site – the woods and the lake – to its fullest, while at the same time making a defiant gesture toward the deceptive luxury of the inaccessible lake. 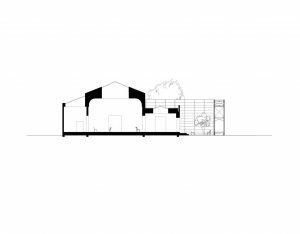 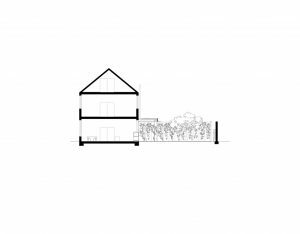 This freestanding dwelling is situated in the middle of a parcel between woods and an agricultural area near the village of Buggenhout. The enclosure—a modular steel fence—is an integral part of the design and defines the volume of the house. 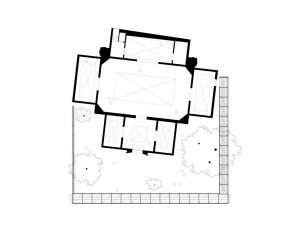 The surrounding unkempt garden is not included, and functions as an automotive access around the house. 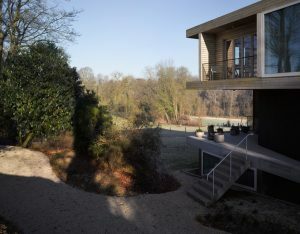 The dwelling itself is composed of two levels: an open “outside house” on the ground floor, and a closed “inside house” on the first story, with views of the woods and rural landscape. The outside house is conceived as a patio villa with a garden. 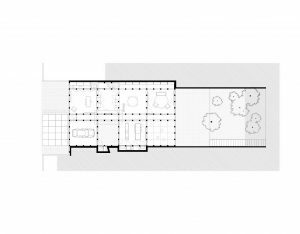 Its thick double walls—two load-bearing layers of standard brick, painted white—carry a concrete platform that forms the base for the inside house. 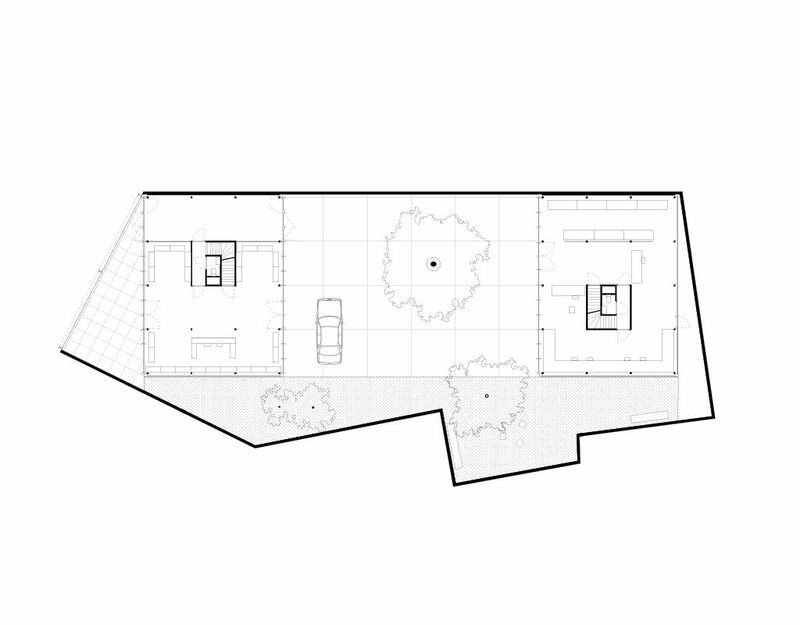 The inside house is a compact set of rooms in the depth of the roof of the patio villa. This is conceived as a wooden box that covers the platform, which is made watertight by covering it completely with a dark plastic membrane. All detailing on this project is designed from the inside out: the huge sliding windows are added to the façade in such a way that the frames are invisible and do not impose on the impressive views. 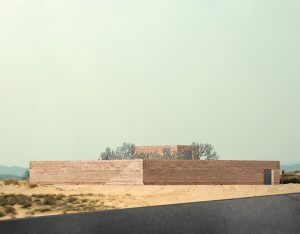 These are directed at the still open, rural landscape, while the neighbouring houses remain relatively invisible. 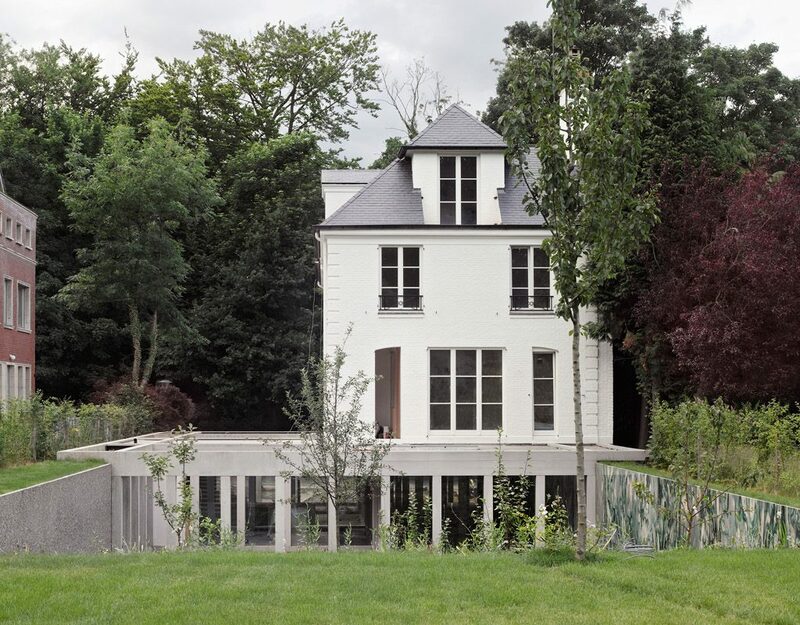 By deliberately moving the fence in from the edges of the property line, the dwelling becomes actually “freestanding”—a rare luxury in parcelized Belgium. 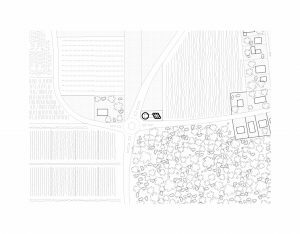 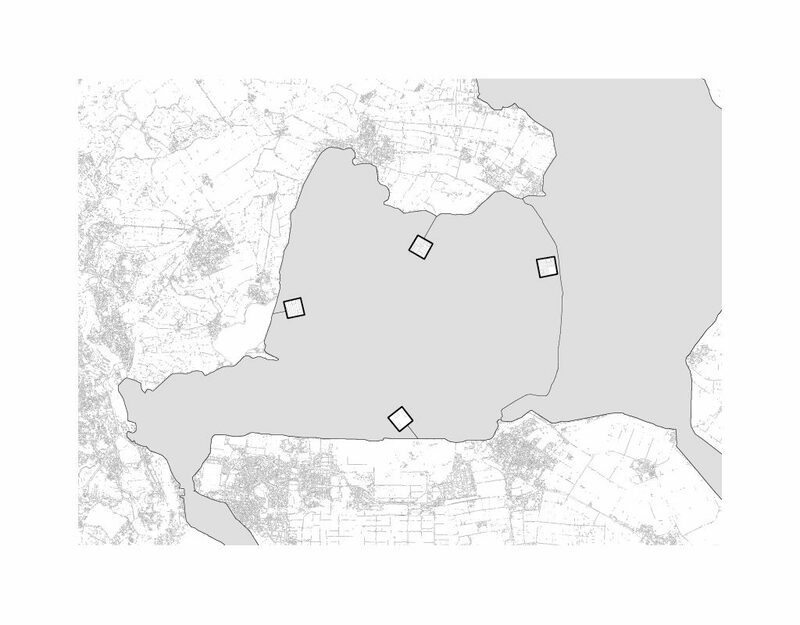 (A) Green Archipelago is a project for 4 inhabited forests on the Lake of Marken. These forests are island-cities, which – in the tradition of the Greek Polis – accommodate a maximum of 40.000 inhabitants. 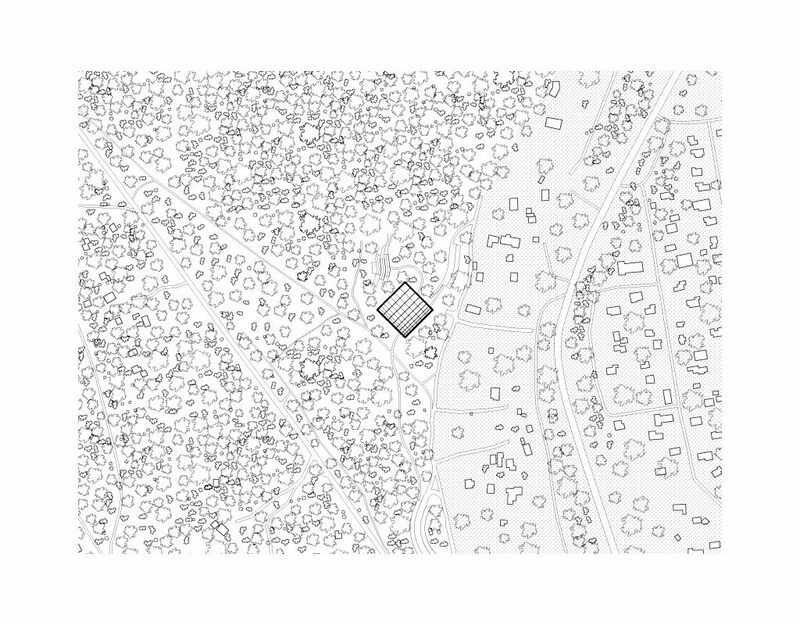 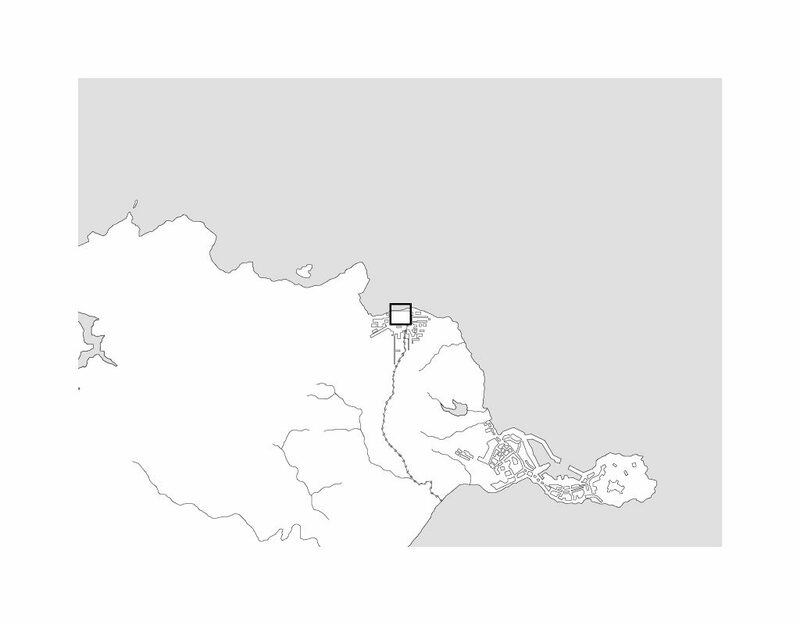 Each island is covered by a grid of trees, 10 meters apart from one another. 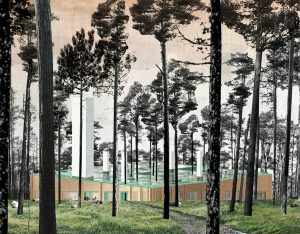 They define the forest. 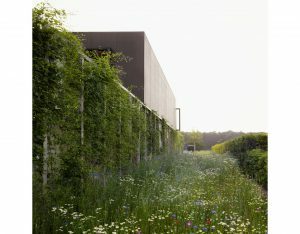 On the surface of the forest, walls of 3.3 meters high define long, low parallel spaces. 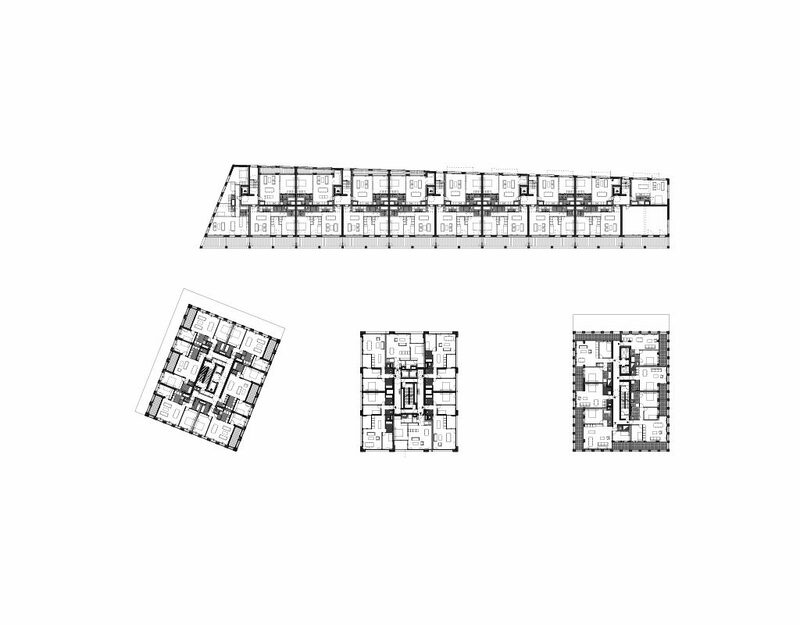 This is a base structure for patio-villa’s and corridors. 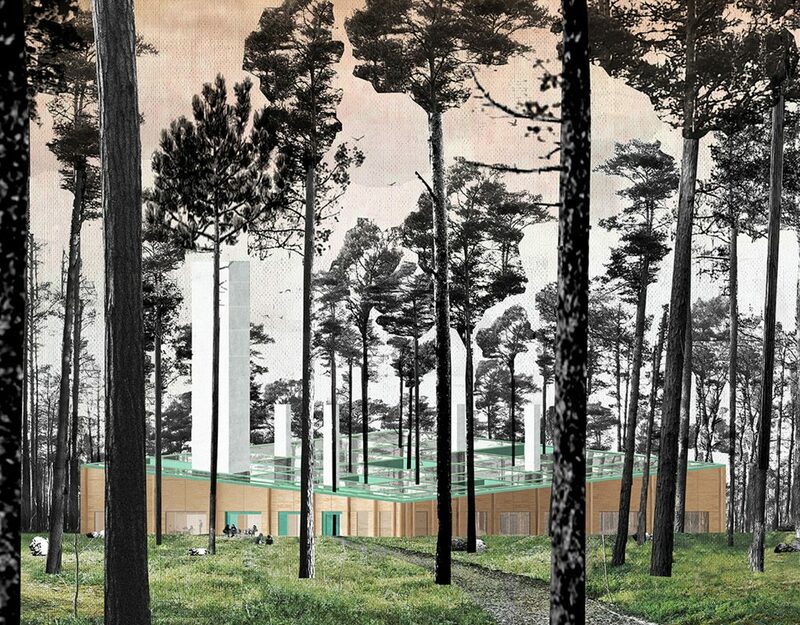 Large cut-outs from this ground layer of forest and walls define the collective spaces. 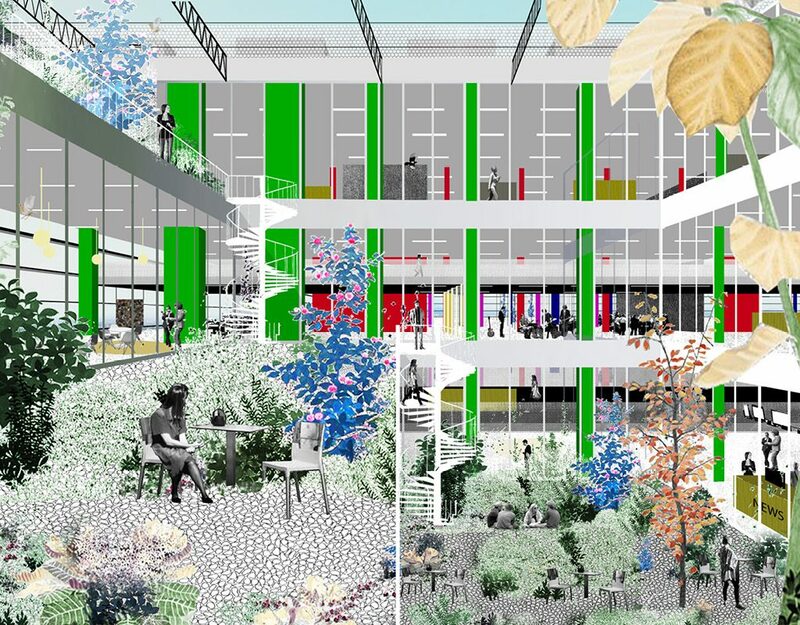 It is in these spaces that the demands of health care, which are intrinsically spatial, are organised: A quiet garden with apple-trees, an indoor swimming pool, a square surrounded by commercial- & public services… These are the key spaces of the collective consciousness. Thus this city is essentially shaped by the collective. 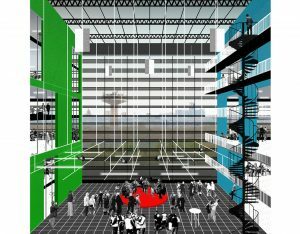 Cité de Réfuge was developed within the context of the 2007 Rotterdam Architecture Biennale, the theme of which was ‘Power’. 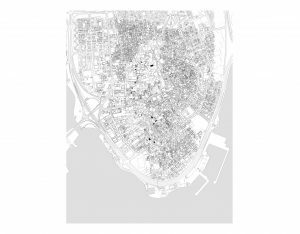 Ceuta is a Spanish enclave on Moroccan soil. 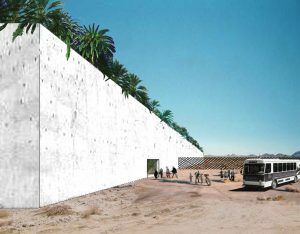 The project gives a face to the politicized border crossing at Ceuta: a refugee city in the no-man’s-land between two cities (Ceuta and Tangier), between two countries (Spain and Morocco), between two continents (Europe and Africa). 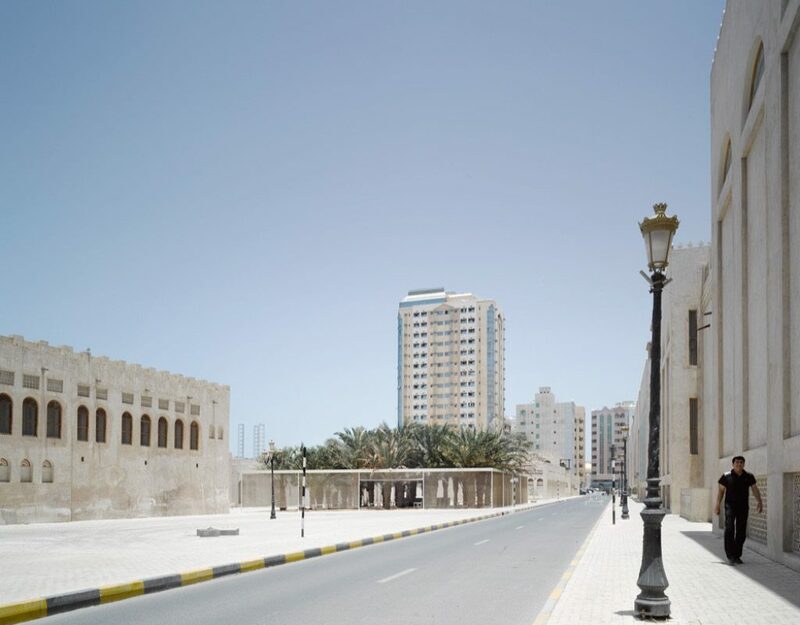 This city is formed by a large square of 482 x 482 metres that is surrounded by a colonnaded structure, like a thick rampart. 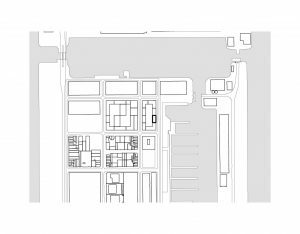 Within this wall all the infrastructure elements of a border crossing are to be found: offices, hotels, stores… The walled plaza is left undisturbed, without a programme. 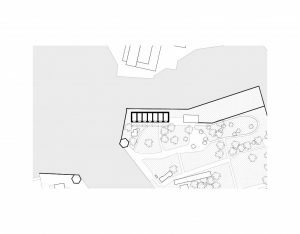 It is a market square, a reception space, like a quay. 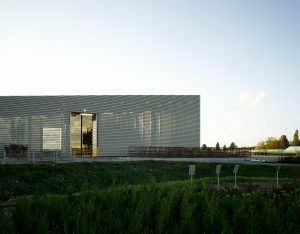 In this way the Cité de Réfuge reflects the powerlessness to achieve solutions to the problems occurring on this border. 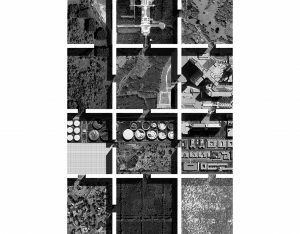 At the same time the project investigates the city in its most radical, concise form: as a deliberate act, a political decision. 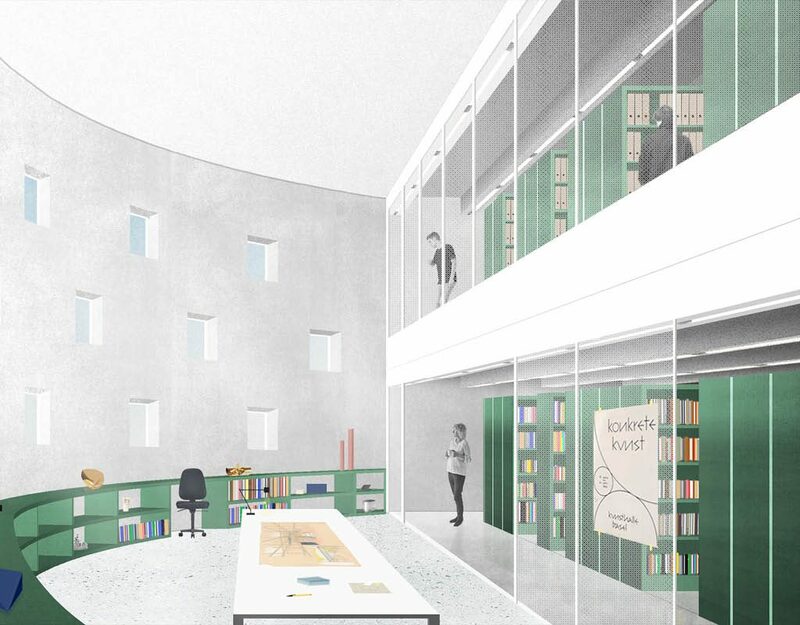 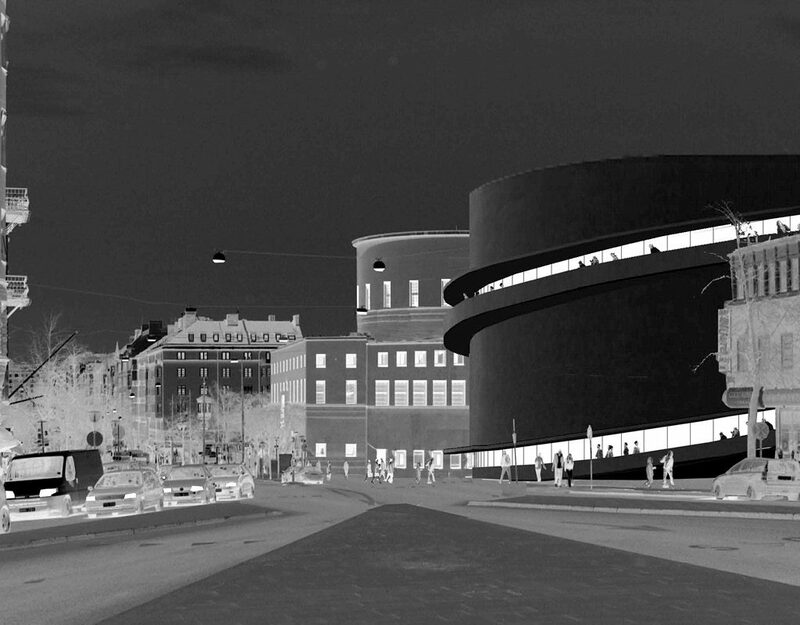 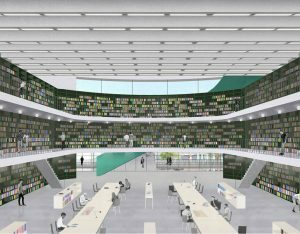 With its form – a square patio in a cylindrical volume – the project for a new city library in Stockholm is a complement to the existing library next to it, designed by Asplund as a cylinder in a square. 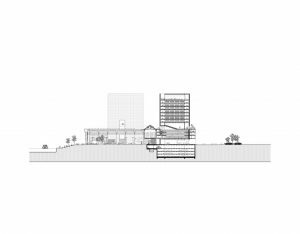 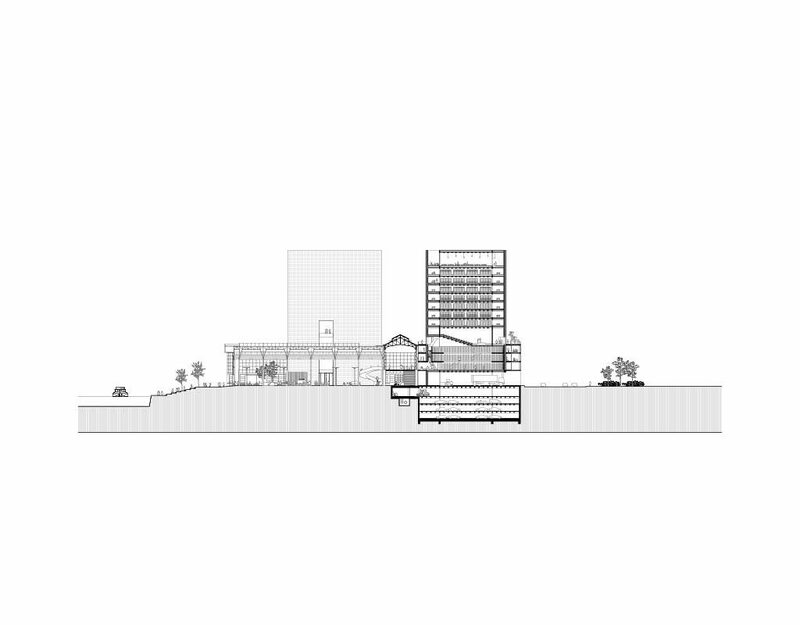 Both volumes stand at a slight angle to the grid of the city. 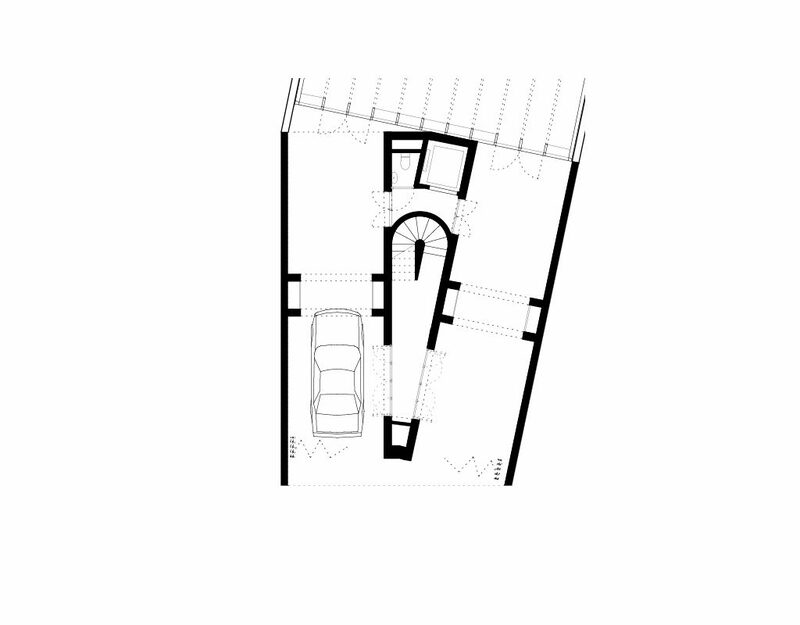 Between the two buildings an entrance for the whole complex is defined: a ramp leading to the glass patio of the new cylindrical volume, out of which the various entrances are organised. 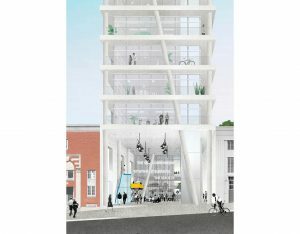 In this way the paradigm of the transparent building in the city is reversed to the inside. 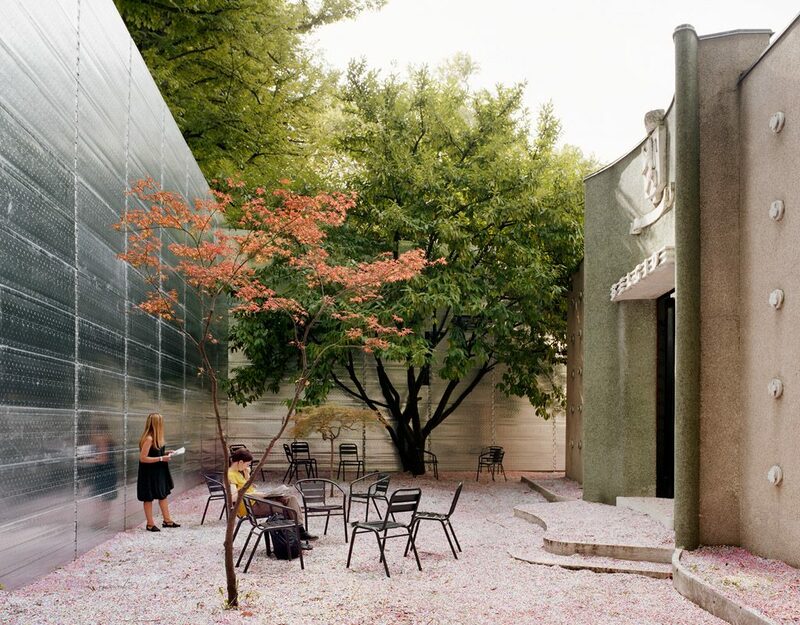 All the reading rooms and book stacks look out on this patio. 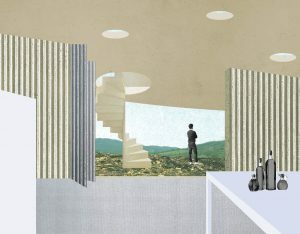 A spiral ramp carves out a pedestrian promenade in the windowless exterior of the new volume, with views out on the city. 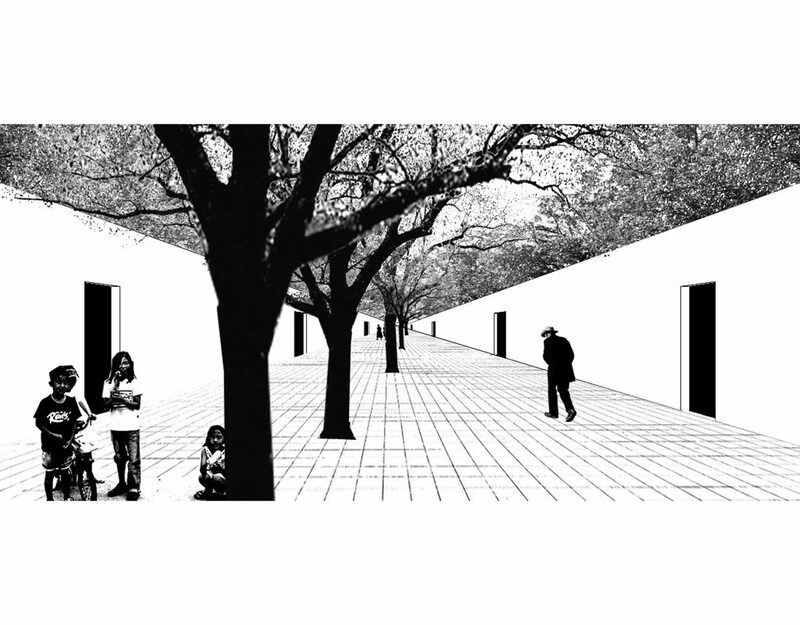 This promenade supplements a public path to the level of the park which lies behind the buildings. 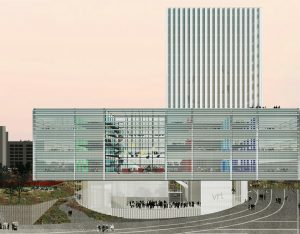 Public functions in the library volume can be opened to this promenade, allowing glimpses of the skyline of Stockholm to penetrate the interior of the new library. 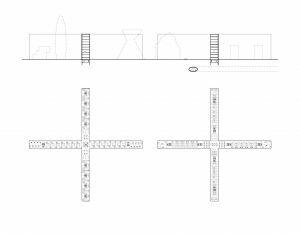 International Competition, in collaboration with Richard Venlet. More than simply a connection from A to B, this bridge, located in the center of Ghent, connects the bank of the Ketelvest canal with the terrace behind the Handelsbeurs concert hall to create an urban space. 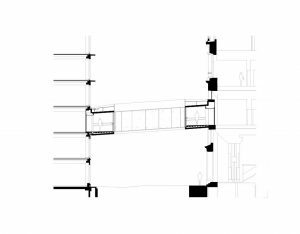 Originally commissioned to improve delivery and fire egress, the bridge provides a new entrance and perspective toward the concert hall. 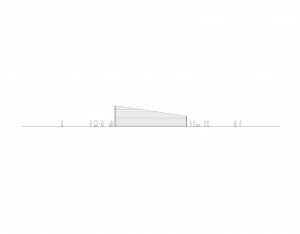 The difference in height between its two ends is explicitly recognized by the design of the bridge. 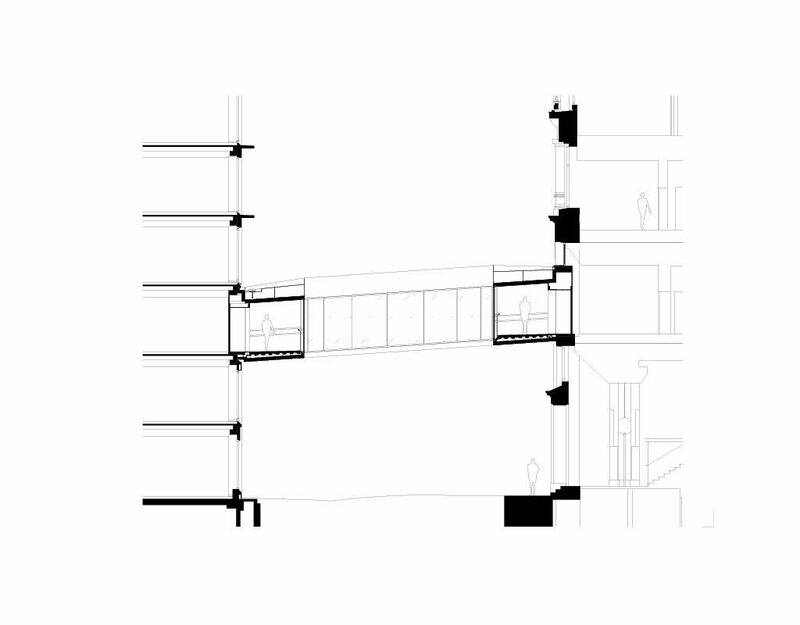 The horizontal silhouette of the bridge is defined by the balustrades. They are made of a vertical latticework of Azobe wood, so that from the Ketelvest and the nearby bridges it appears transparent rather than massive. 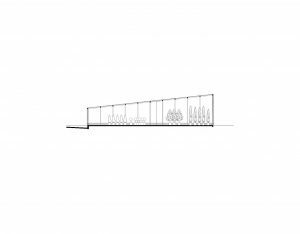 However, if one stands immediately beside the bridge, the side walls appear solid. 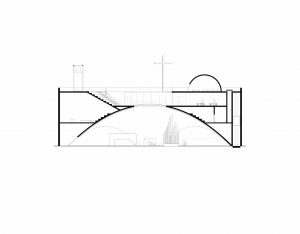 The bridge becomes a place in itself, an enclosed space that, through its trapezoidal form, lengthens or foreshortens the perspective, depending on which side it is being viewed. 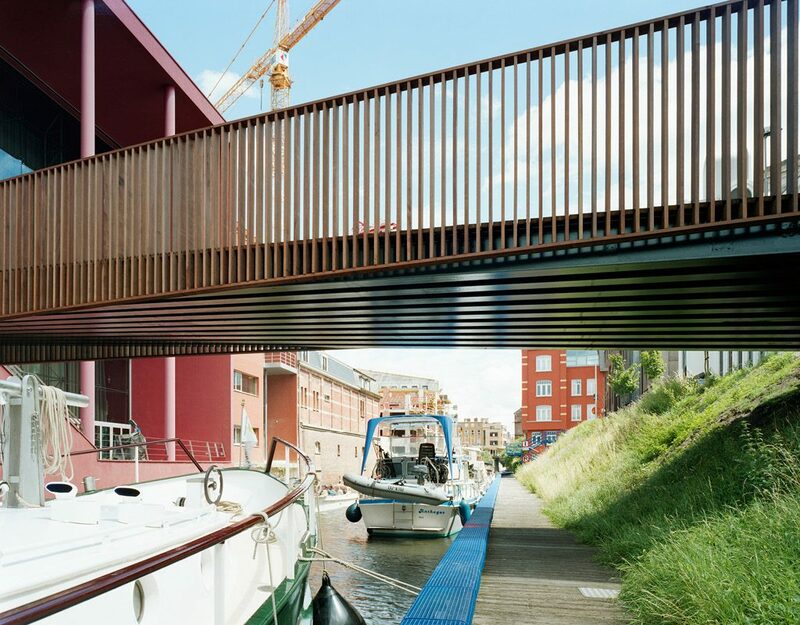 Anyone crossing the bridge is absorbed into the optical illusion created by the railings and deck. 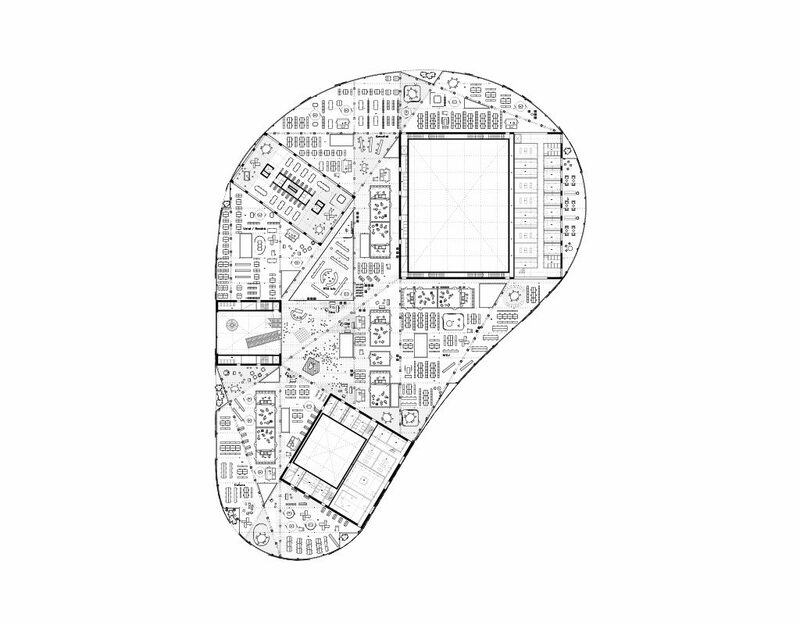 This city, designed for 500,000 residents, is organised as a sequence of rooms that are formed by ‘city walls’. 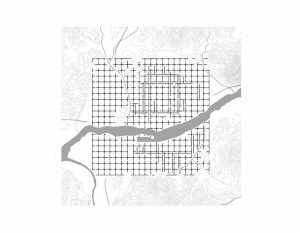 The city walls are a composition of cruciform buildings that represent two-thirds of the built mass of the city. 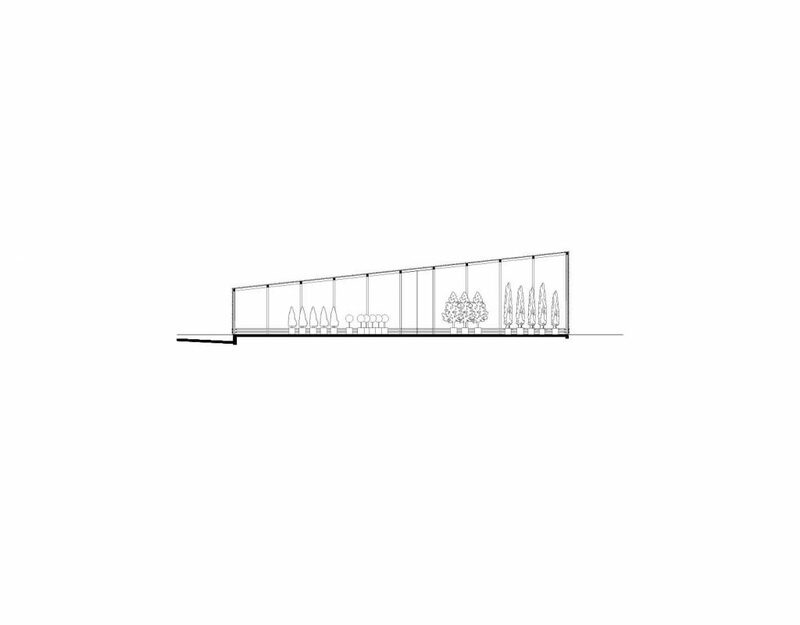 They form the habitable architectonic structure of the city. 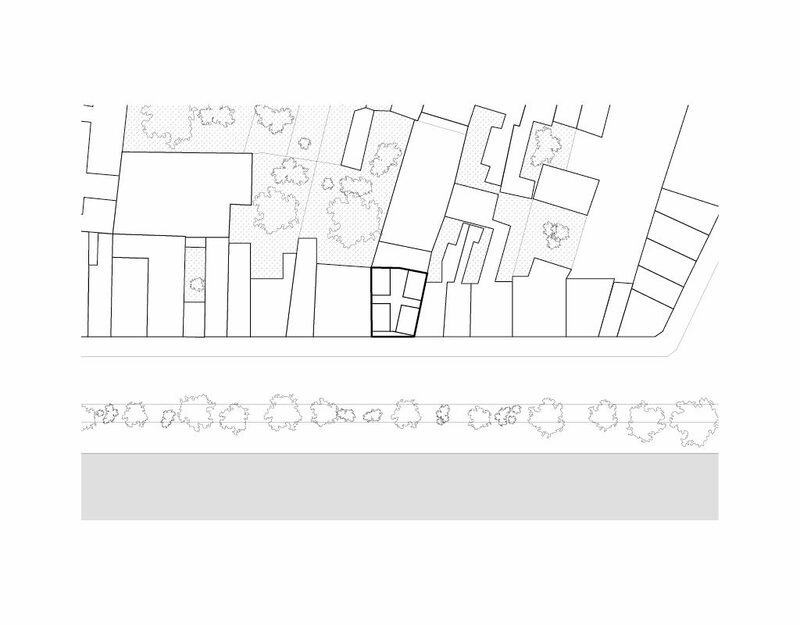 The spaces between the city walls are rooms without content, providing the space for further urban development. 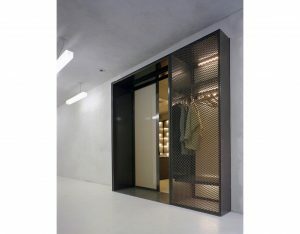 The future content is the furniture of the rooms. 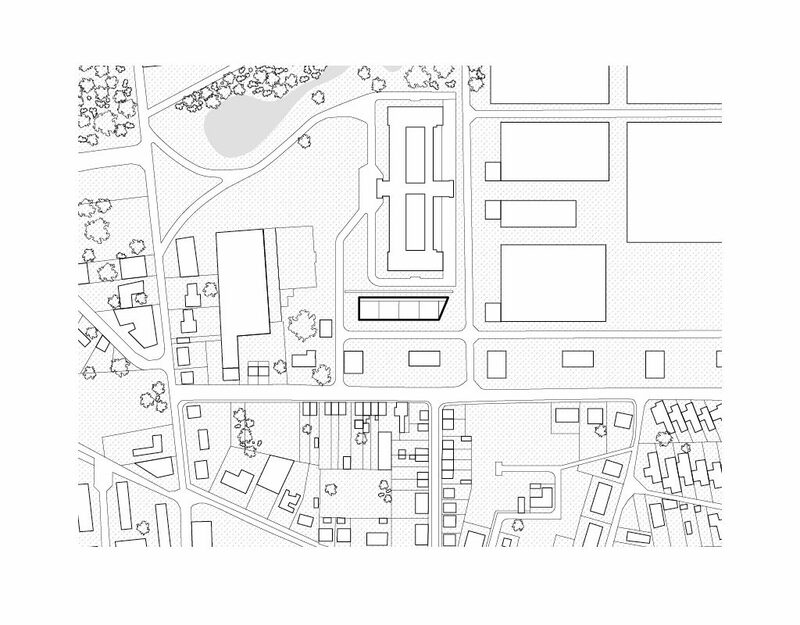 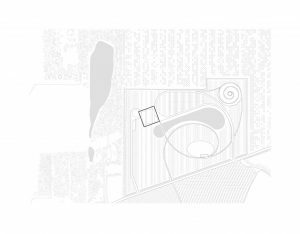 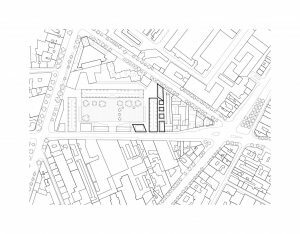 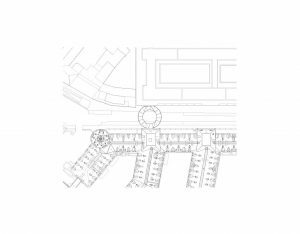 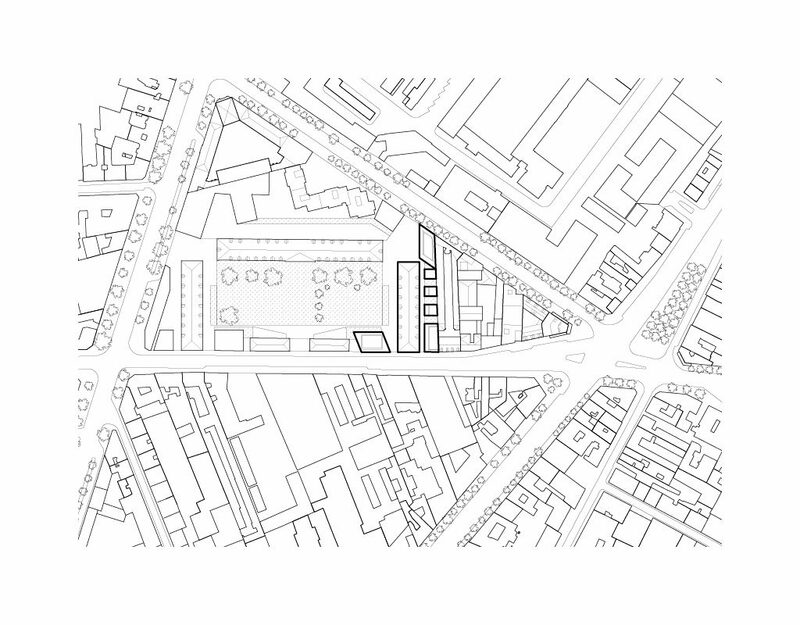 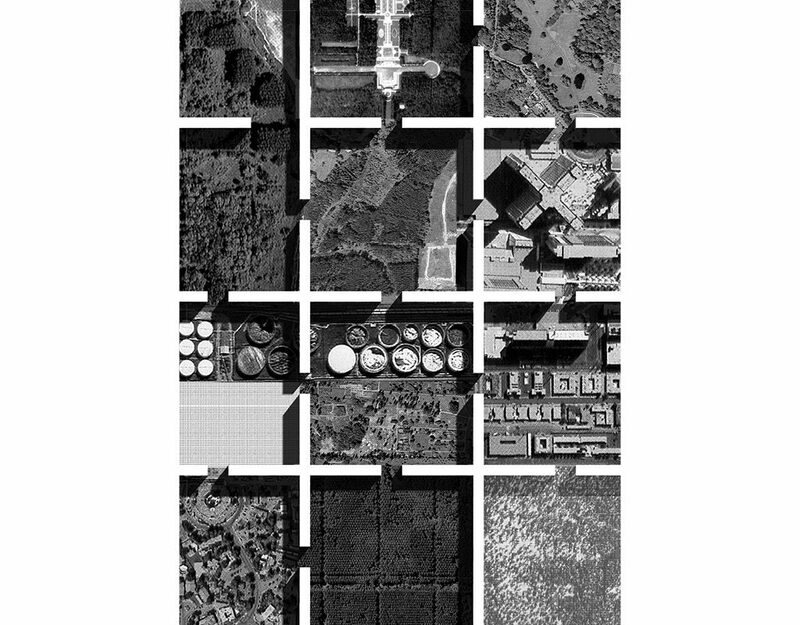 The plan seeks to define the form of the city in a rigid manner, without lapsing into the naïve modernistic ideal of the city as a fixed, predetermined organisation of buildings. The city walls and city rooms form the ‘genesis’ of the city, its bare facts. 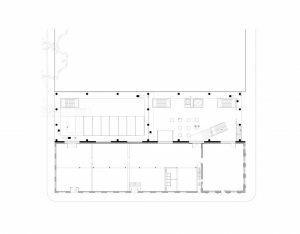 In this manner they fulfil the only role that can be ascribed to architecture: providing a specific inertia against the instability of life itself. 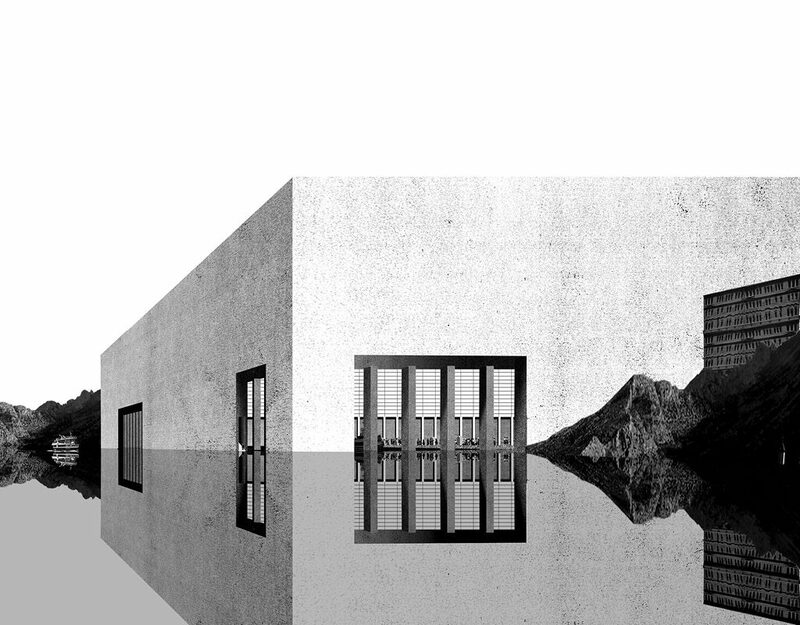 International Competition 1st prize. 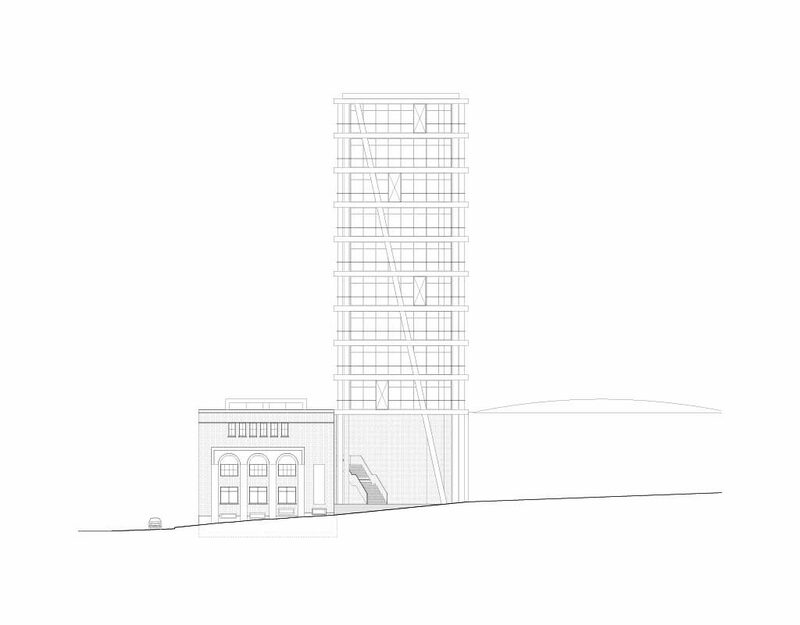 In collaboration with DOGMA. 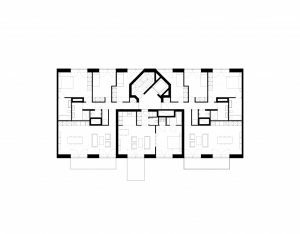 The town house in the centre of Ghent is a stack of 20 identical rooms in five layers. 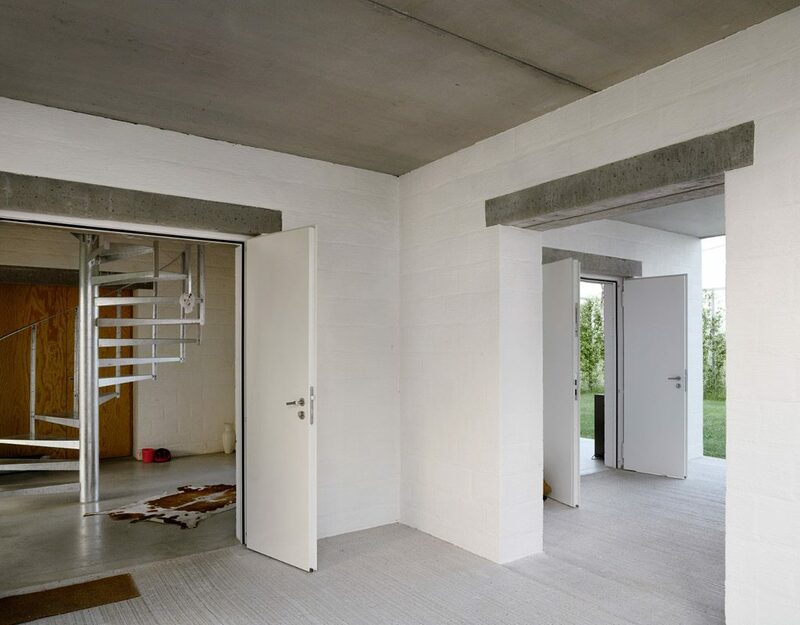 The rooms can be either outdoor spaces (garage, terrace) or indoor spaces. 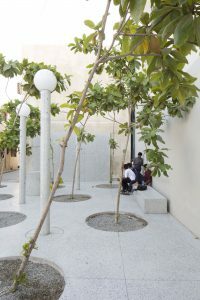 They are arranged around a concrete cross. 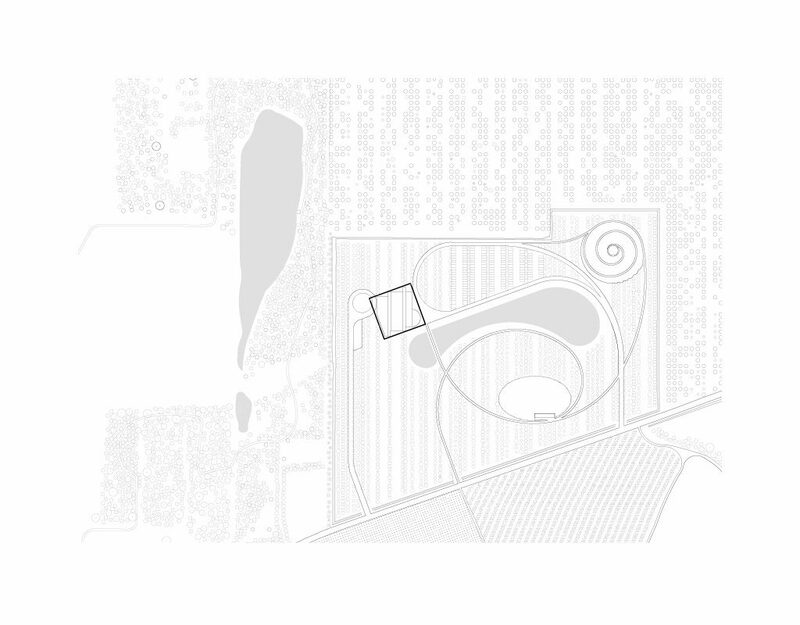 In its shape the cross indicates the irregularity of the site. 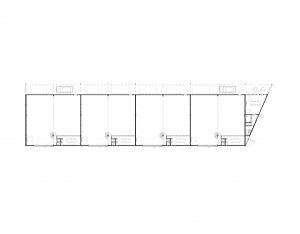 It is the structural and technical ‘carrier’ of the project, containing bathrooms, vertical circulation and technical shafts. 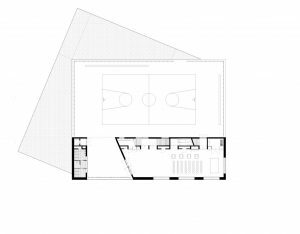 Through the cross, the rooms are freed from both functional demands and the capriciousness of the site. 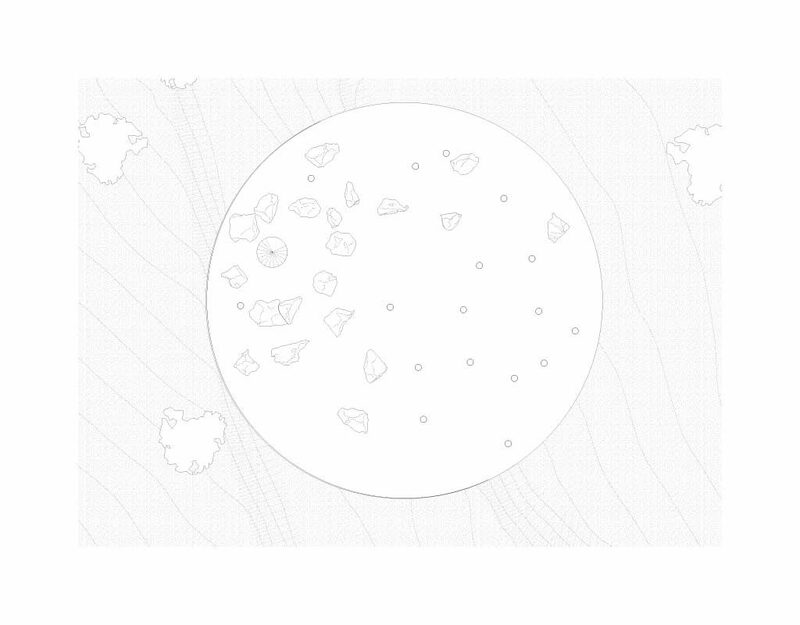 They can retain their pure, ideal form. 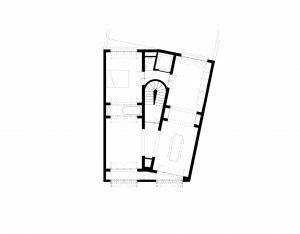 The dwelling can thus be regarded as a town house in which the rooms are assigned no specific function, and because of that permit every function. 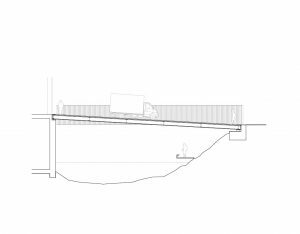 An oblong volume provides a border crossing for pedestrians between Mexico and the US, and interrupts the endless demarcated boundary. 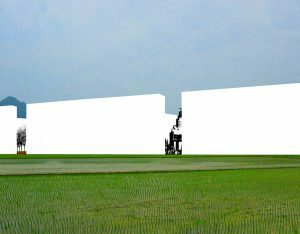 A nine-metre high wall defines a no-man’s-land between the two countries. 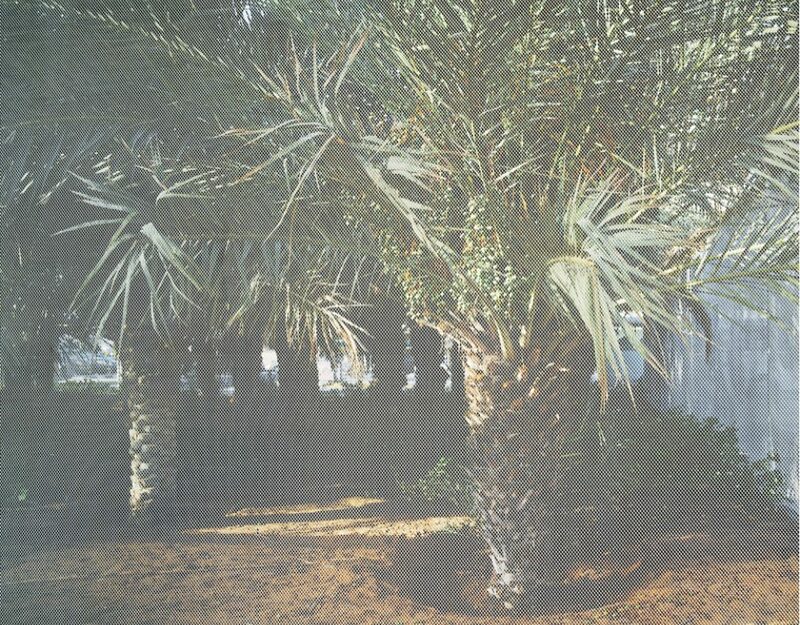 Within the white walls a grid of palm trees imposes order on a large, shaded garden. 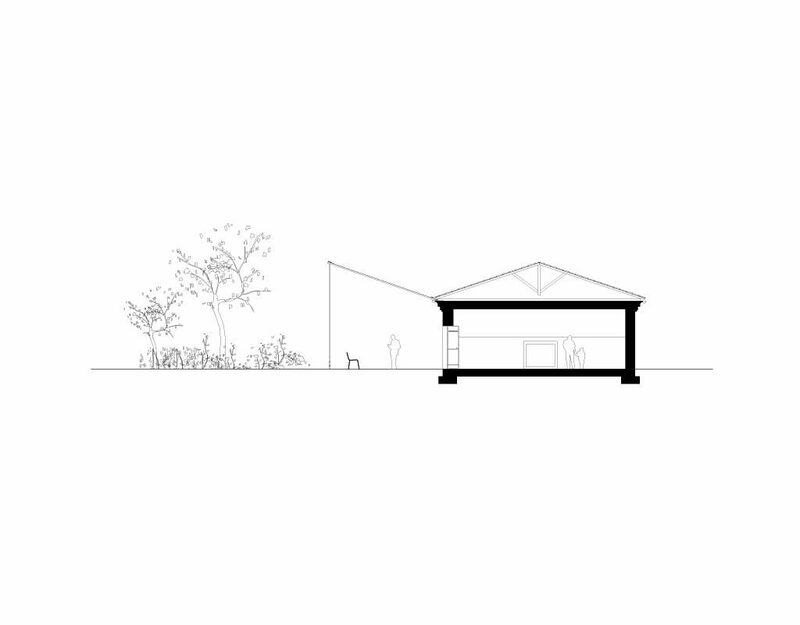 Pavilions for passport control and administration are spread around here and there, becoming part of the garden. The oasis is a point of reference in the vast Tex-Mex landscape, its content hidden from the open landscape by its massive walls. In all its simplicity it raises questions about the desire for the promised land. 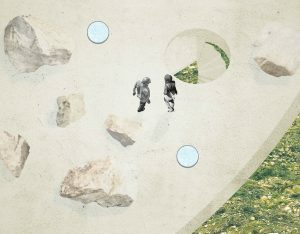 Open competition, first prize. 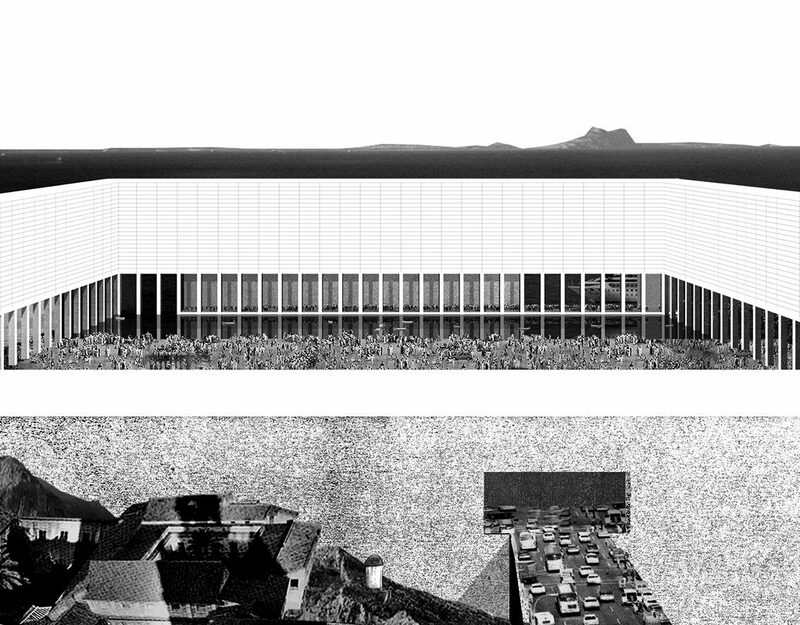 In collaboration with Wonne Ickx. 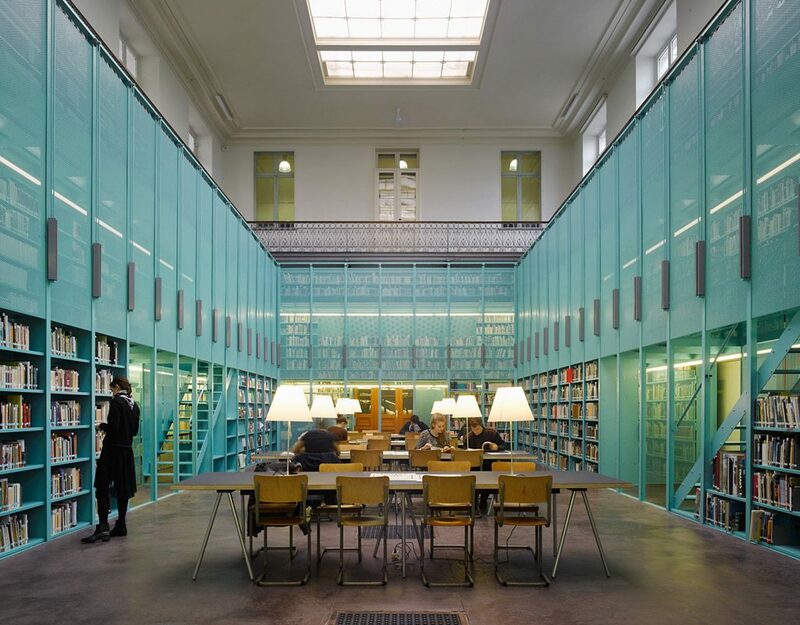 The Jacob and Wilhelm Grimm University Library is housed in two identical volumes directly facing one another. 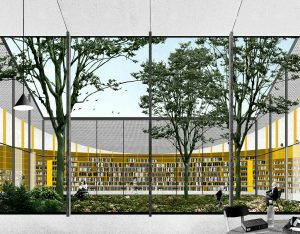 This creates a library square between the two buildings, on which all the entrances lie. 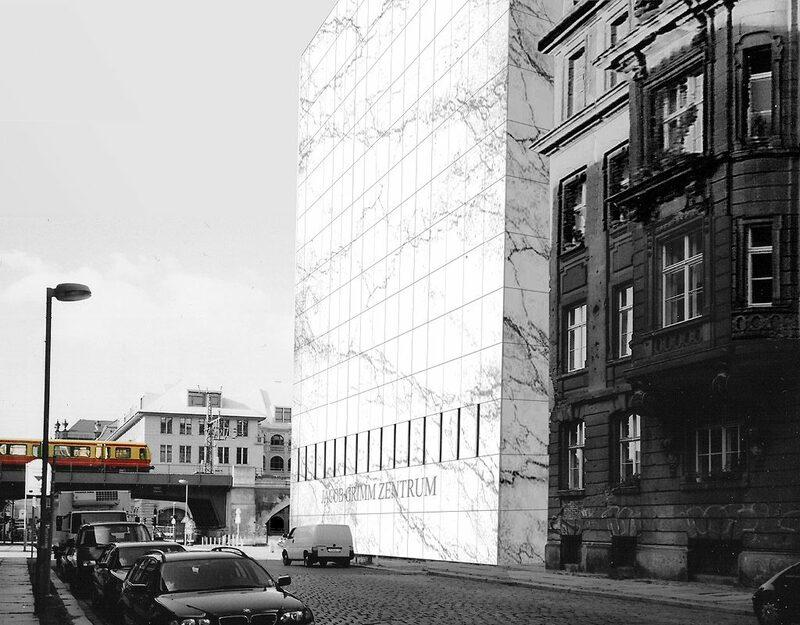 A pedestrian bridge of mirrored glass at the first storey level connects the two blocks, and reflects the metro carriages of the S-Bahn as they run past. 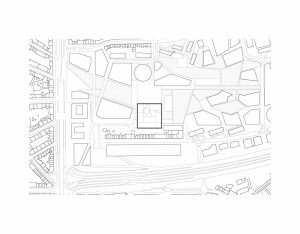 This public heart of the complex seeks to connect with the Berlin tradition of large institutional structures that define a square. 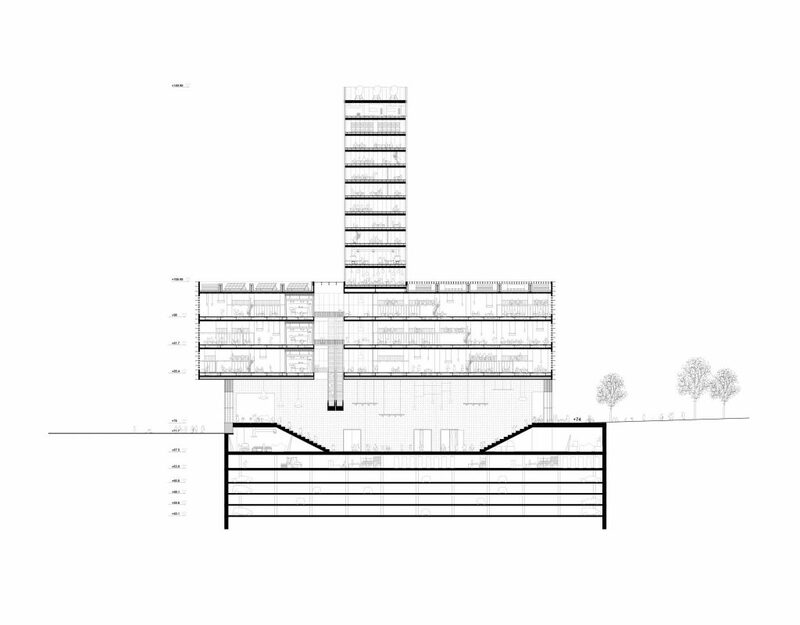 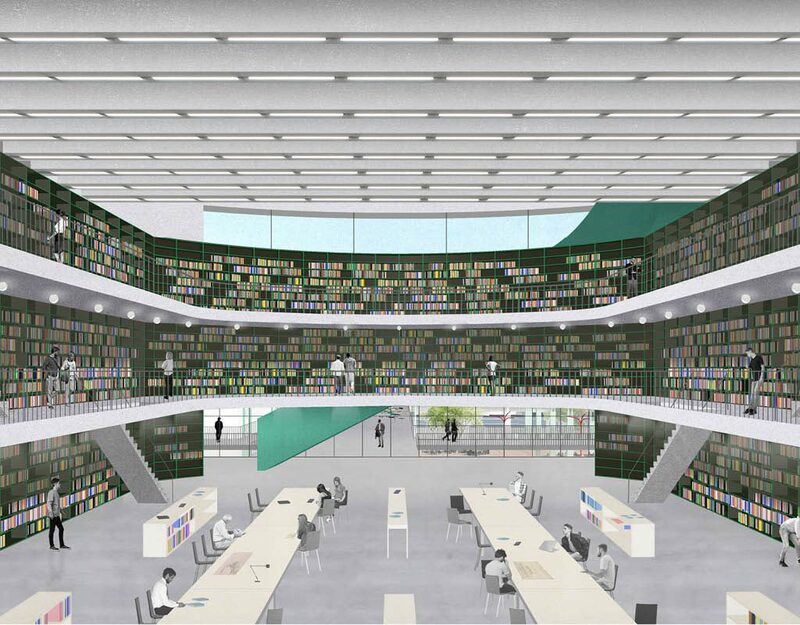 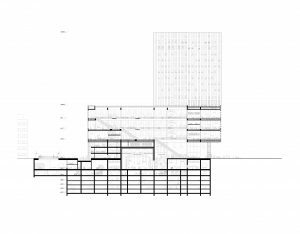 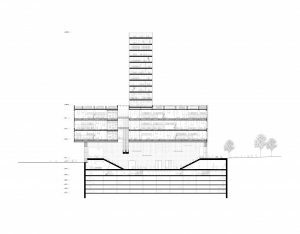 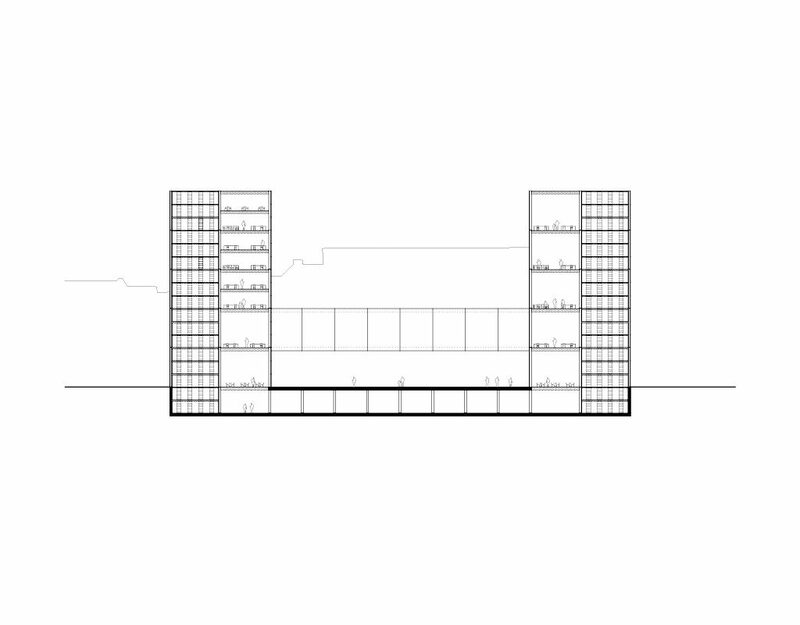 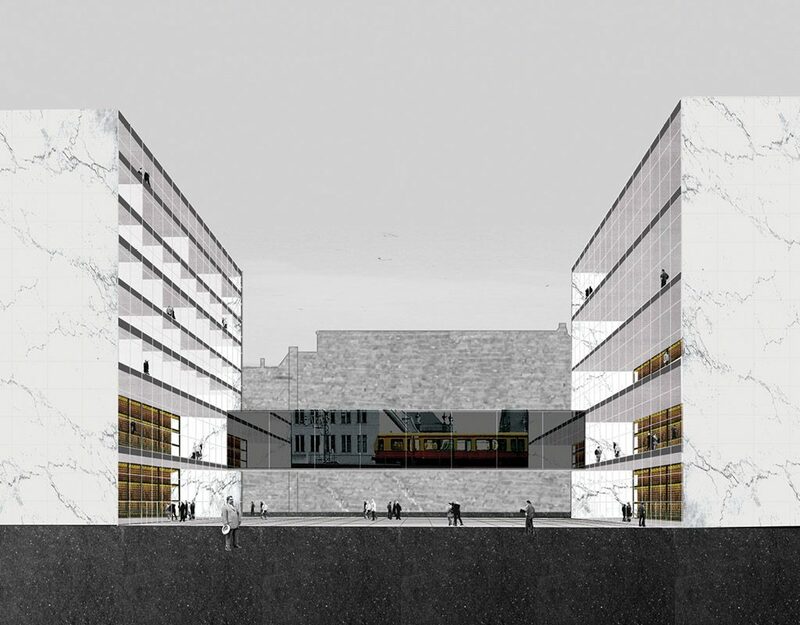 The two free-standing volumes oriented toward one another reject the rigid typology of the typical closed Berlin block, and create an urban form that through its position grafts the semi-public programme of the university library into the urban fabric. 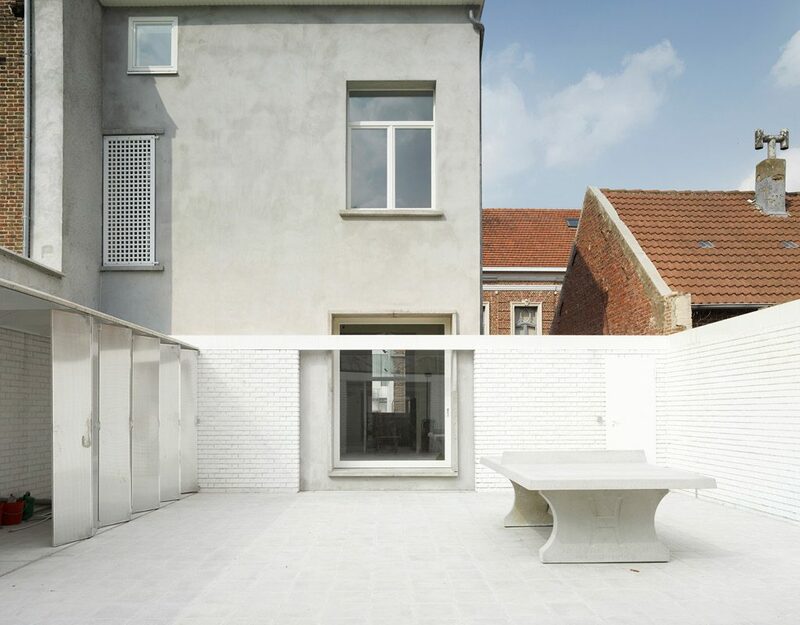 The expansion of a 19th century town house in the heart of Ghent resulted in two houses. In the irregular outdoor space alongside the existing ‘winter house’ a ‘summer house’ was marked out by a precise modular frame of steel sections, overgrown with grapevines . 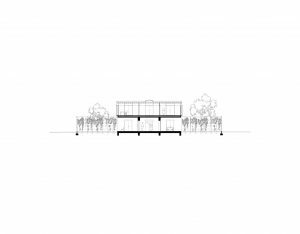 A narrow strip of this frame, right against the winter house, was roofed with steel grilles which rest on six thin fins of polished steel. Enclosed by sliding panels of single glass, an intermediate climate prevails in this roofed section. 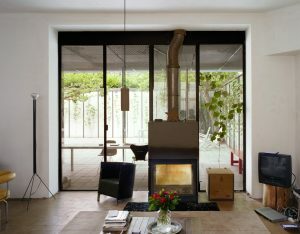 In the remaining spaces between the frame and the garden wall a garden storage shed, an outdoor kitchen and space for storing firewood are to be found. 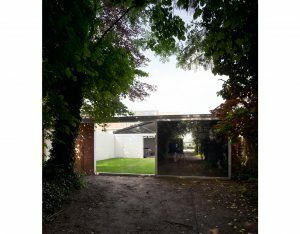 By placing a number of mirrored glass doors in the corners of the perimeter, the winter house ‘disappears’ once the summer house is entered. 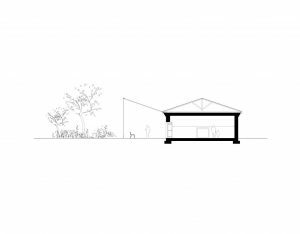 This house offers a new interpretation for the typical outbuilding, making it into a new, independent universe, precisely by the visual experience of detaching the new house from the original house. 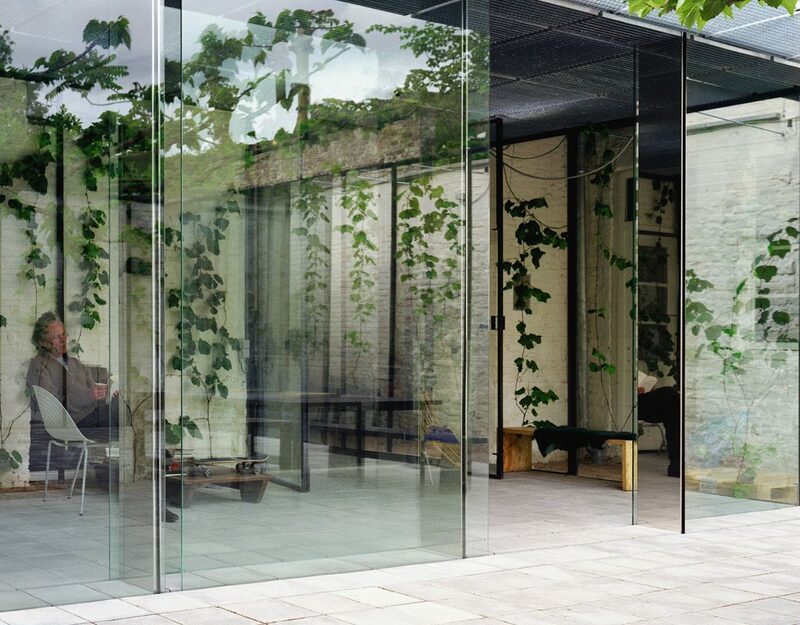 The various layers from which the summer house is constructed – the steel frame, the climbing vines, the glass doors – absorb the slow passage of the seasons. A notary’s office fills a large 18th century aristocratic town house. 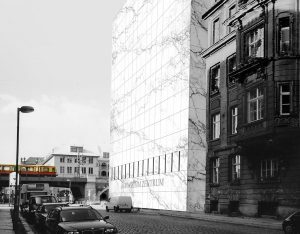 The old building is of a radiating beauty. 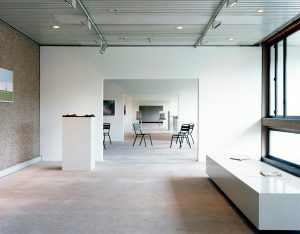 In the middle of the building a windowless space was to be converted into the main reception area. 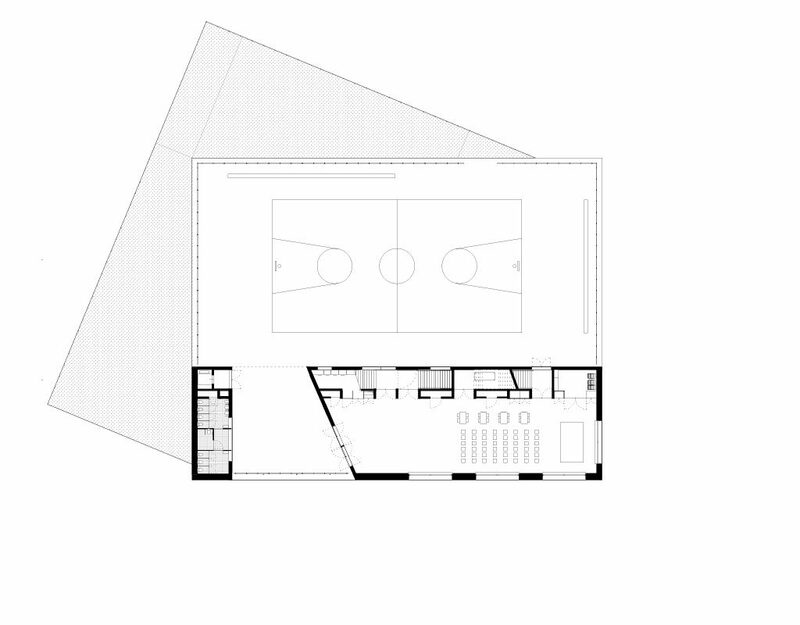 How to make something spatial in a space not bigger than a stamp? First the entrance area was extended to connect the street with the atrium and garage. 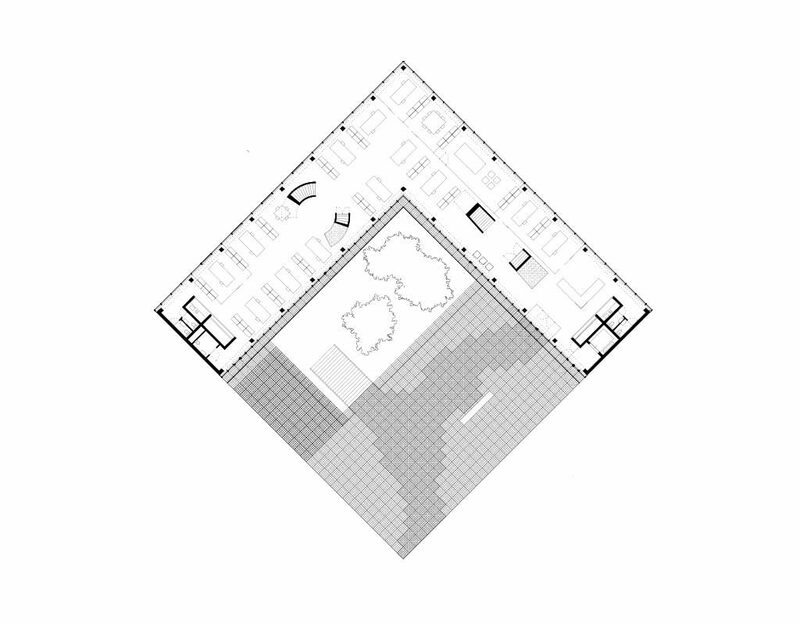 Secondly, the spatial limits of the reception area were expanded, converting it into sheer endlessness. The entire entrance area has a basic wall/ceiling finishing, basic lights and one floor material. 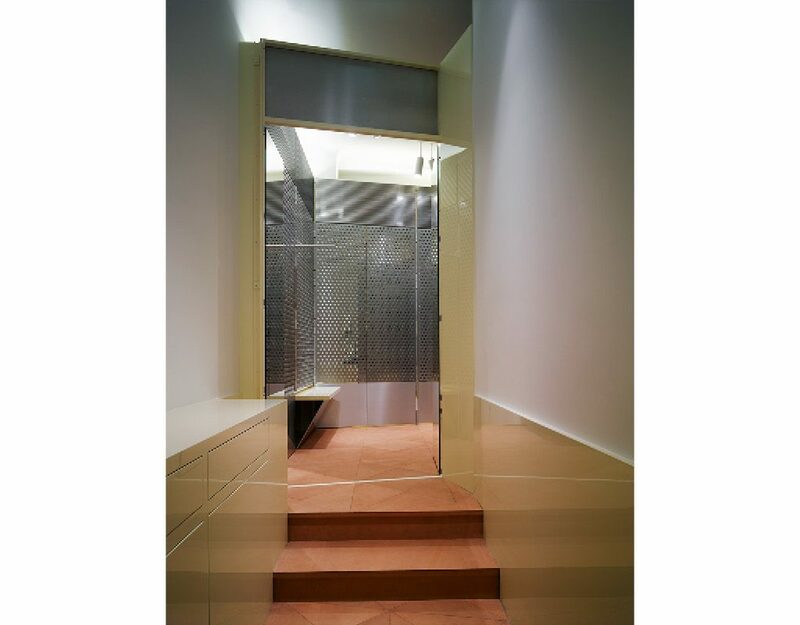 Within this, a modular mirror glass wrap encloses a comfort-zone for the reception area. 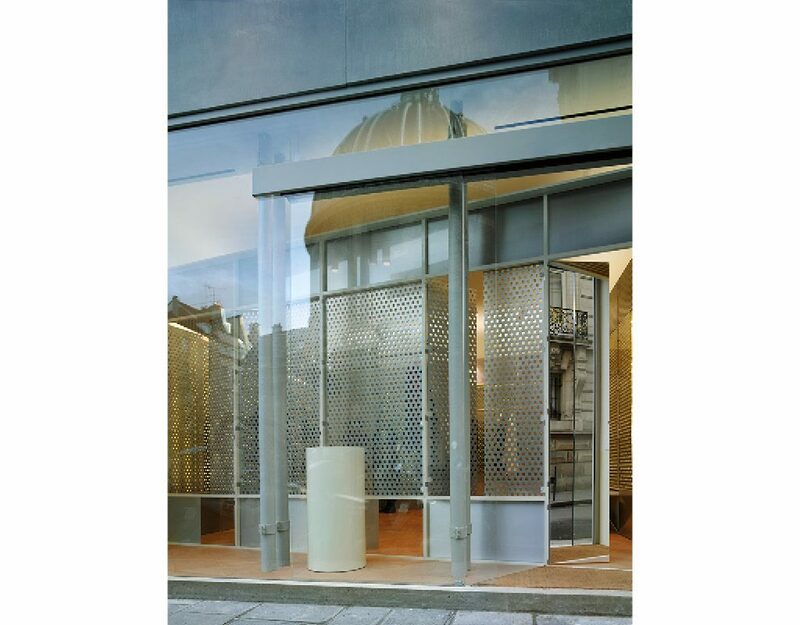 The wrap is an inside-out glass façade, showing only the smooth, bronze-like mirror glass to its interior. 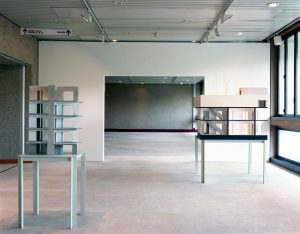 It is conceived as a repetition of one module. 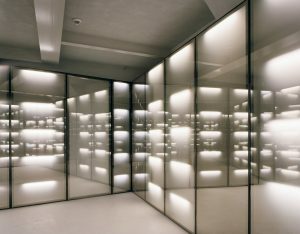 The rest space between the glass line and the old walls of the building is used by each module as extension area: the depth of it is maximised to incorporate lamps and storage space. All modules open like giant doors, providing access to the adjacent rooms and hallway.